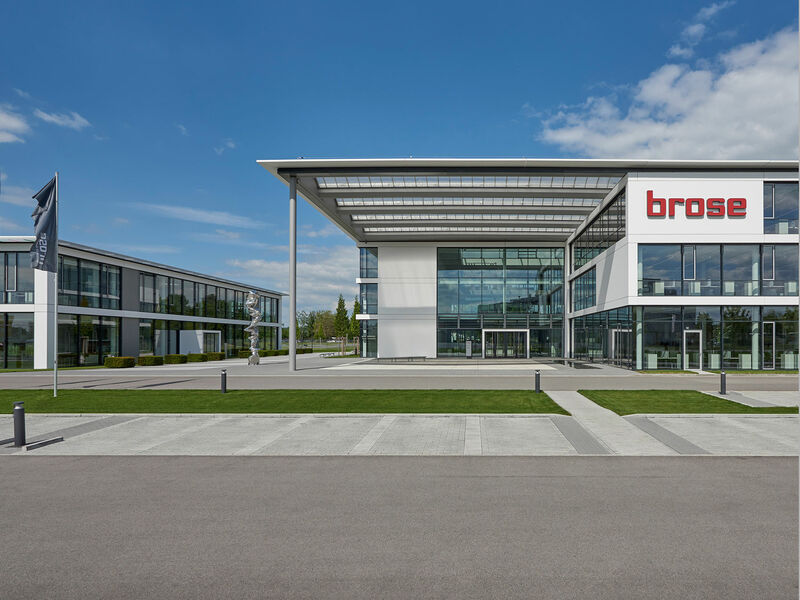 For the 600 employees of BROSE Automotive Parts, based in Bamberg, a new working environment was created. 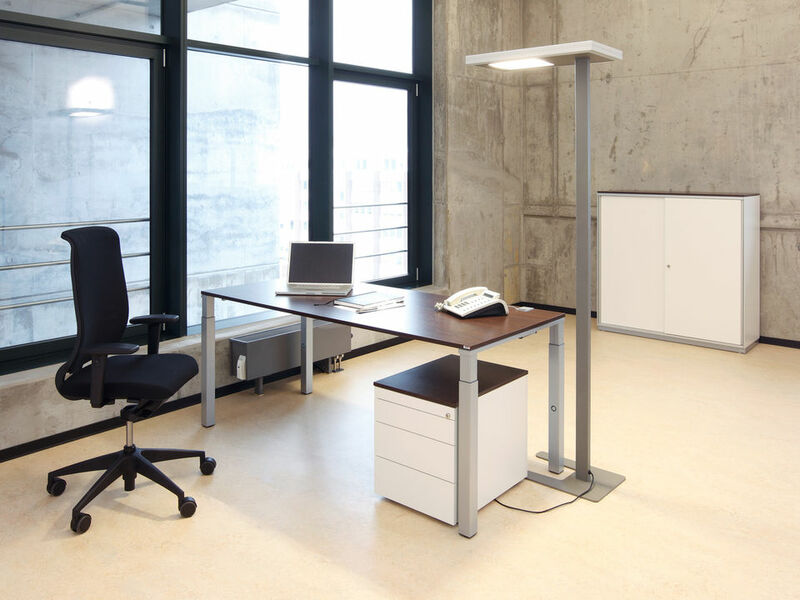 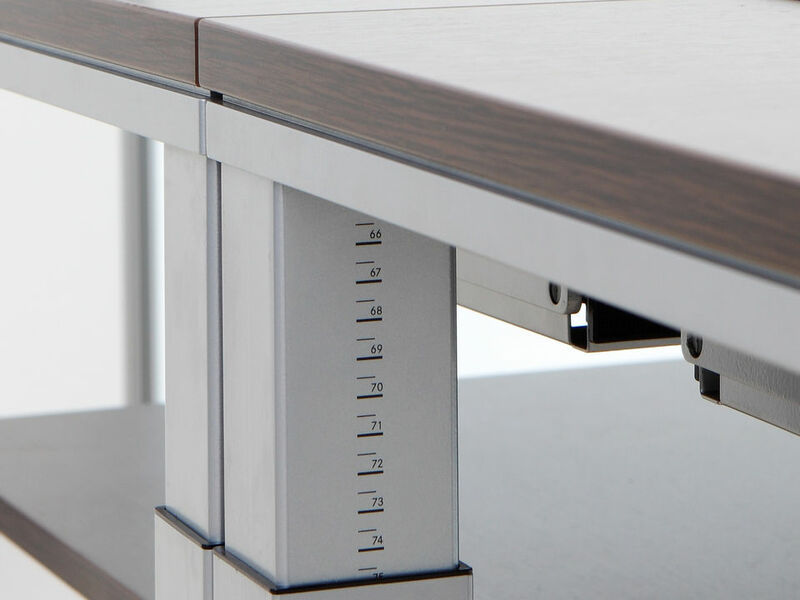 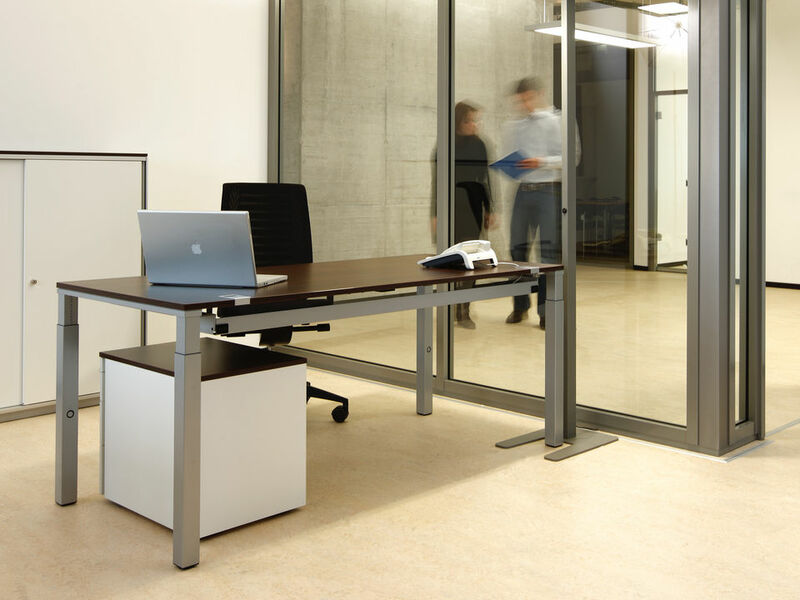 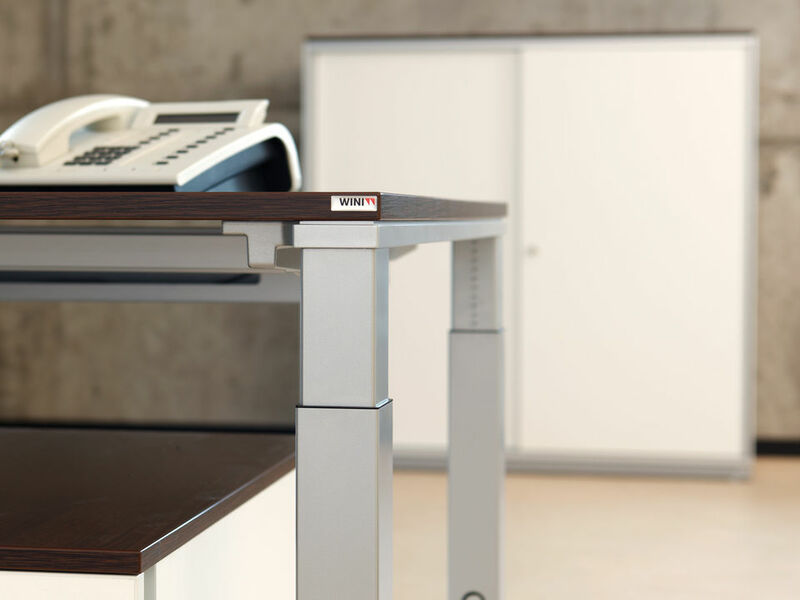 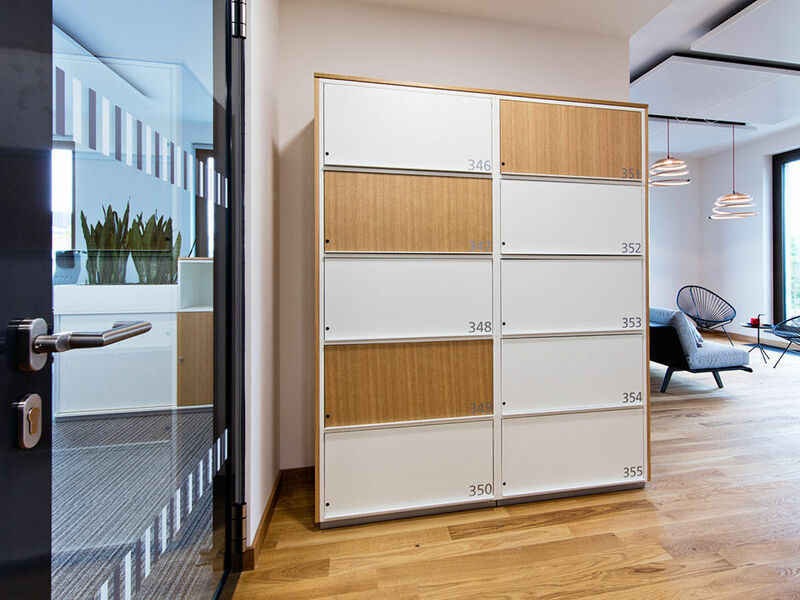 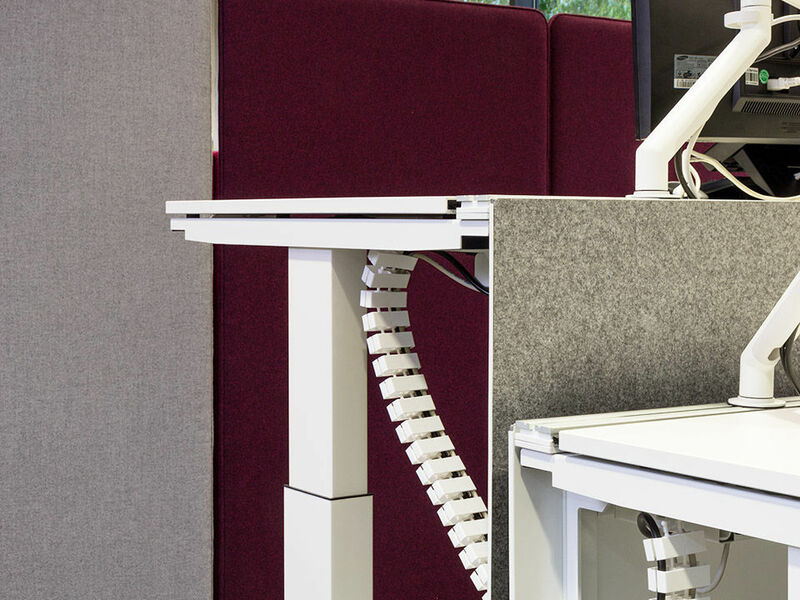 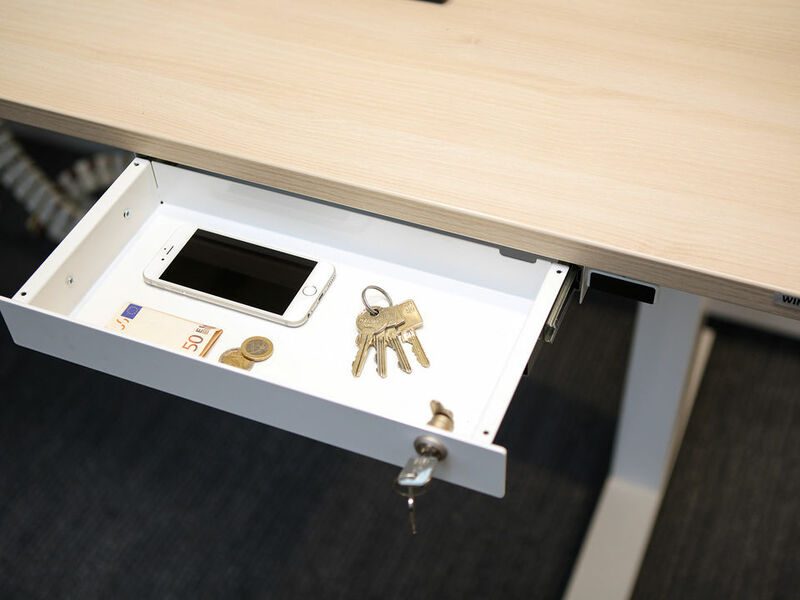 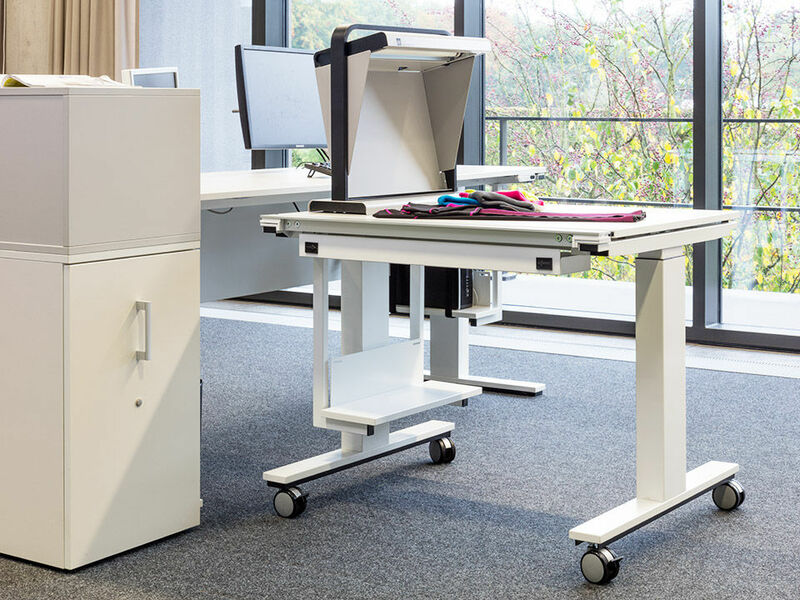 Bespoke solutions for the Open Space concept are a height adjustable desk with speed crank technology and personal storage units. 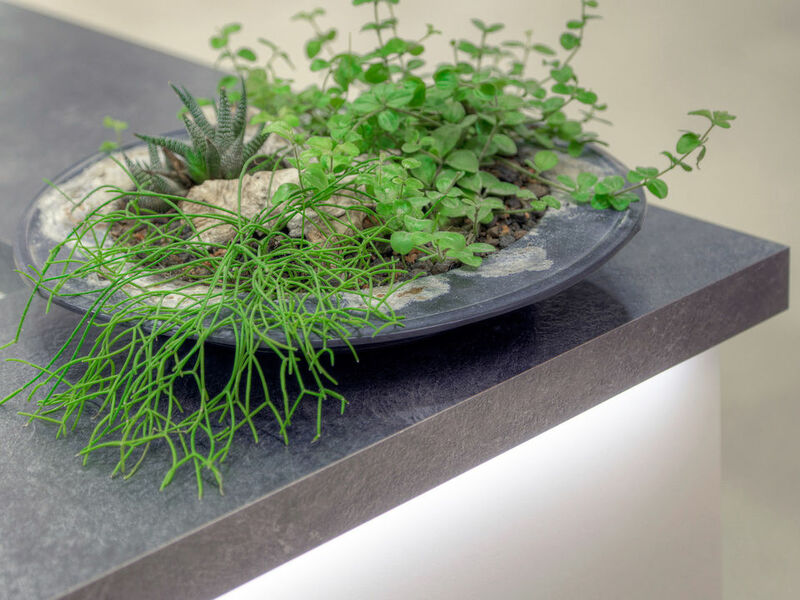 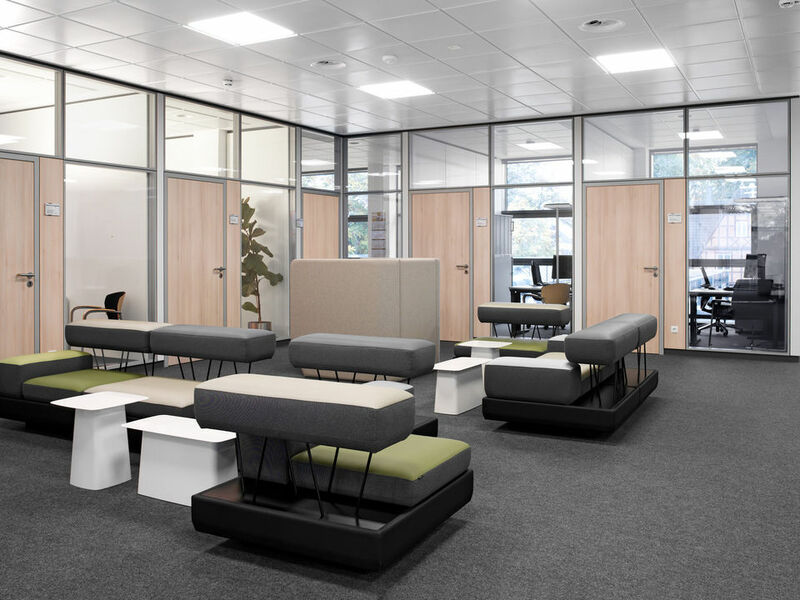 Taking the wishes of the employees into account, in 2015 the internal IBB project team created a new furnishing concept, supported by civil engineers, specialised consultants and the company physician. 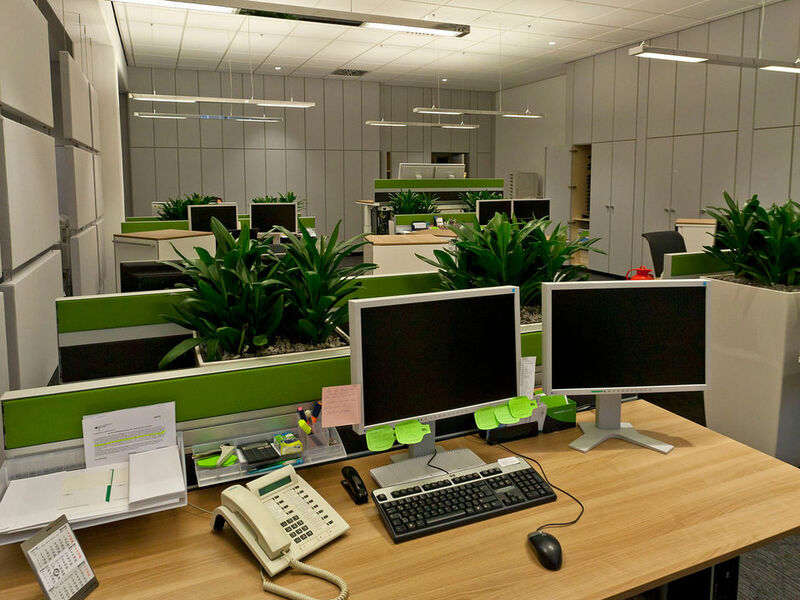 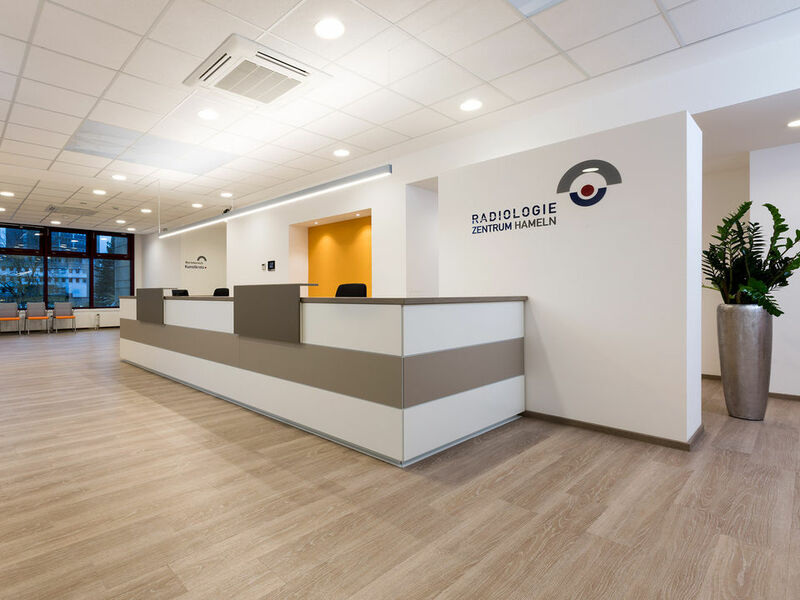 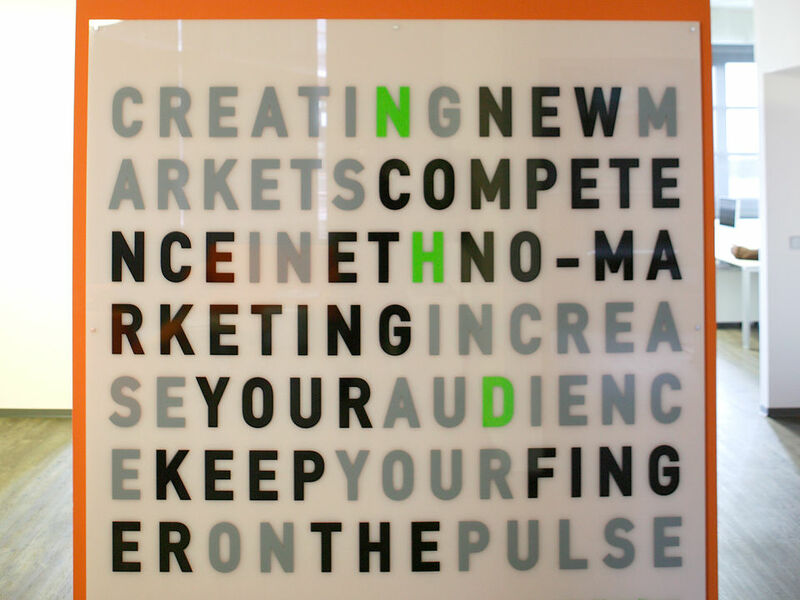 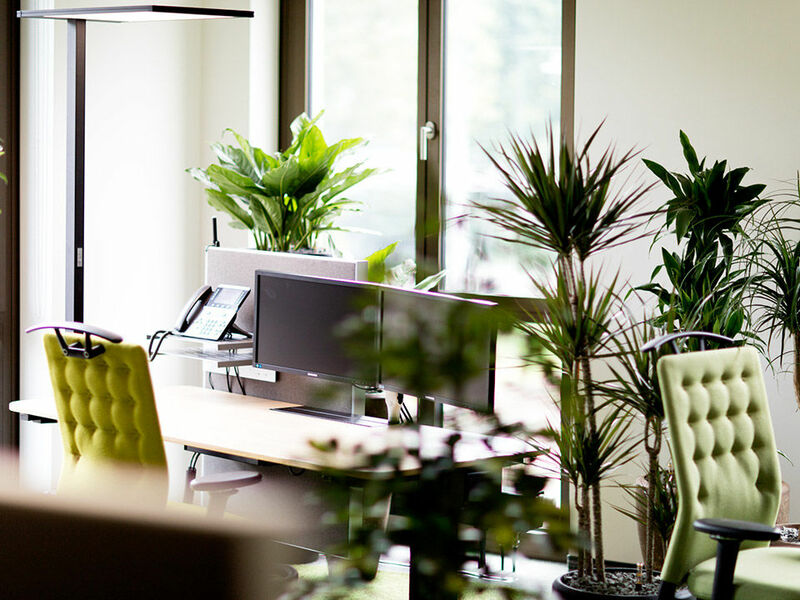 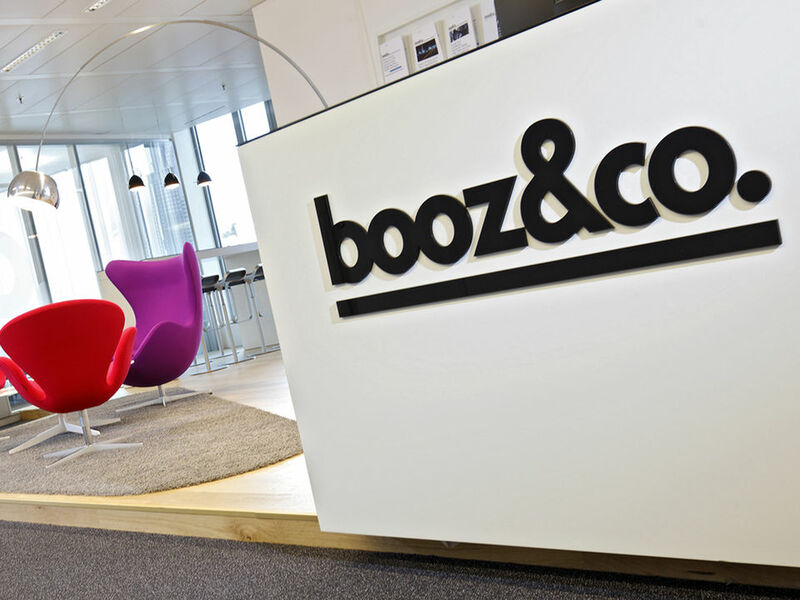 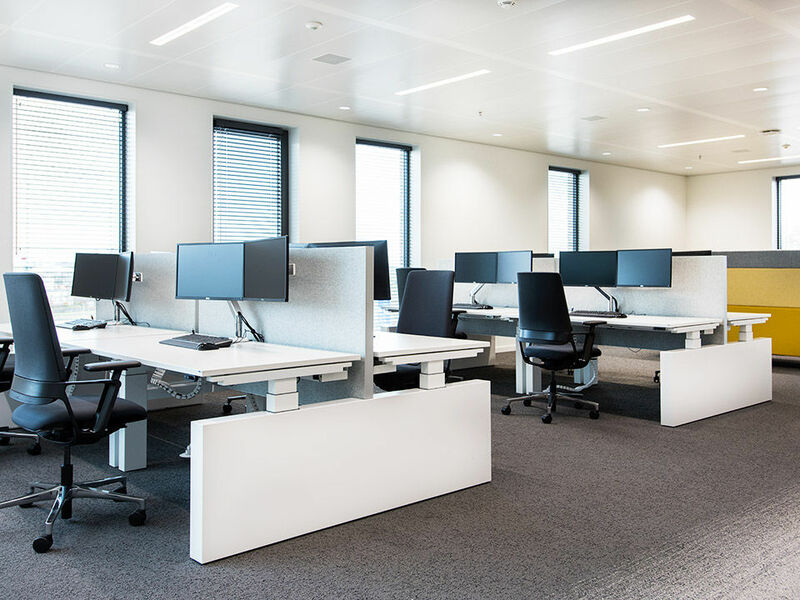 A working environment was created that allows for ergonomic, concentrated work and offers a high degree of communication and flexibility to the around 600 employees. 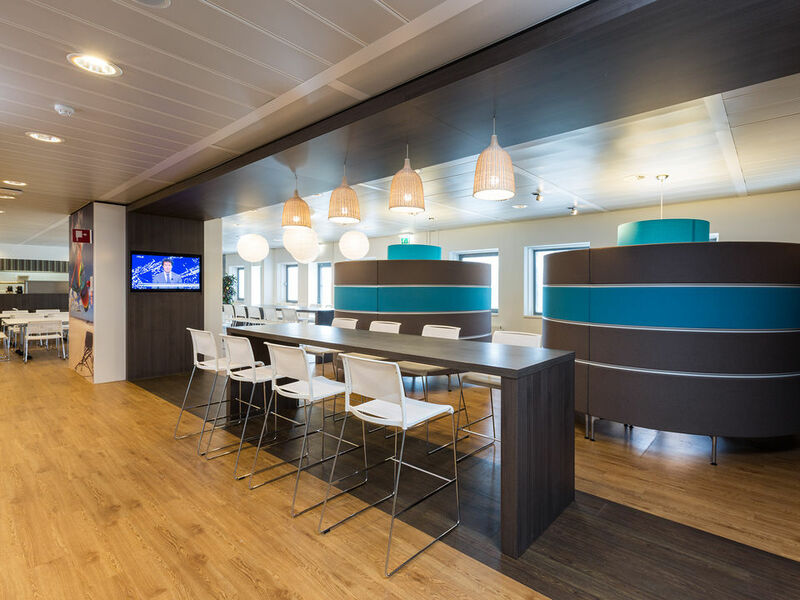 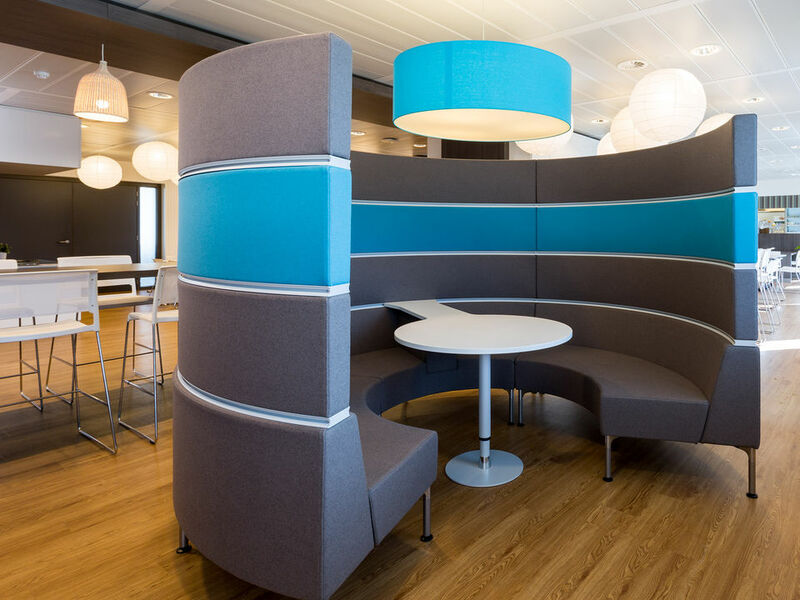 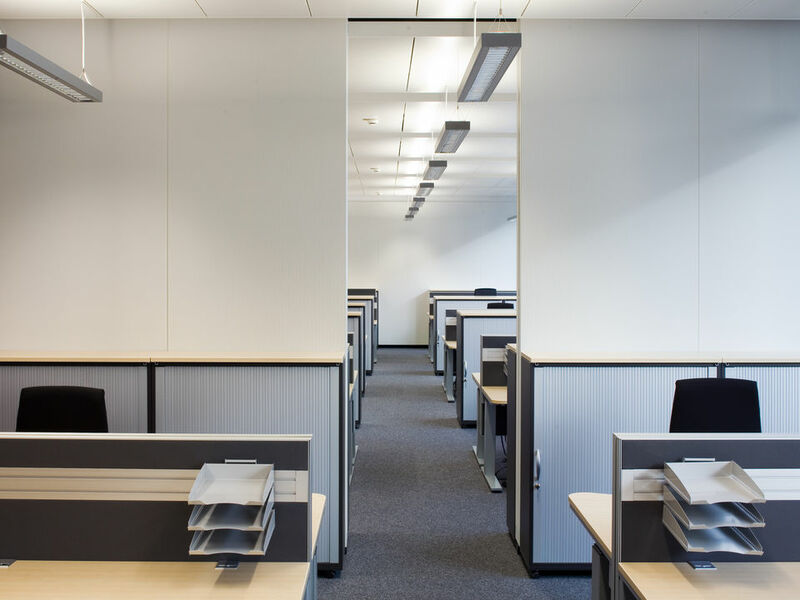 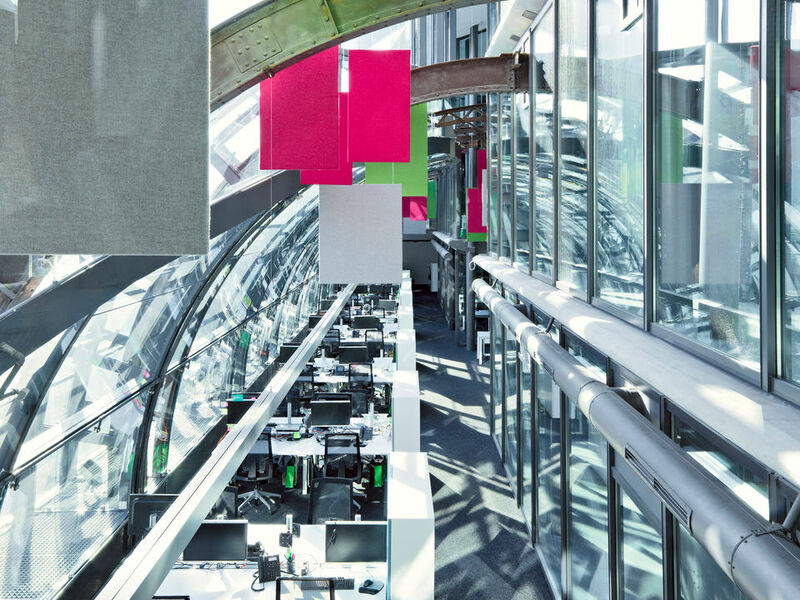 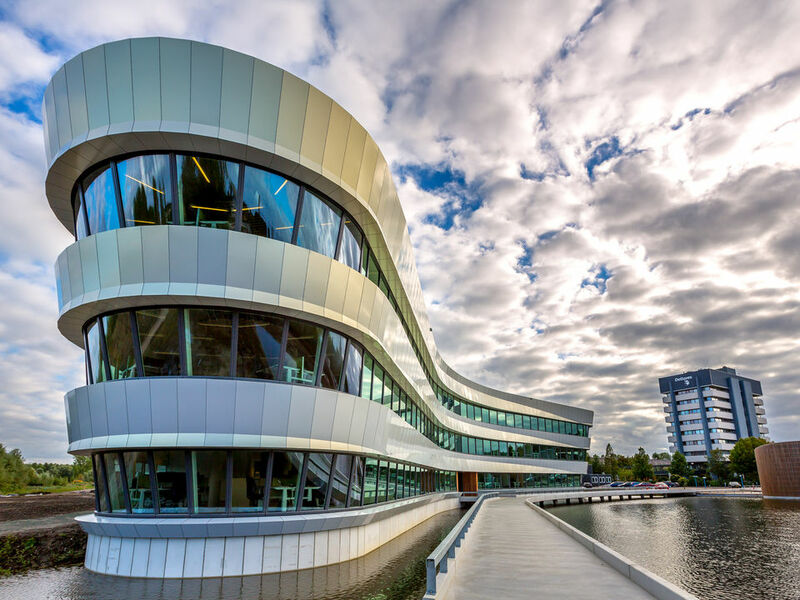 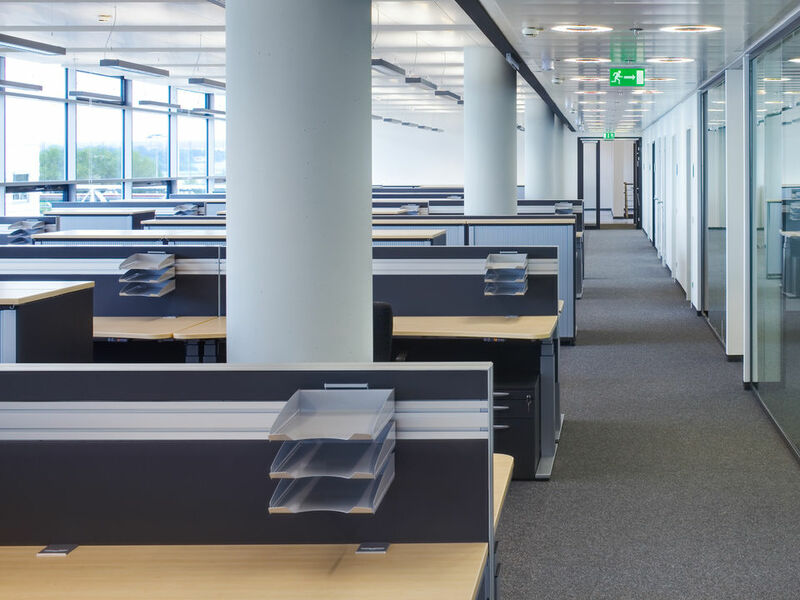 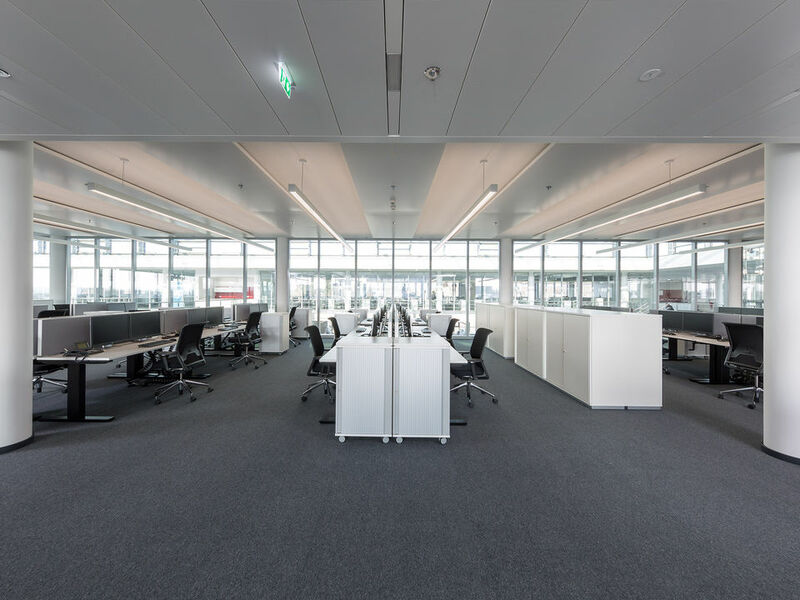 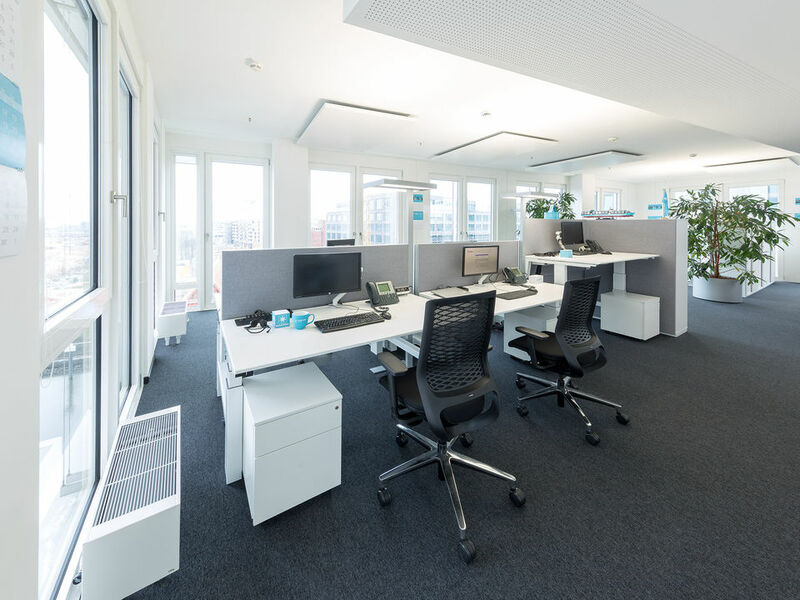 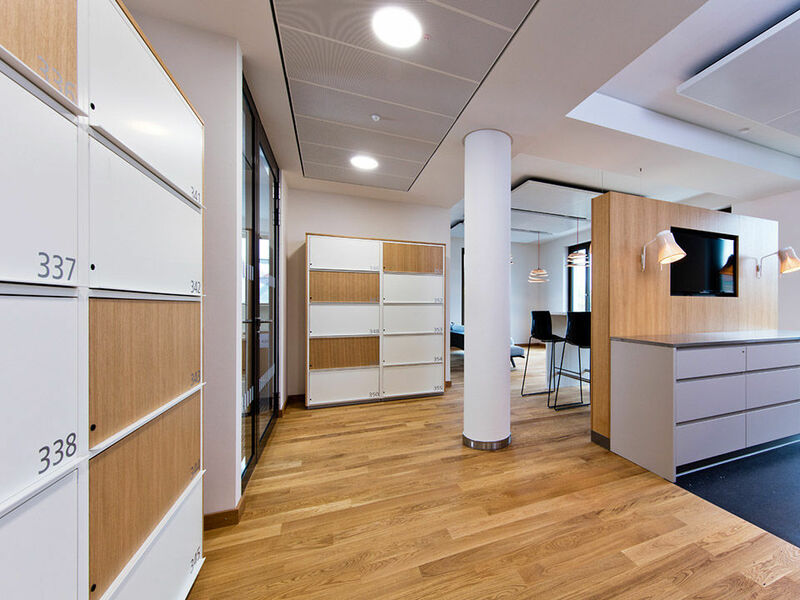 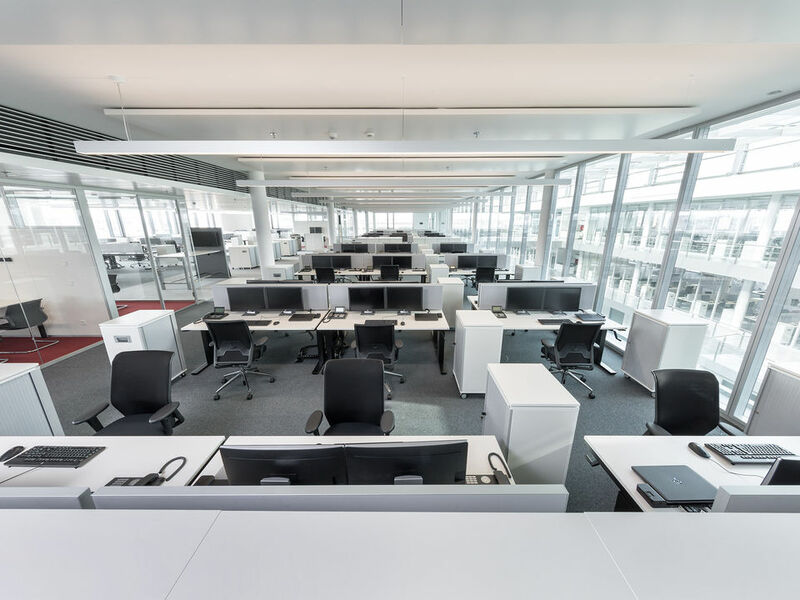 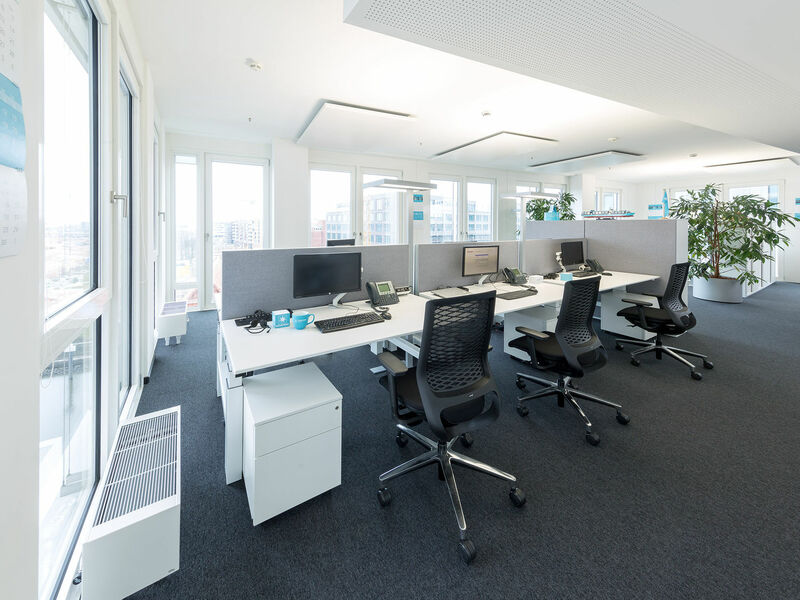 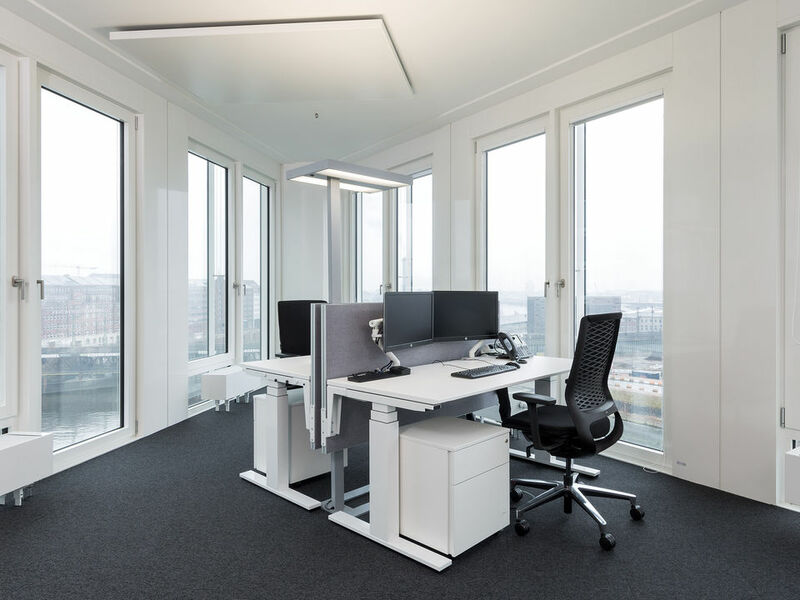 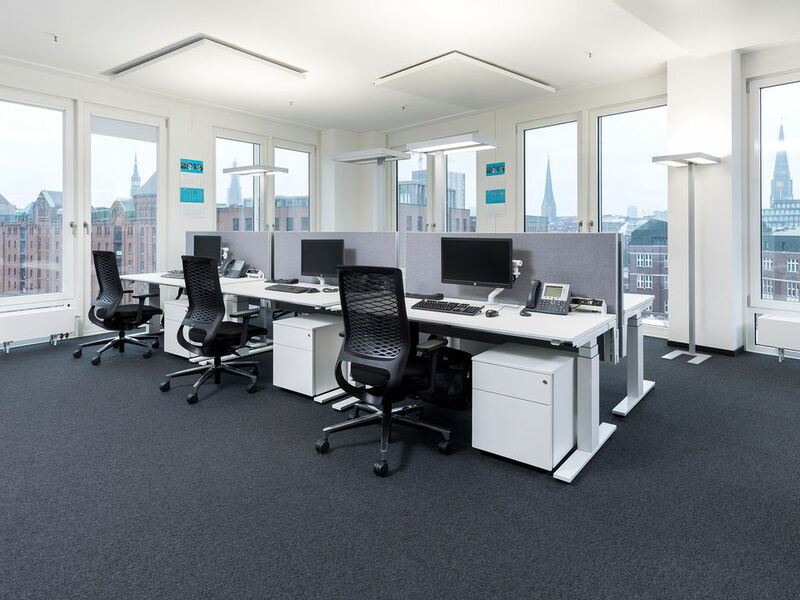 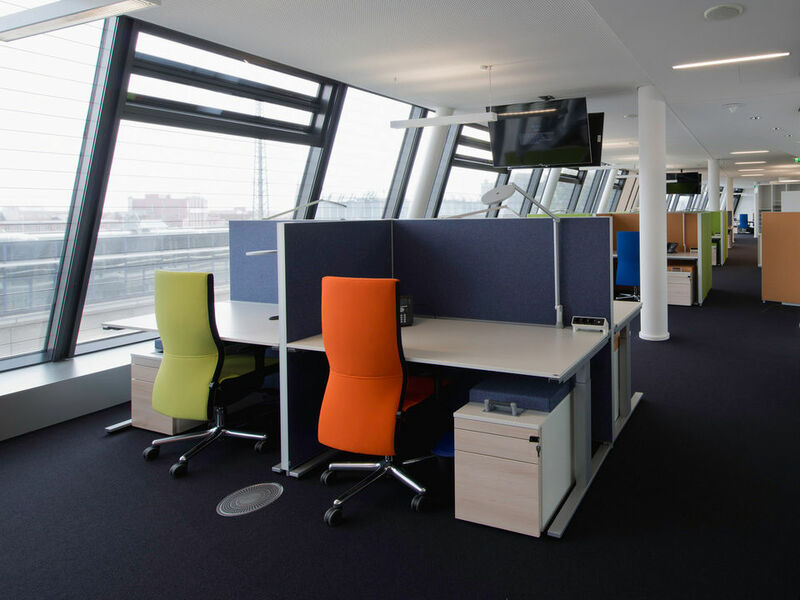 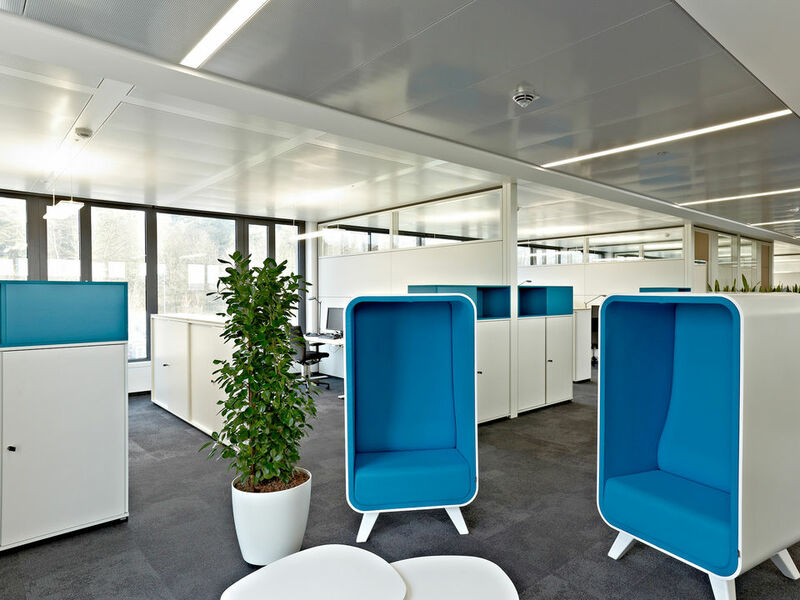 For the German branch office of the MAERSK LINE shipping company a new open office landscape arose in the Hamburg Ericus Contor with ergonomically and acoustically optimized workplaces. 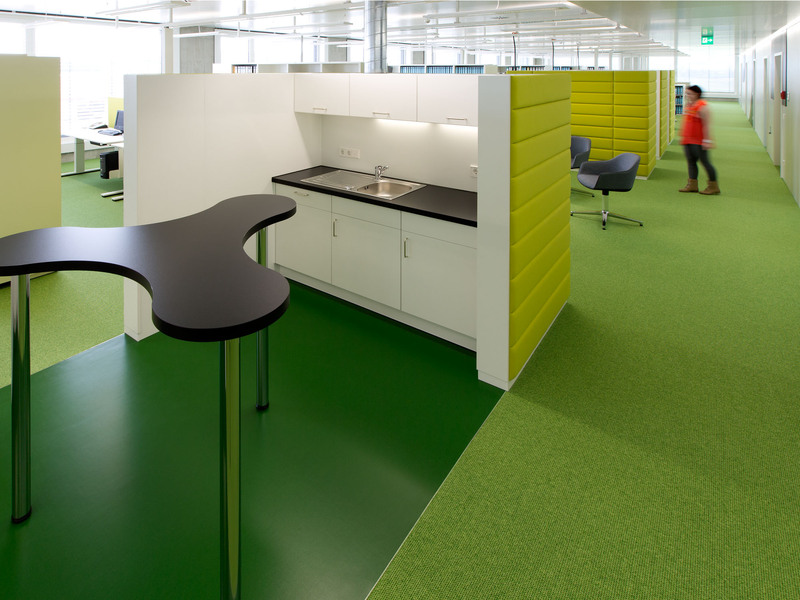 For the planning office roomarts an open, functional and design oriented officeworld with colorful accents was created - based on an activity analysis after the MY OFFICE PRINCIPLE of WINI. 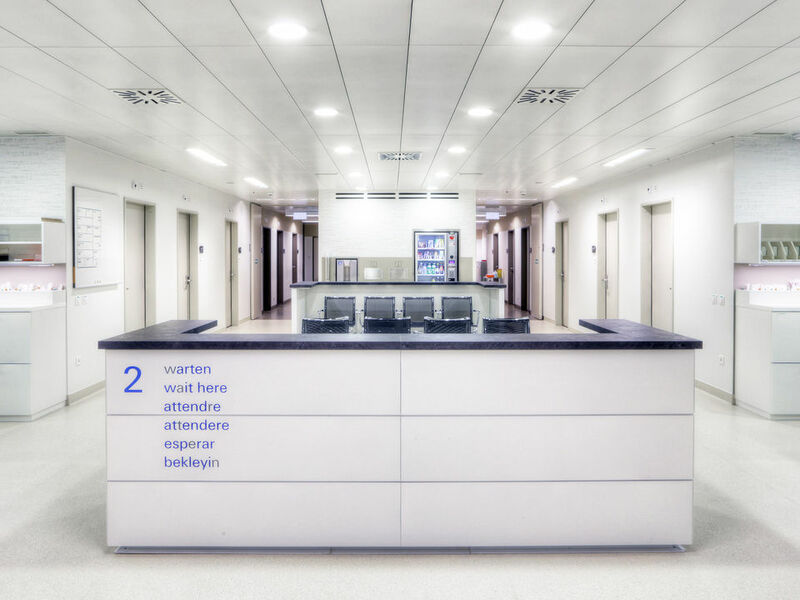 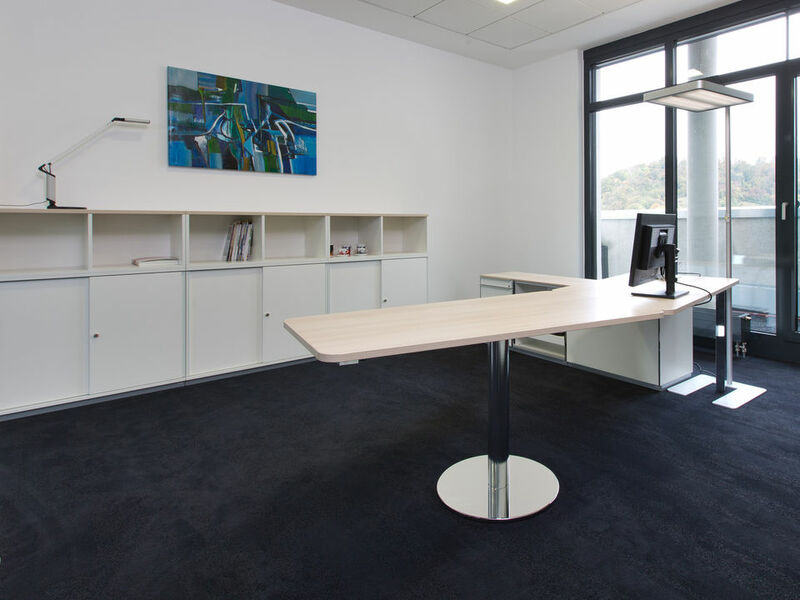 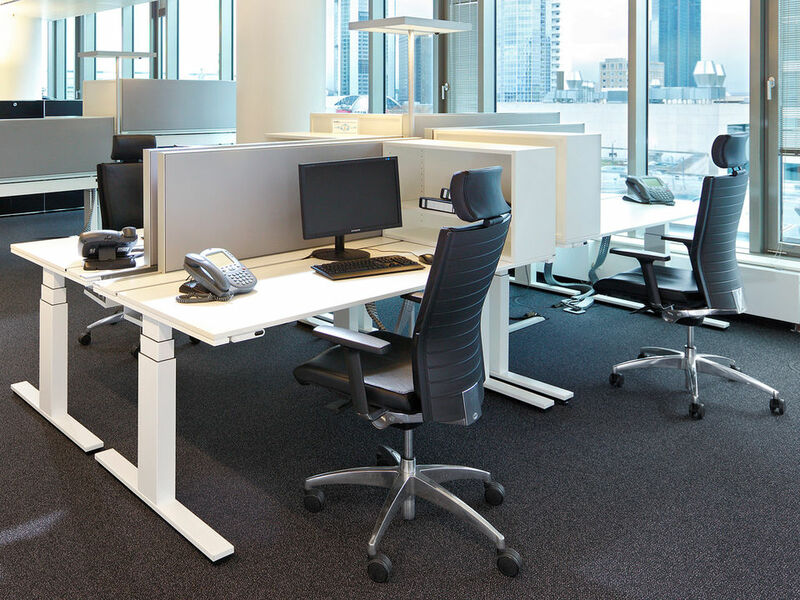 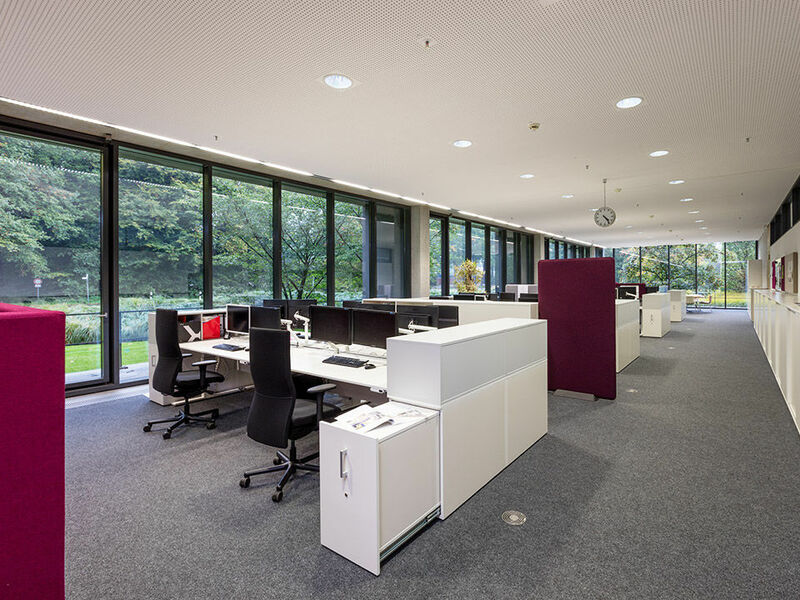 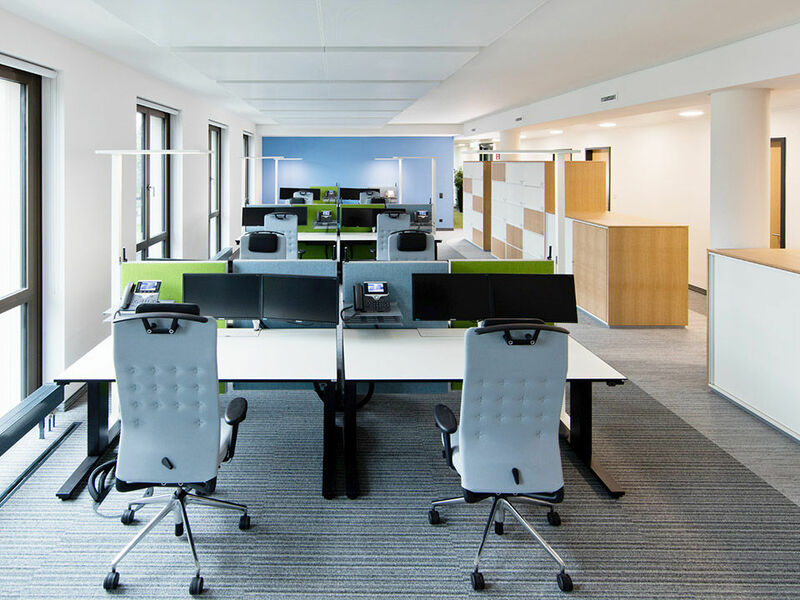 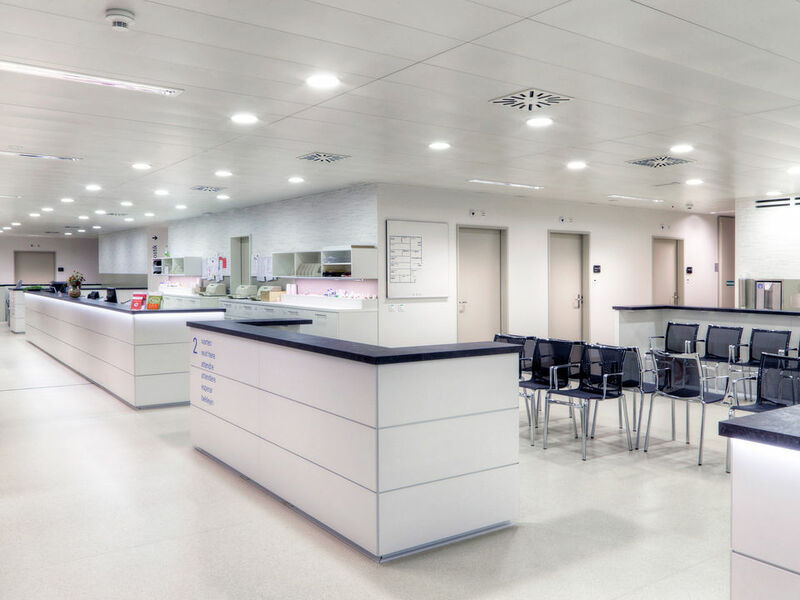 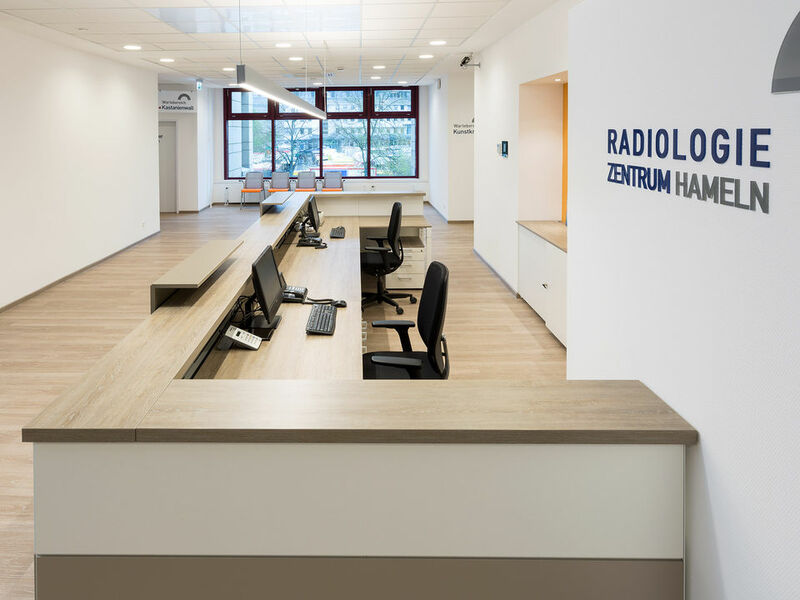 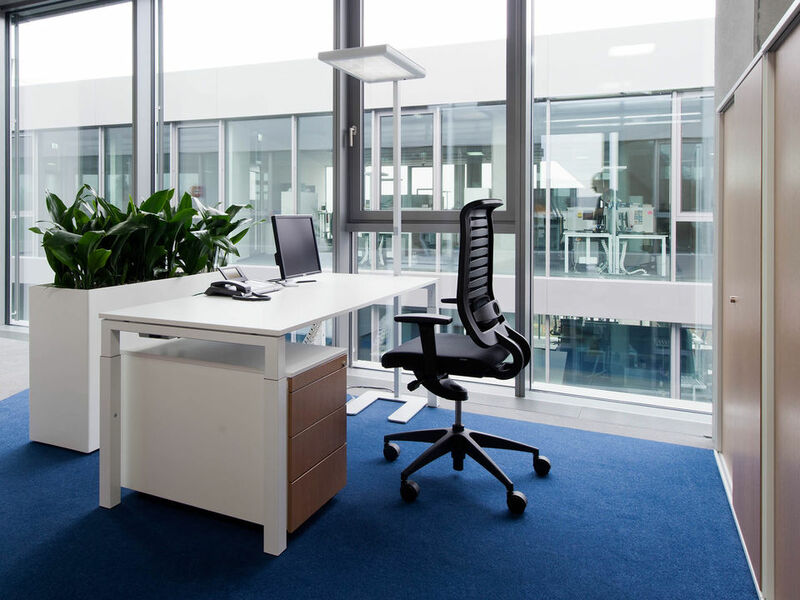 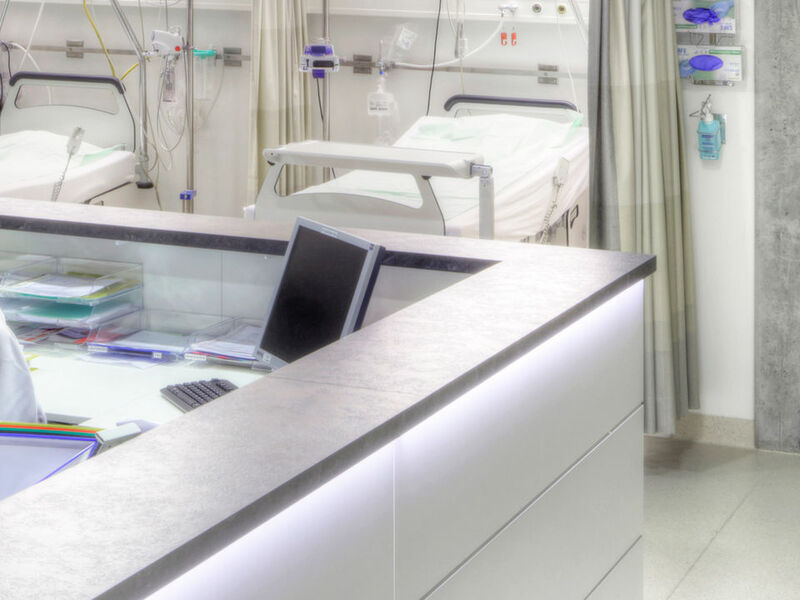 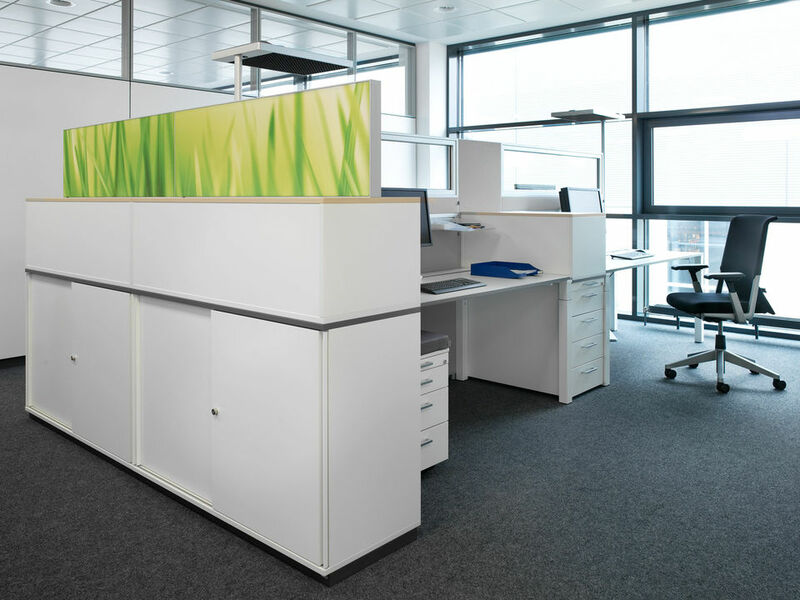 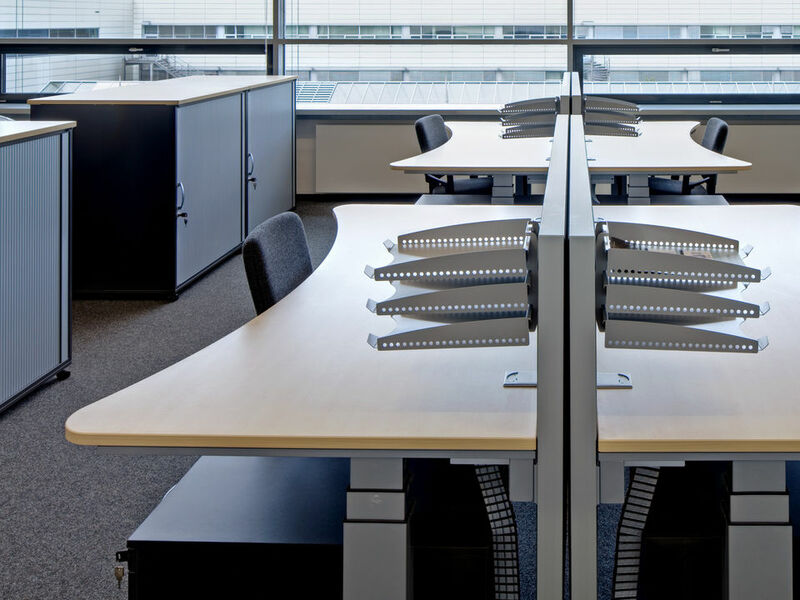 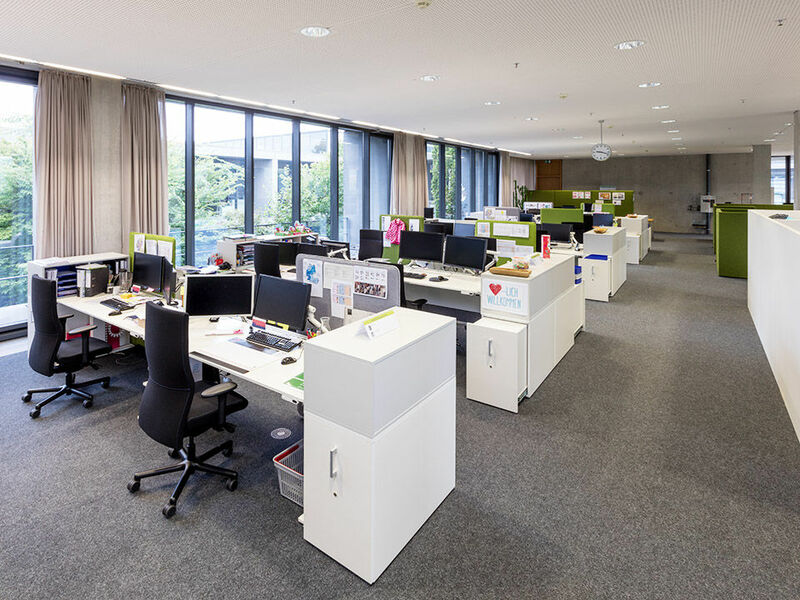 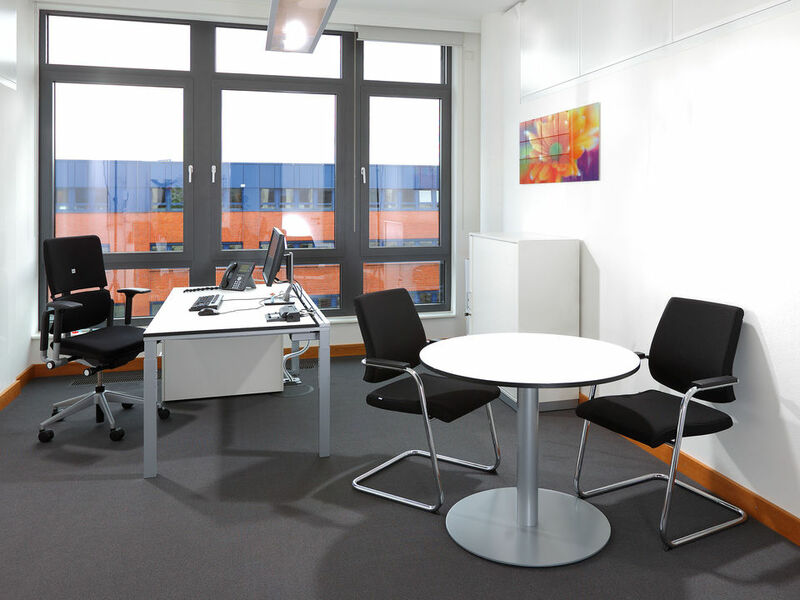 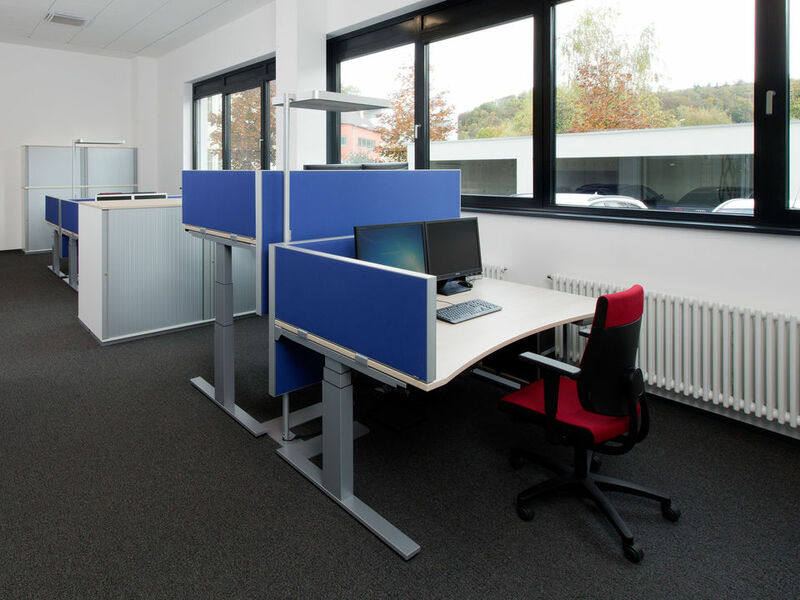 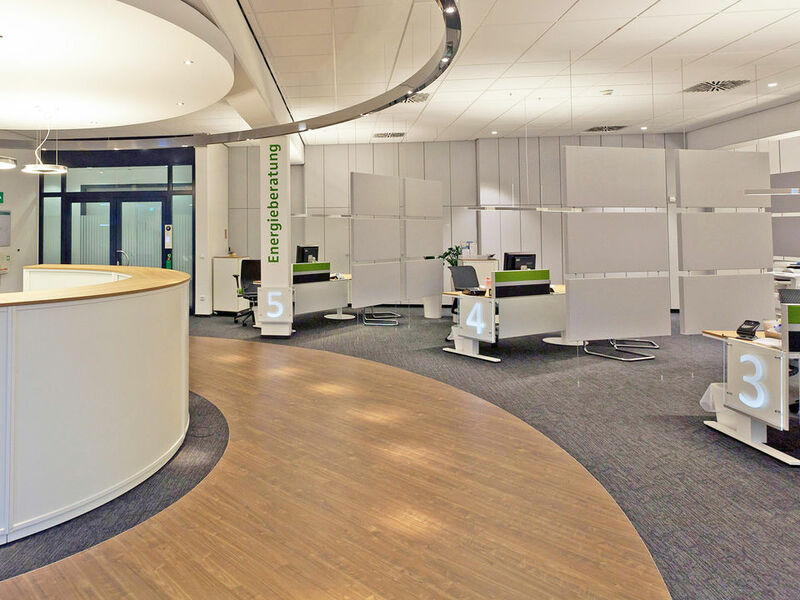 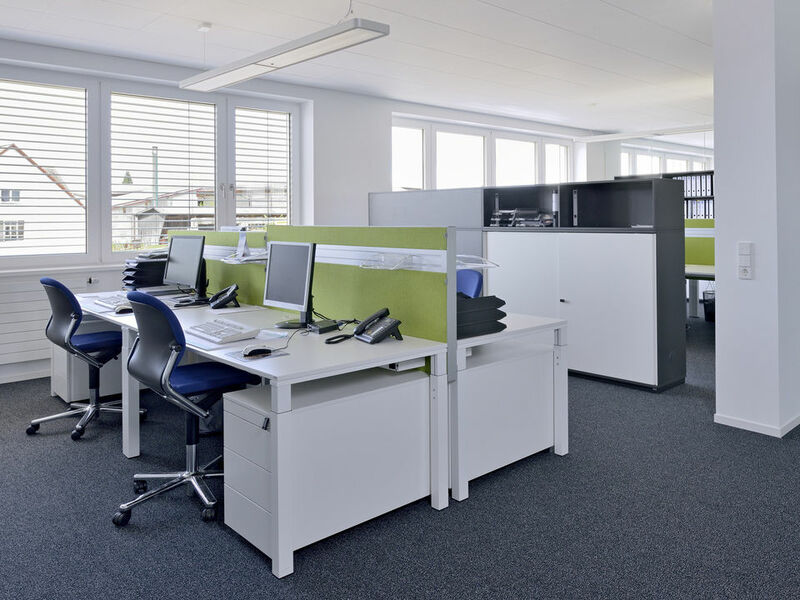 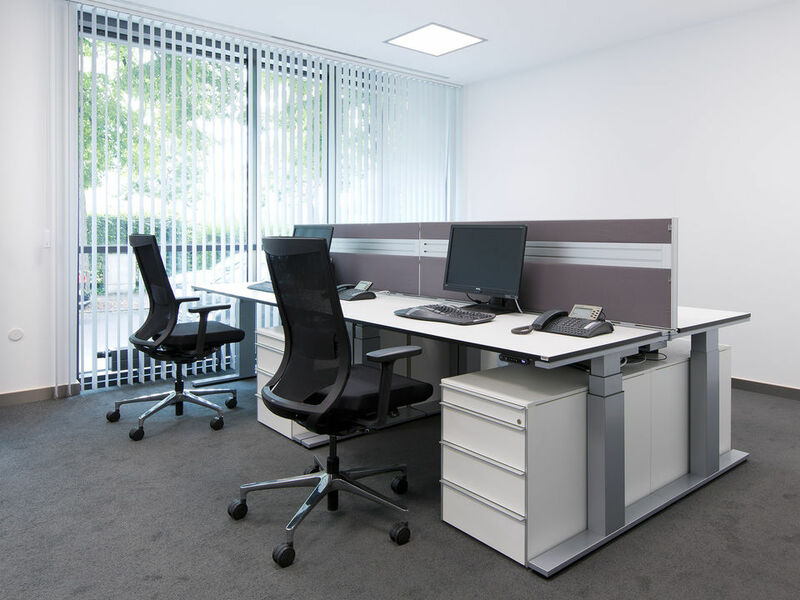 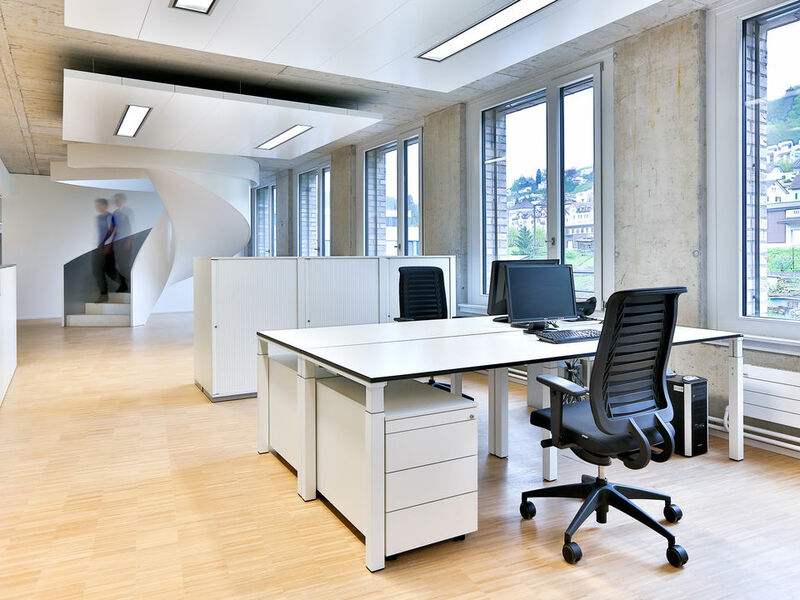 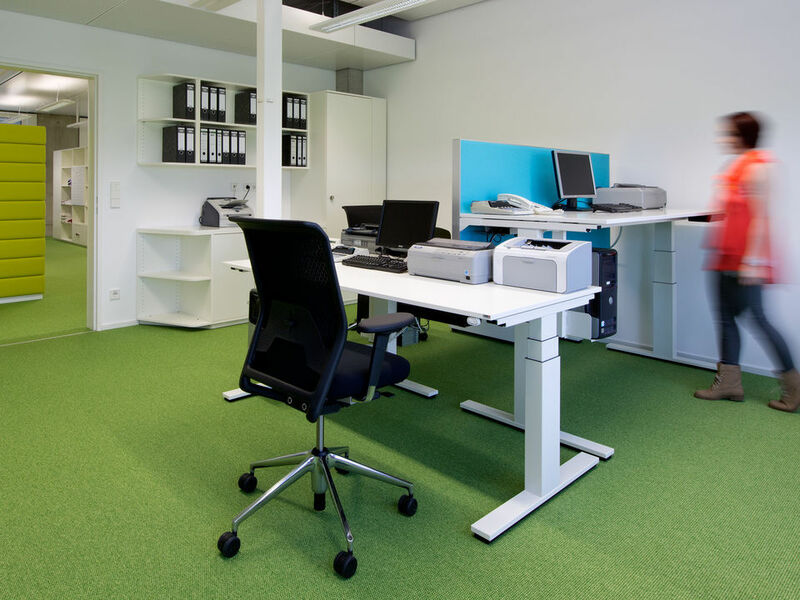 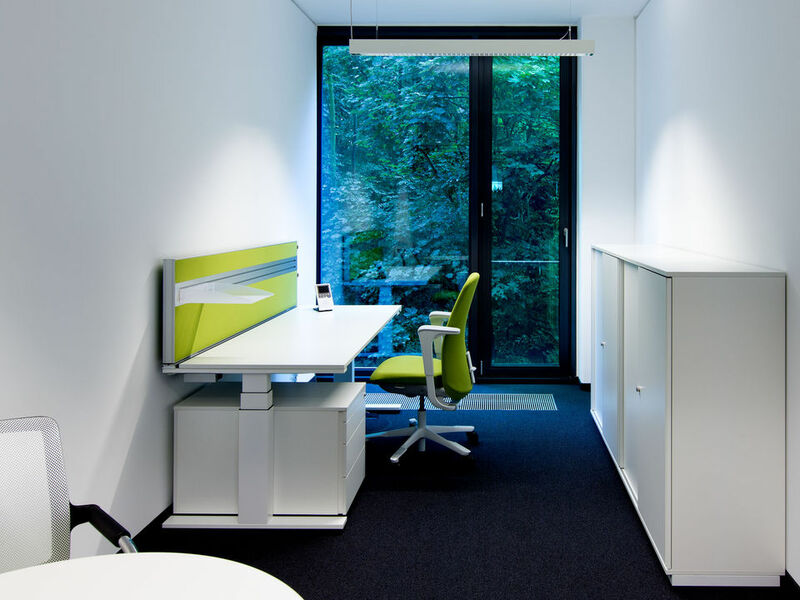 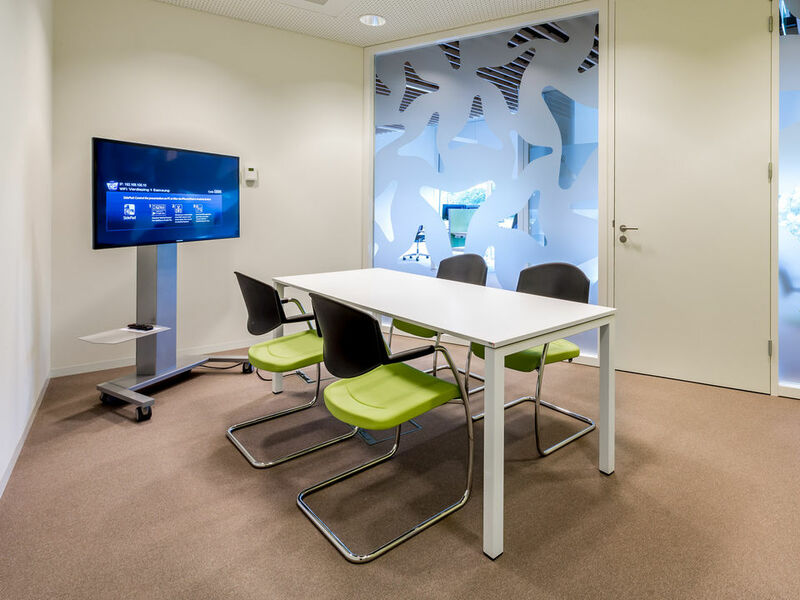 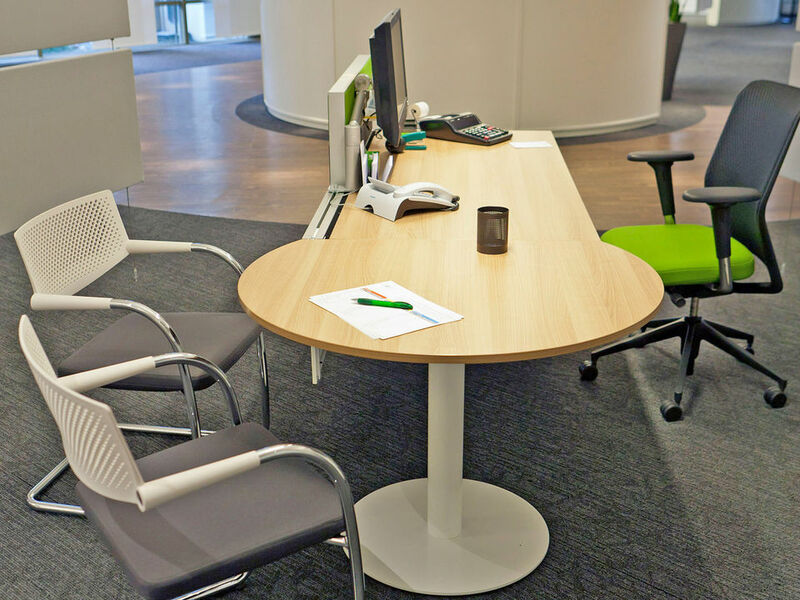 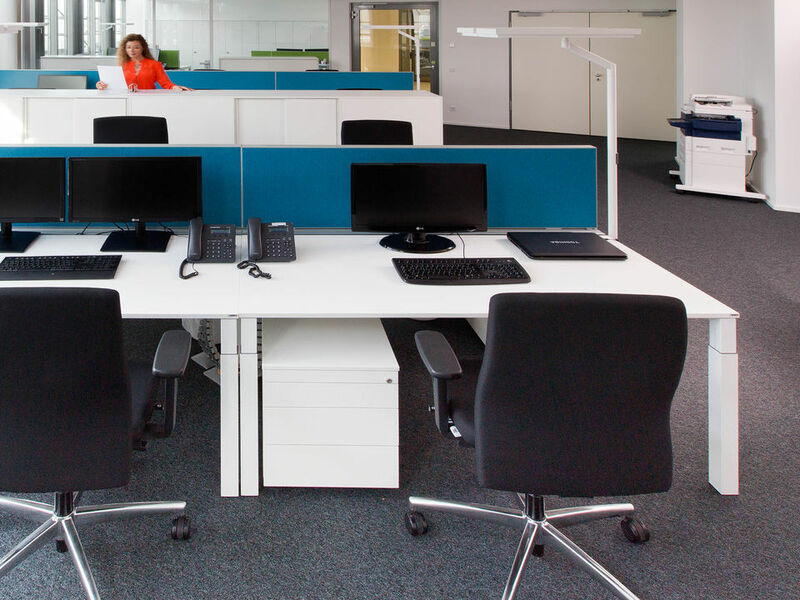 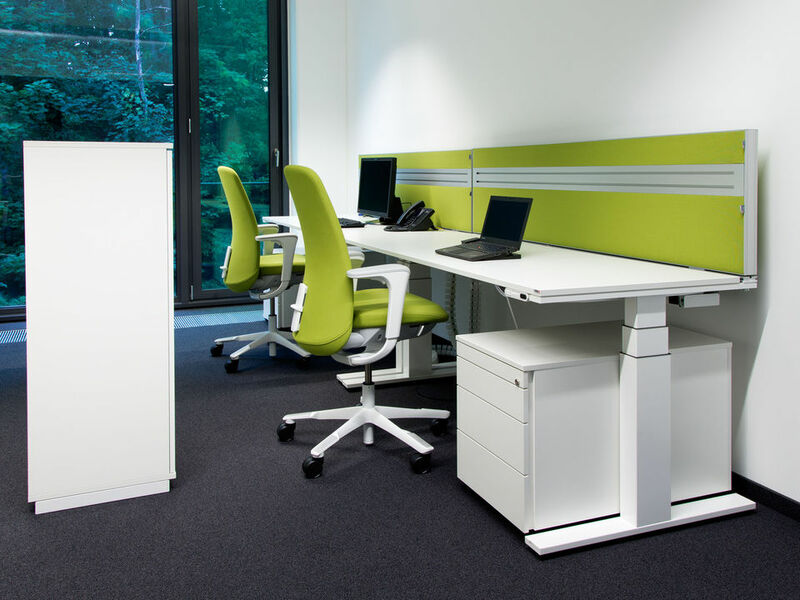 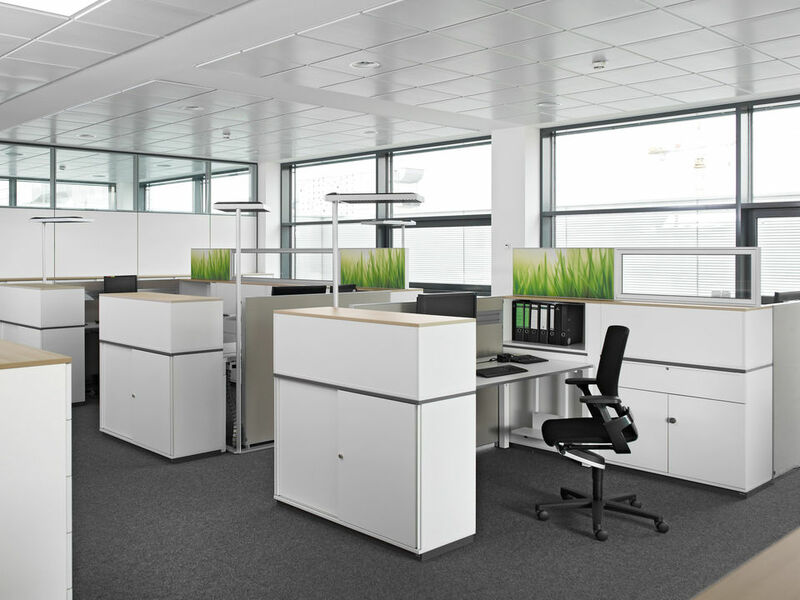 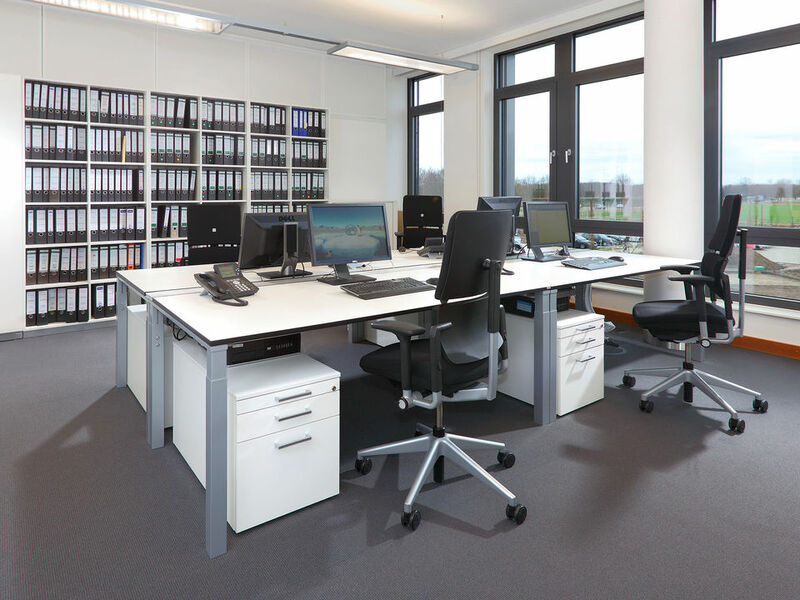 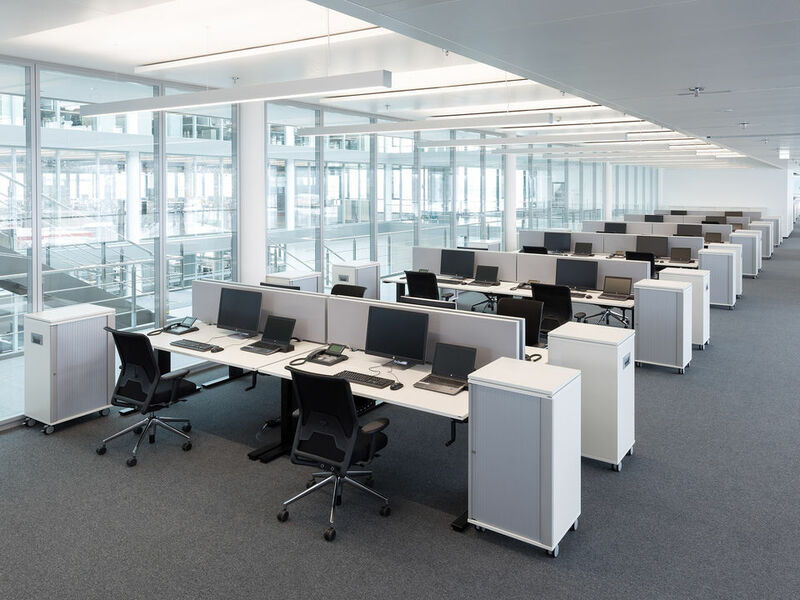 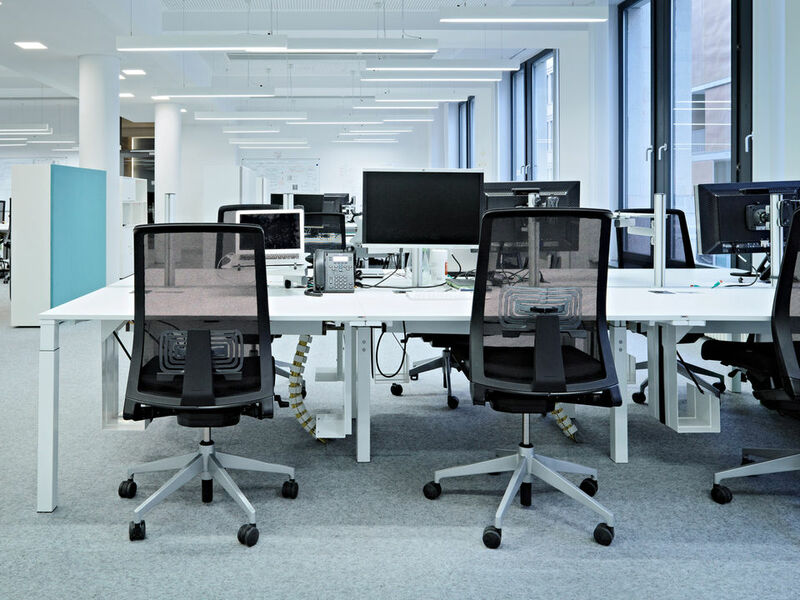 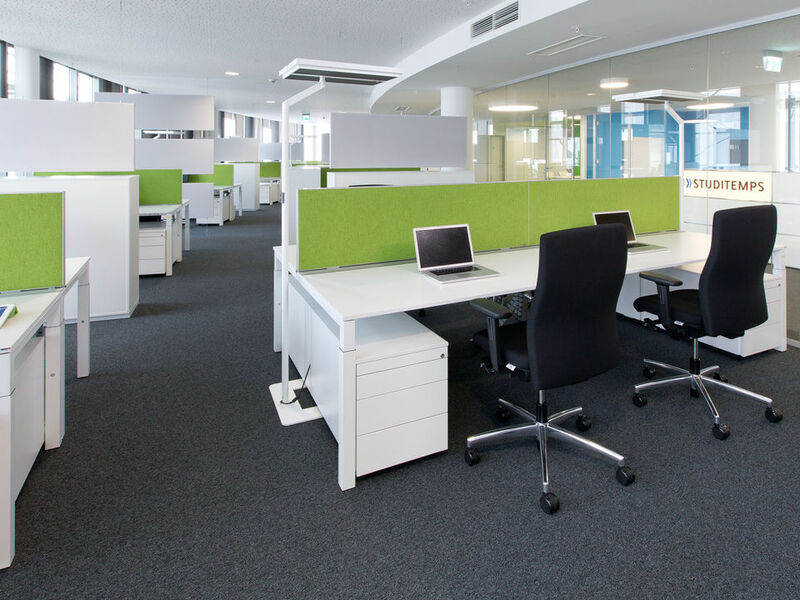 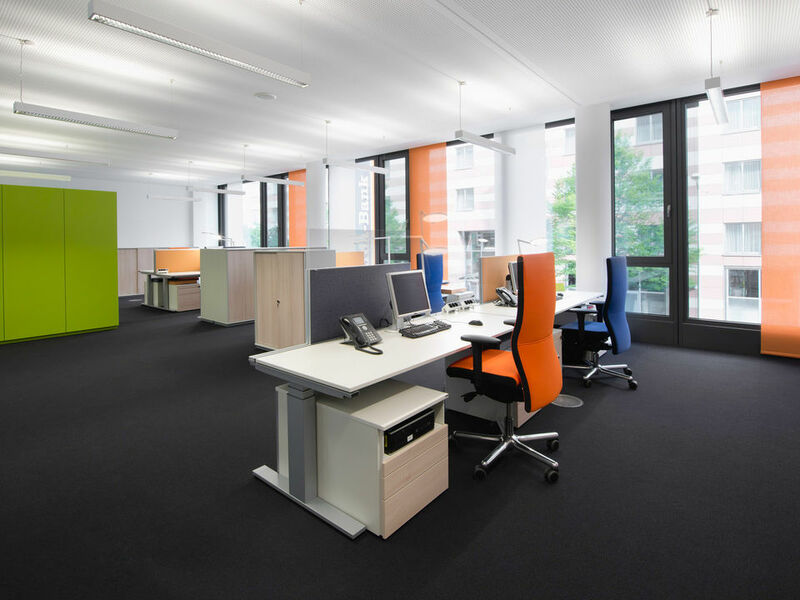 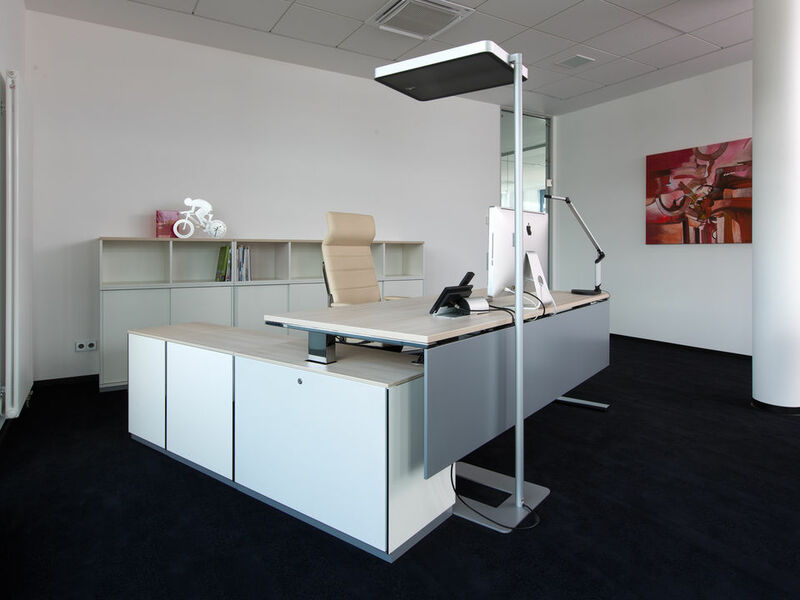 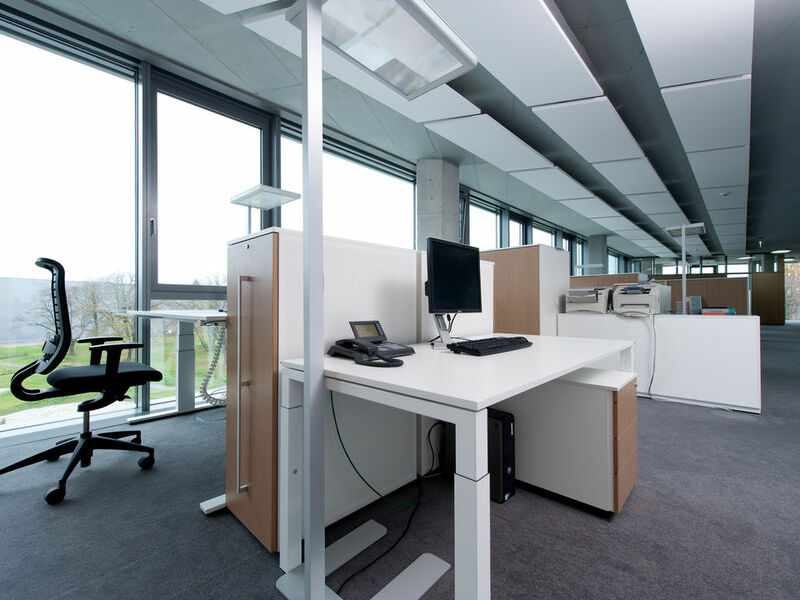 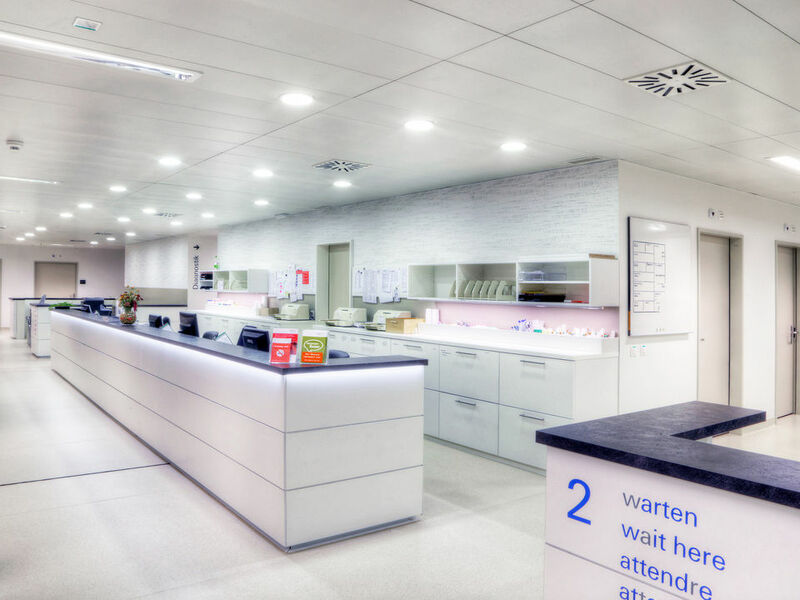 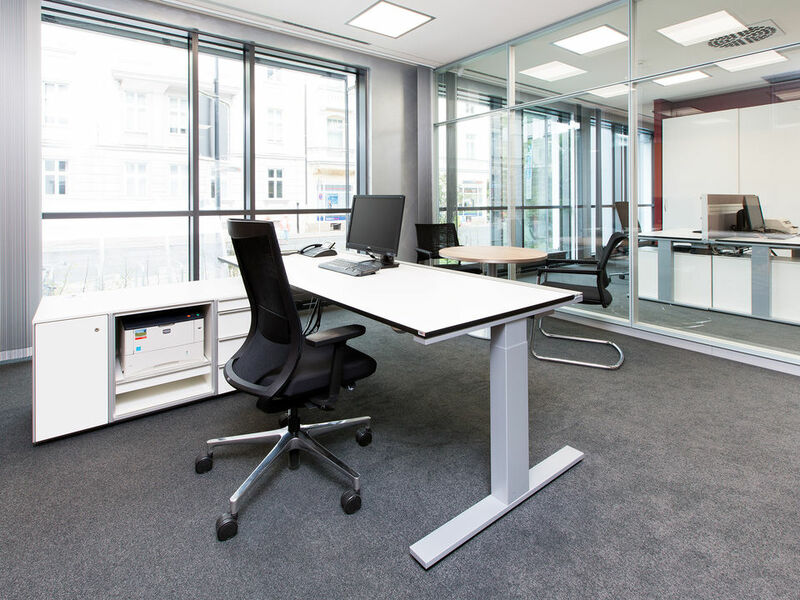 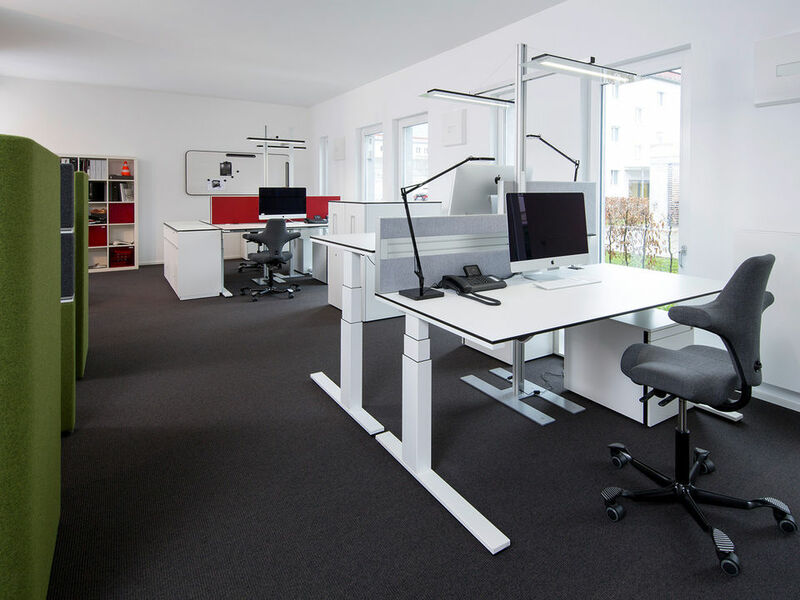 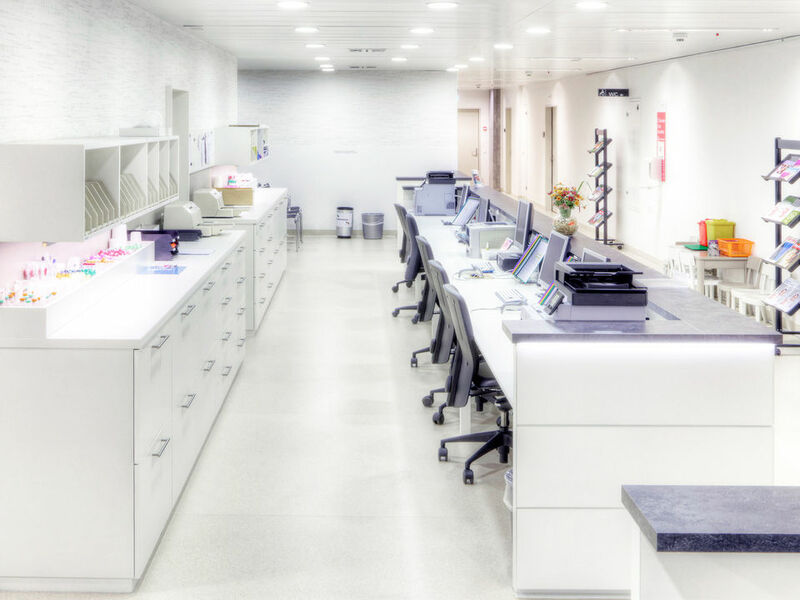 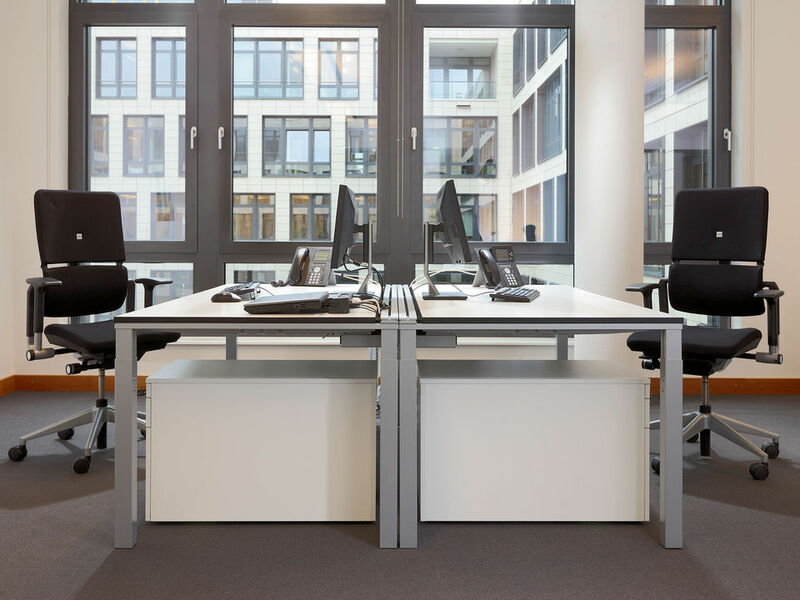 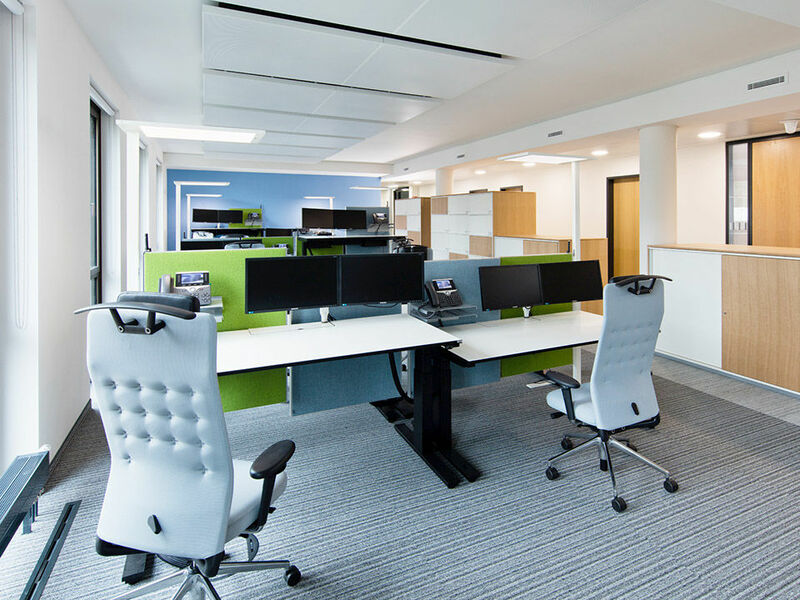 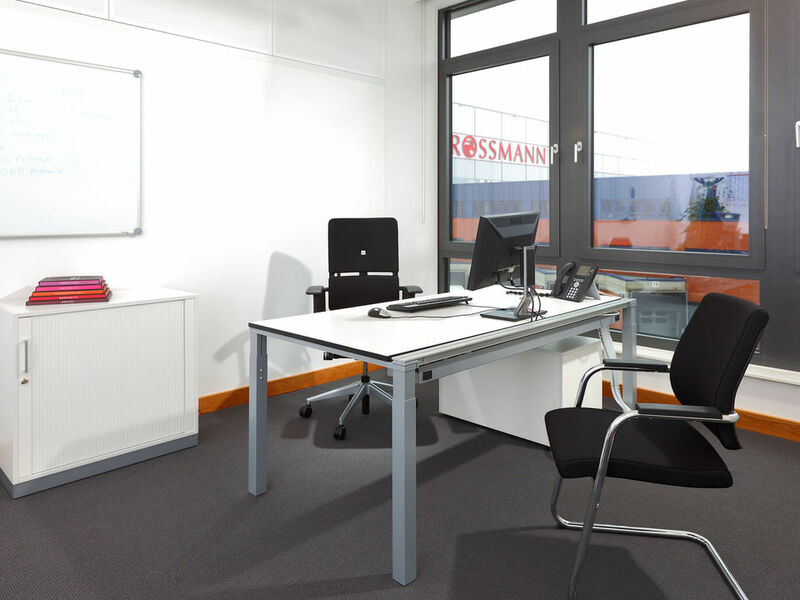 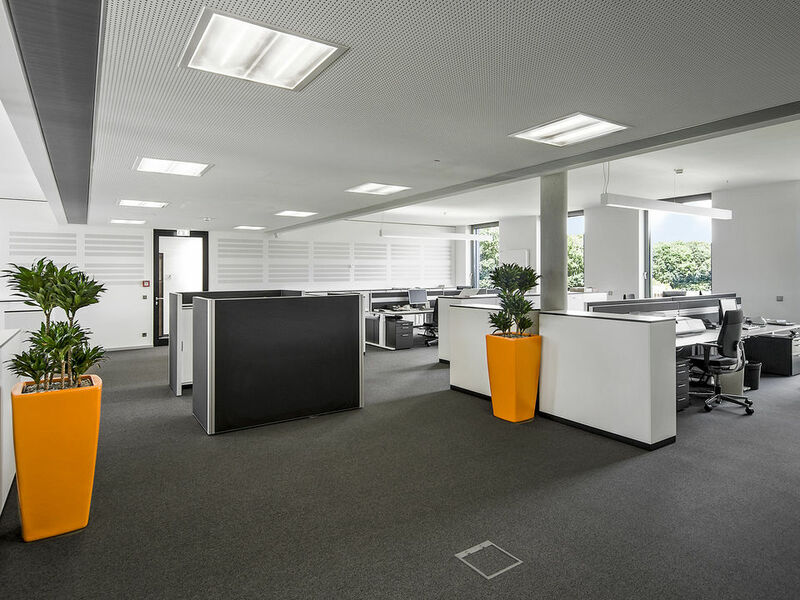 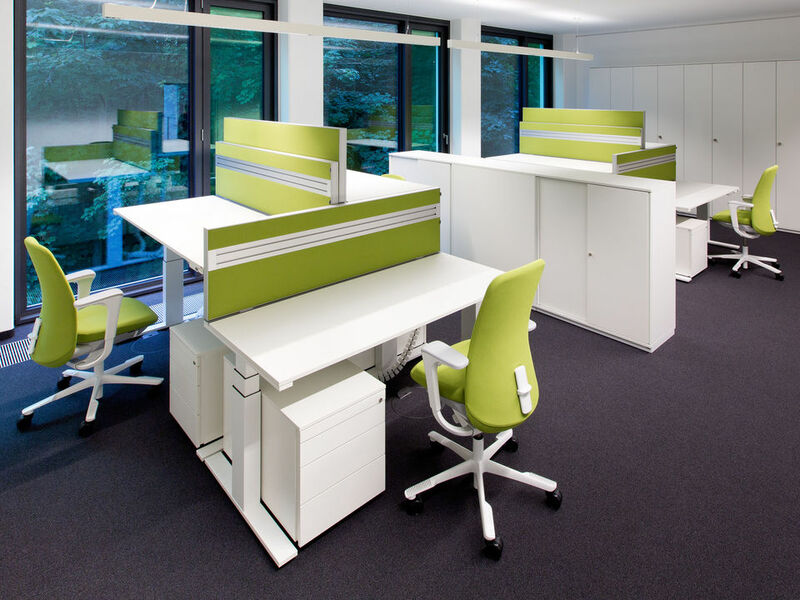 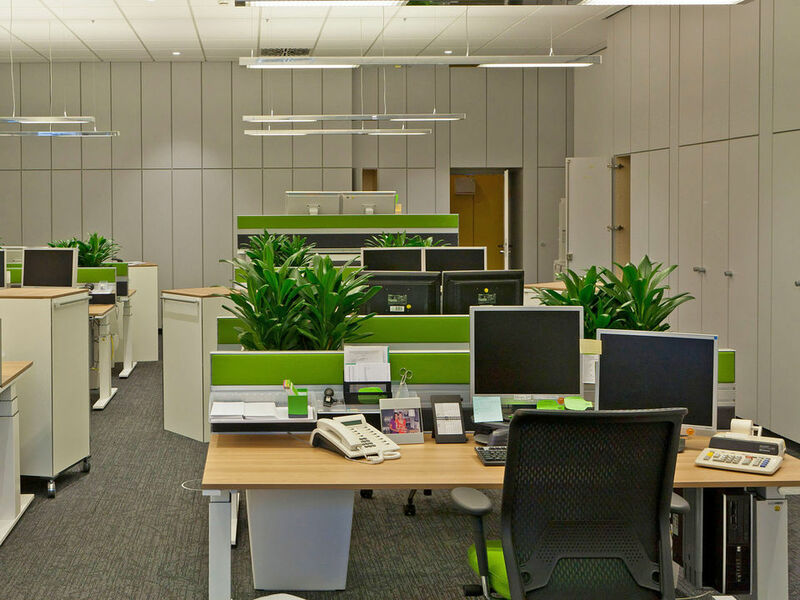 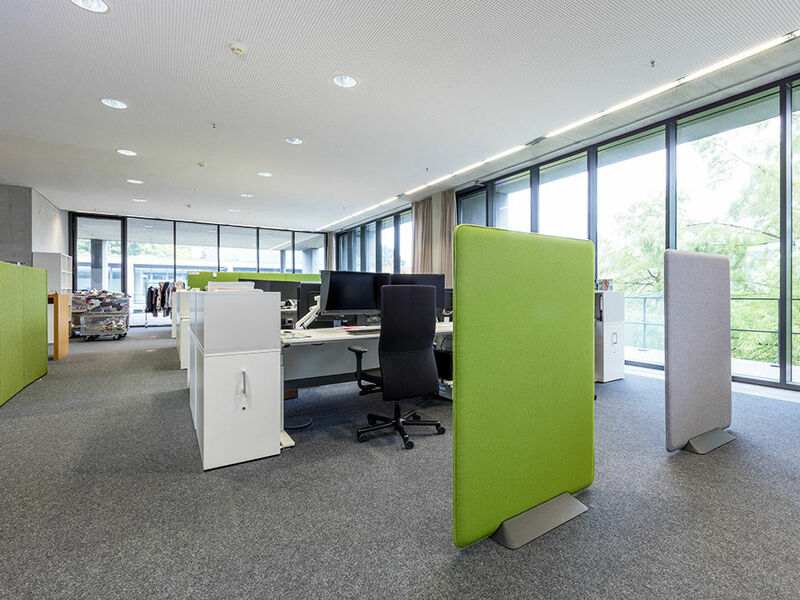 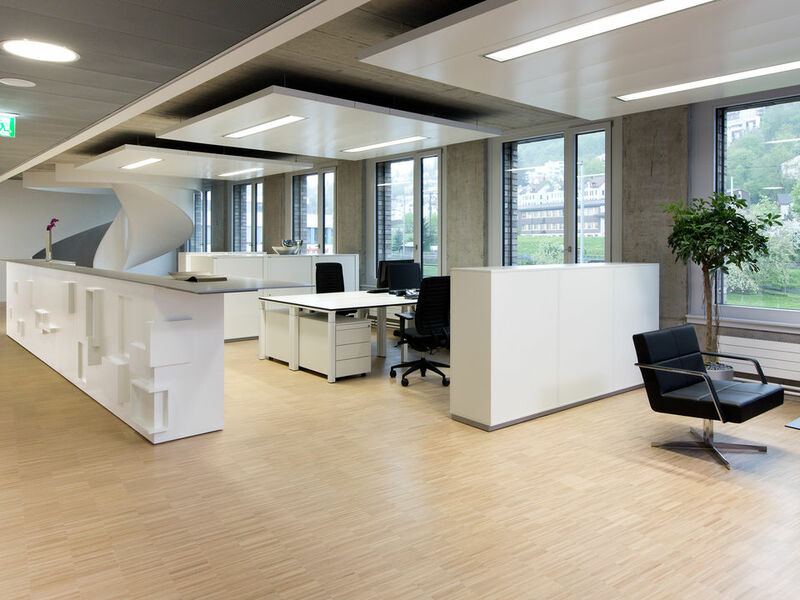 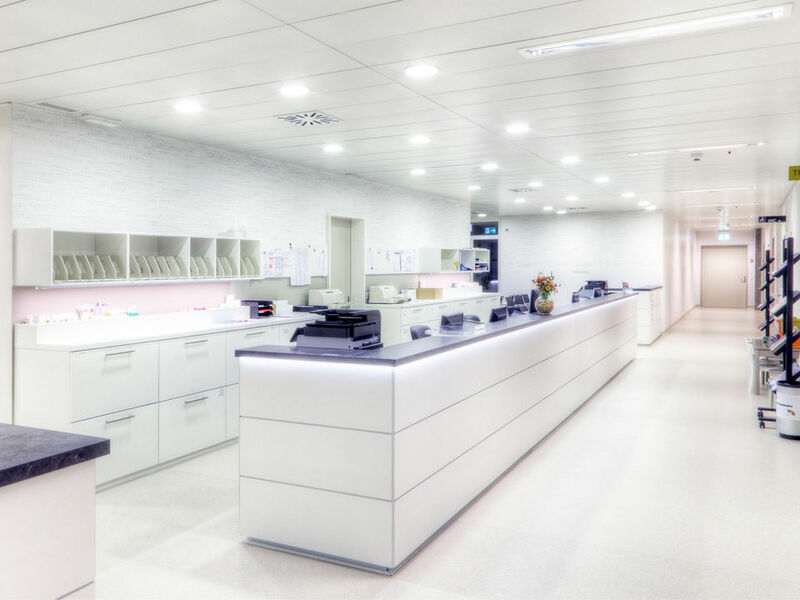 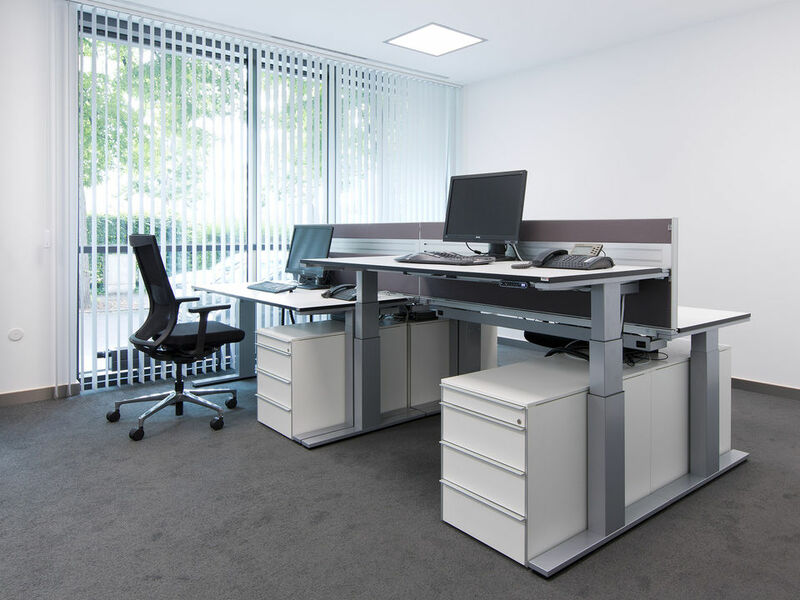 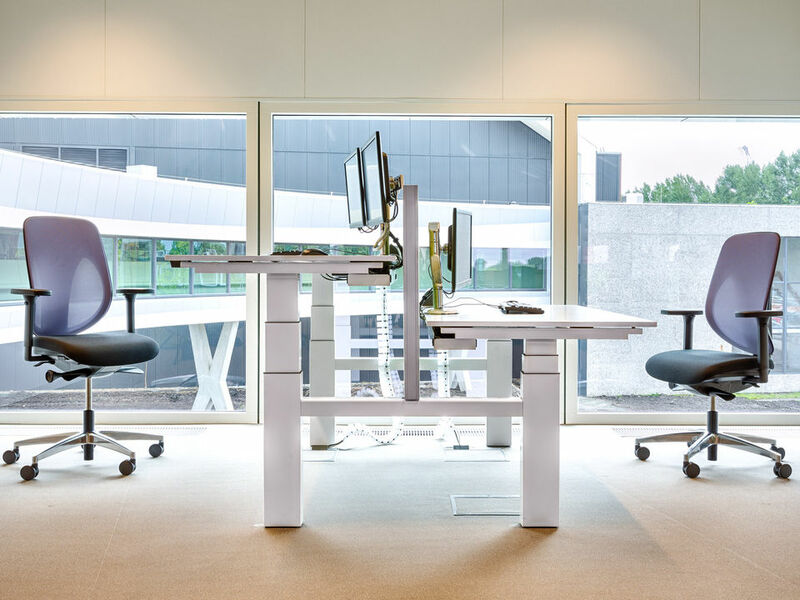 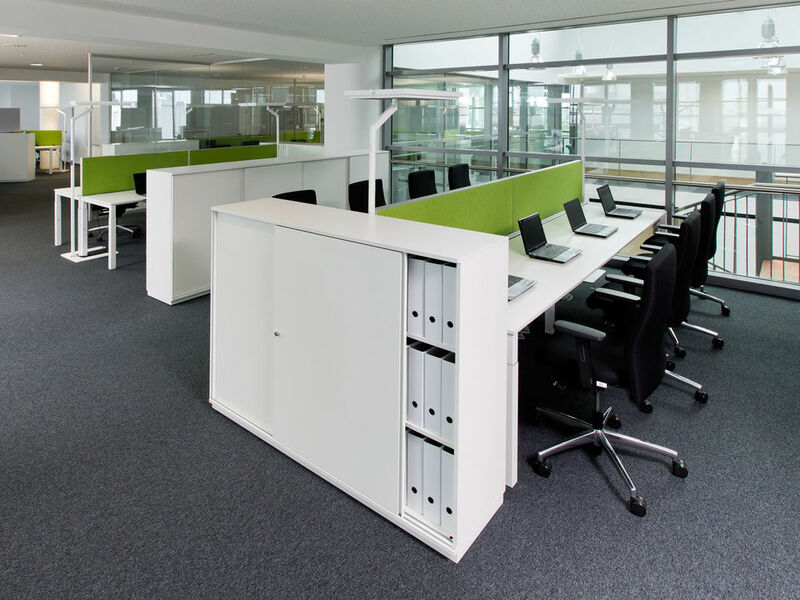 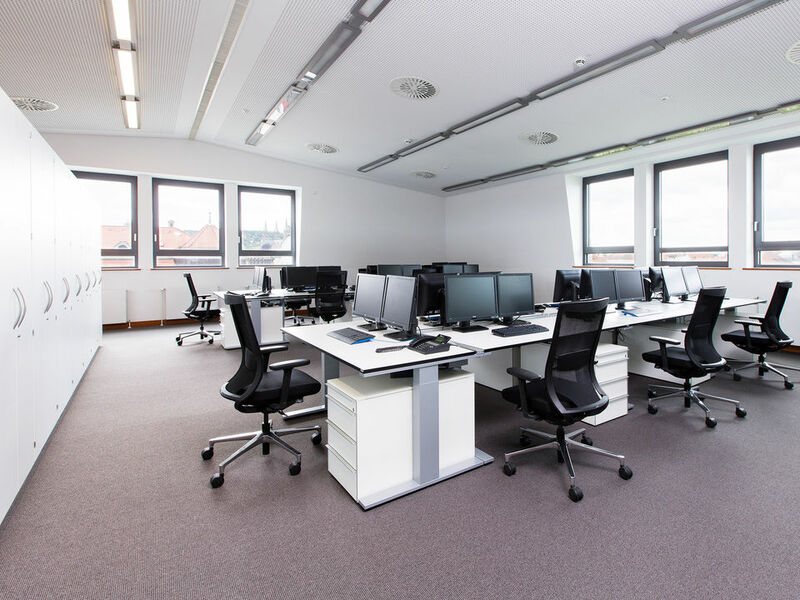 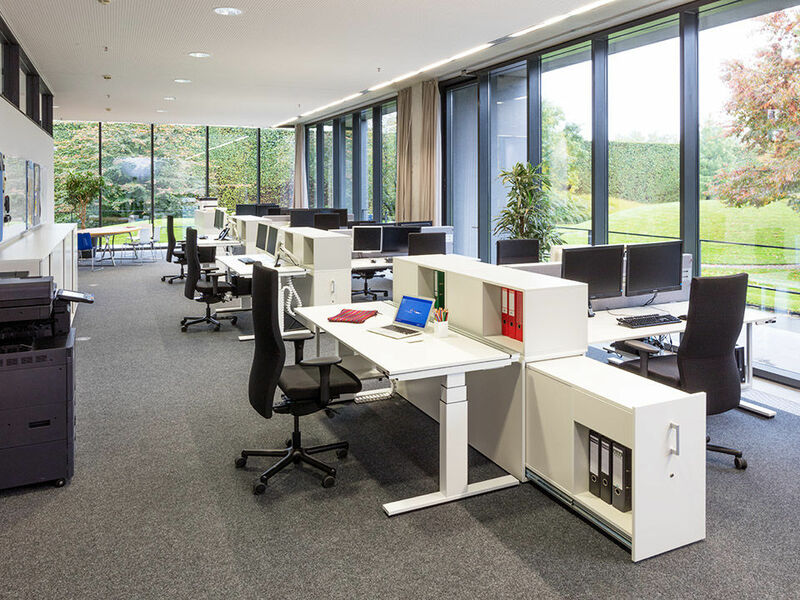 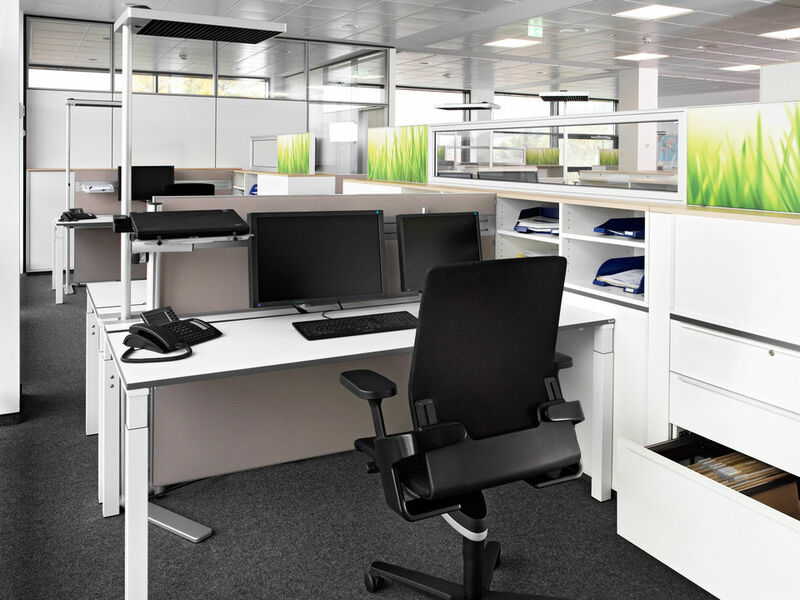 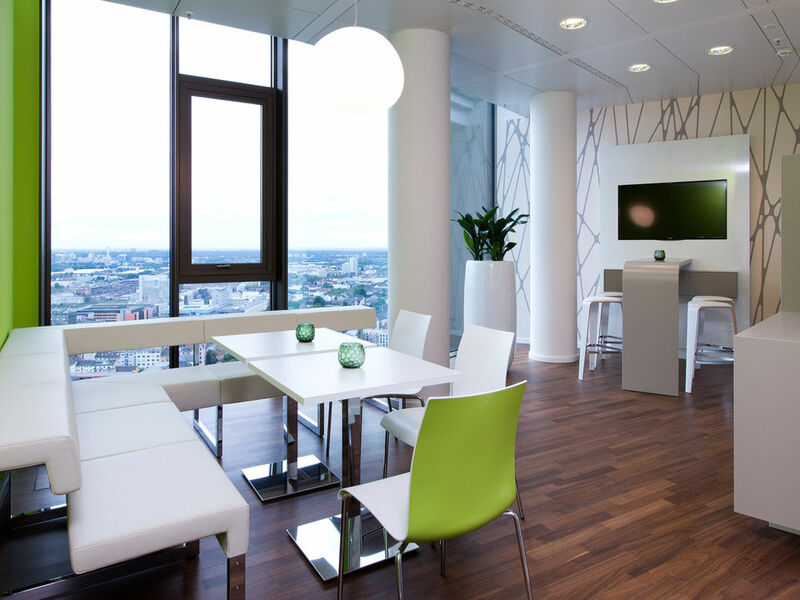 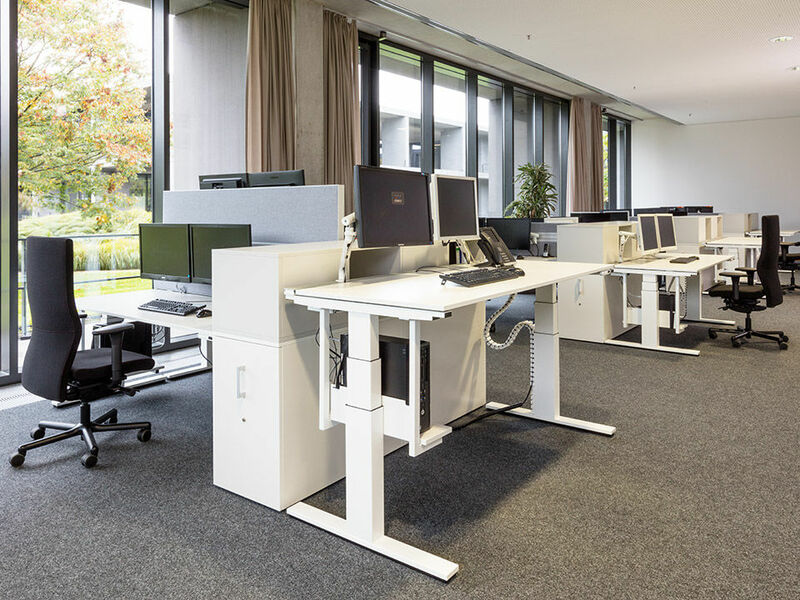 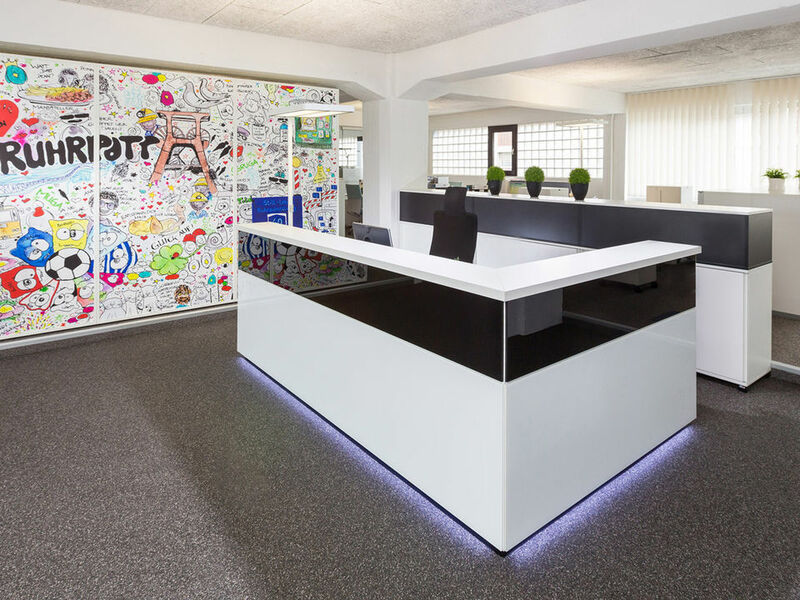 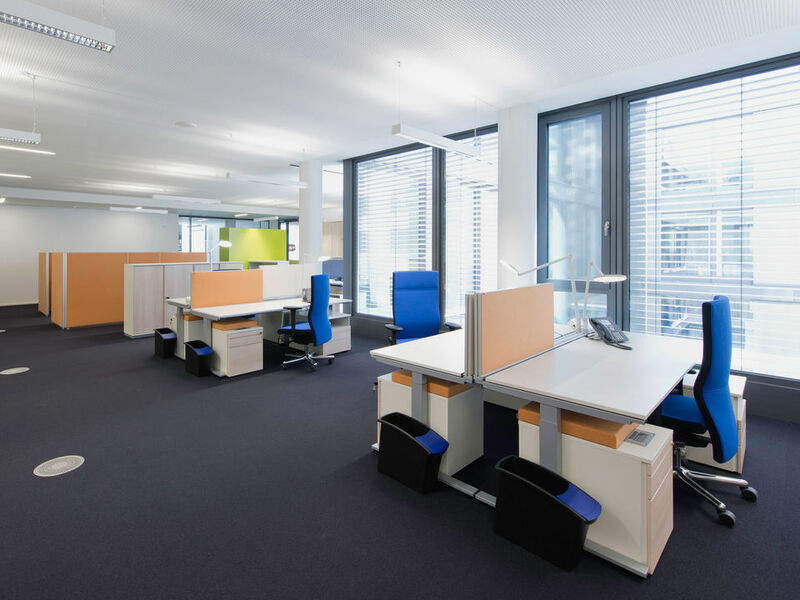 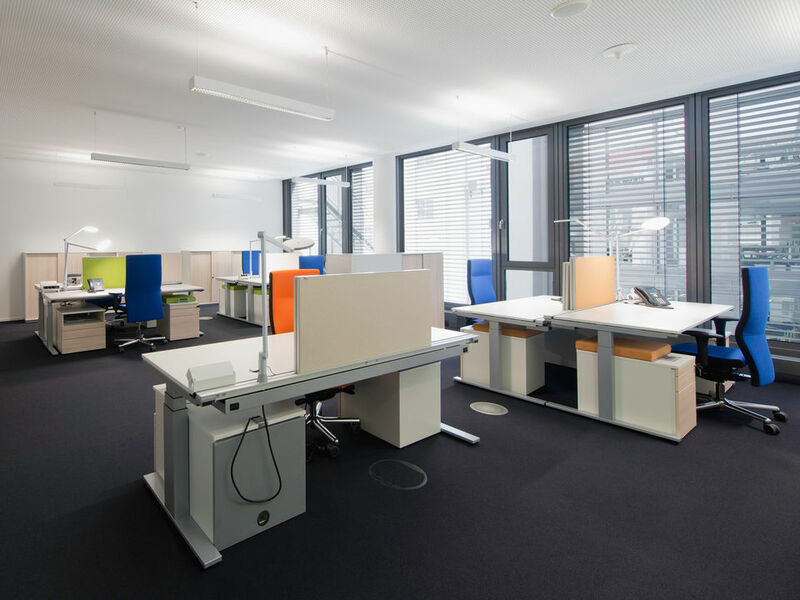 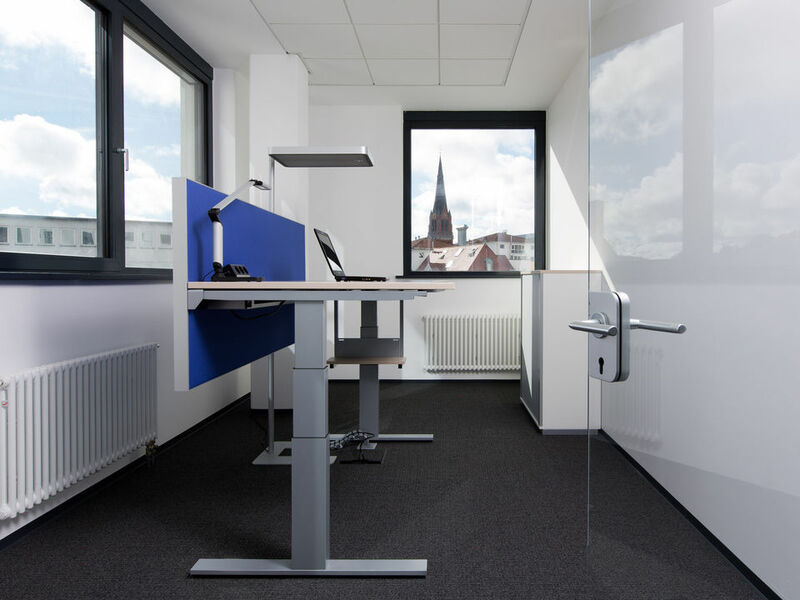 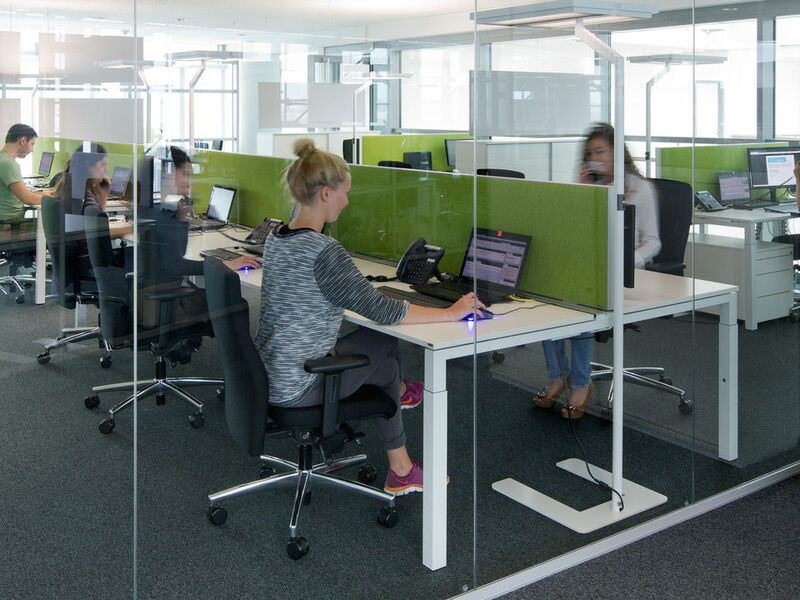 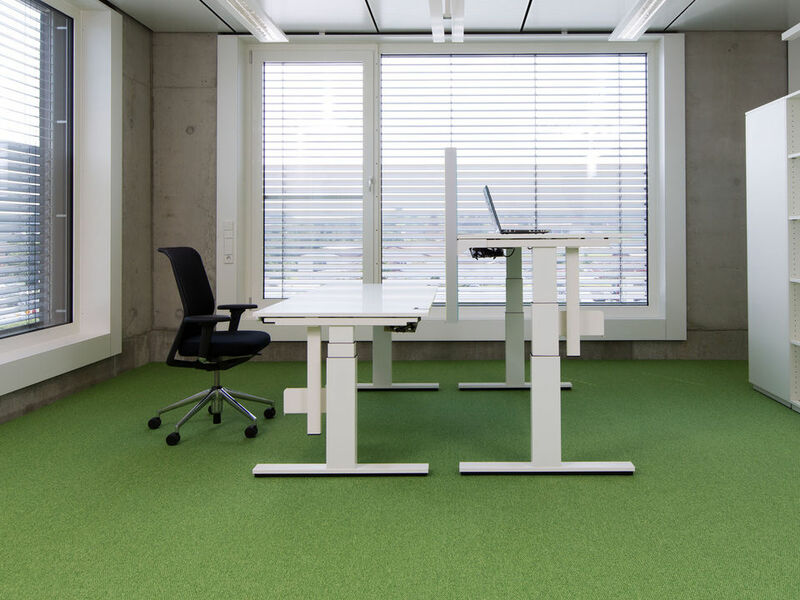 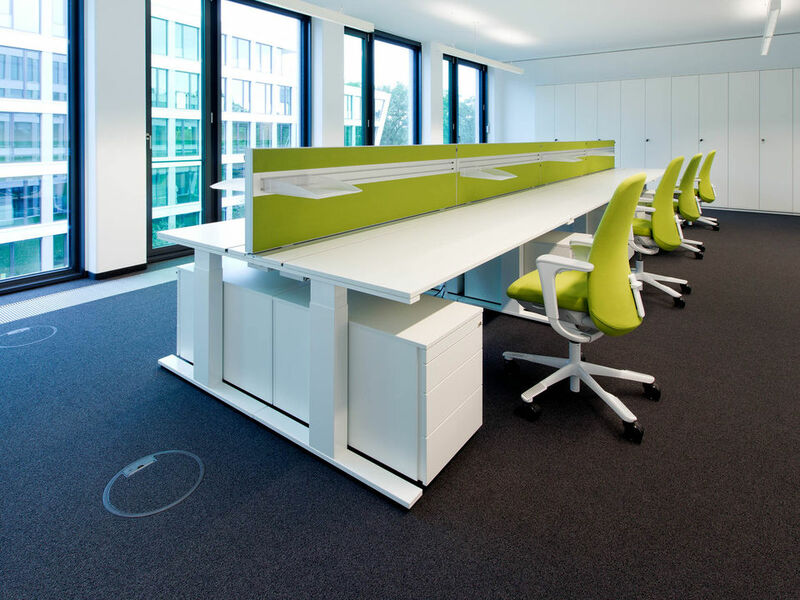 Round about 50 workstations were created for the staff of Sirtex Medical Europe GmbH at their Bonn location – with the ergonomics and sound management having been optimised to state-of-the-art level. 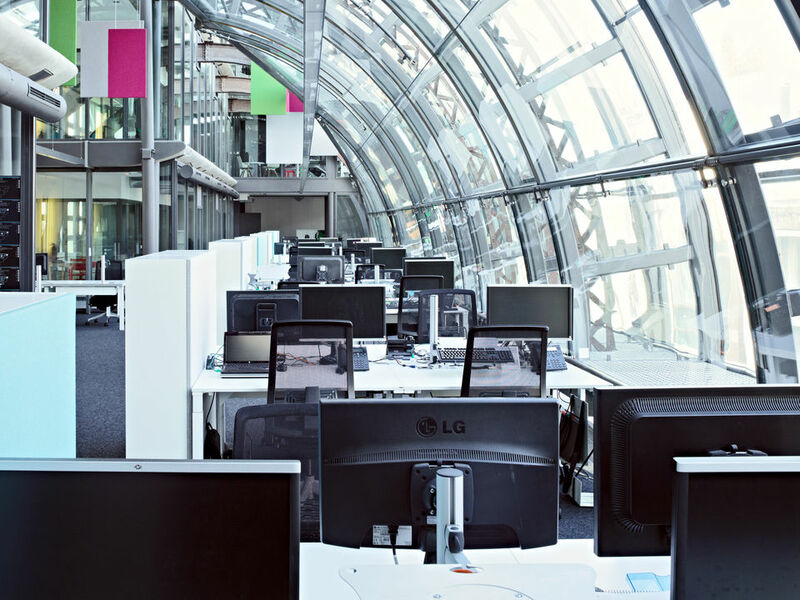 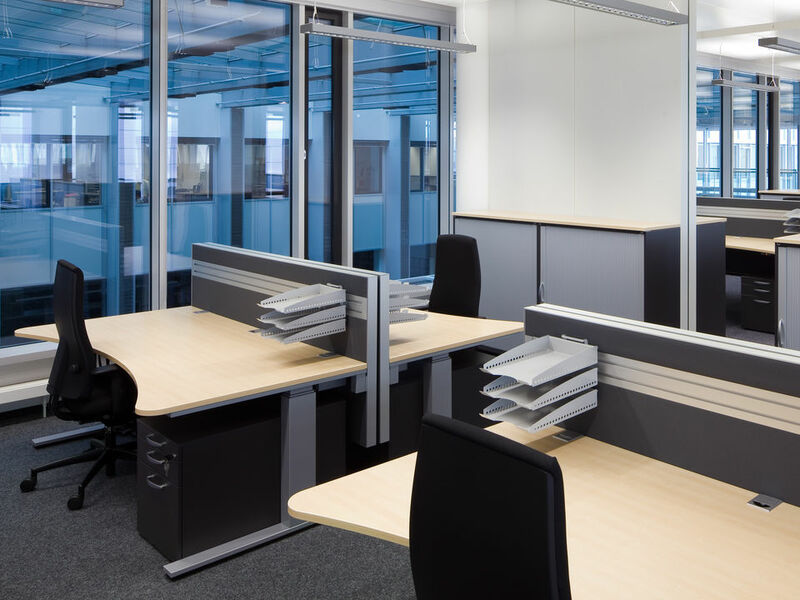 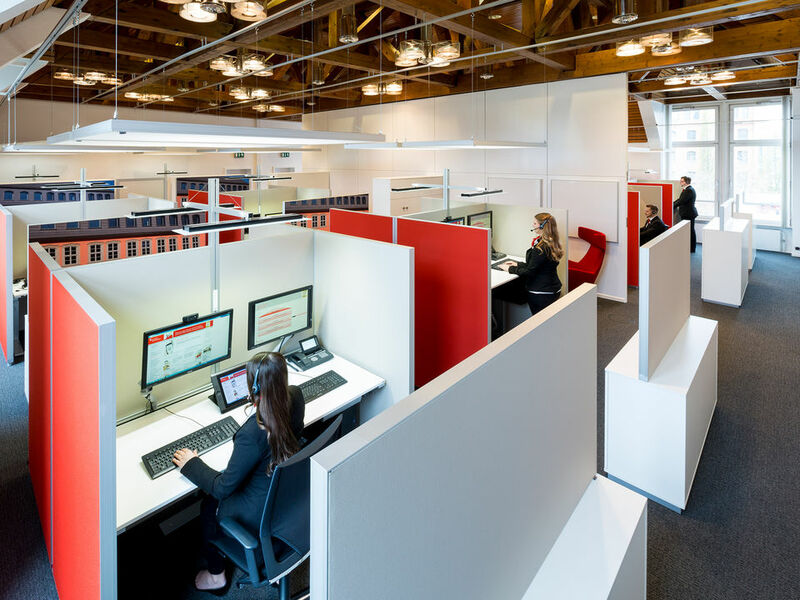 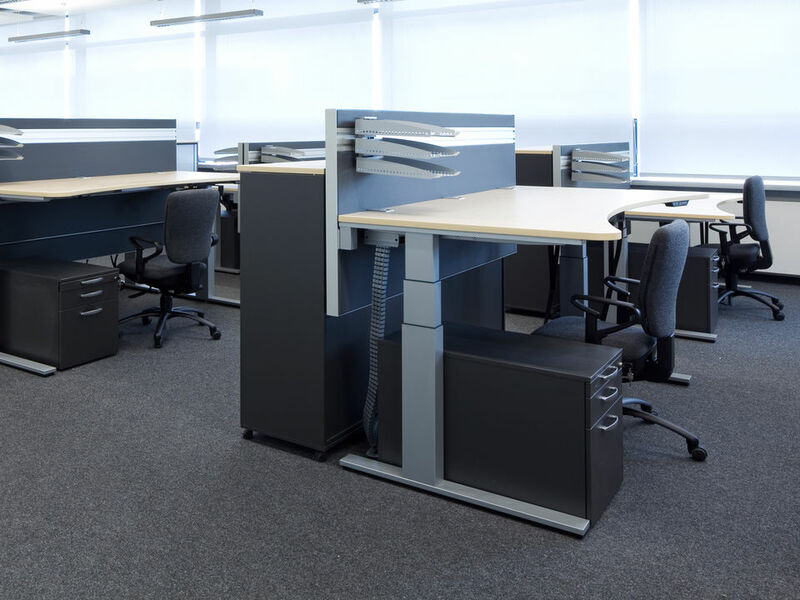 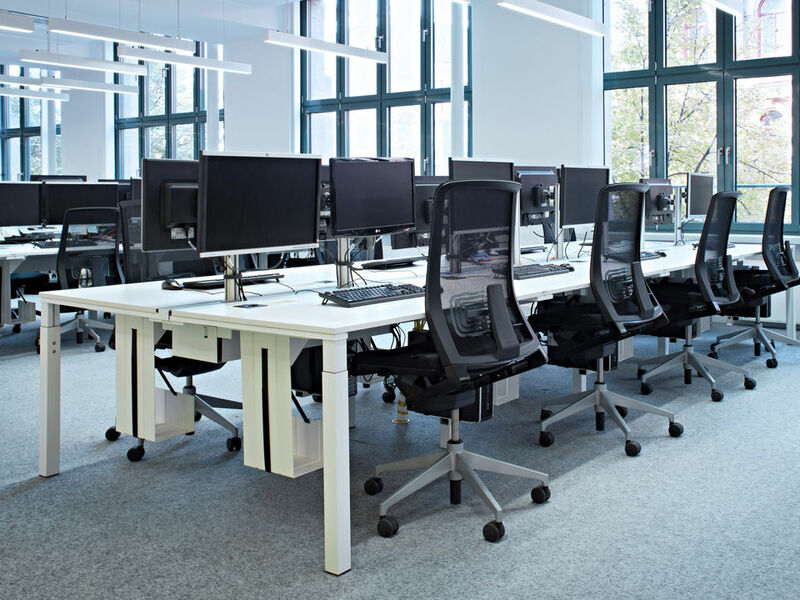 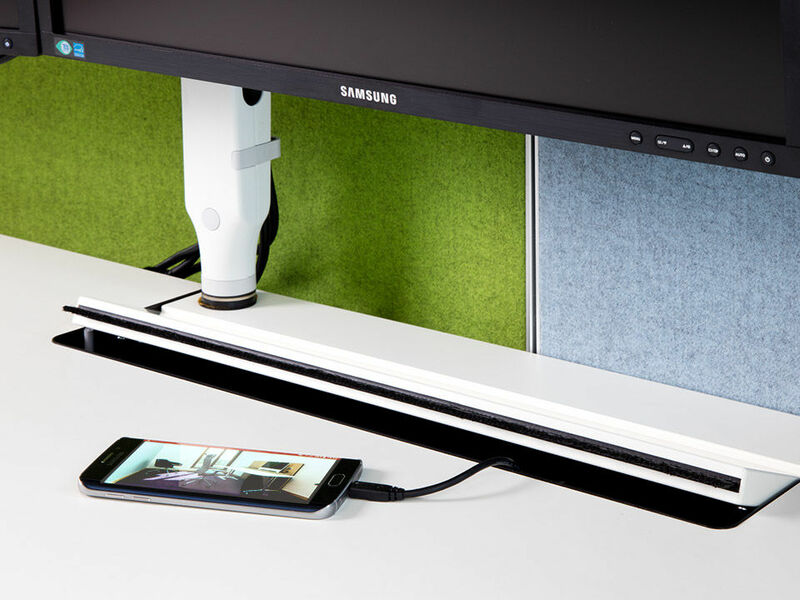 Accommodating 40 workstations on approx. 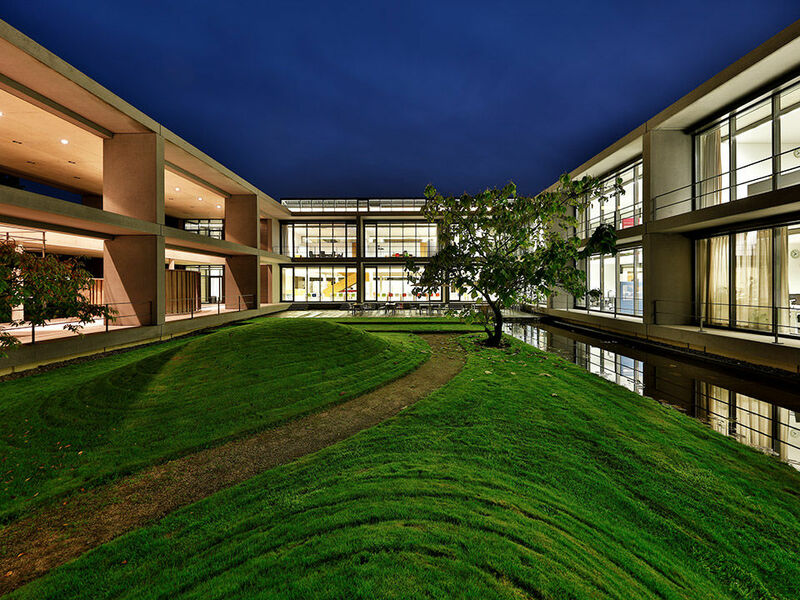 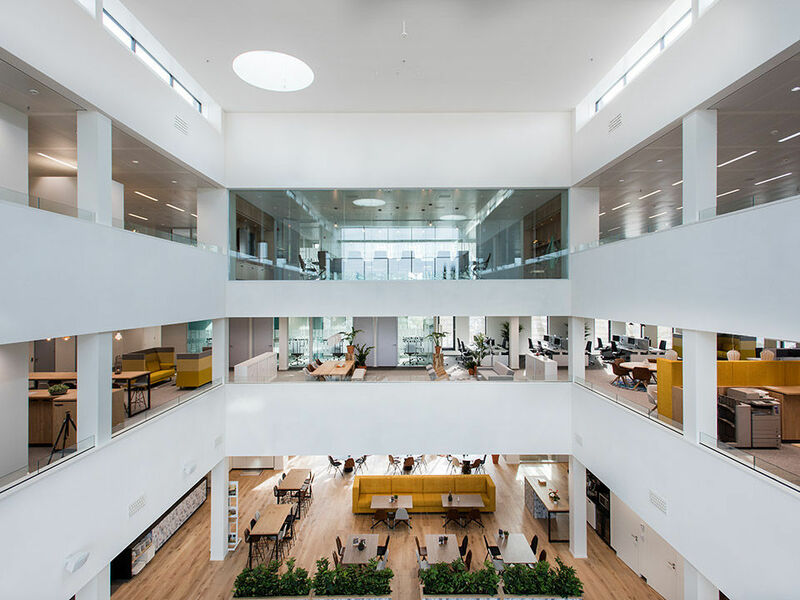 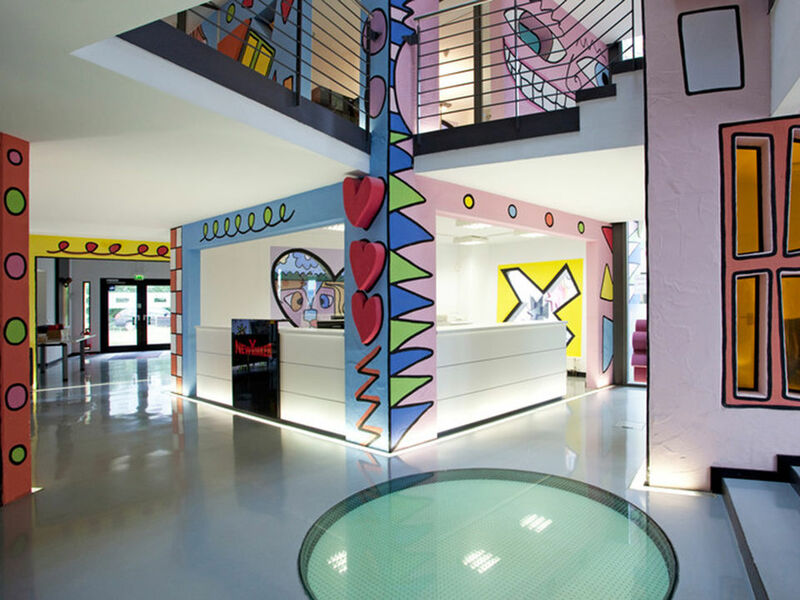 900sq m, an open, design-orientated office world has evolved whose sheer quality and top-grade functionalism are a reflection of the company’s high regard for its staff and clients. 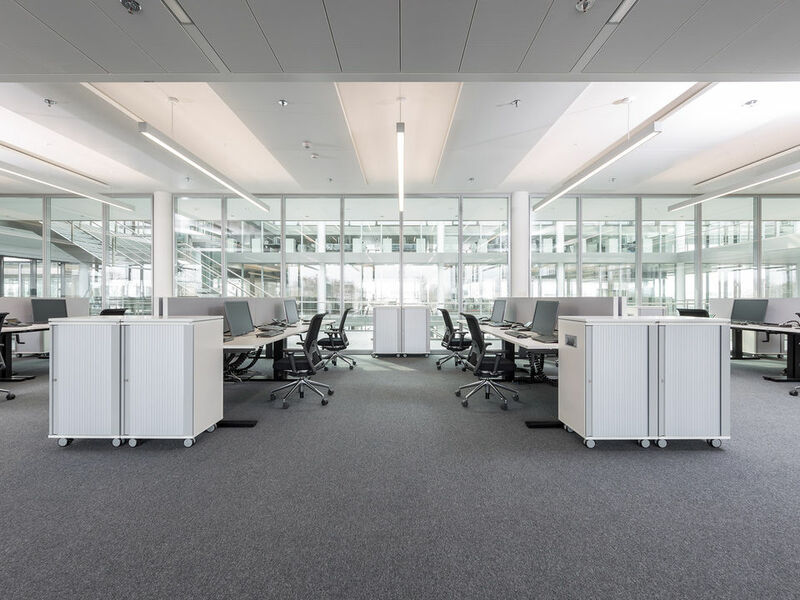 Spread over 8,000 m² and four floors in Ludwigsburg, 300 ergonomic workplaces were created that reflect the corporate identity of Hahn+Kolb GmbH. 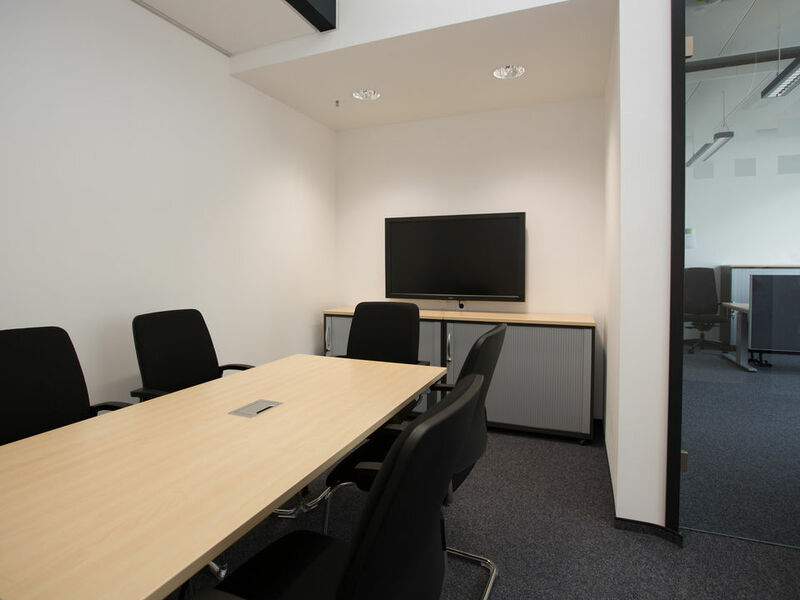 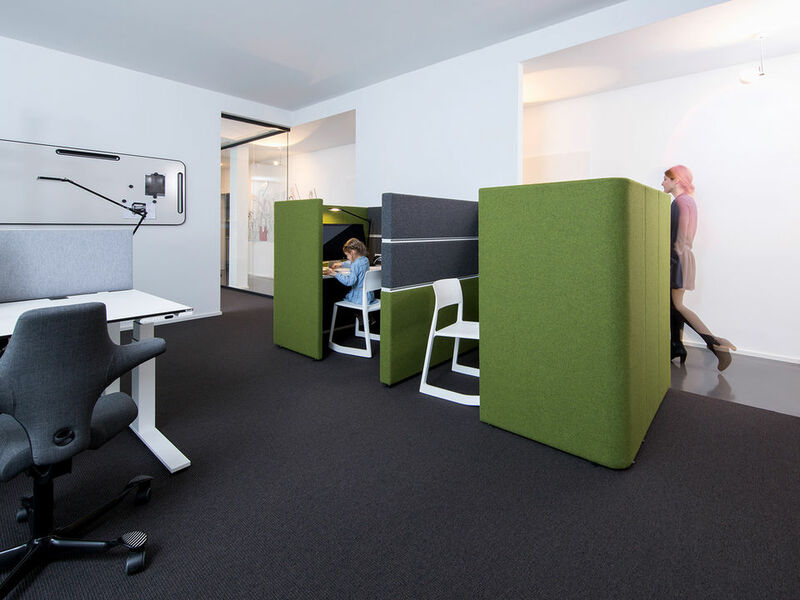 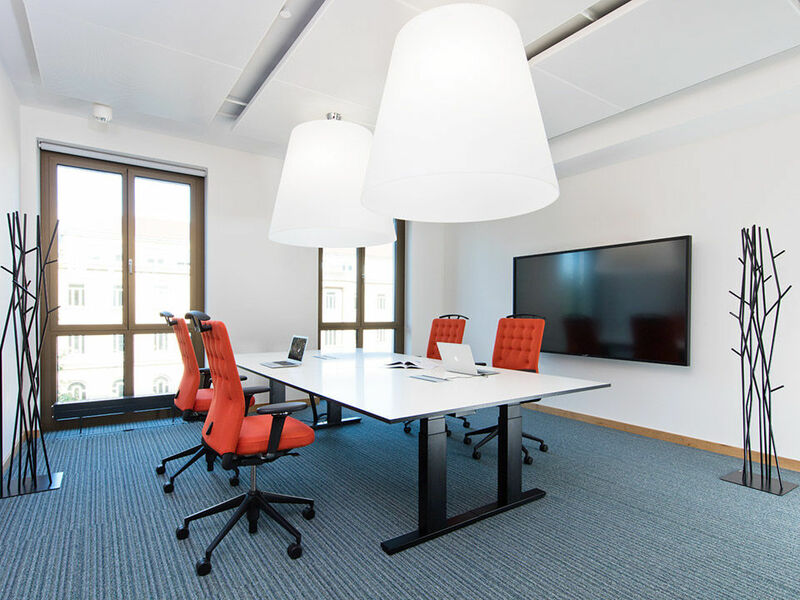 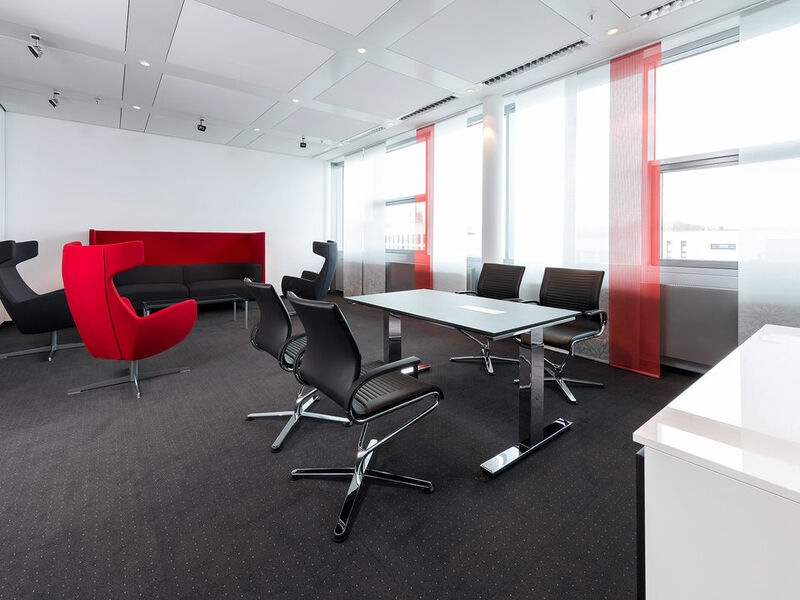 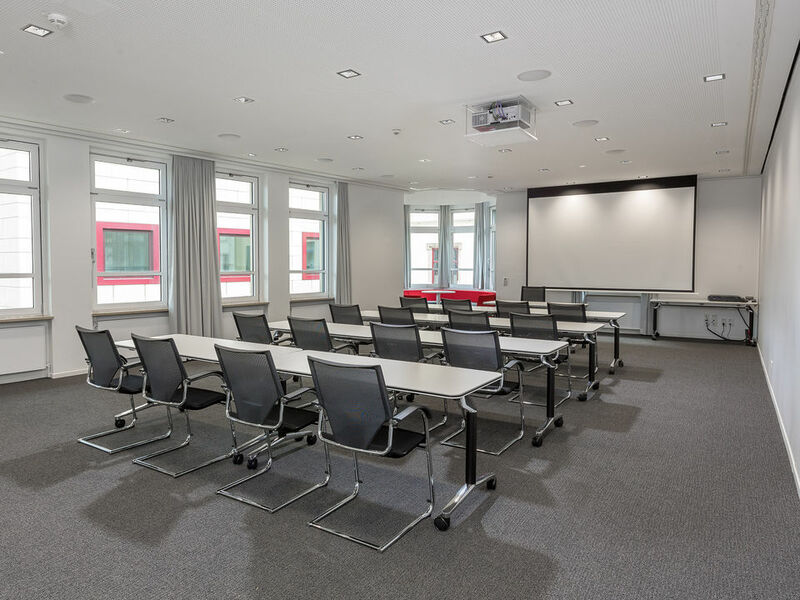 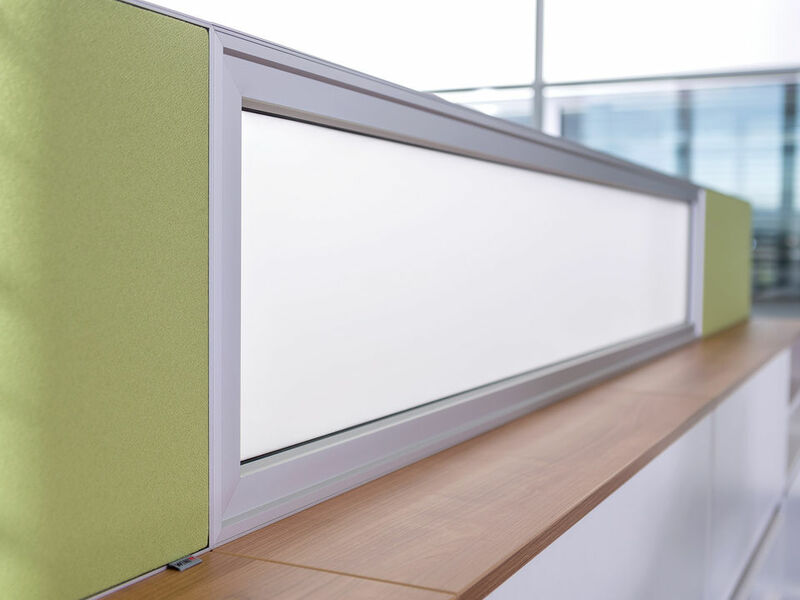 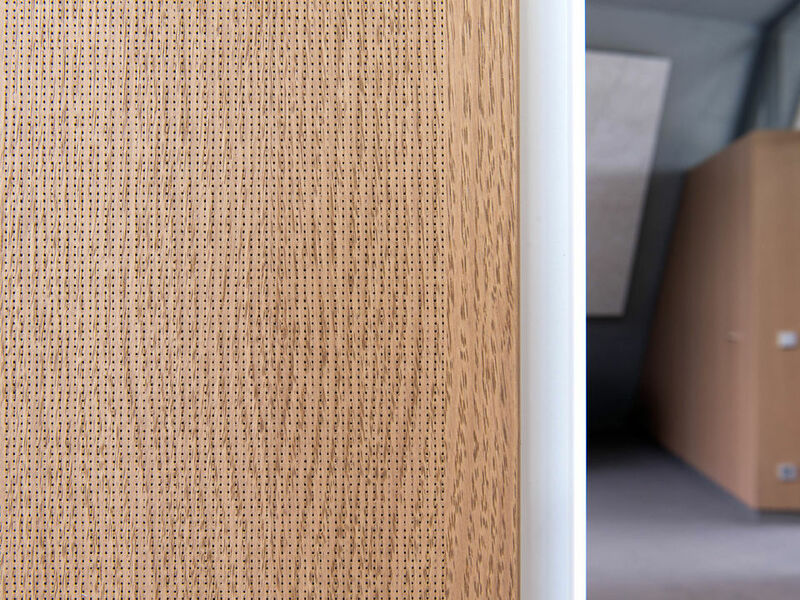 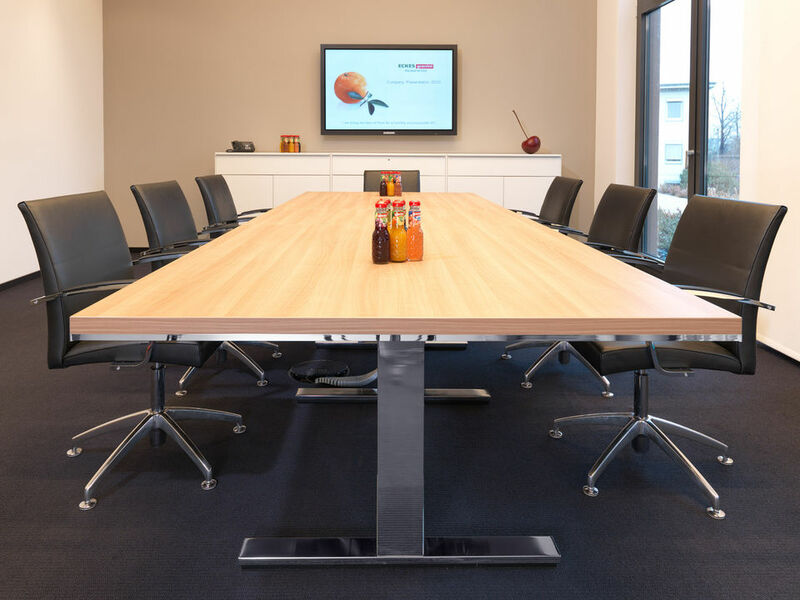 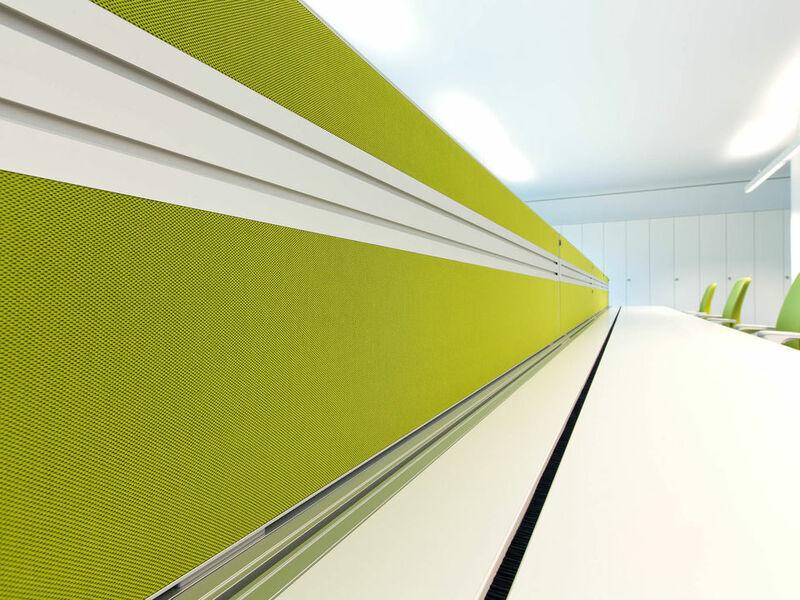 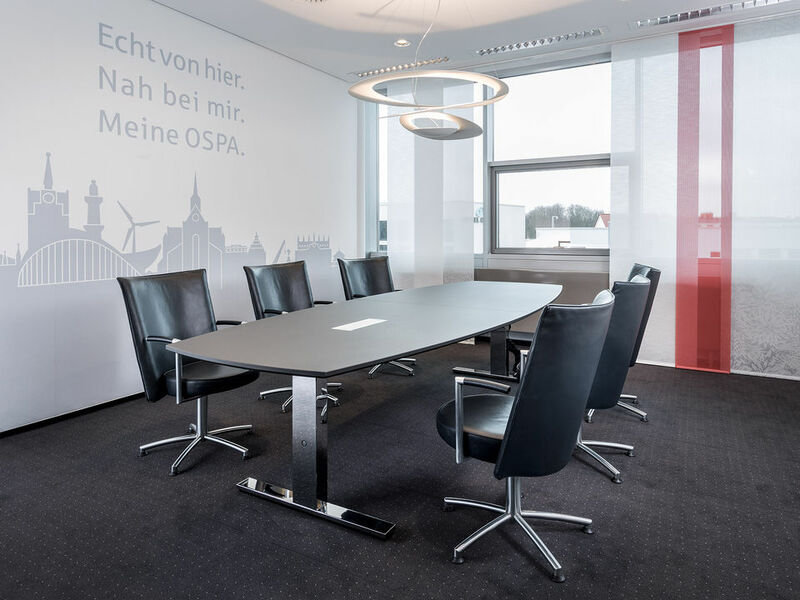 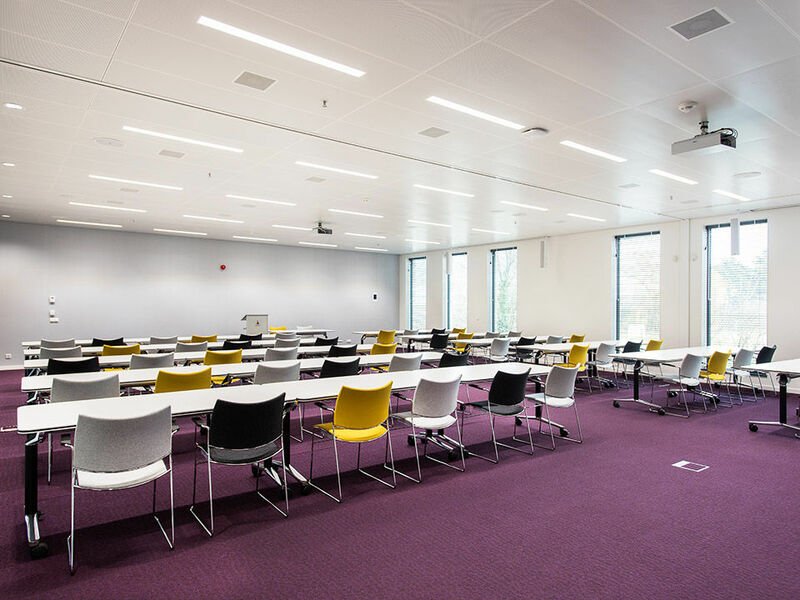 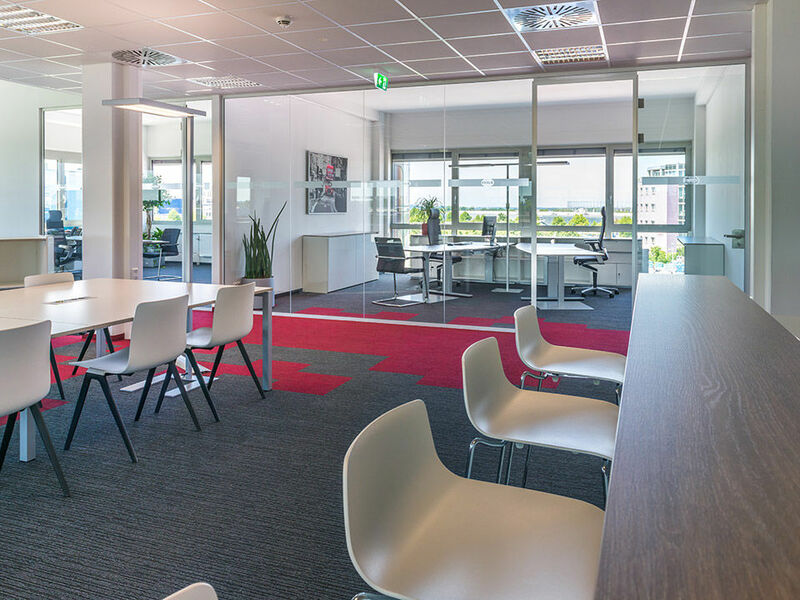 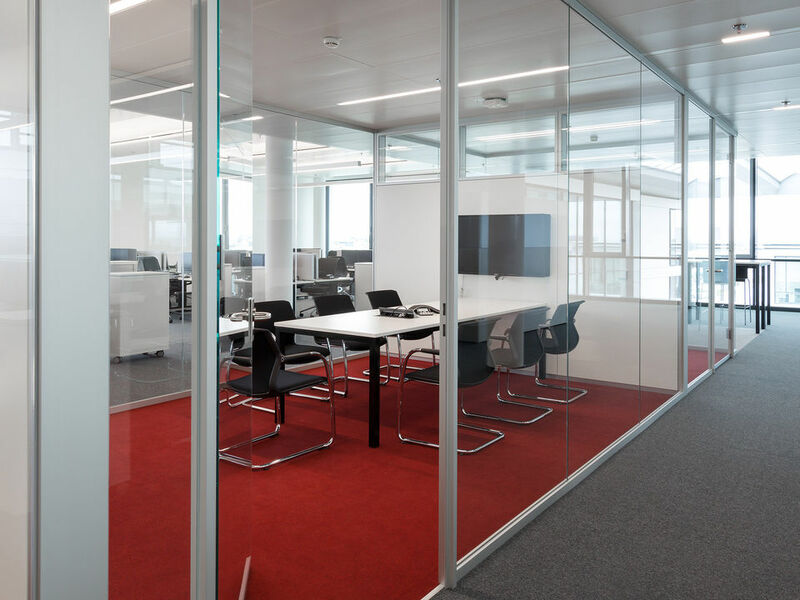 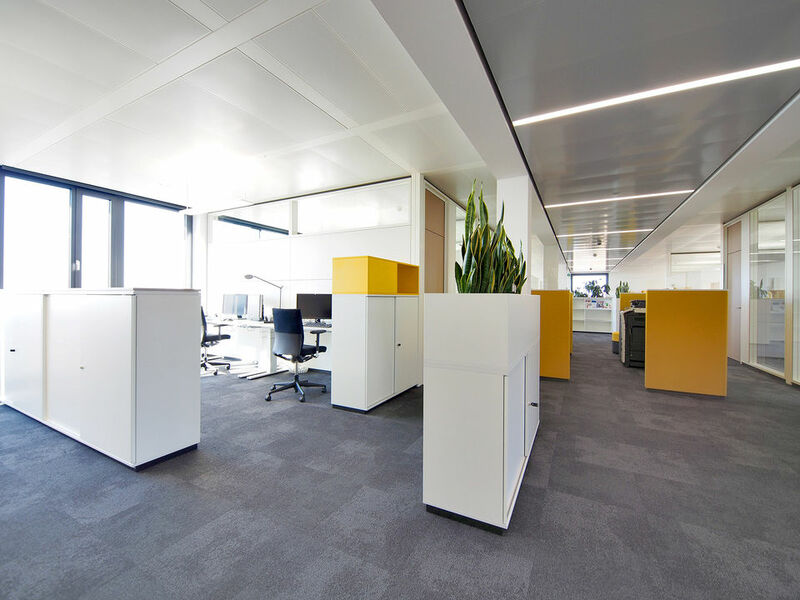 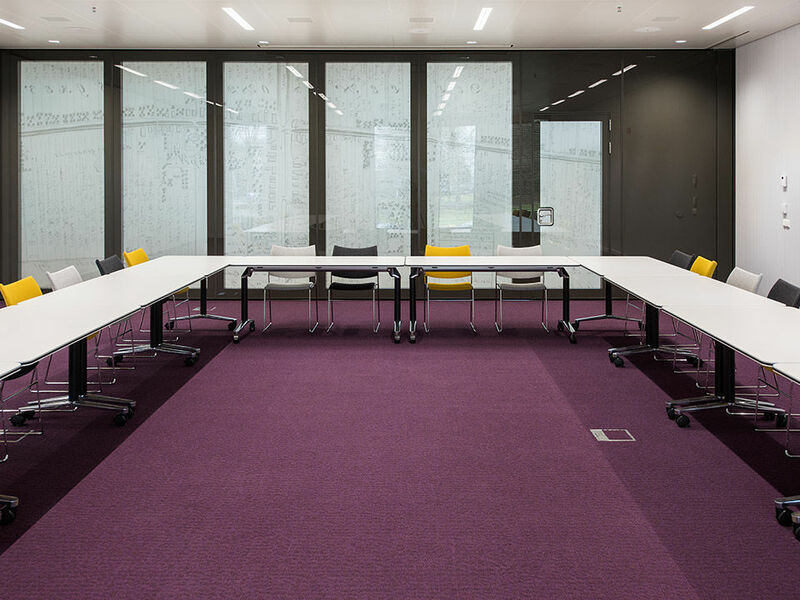 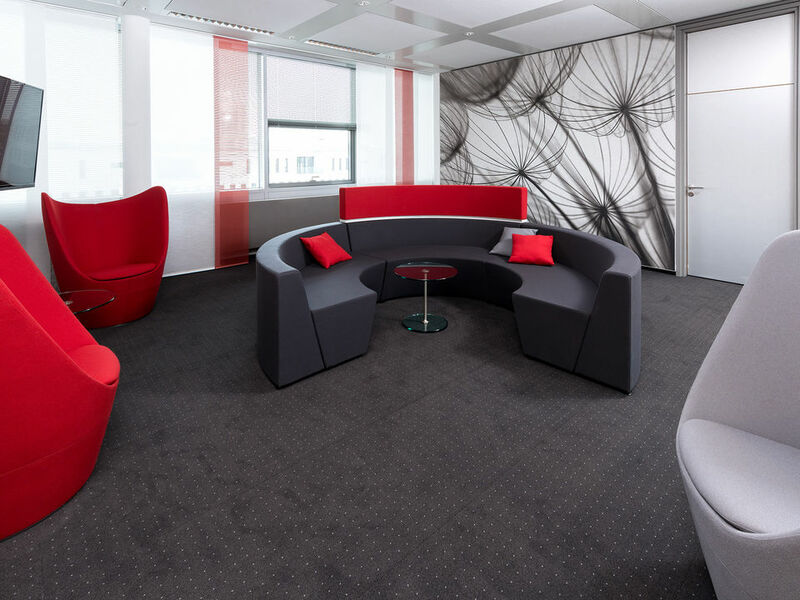 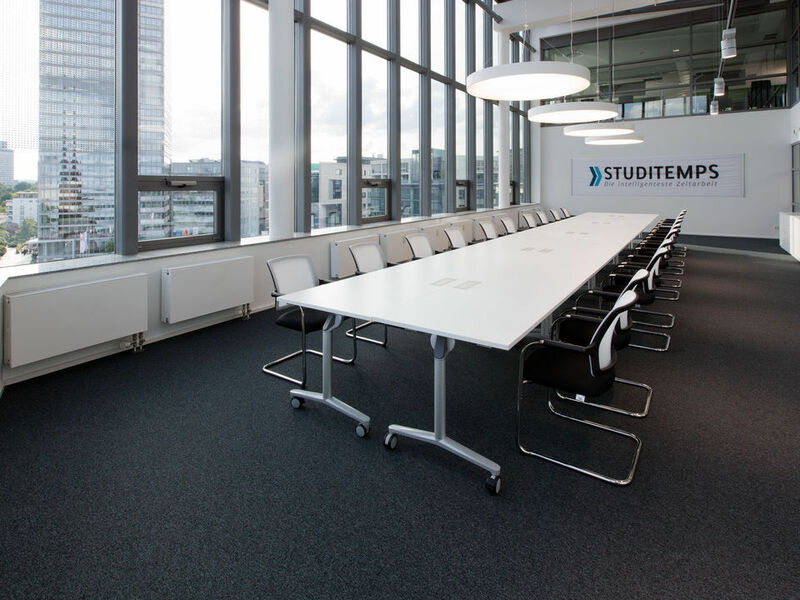 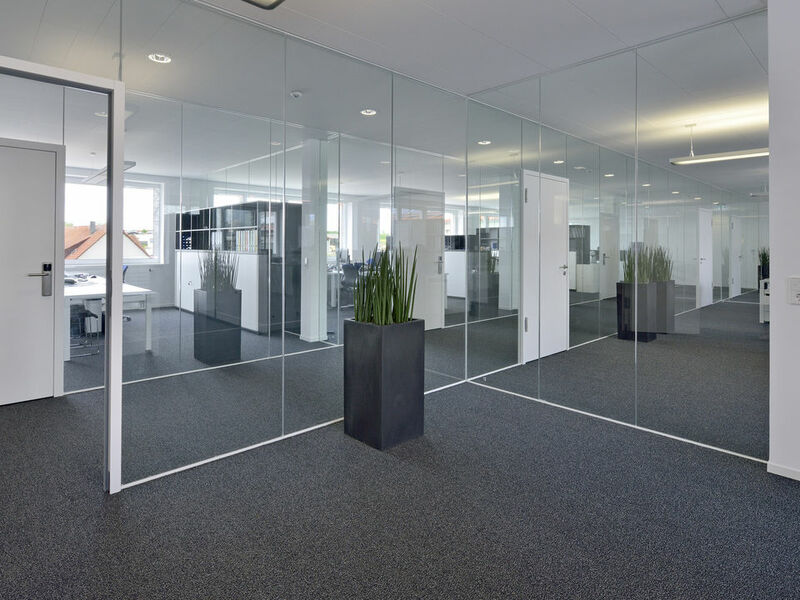 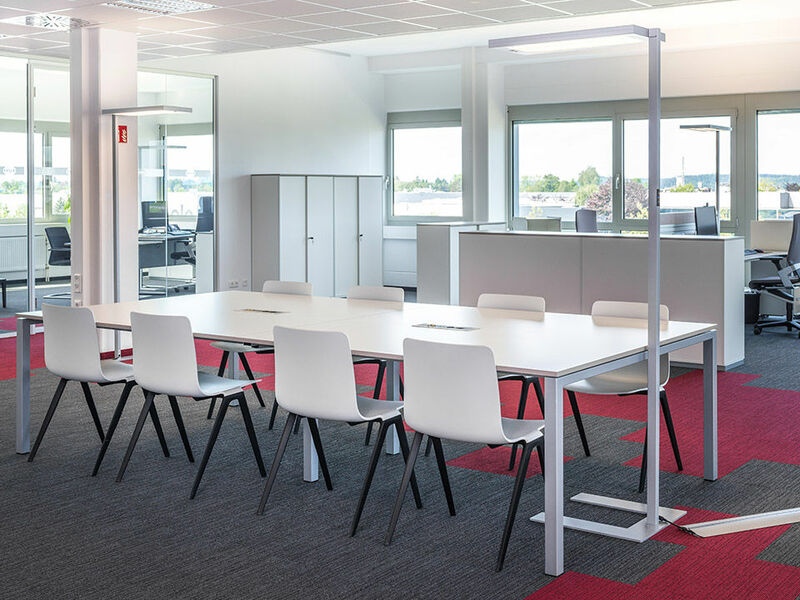 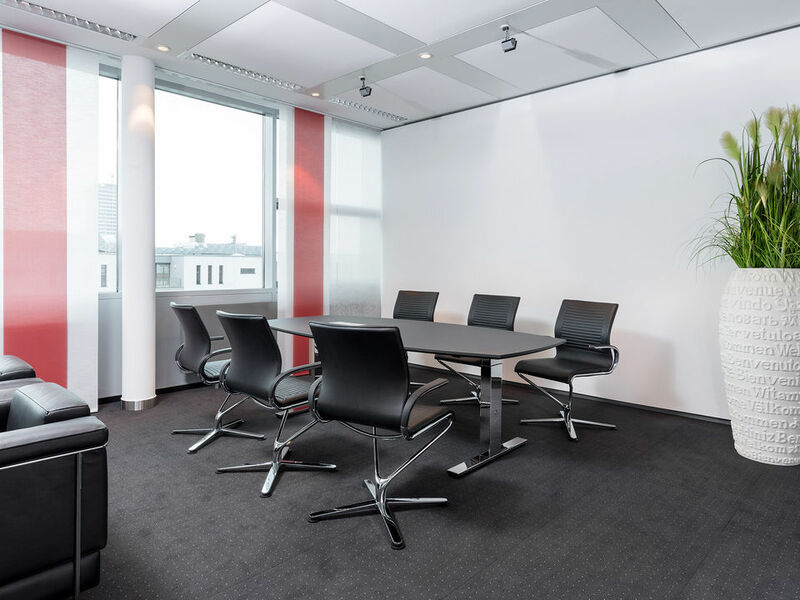 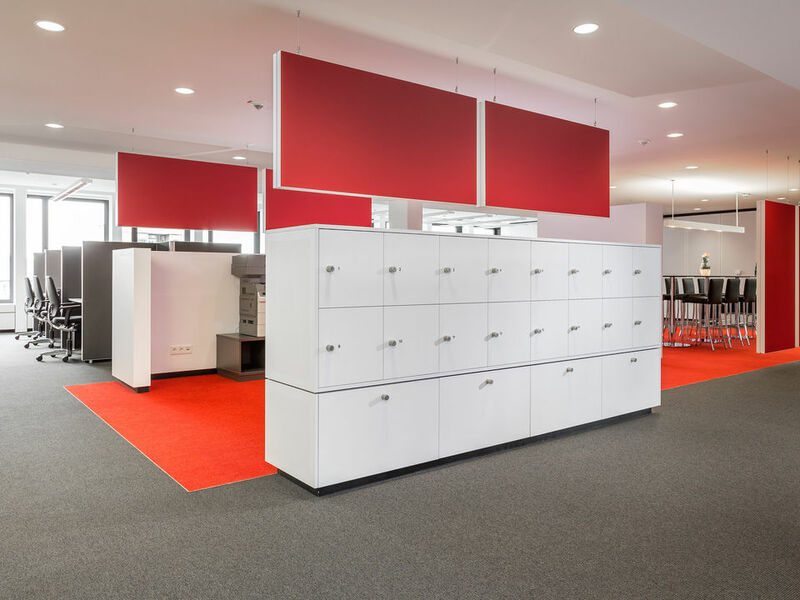 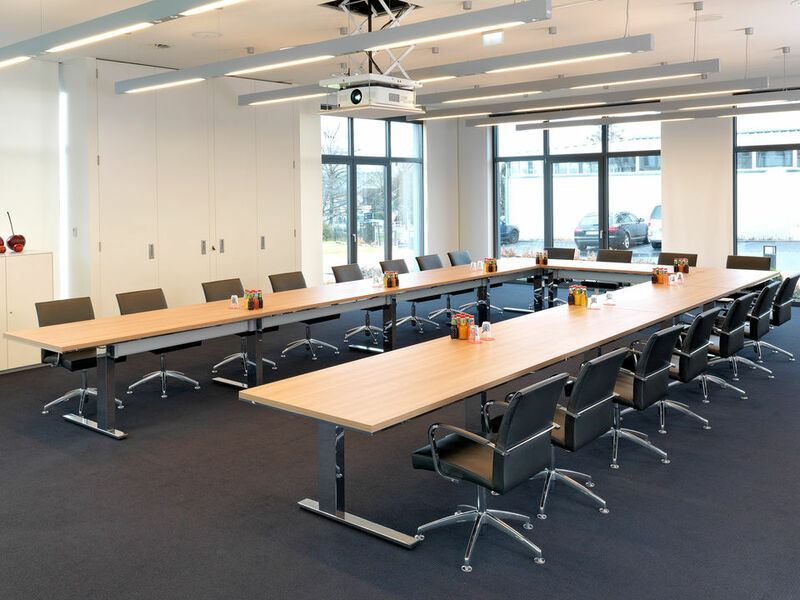 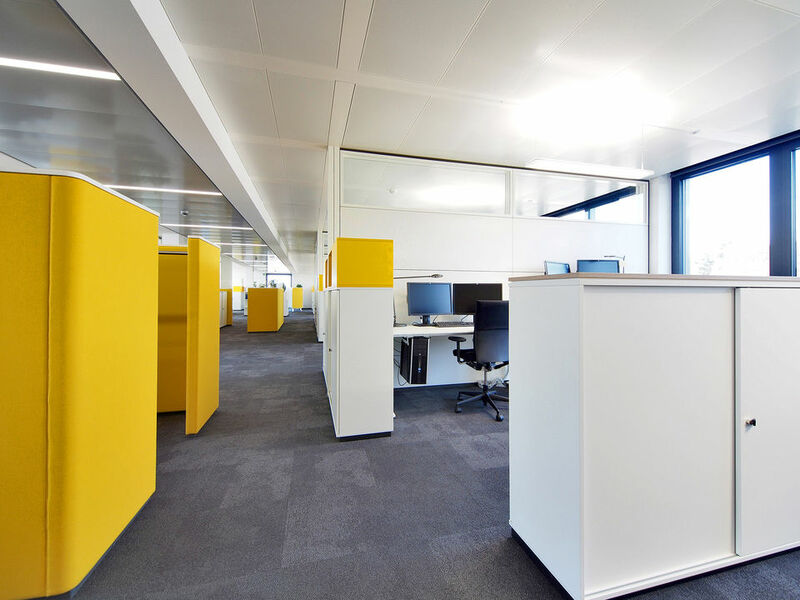 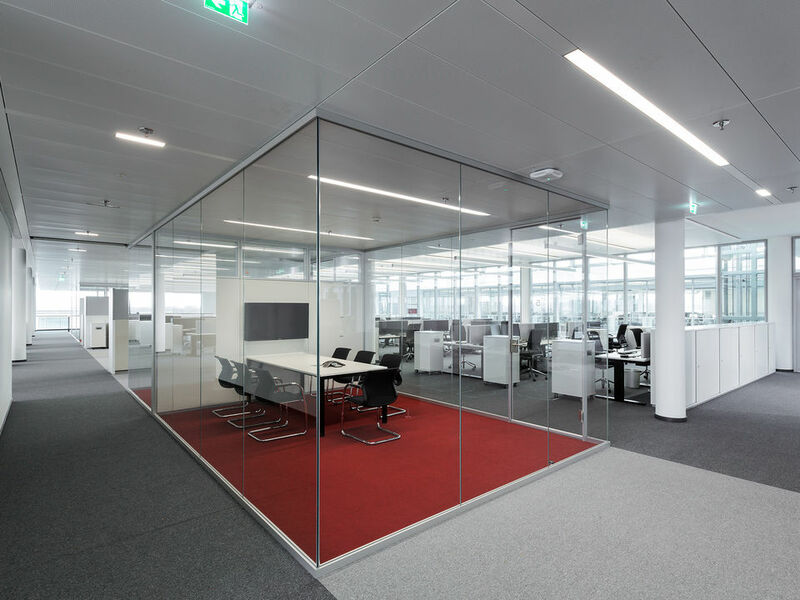 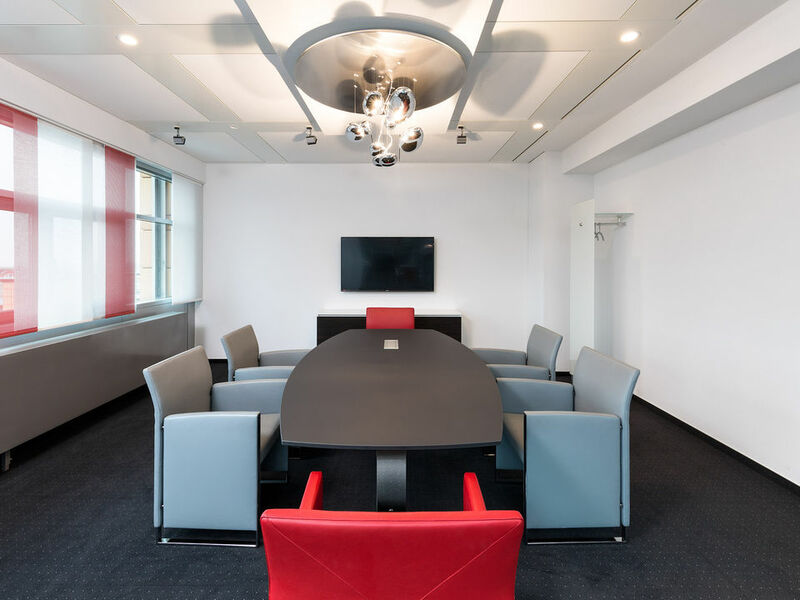 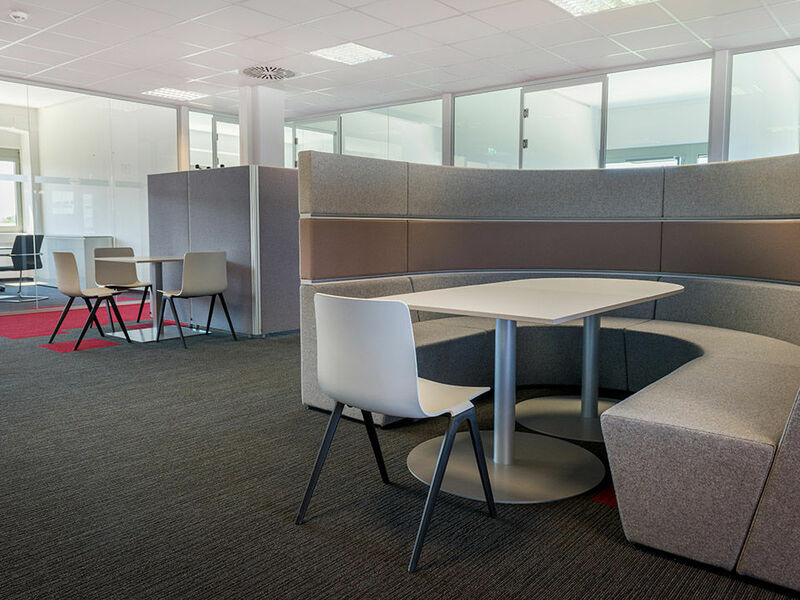 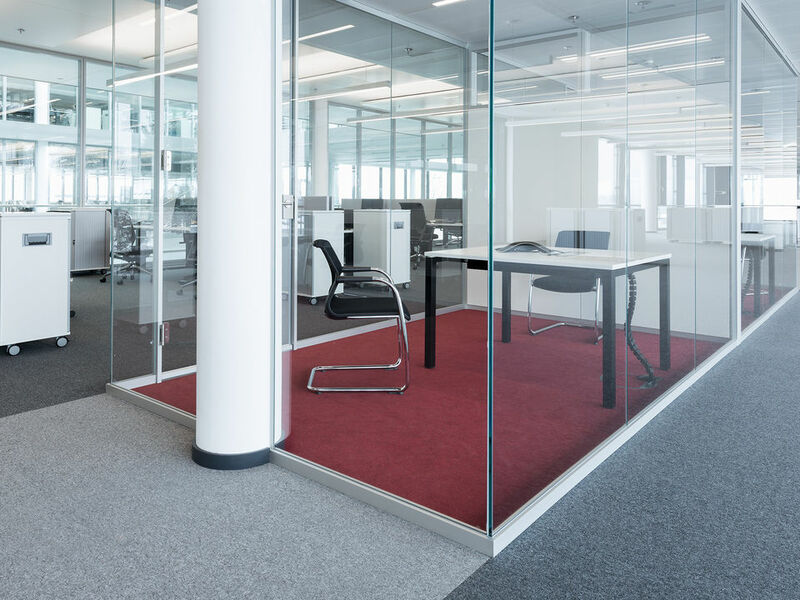 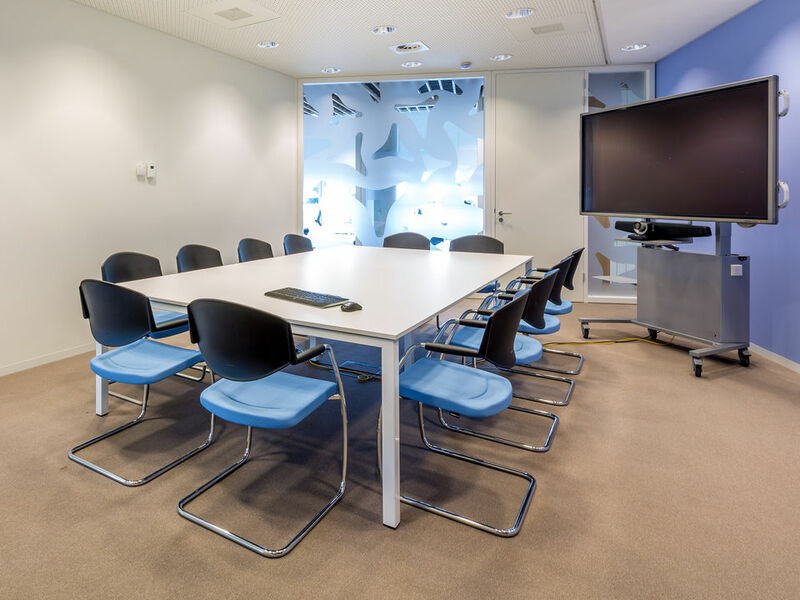 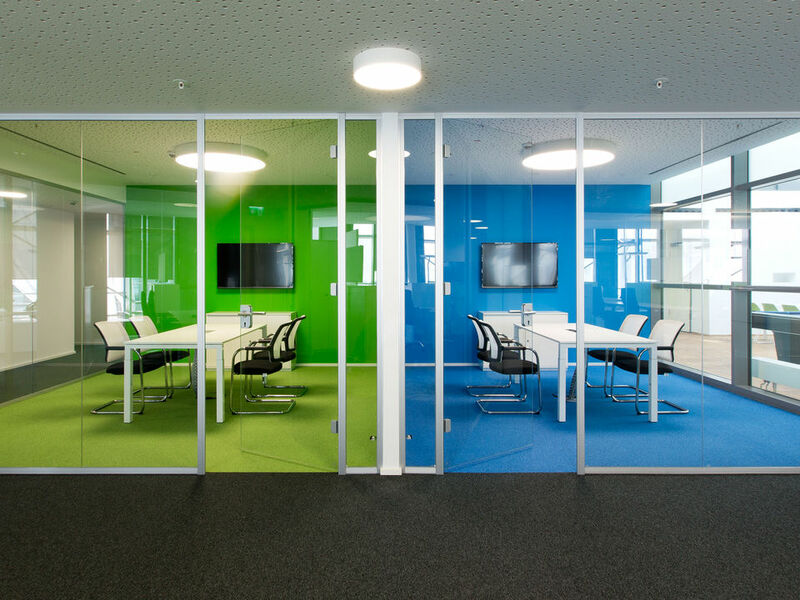 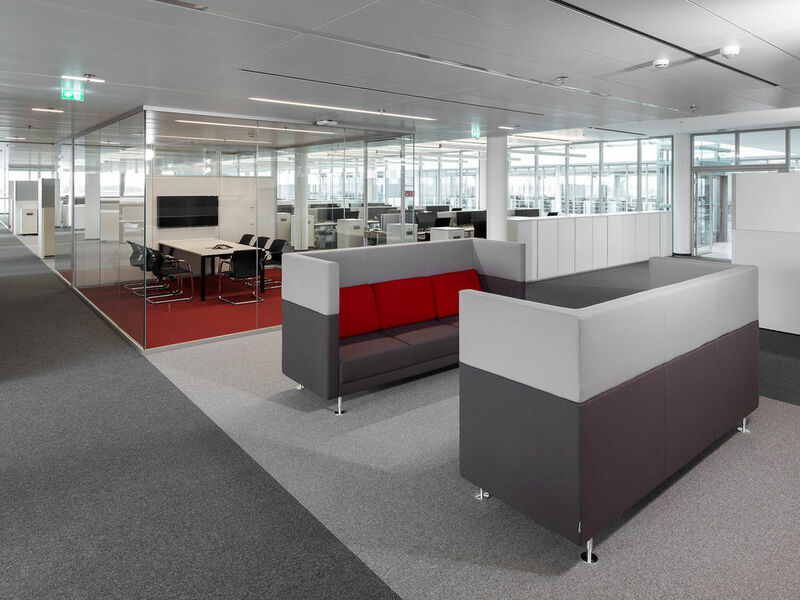 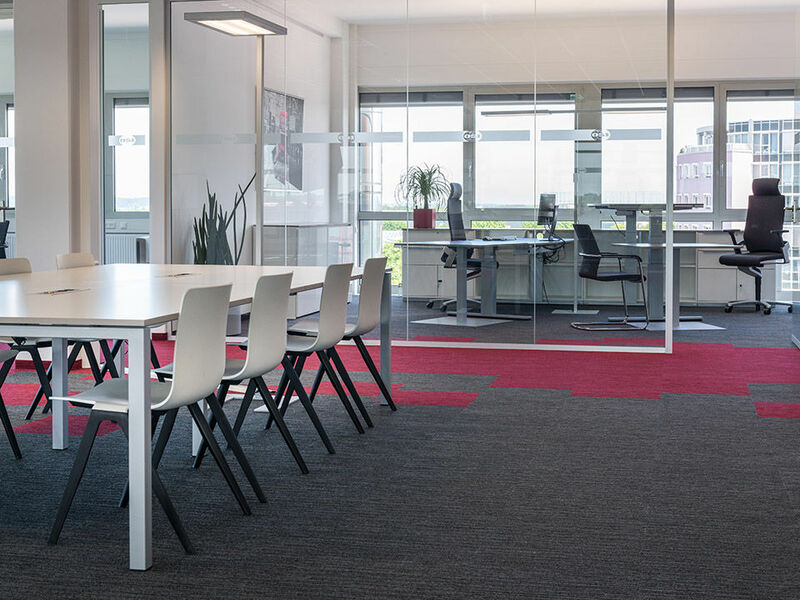 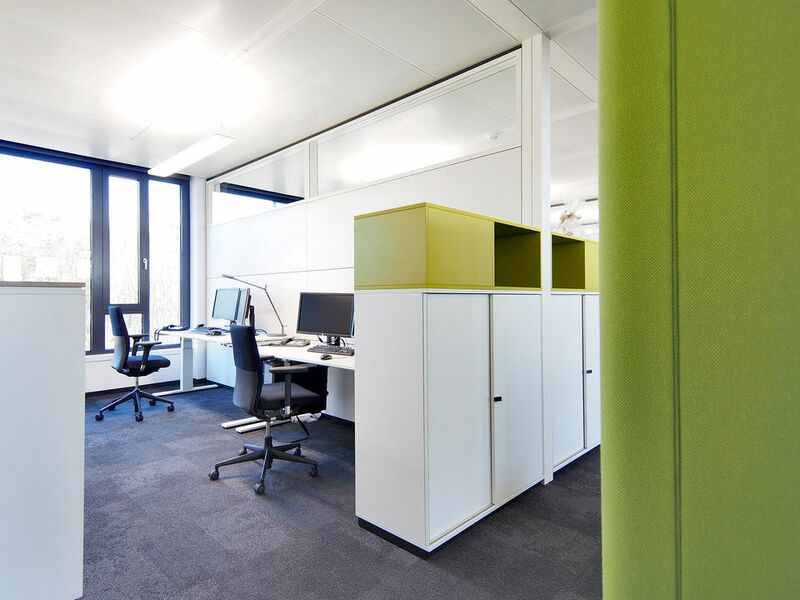 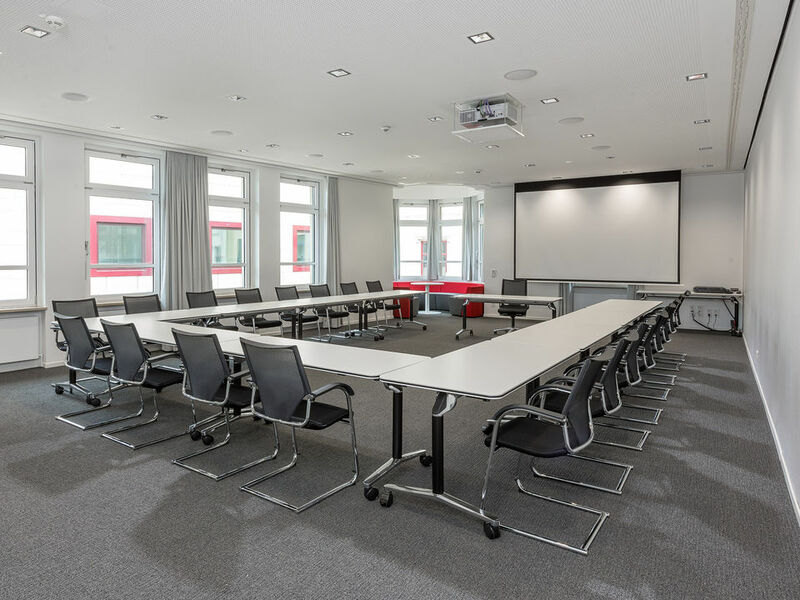 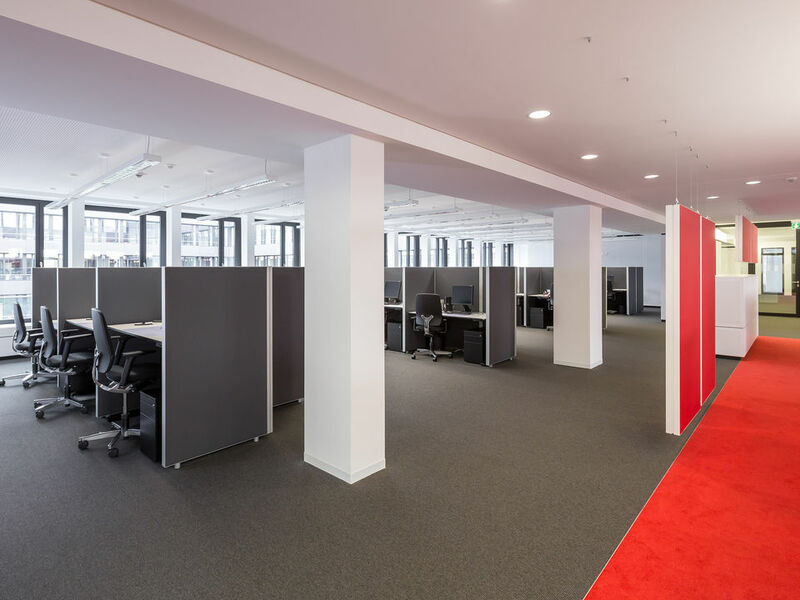 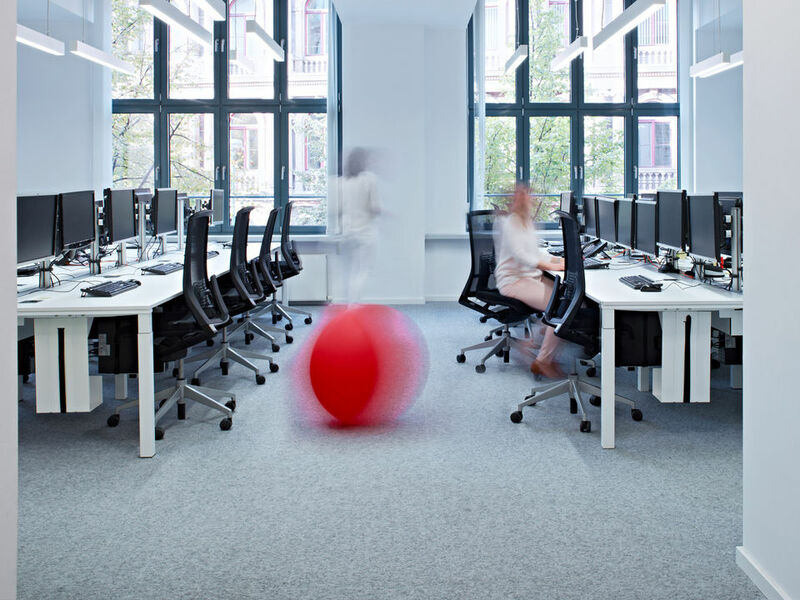 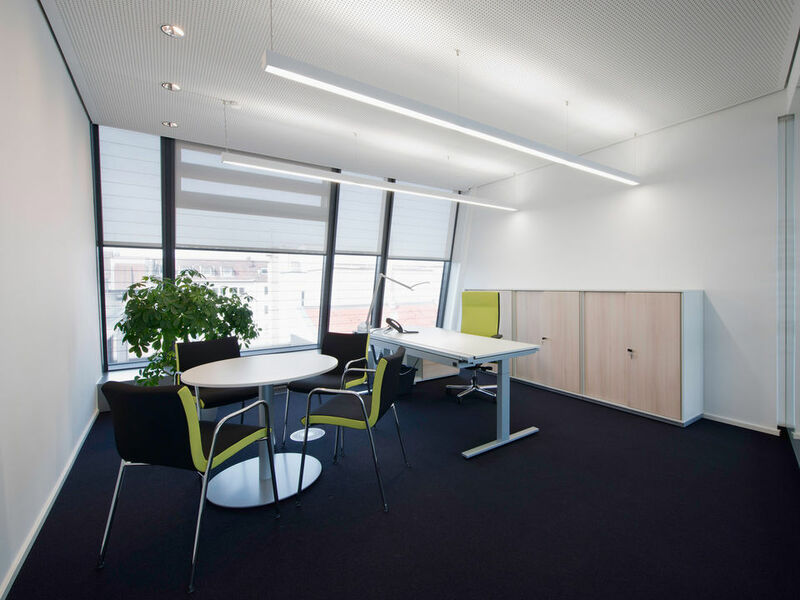 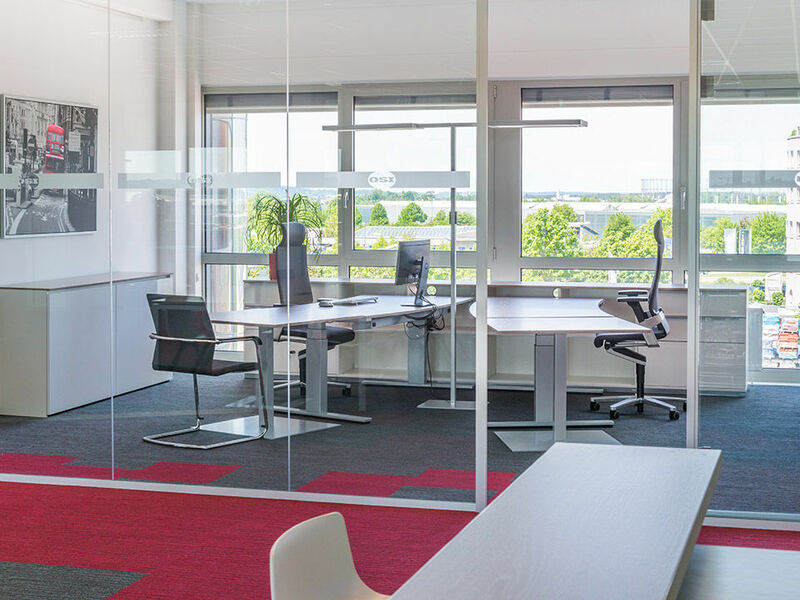 For the Studitemps subsidiary in Cologne a furnishing solution was developed that is now set in contemporary open space structures, uses sophisticated media and equipment integration, and also has acoustic room conditioning for tasks requiring lots of concentration. 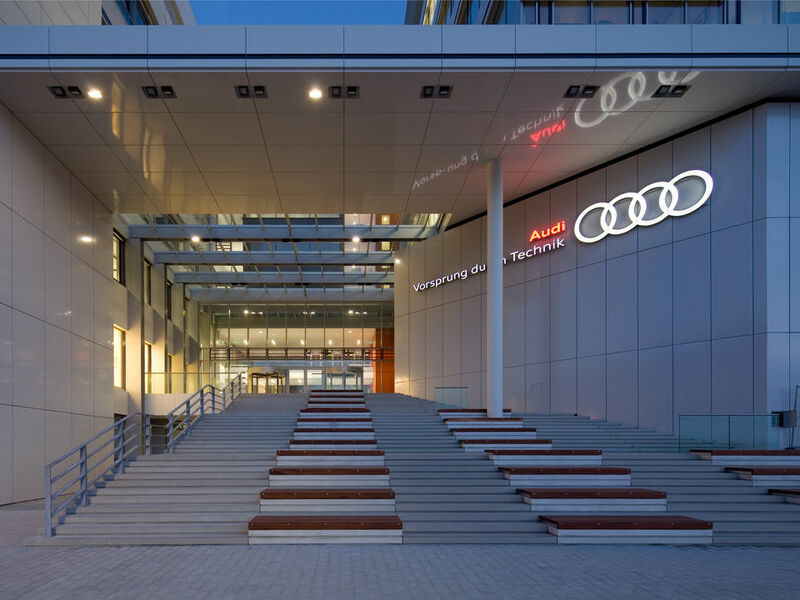 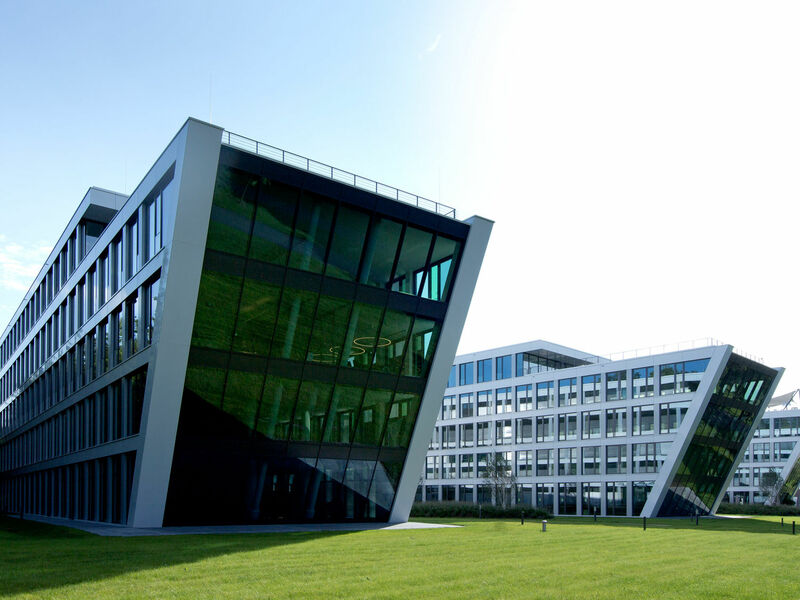 WINI became contractual general partners of AUDI AG at the end of 2009, and since then they have supplied the new interior furnishing for the Audi works in Ingolstadt, Neckarsulm, Brussels and Györ. 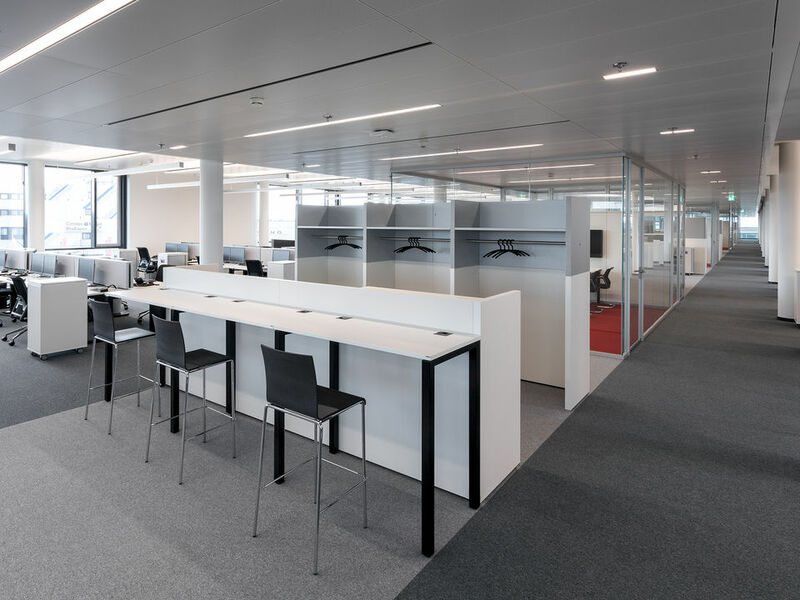 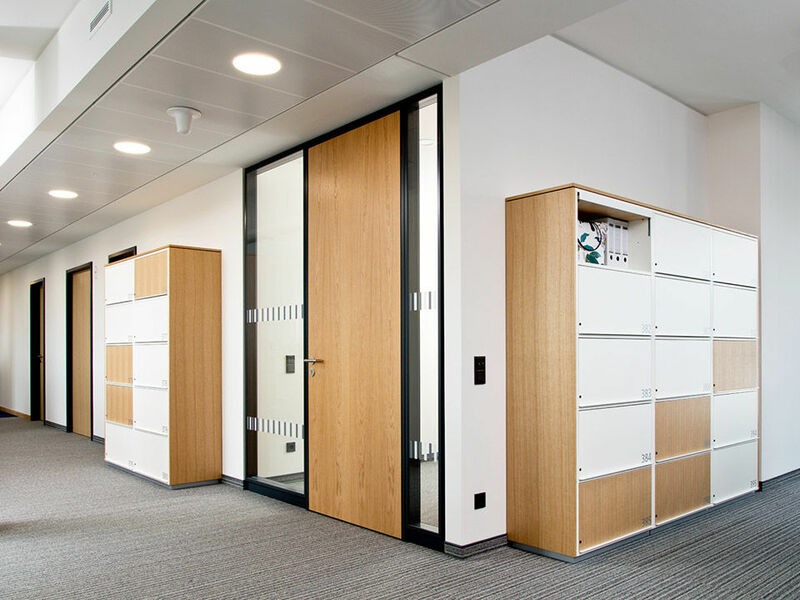 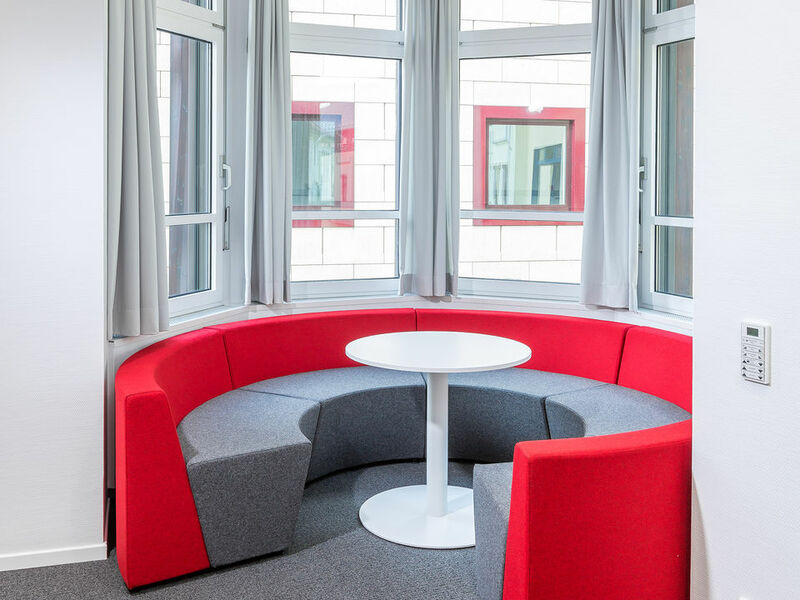 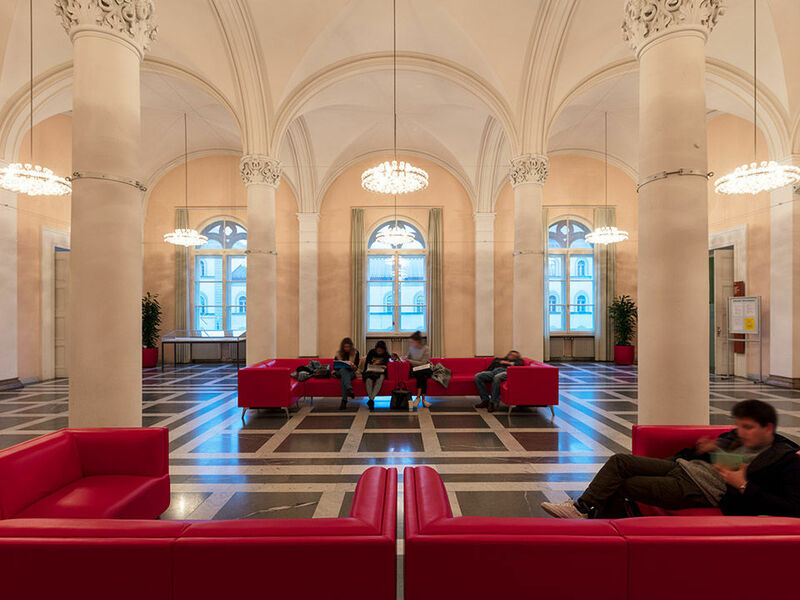 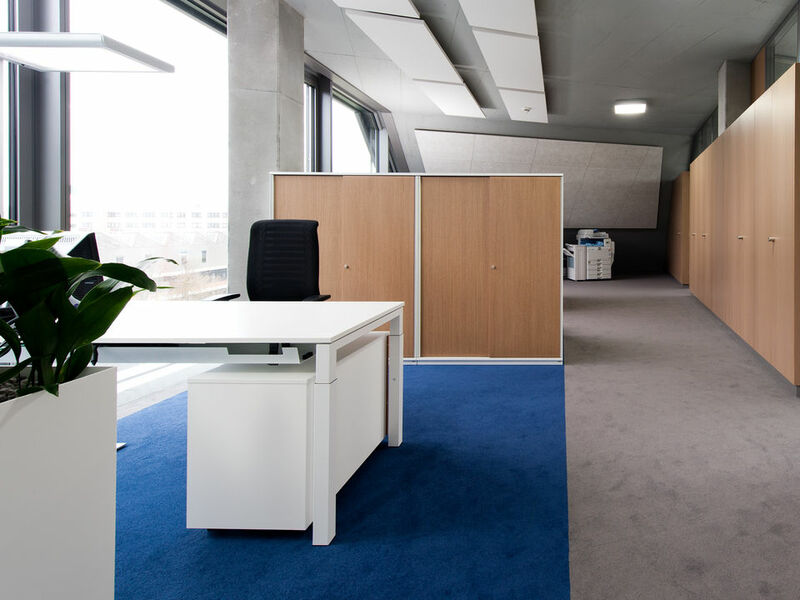 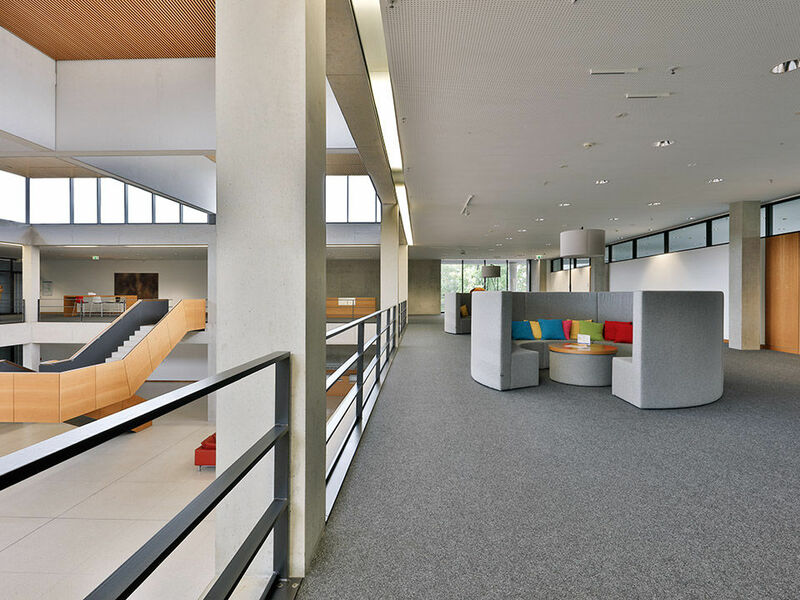 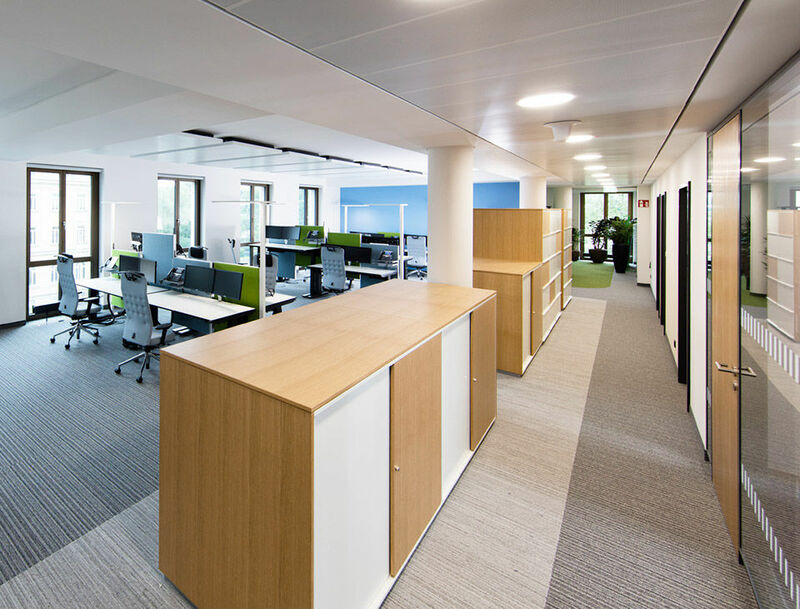 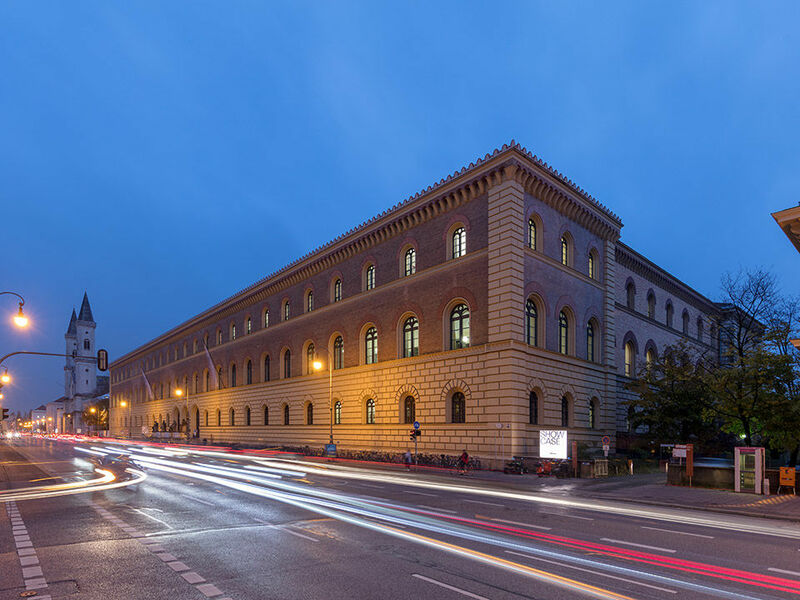 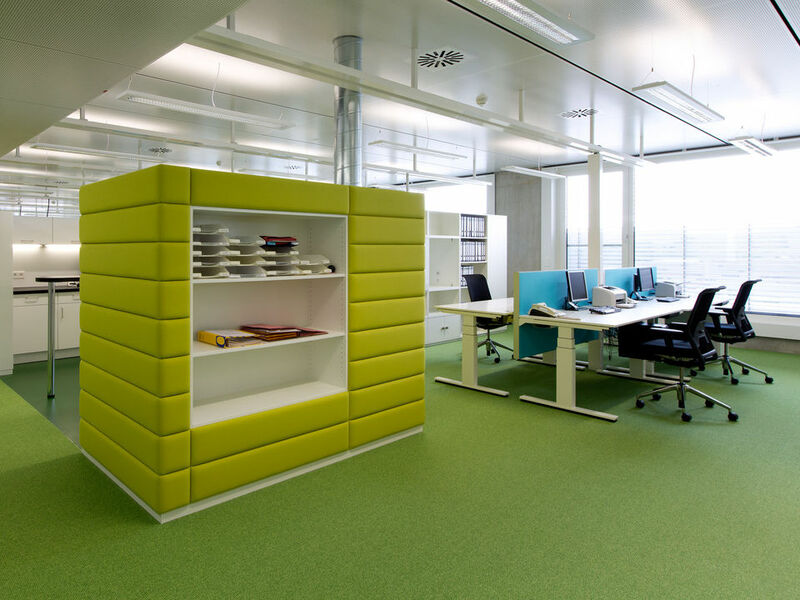 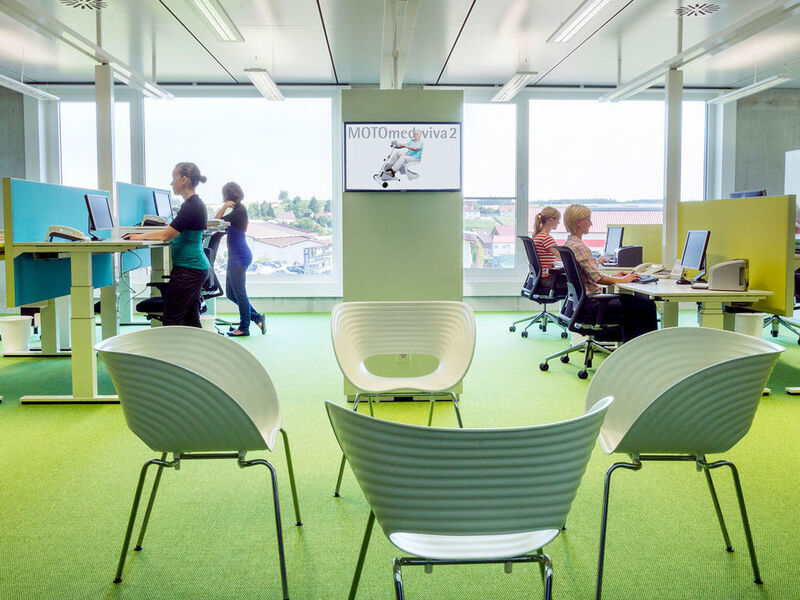 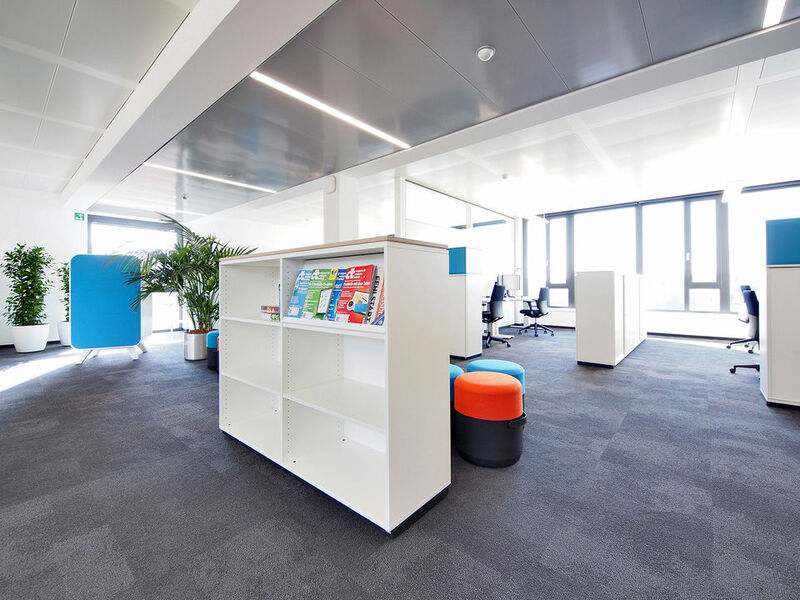 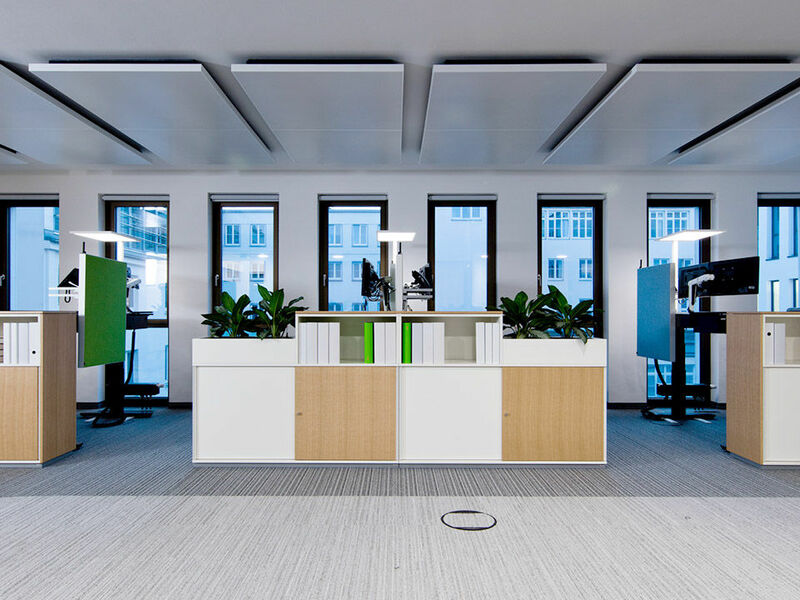 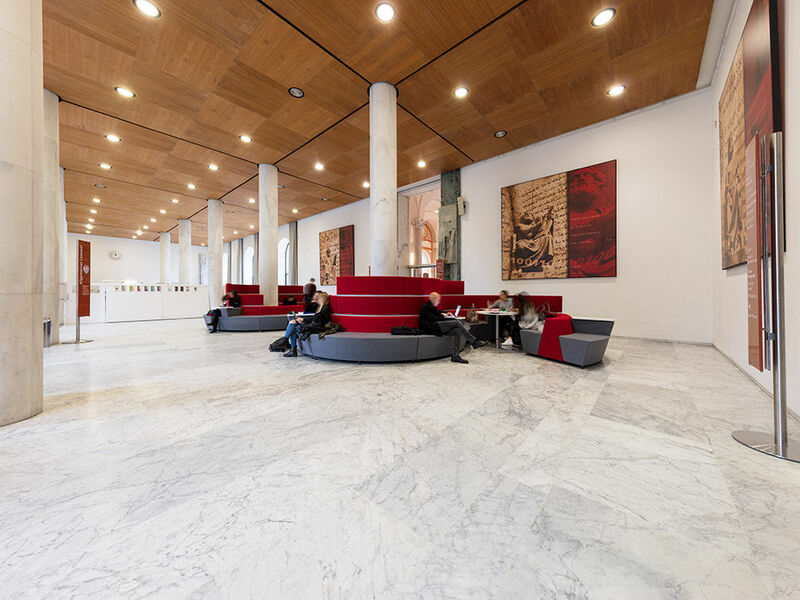 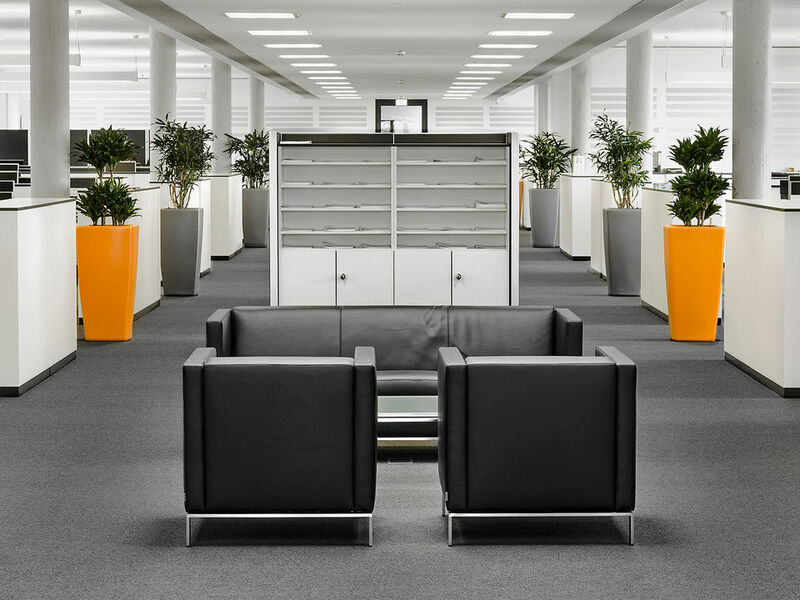 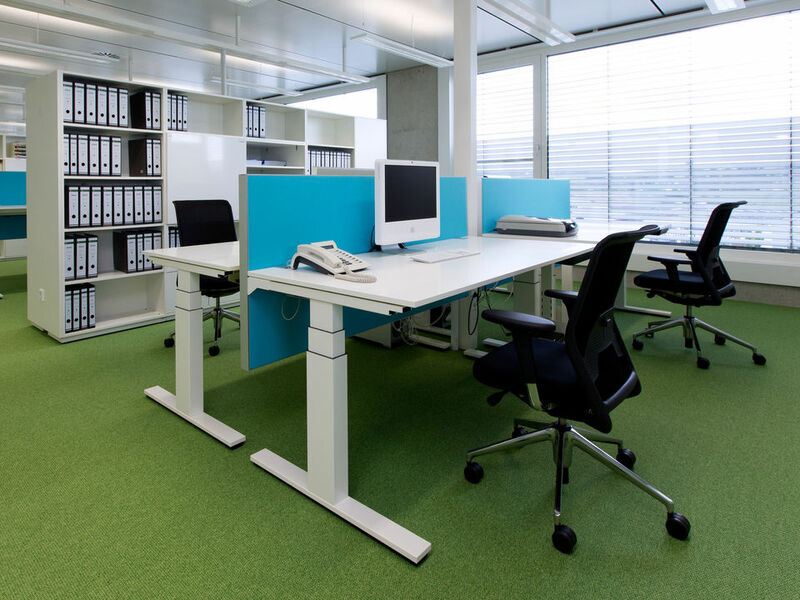 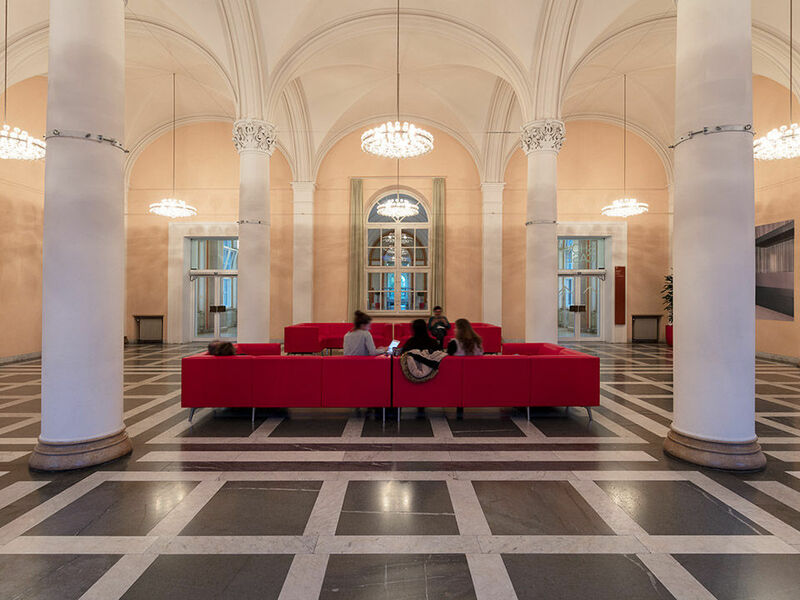 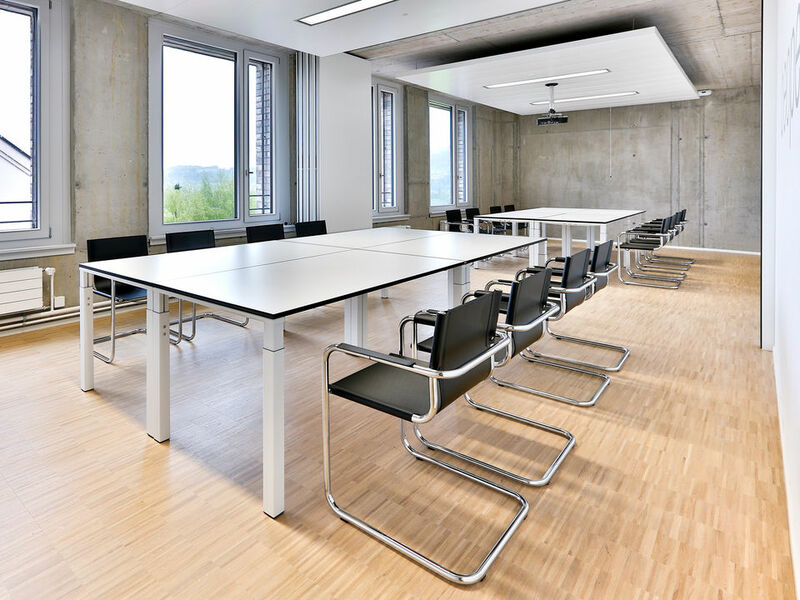 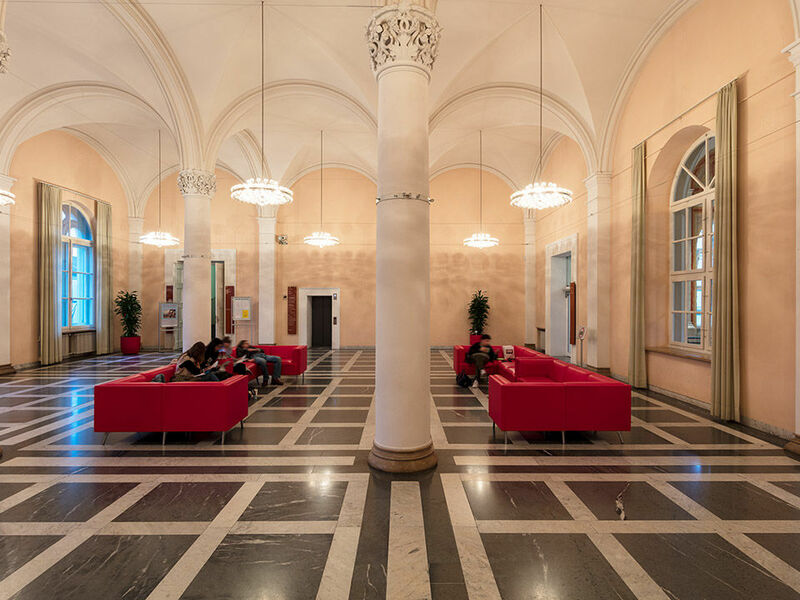 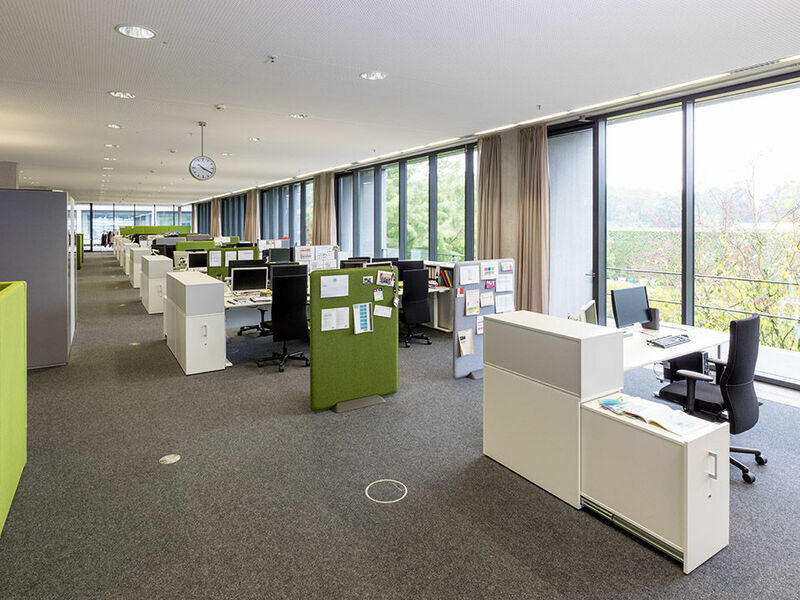 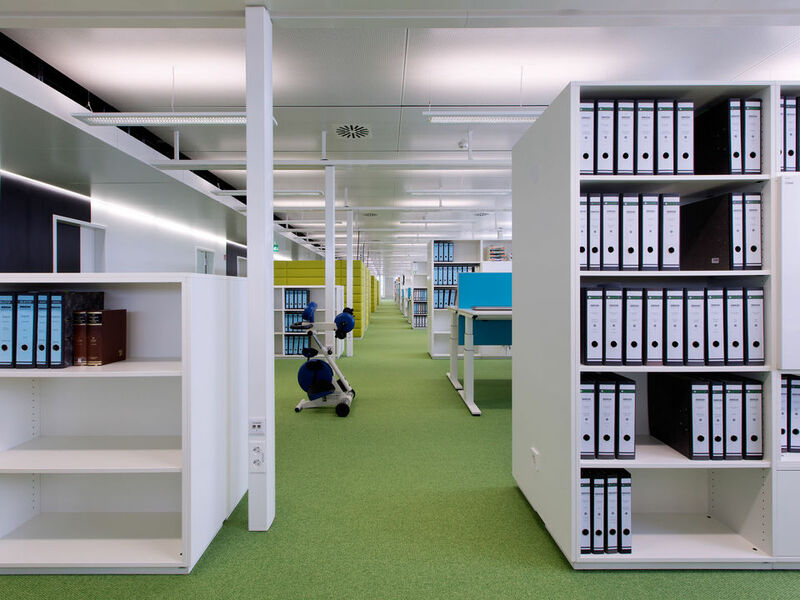 For the Bavarian State Library in Munich WINI designed and delivered not only the standard work desks and library tables for the staff members but supplied modular lounge furniture as well. 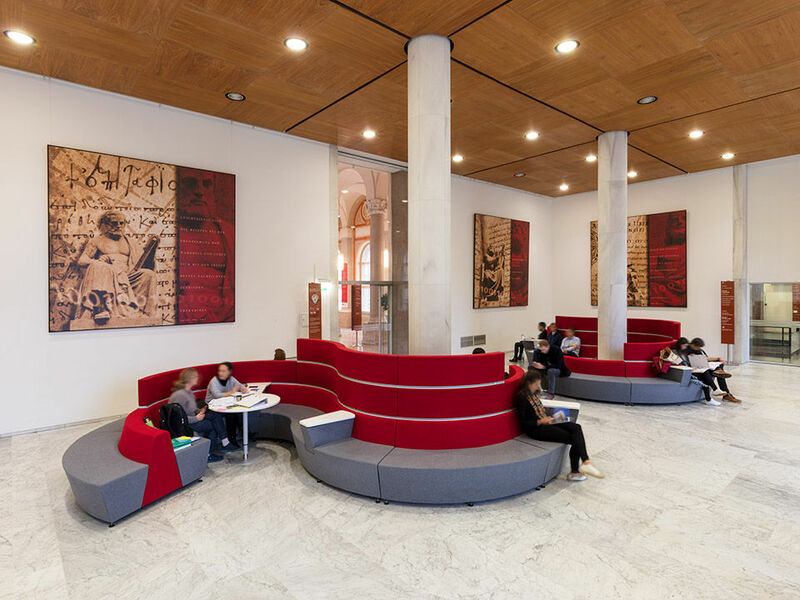 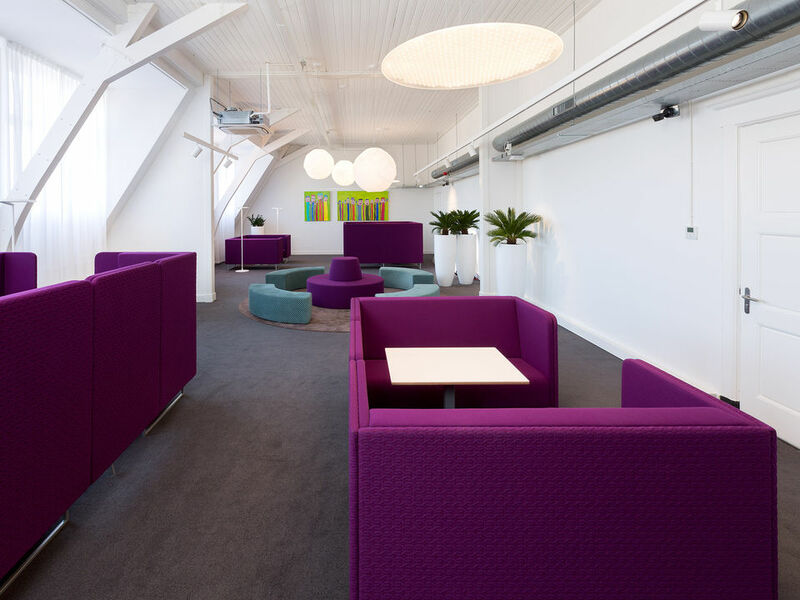 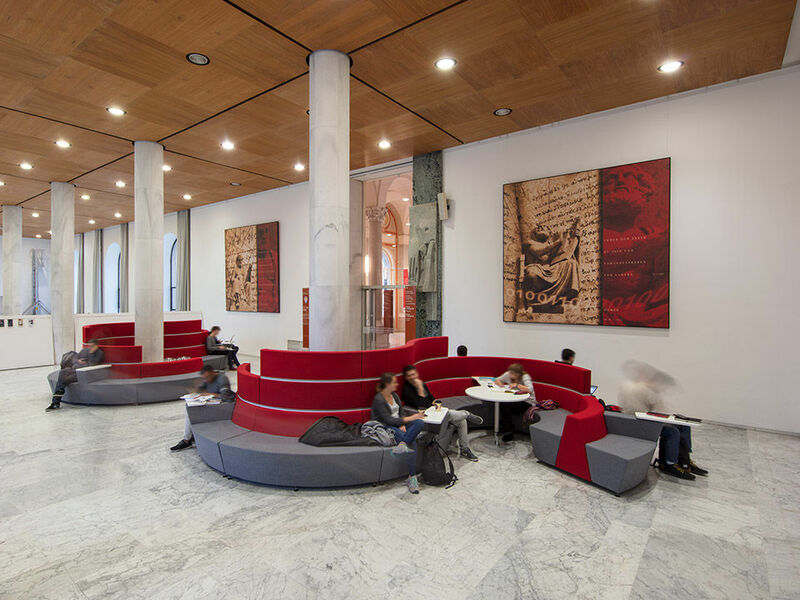 The soft seating modules with their eye catching design and colours were chosen for a deliberate contrast to the neo-classical architecture of the building. 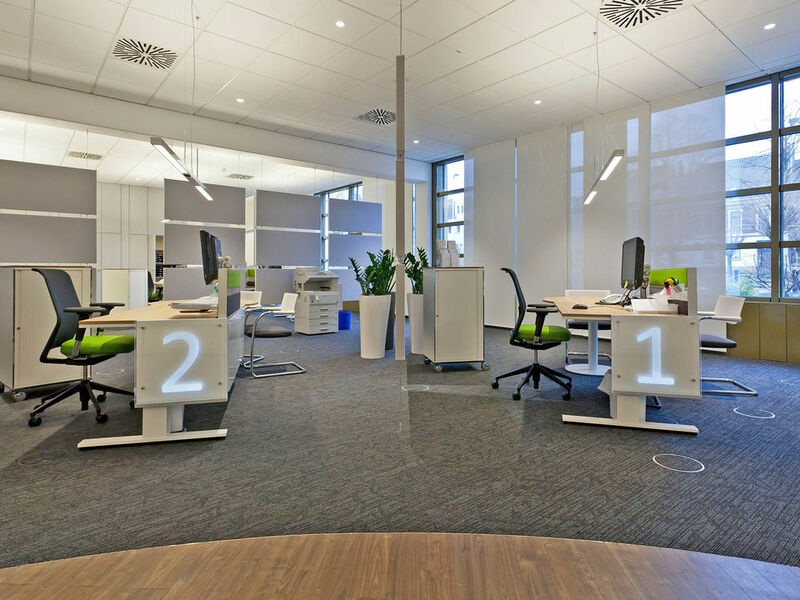 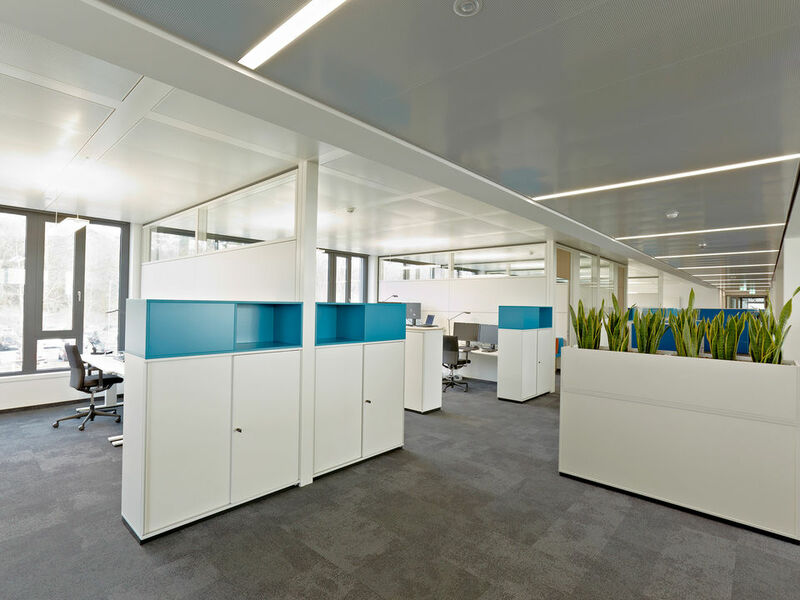 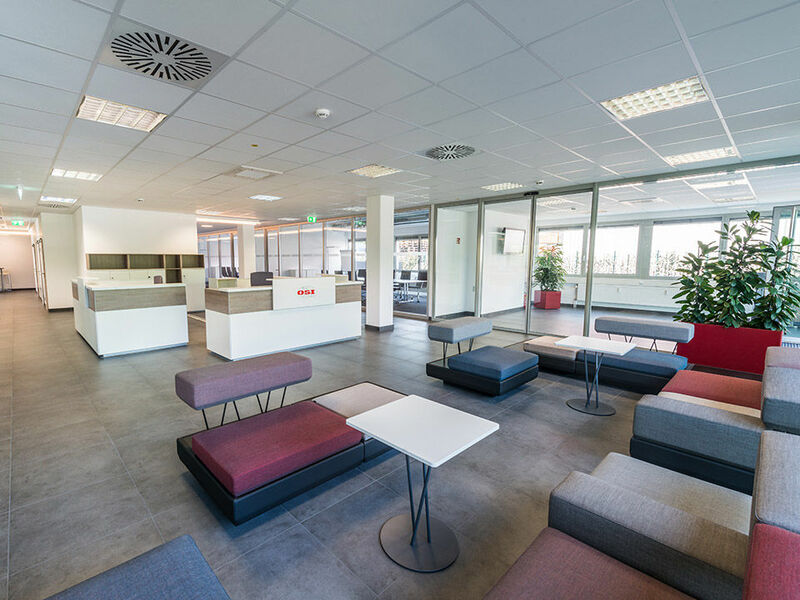 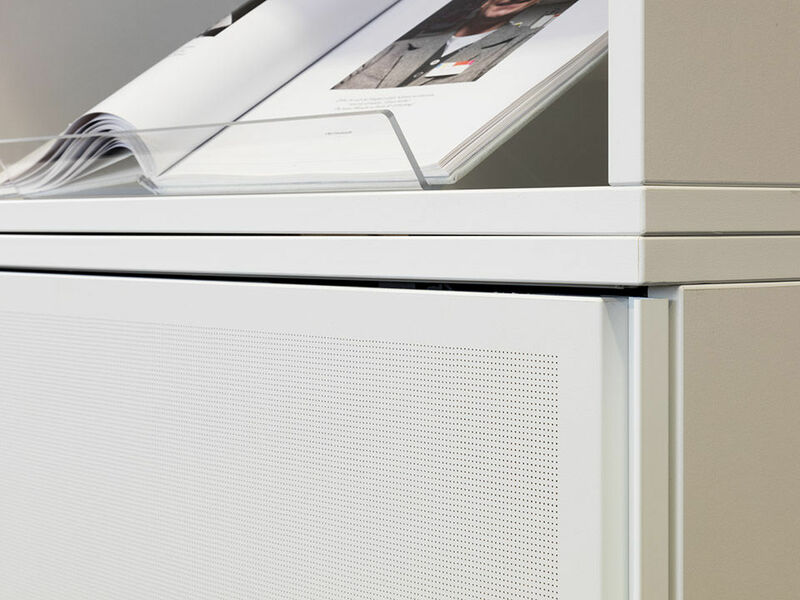 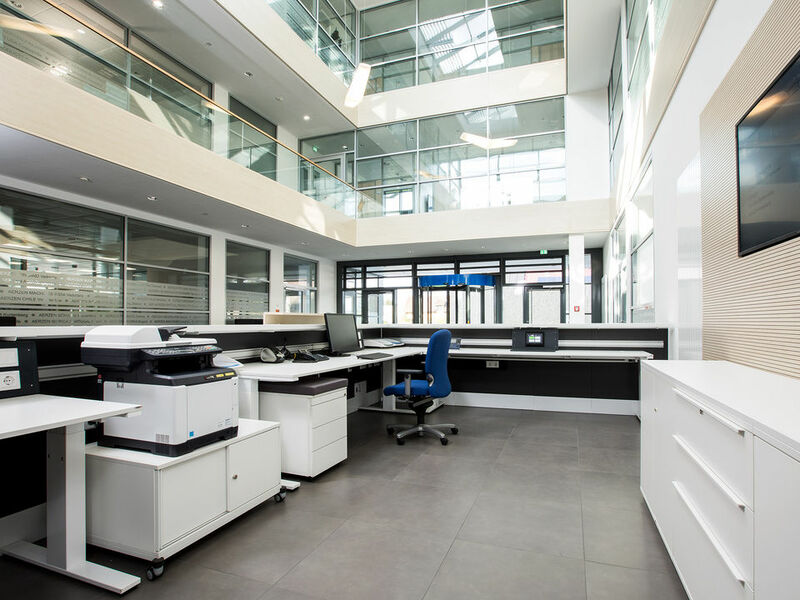 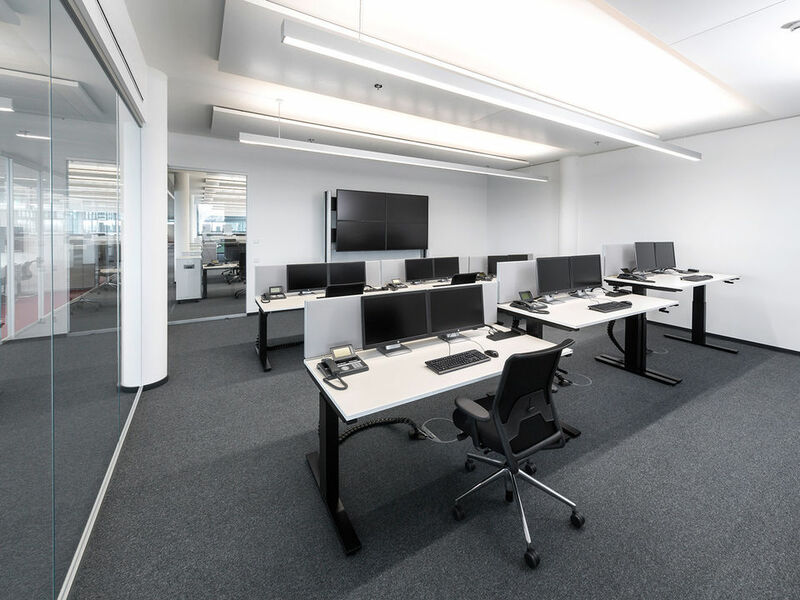 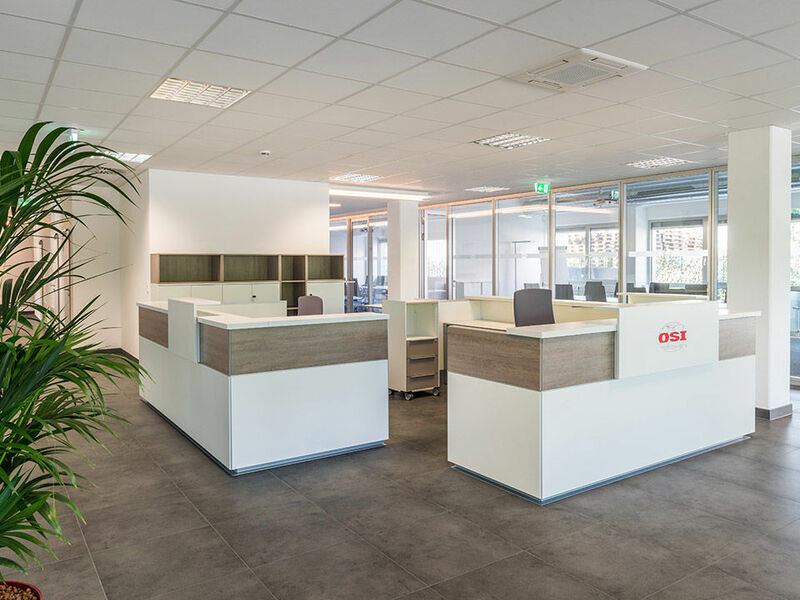 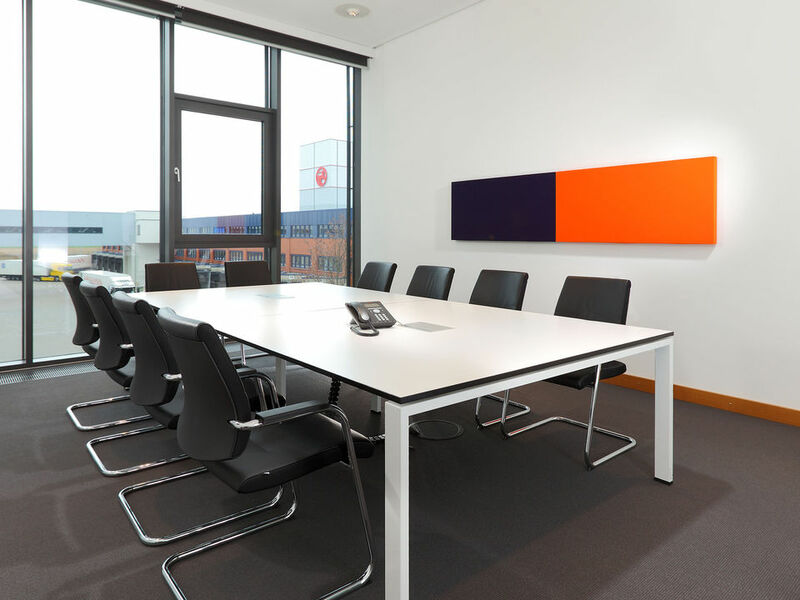 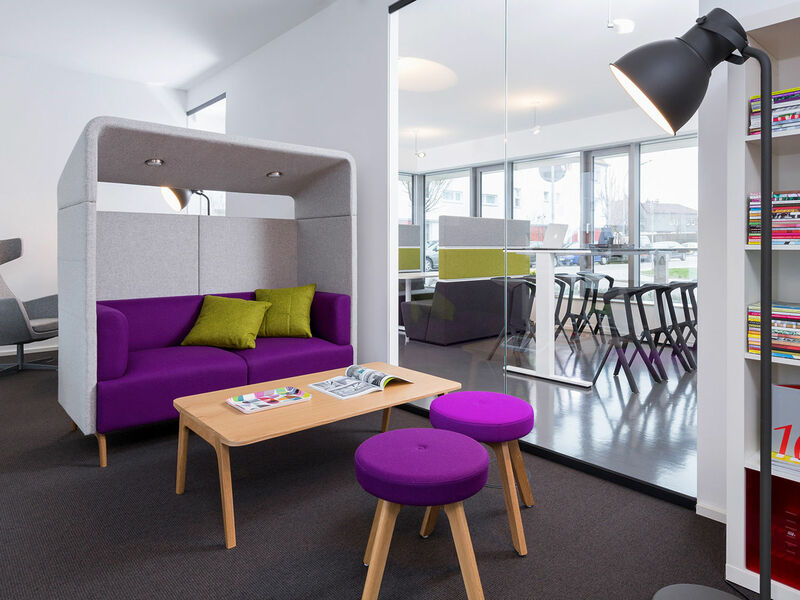 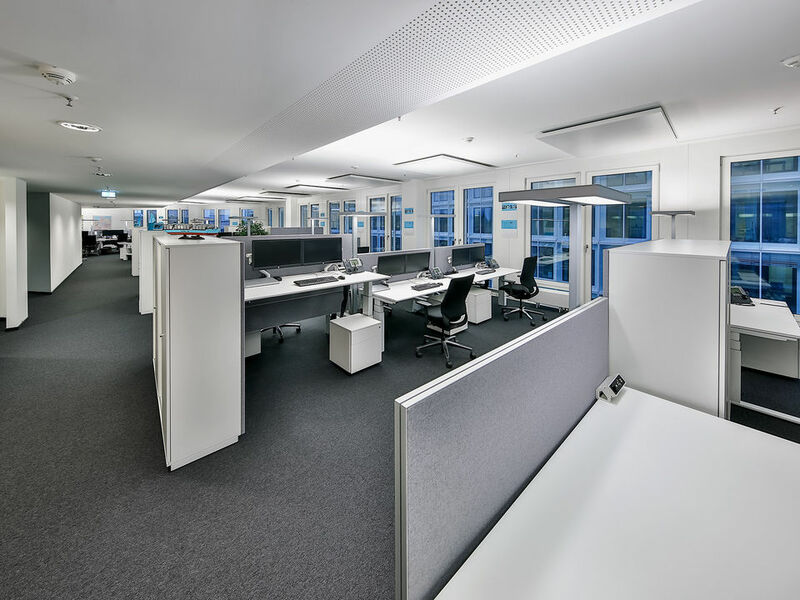 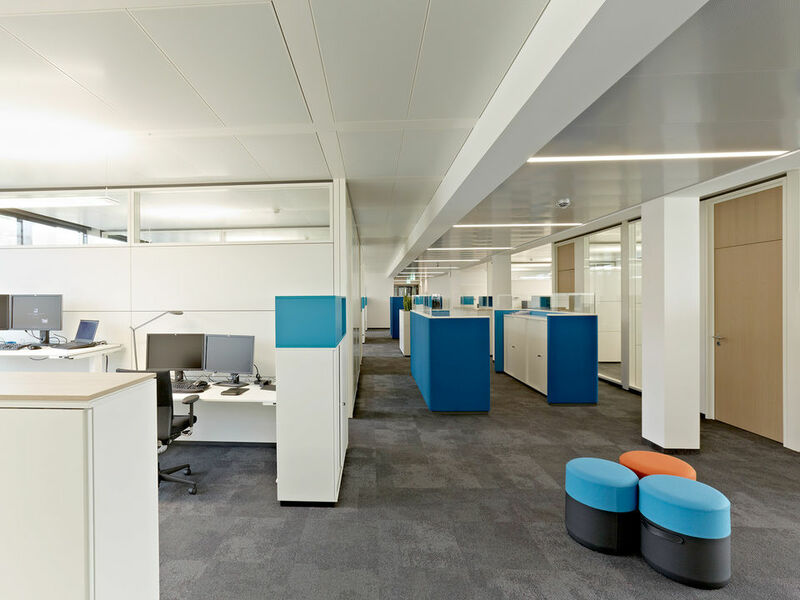 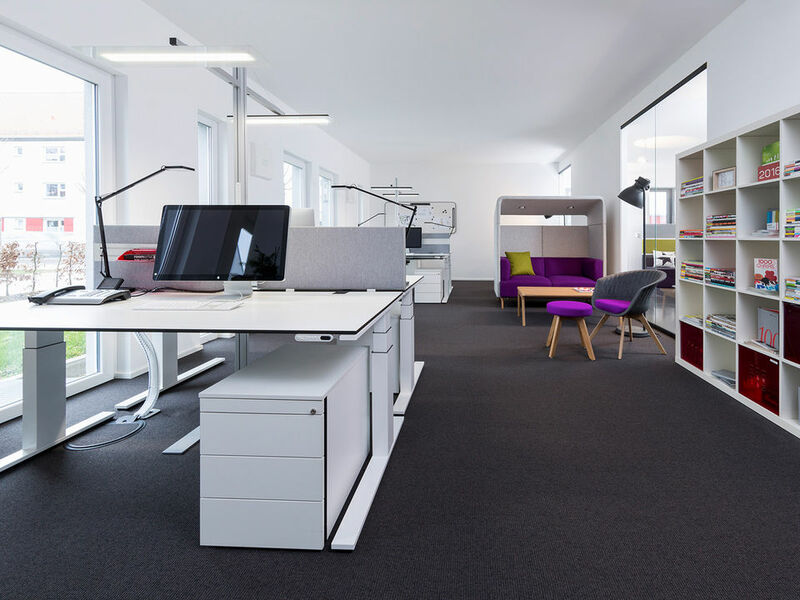 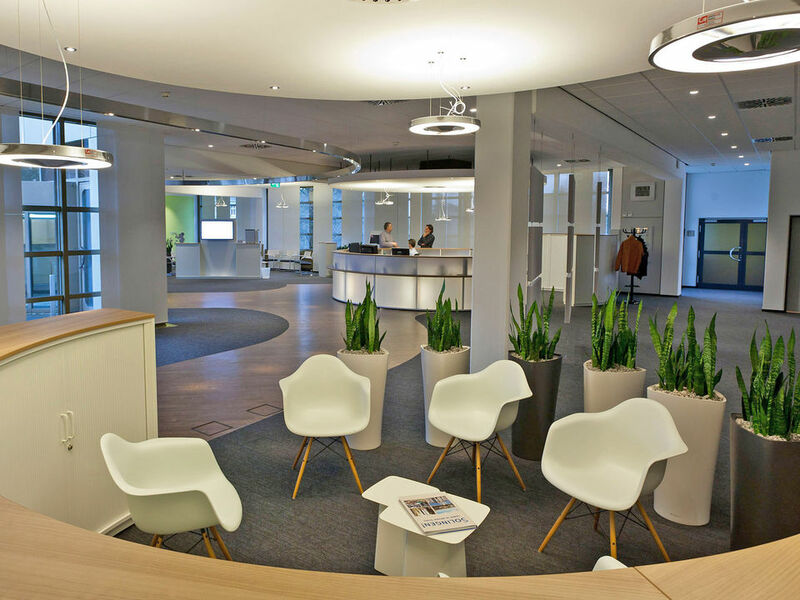 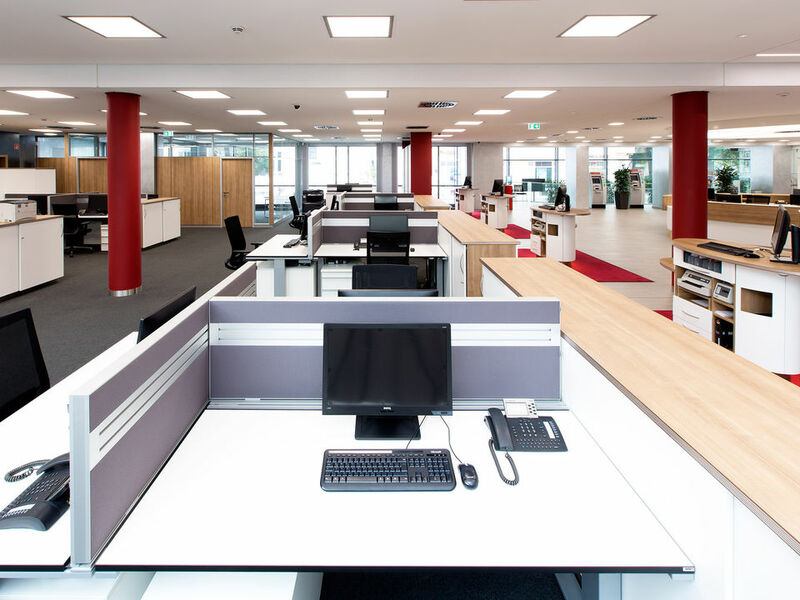 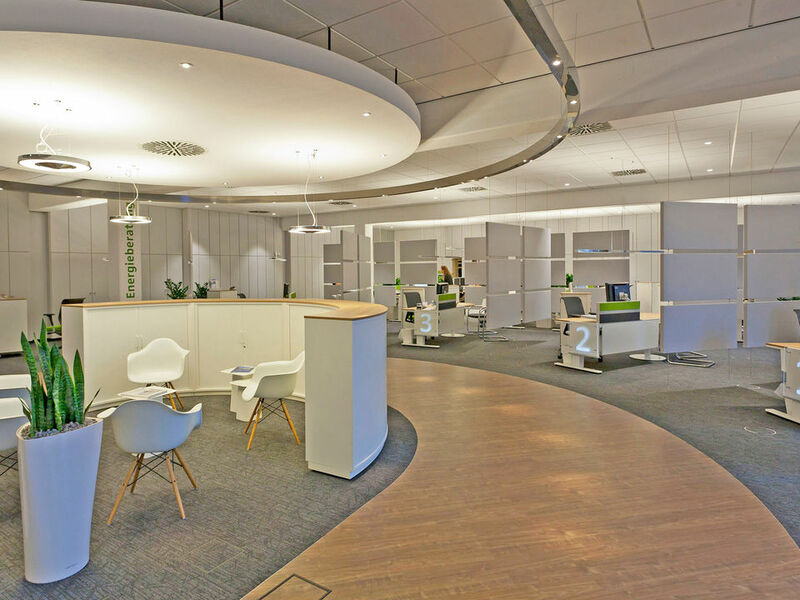 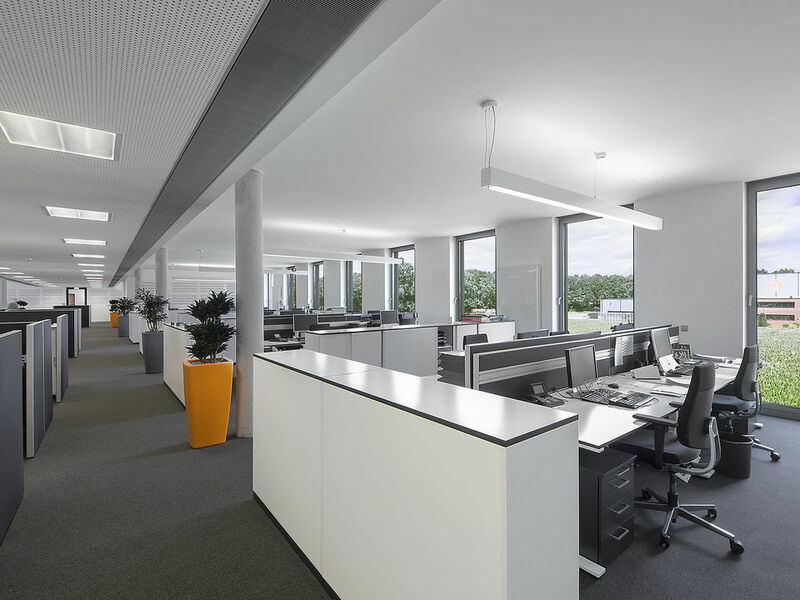 For the automotive supplier Brose in Bamberg, WINI realized an open office concept in the corporate design of the company at the beginning of 2016 according to the specifications of Brose Werksplanung. 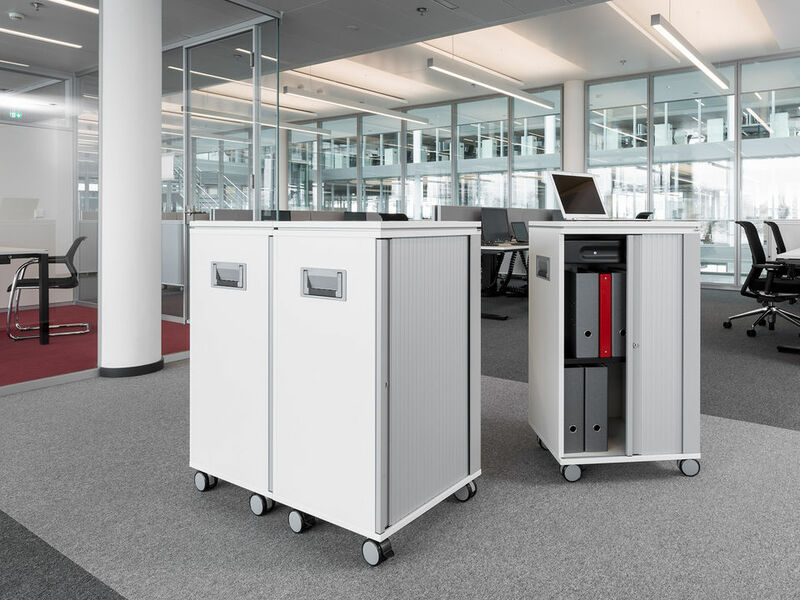 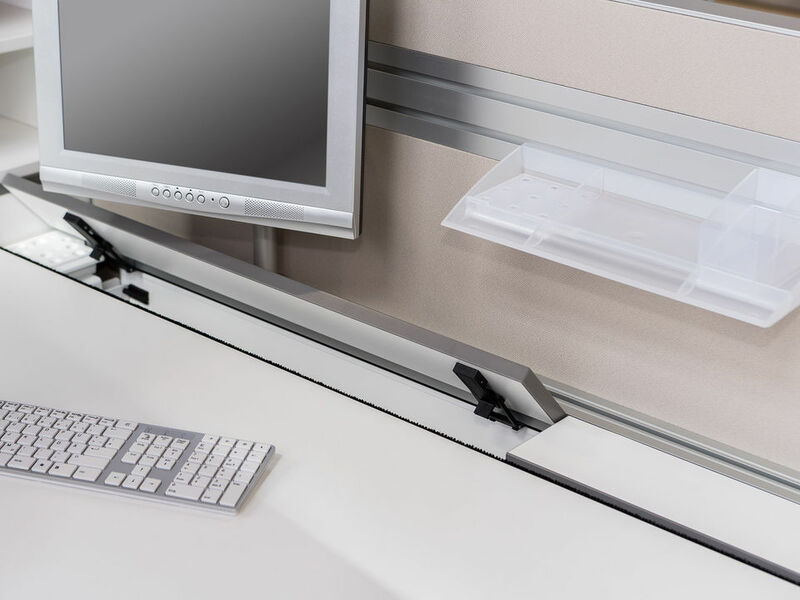 At the customer's request, WINI also developed high-speed standard workstations with quick cranking technology and personal caddies in special design. 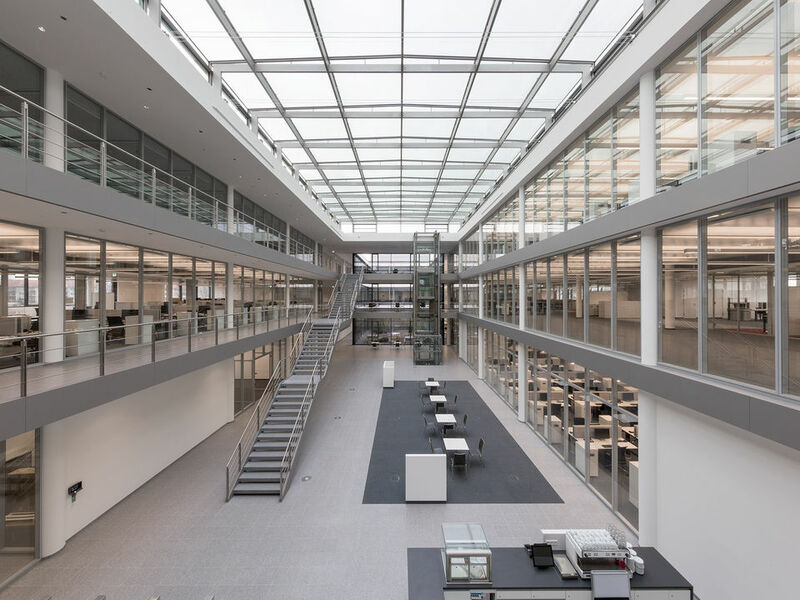 The striking Chipperfield building of the Ernsting’s Headquarters was modernised and refurbished in 2016. 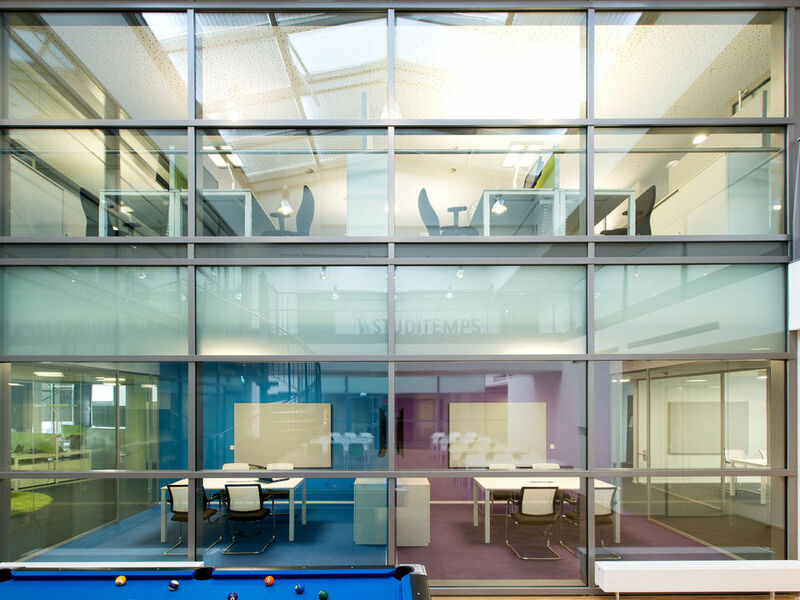 For the nearly 400 employees a friendly, light-flooded working environment with subdued colours was created, the main part being spacious Open Plan areas with benches for 2 or 4 users combined with team offices, a few cellular offices, various conference and meeting rooms, a central cafeteria and a so-called “Creativity Room”. 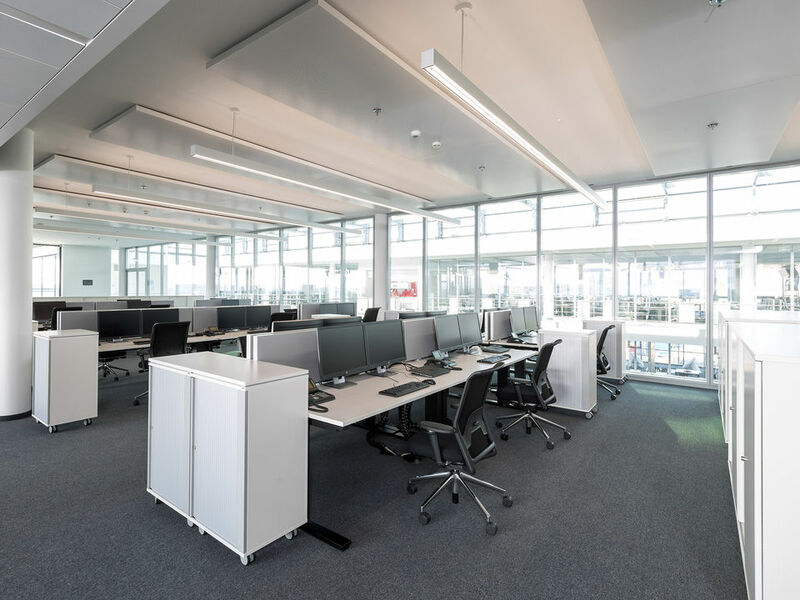 According to the facilities plans of Office Group Munich WINI furnished the new offices of the German head office of the Danish MEARSK LINE, the worldwide largest container ship shipping company, in the Hamburg Ericus co. gate at the end of 2015. 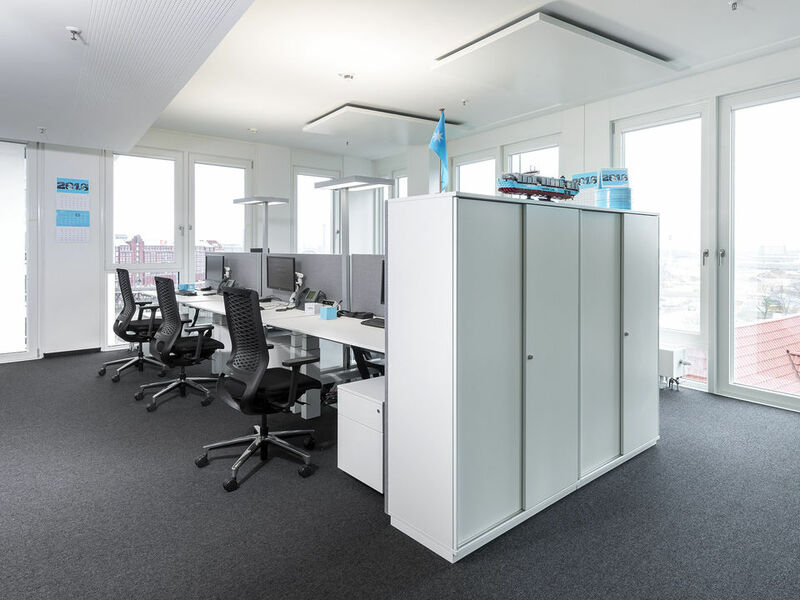 Today the MAERSK employees work on 2.5 floors (approx. 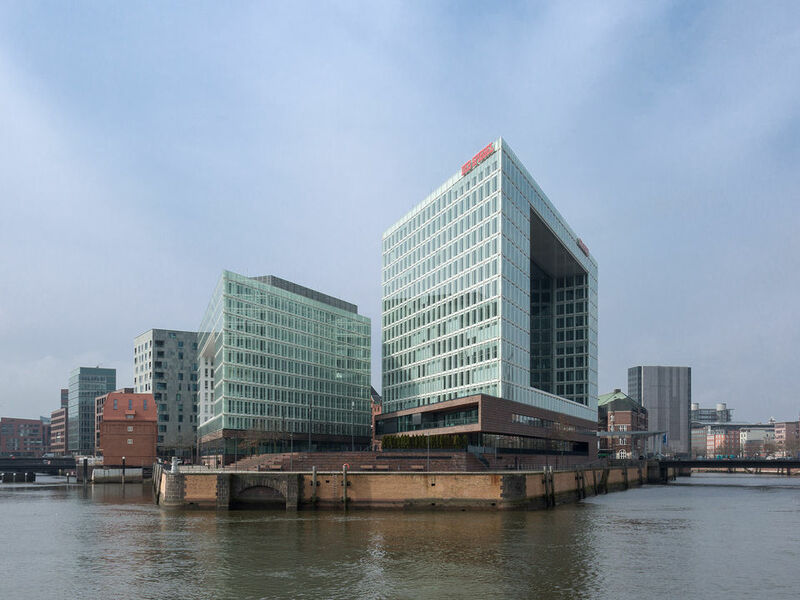 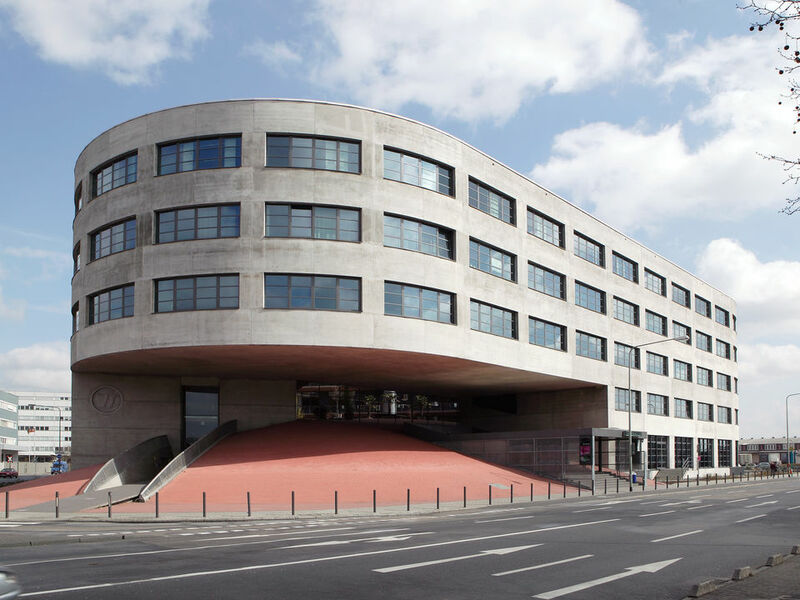 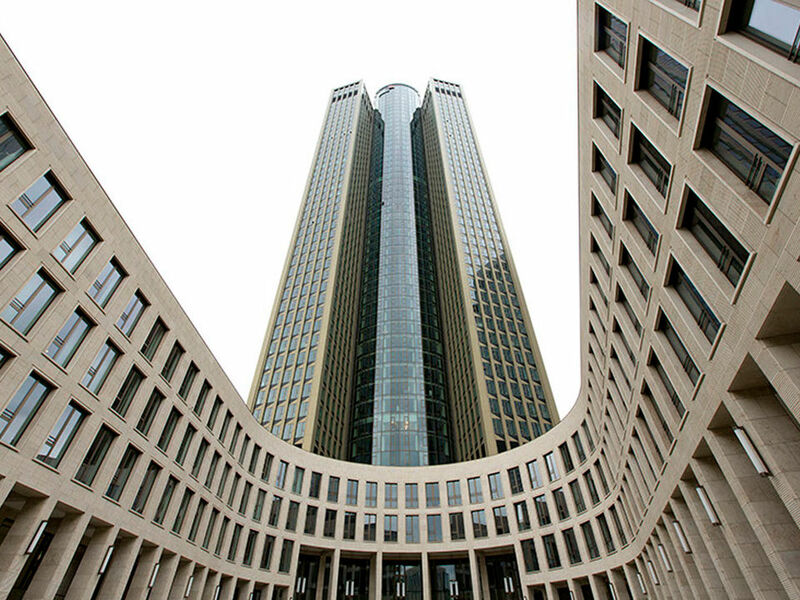 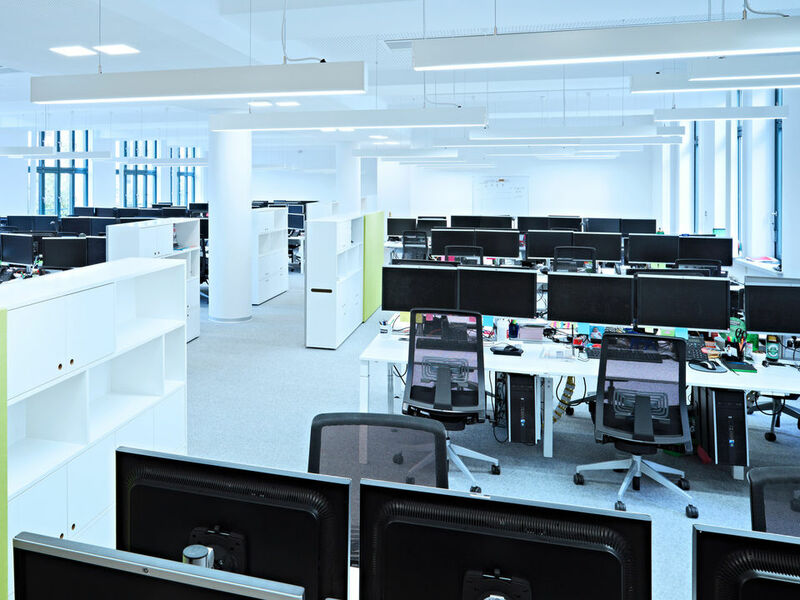 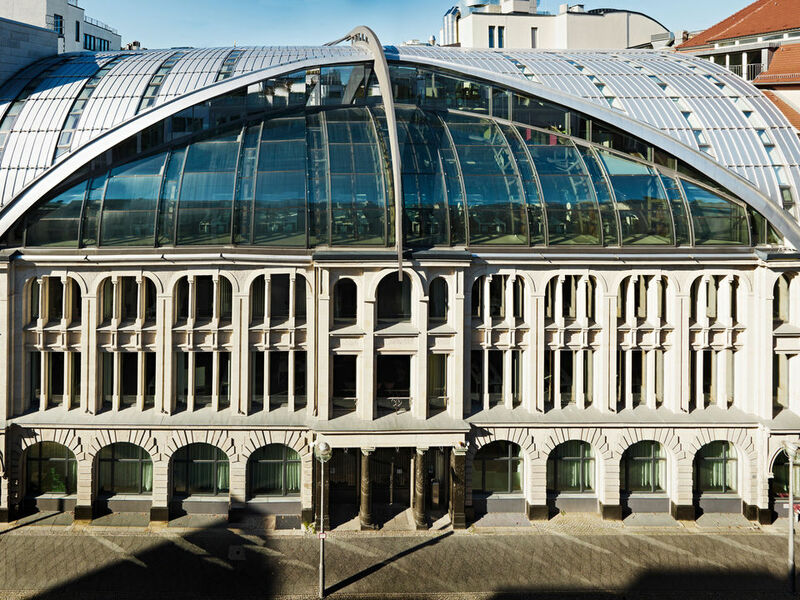 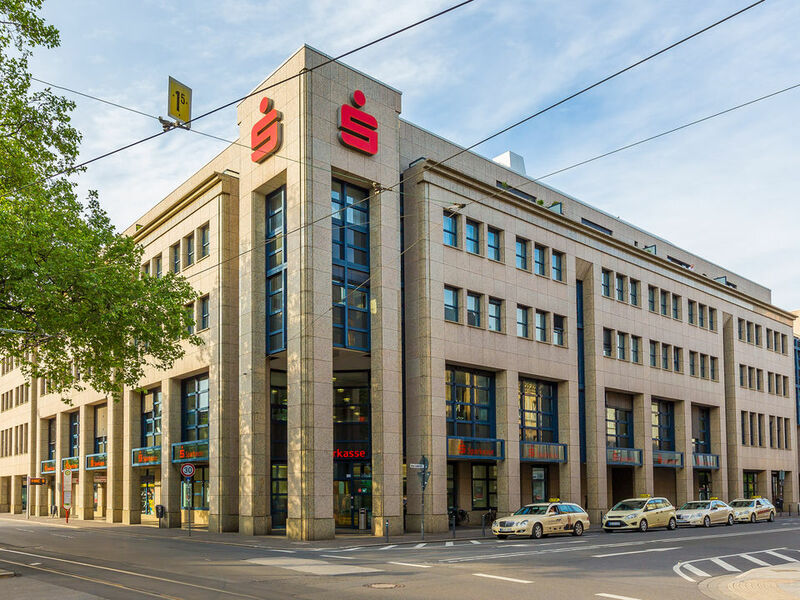 4,000 sqm) of the prominent building in the Hamburg port city in an open office landscape with ergonomically and acoustically optimized workstations. 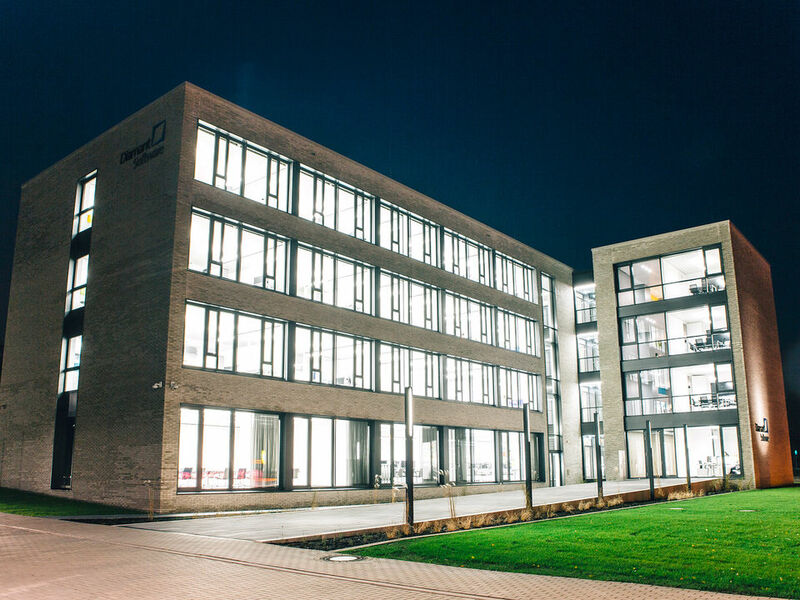 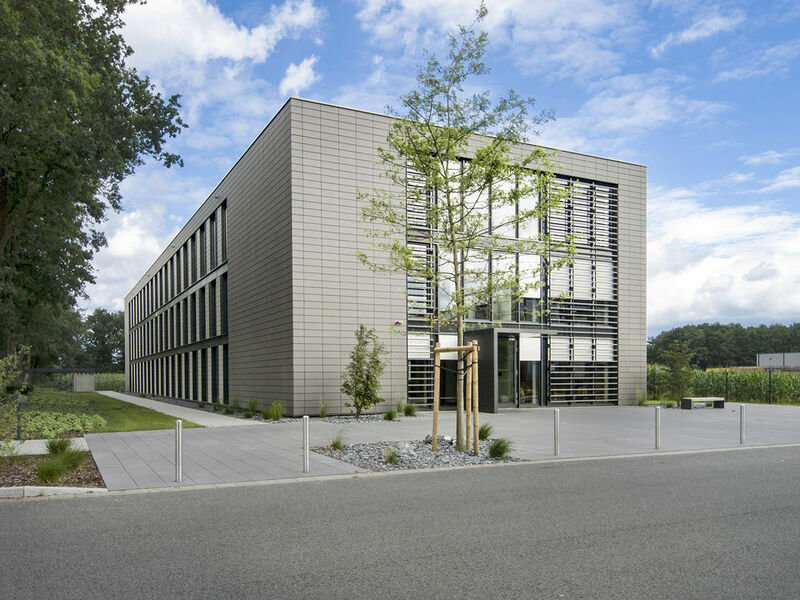 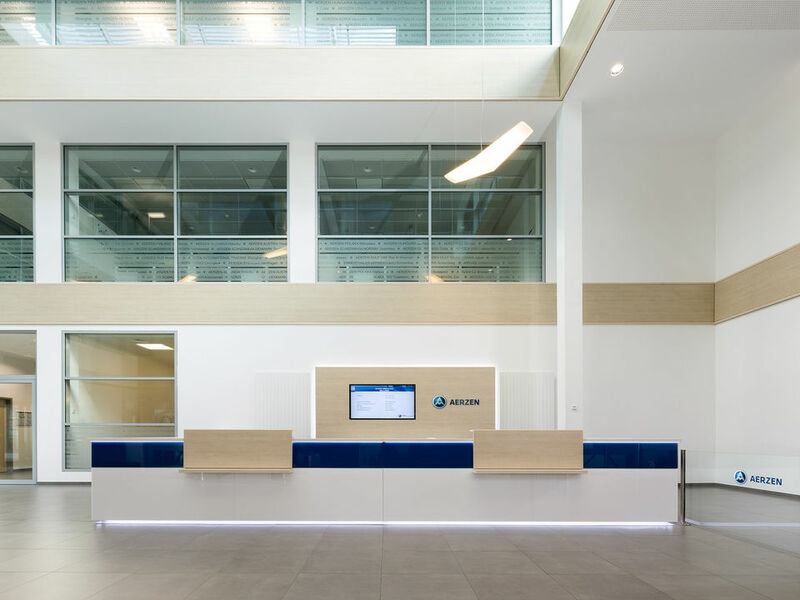 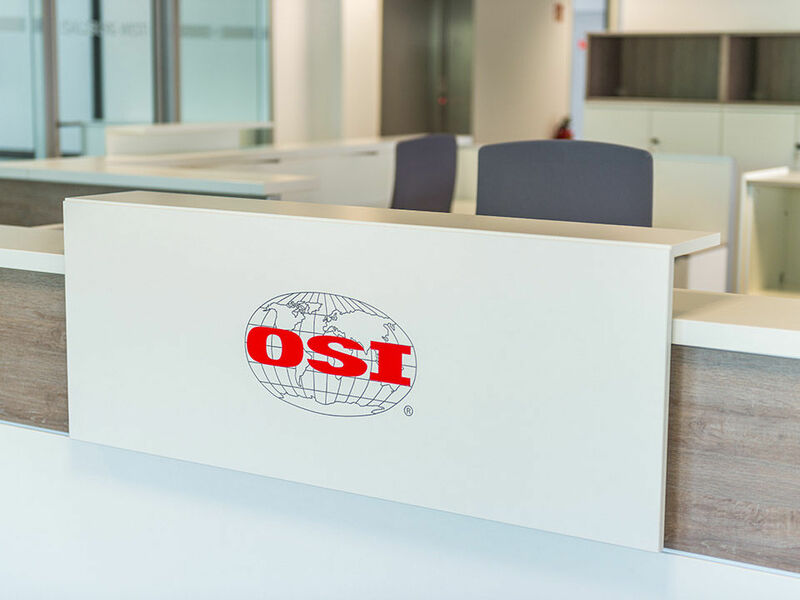 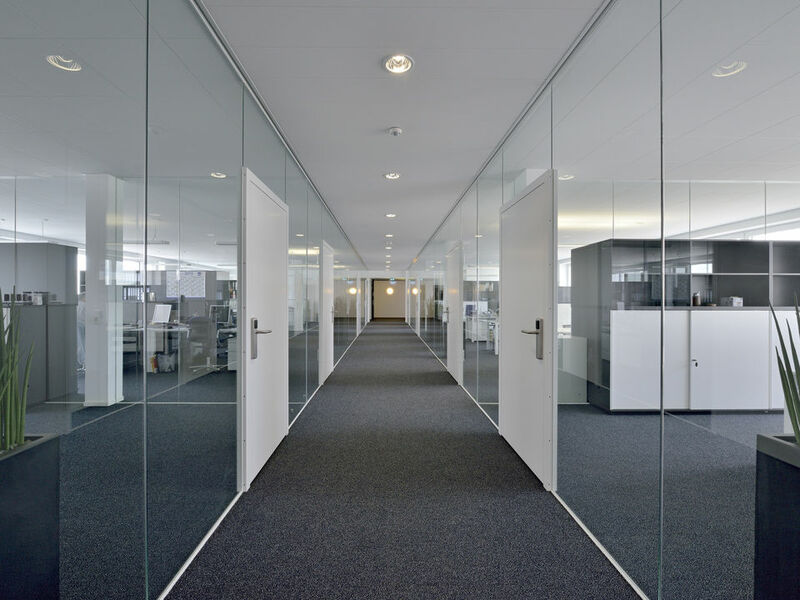 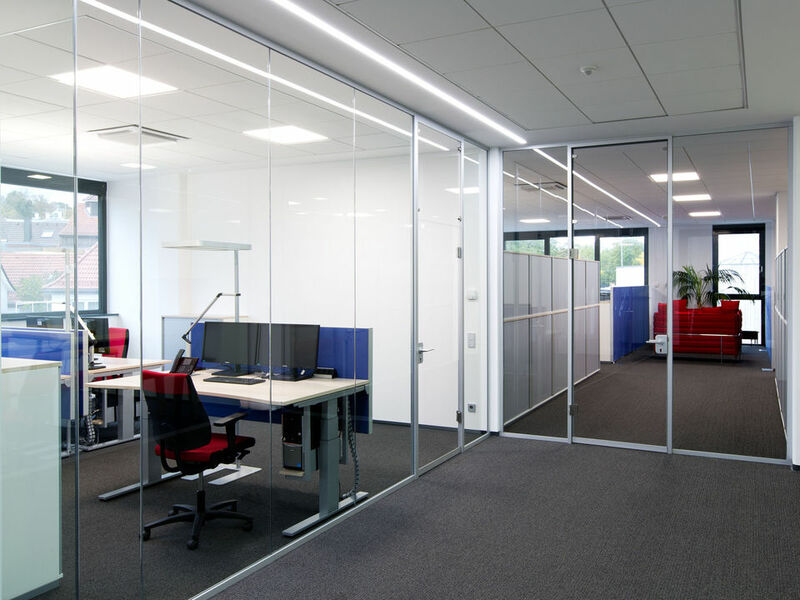 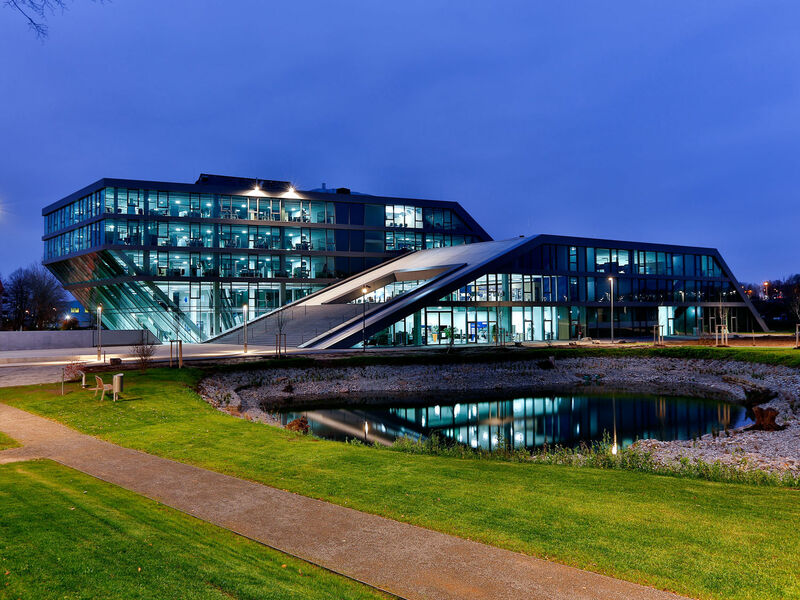 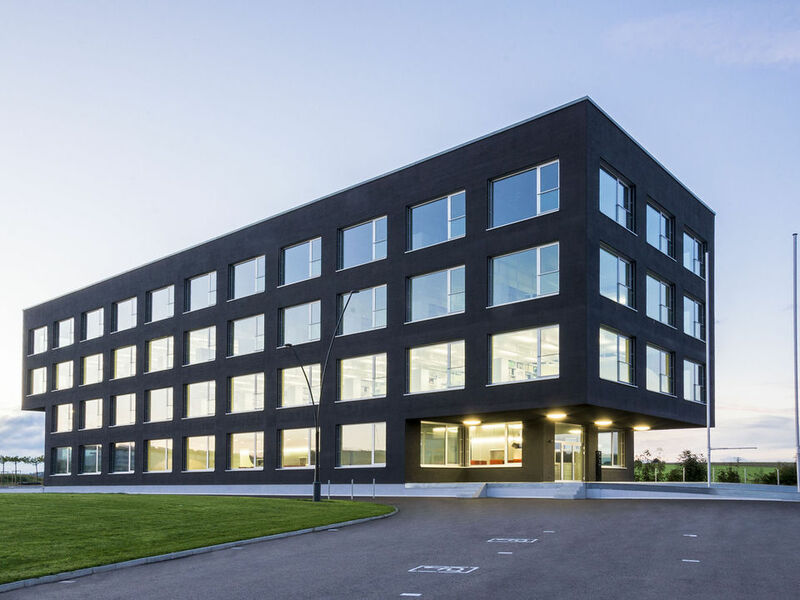 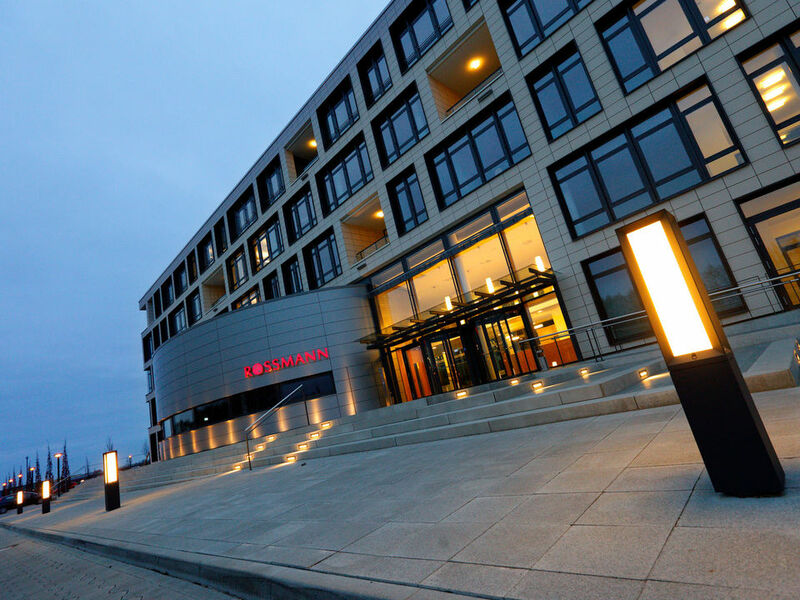 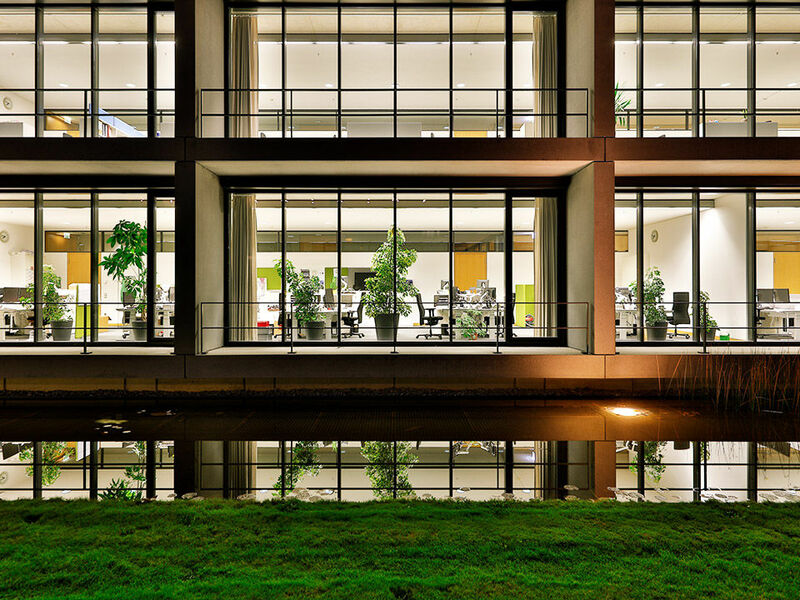 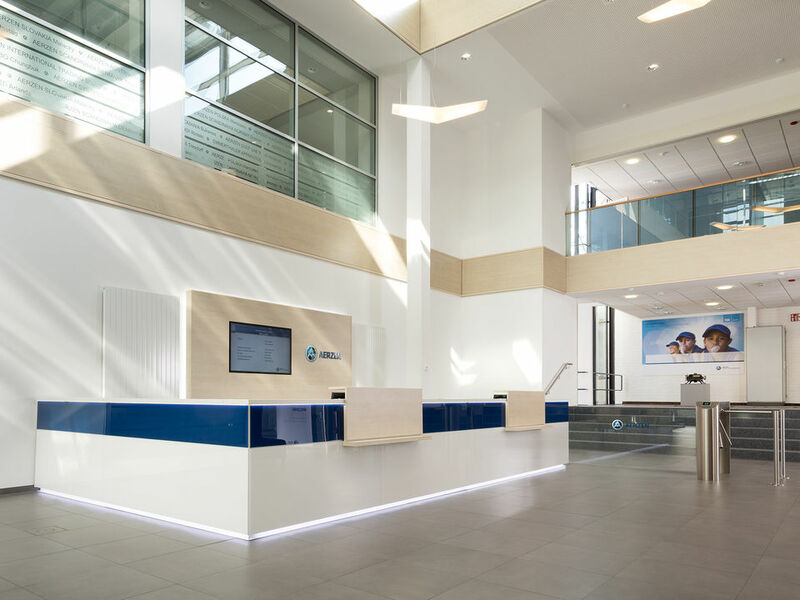 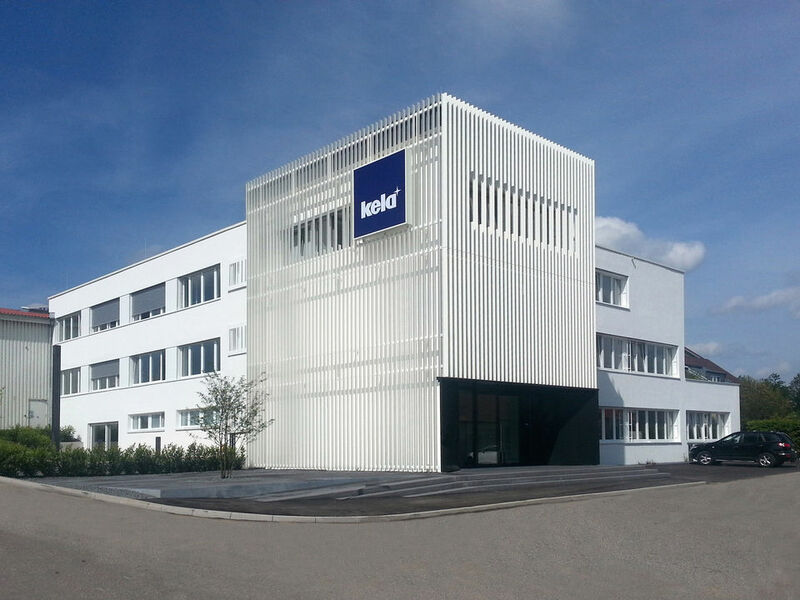 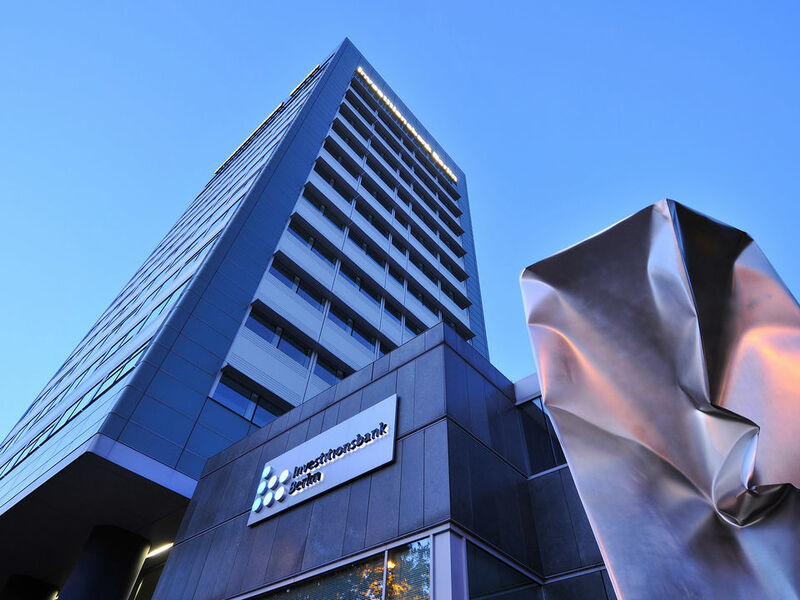 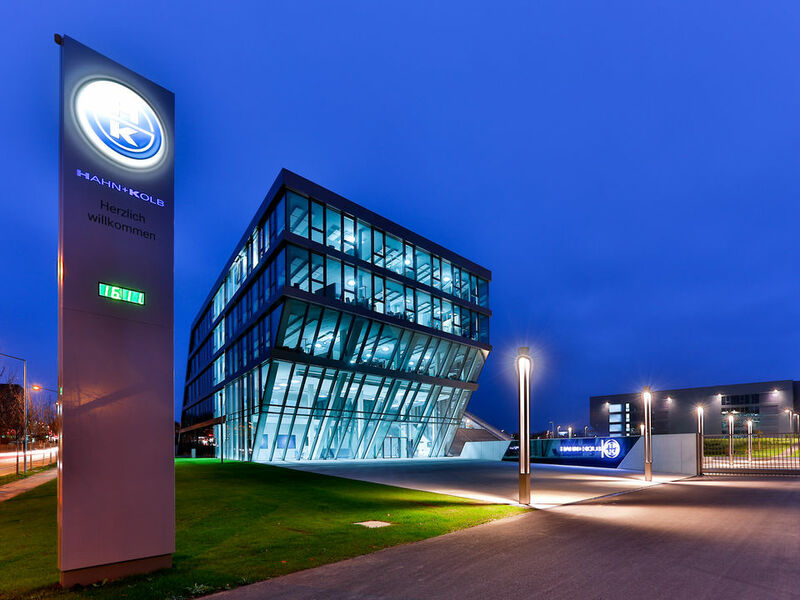 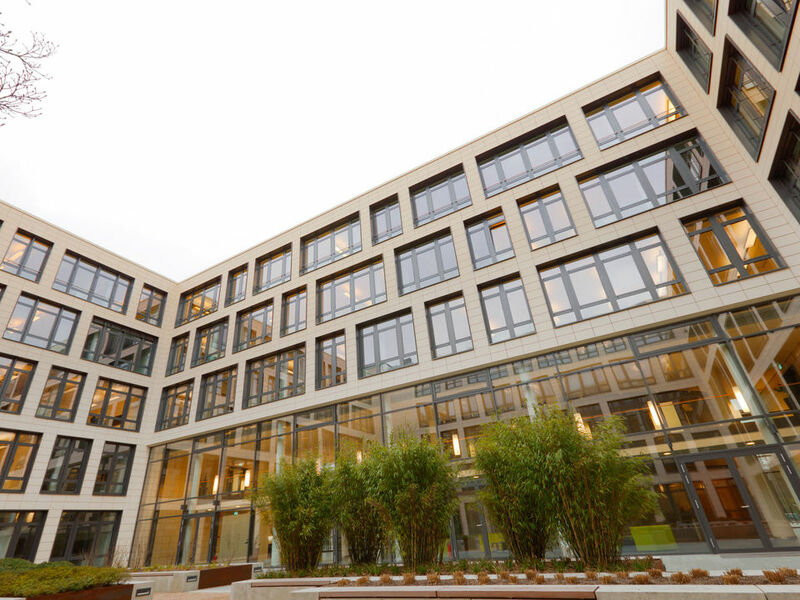 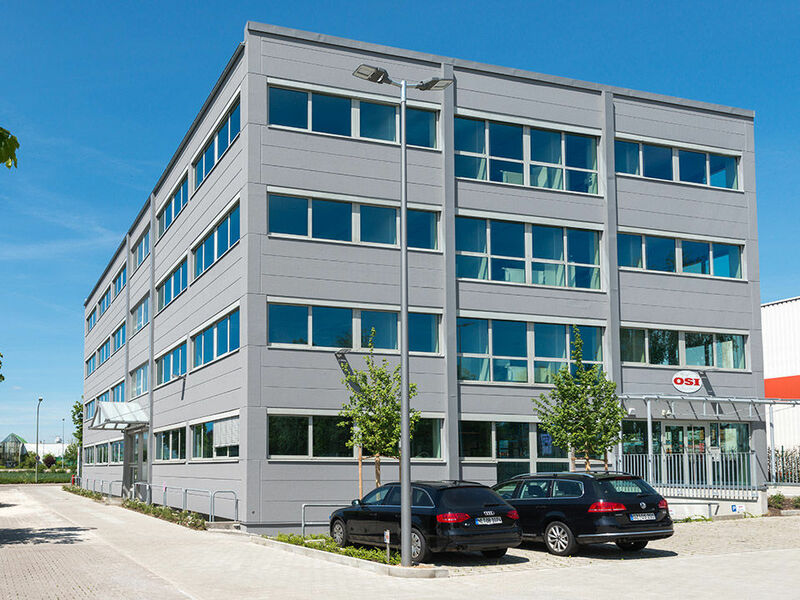 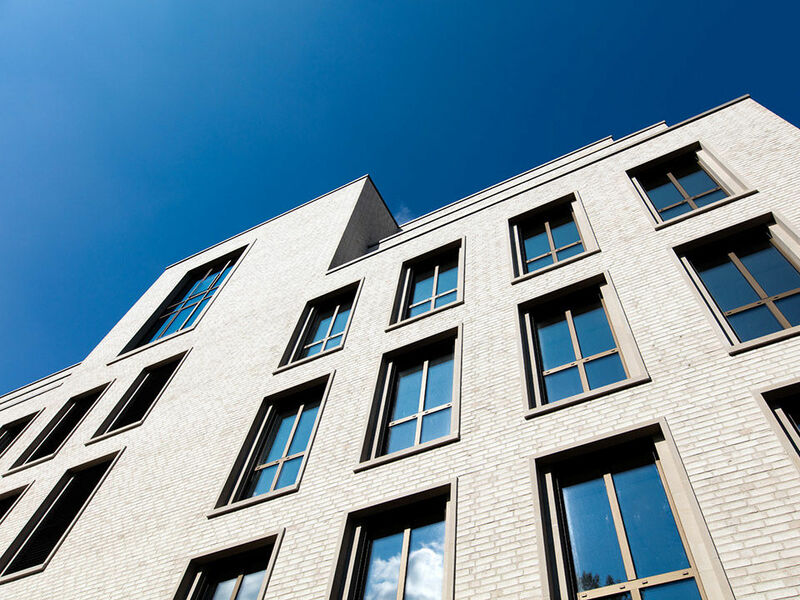 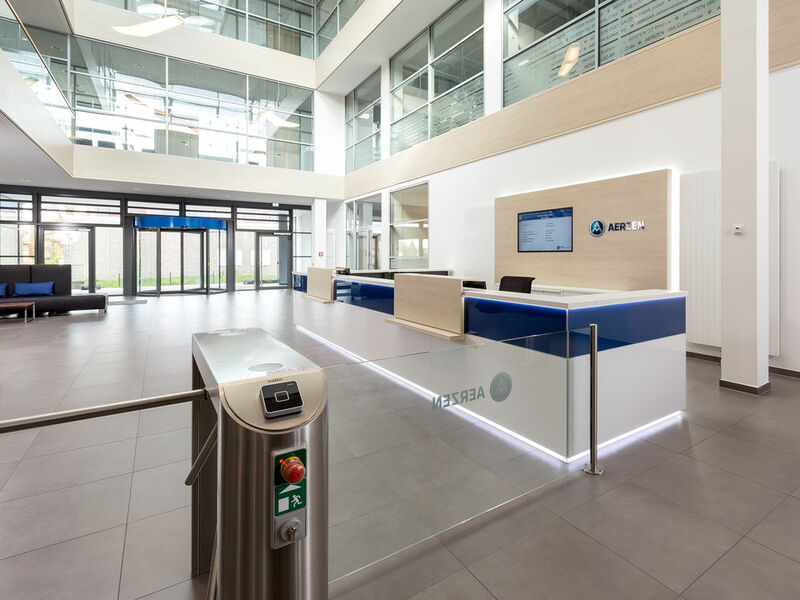 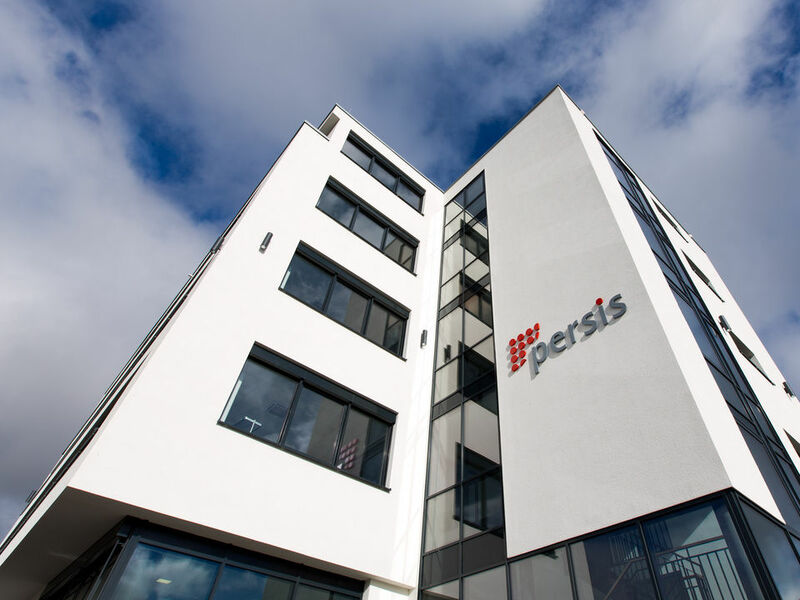 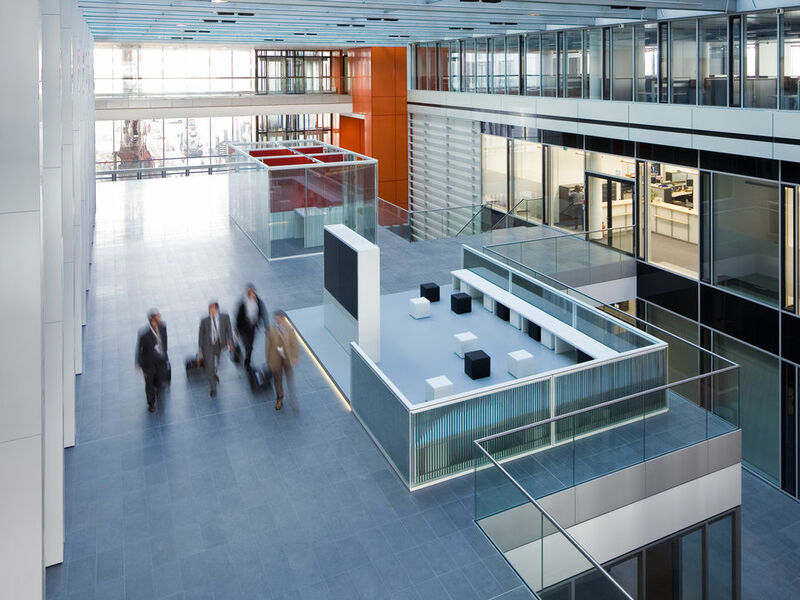 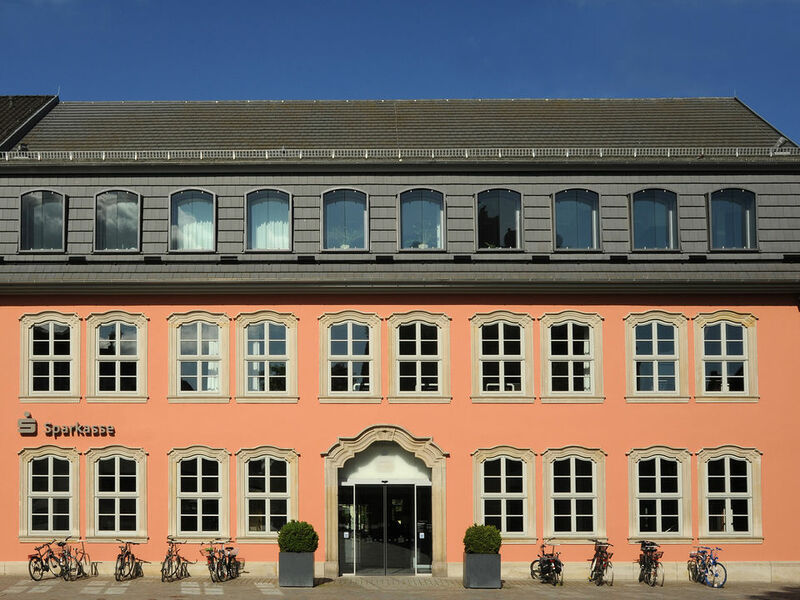 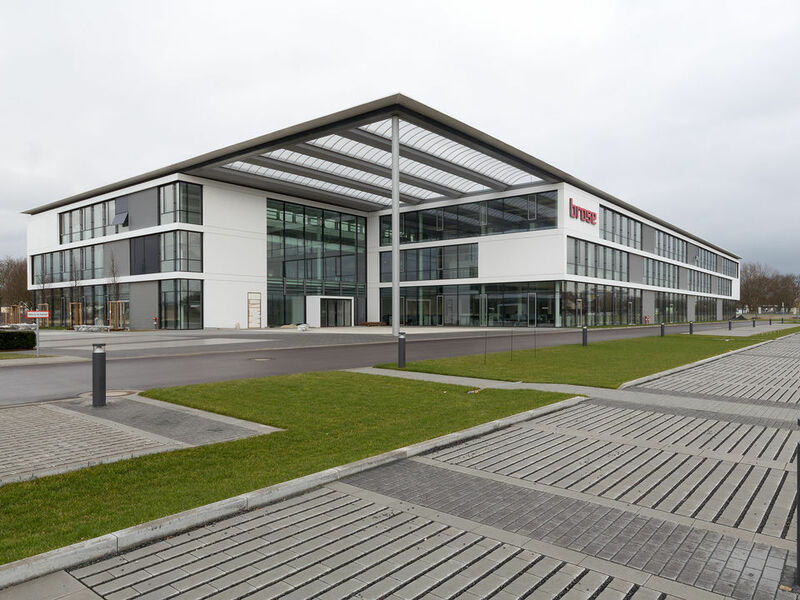 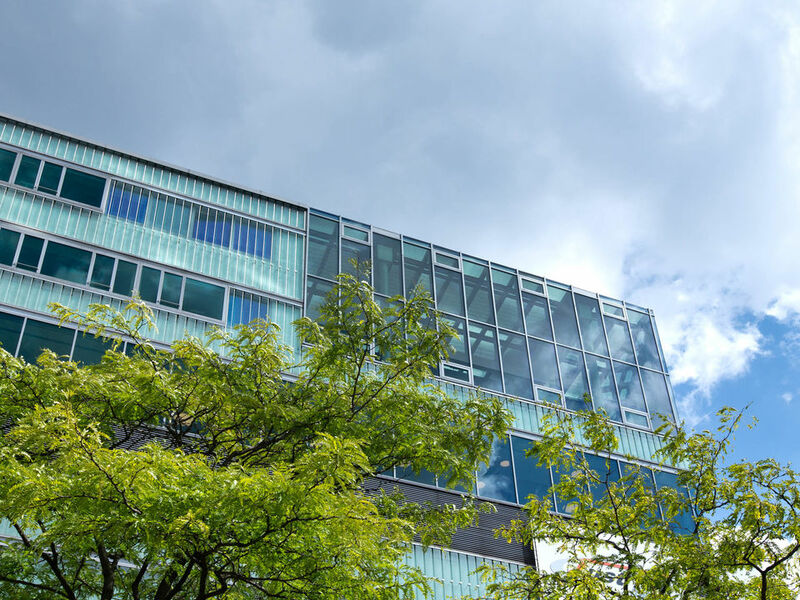 In the spring of 2016 the OSI group moved into its new European headquarters in Gersthofen – an existing building which had been gutted and restructured beforehand. 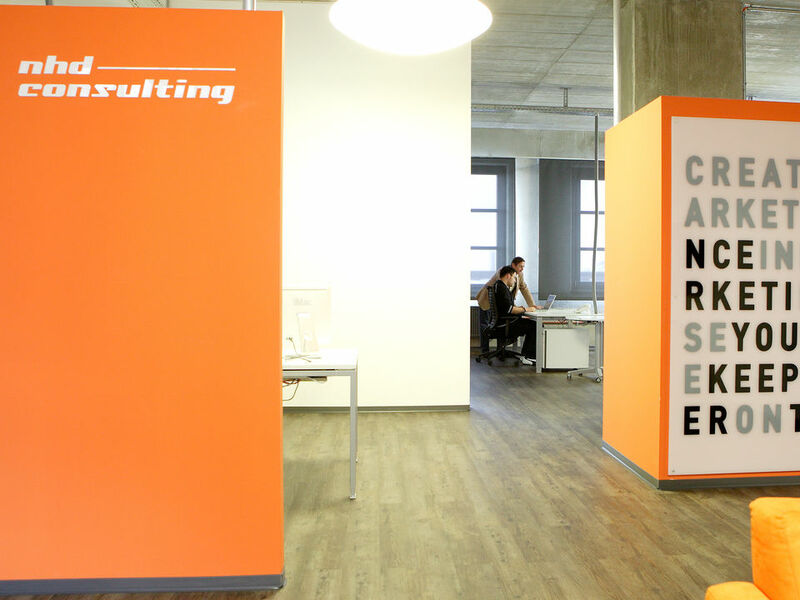 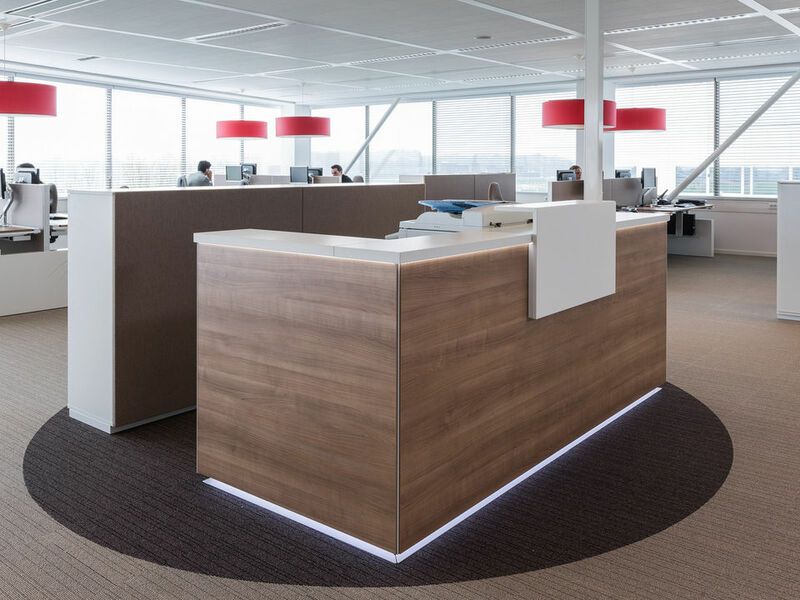 In collaboration with the WINI Floor Planning Team a new working environment for just under 100 employees was created, reflecting the corporate identity of the company. 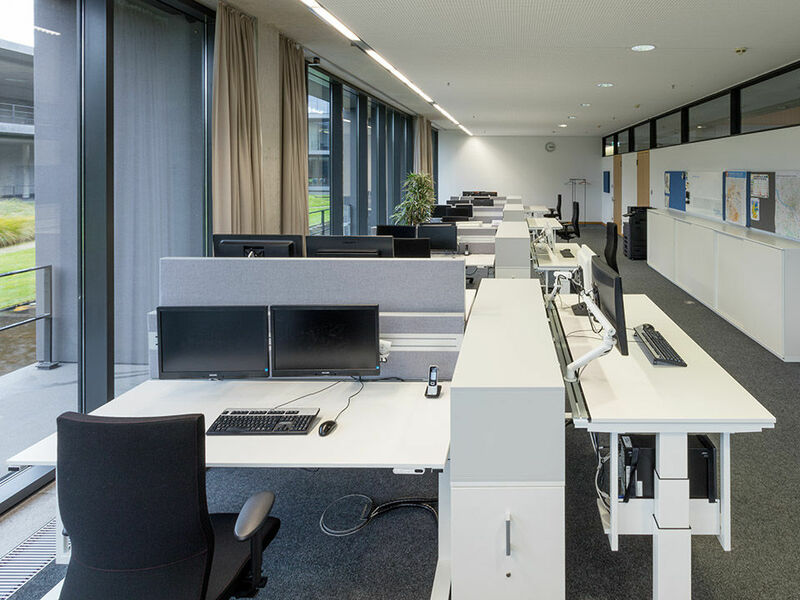 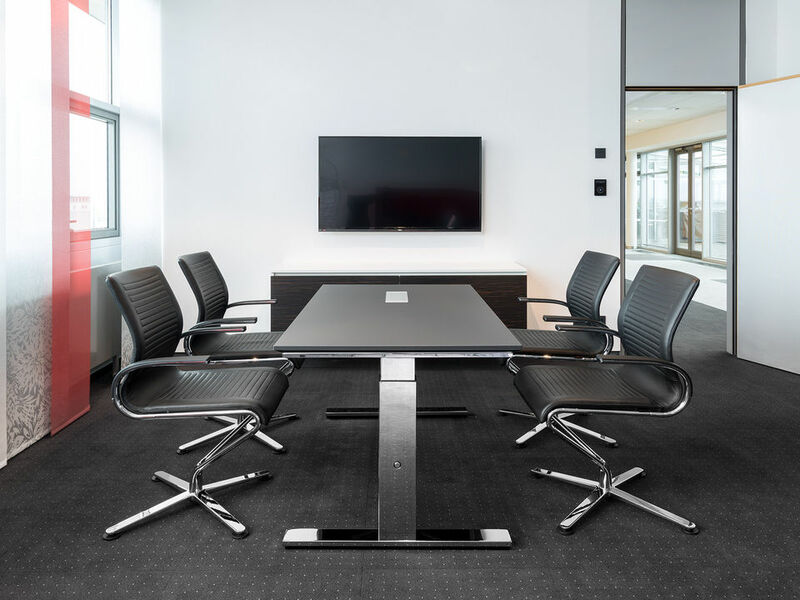 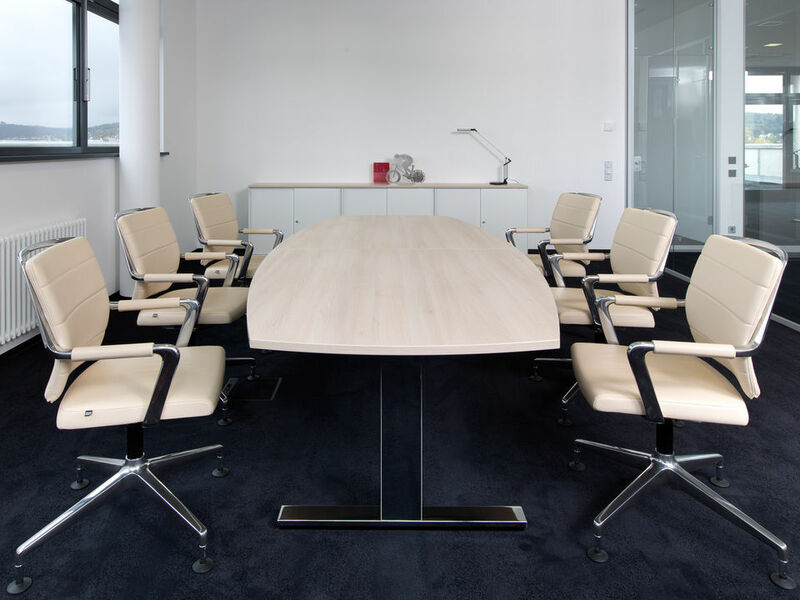 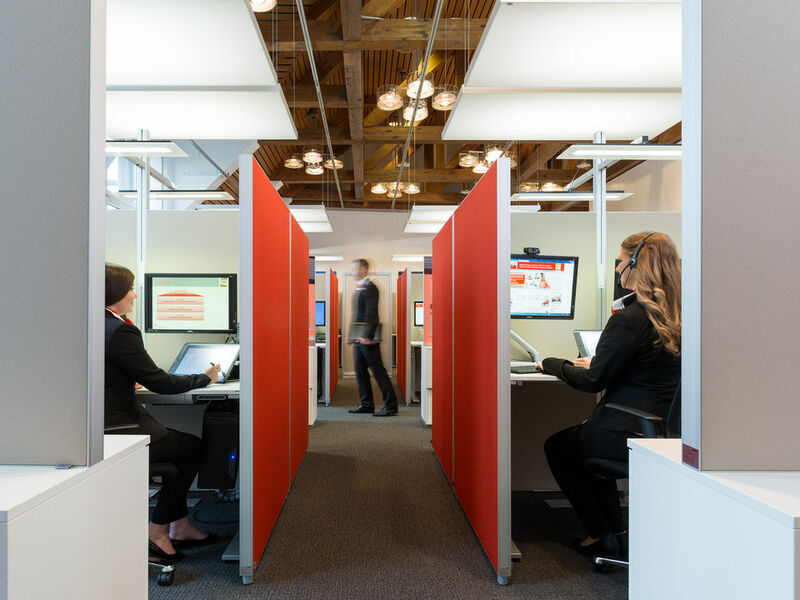 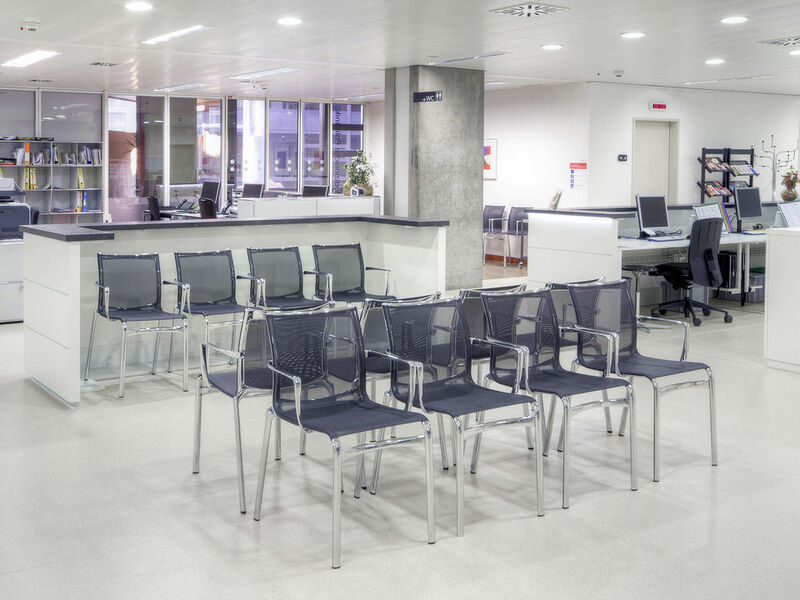 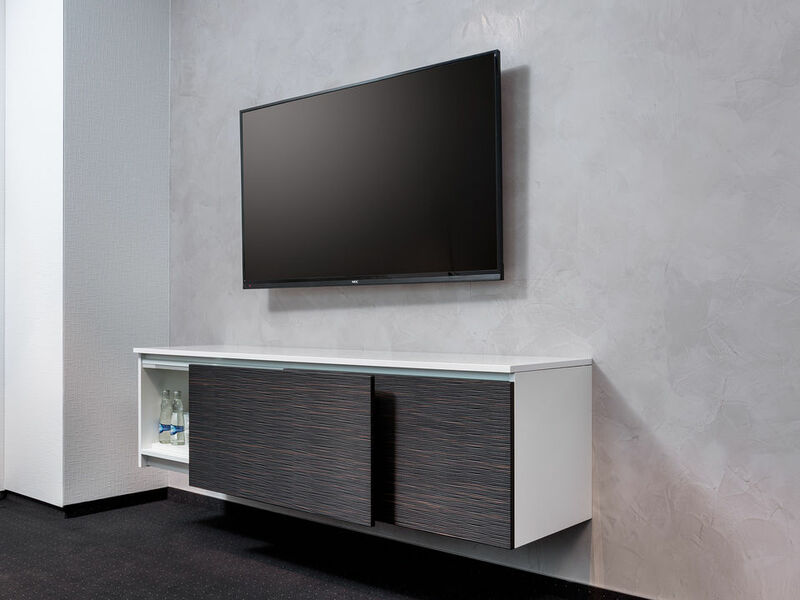 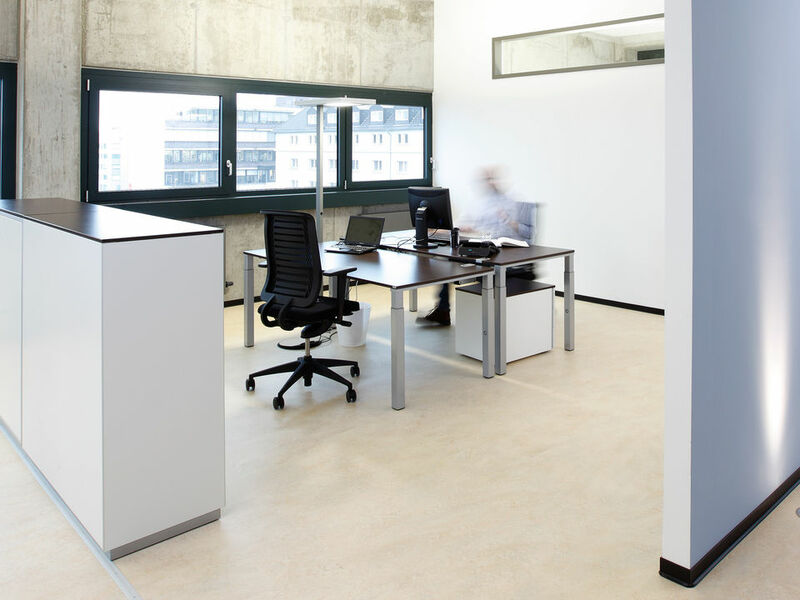 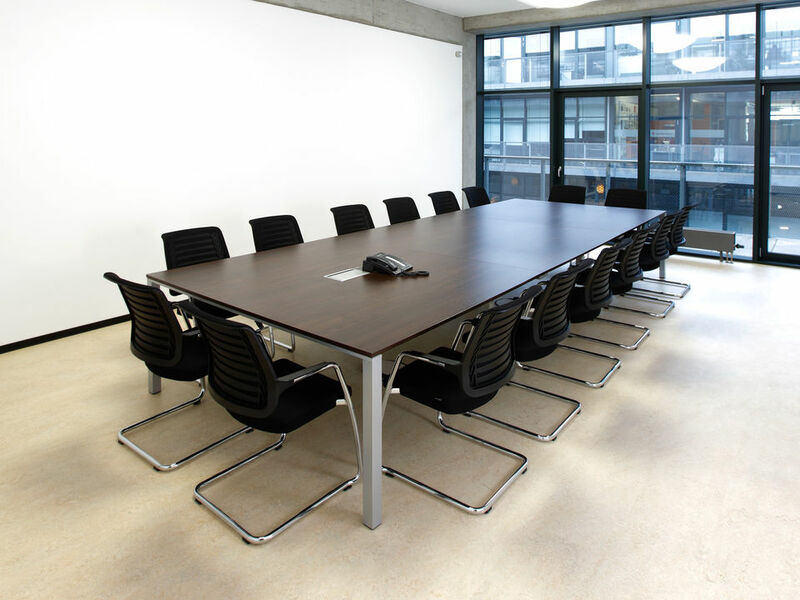 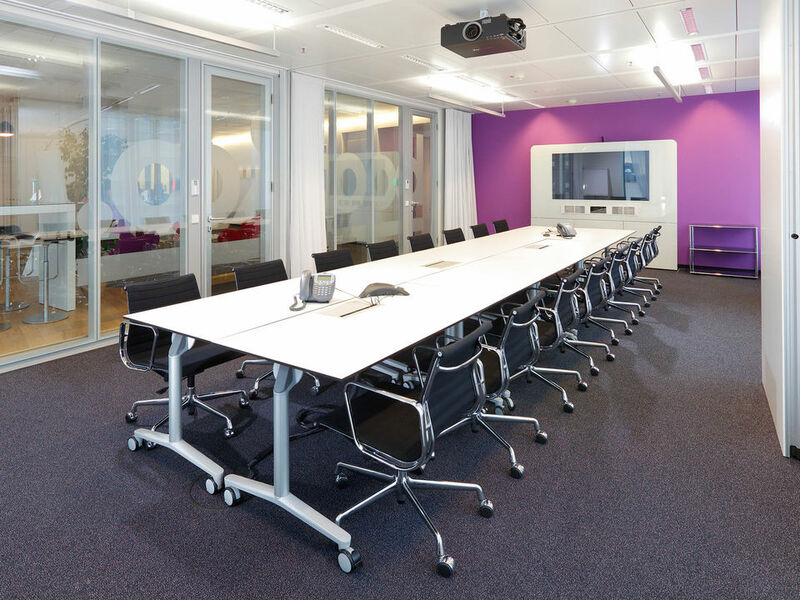 In the summer of 2015, WINI realized a new processor-oriented facility solution for the executive board set-up with representative reception workstations, waiting zones, individual offices and meeting rooms in accordance with the corporate design requirements of the financial institution. 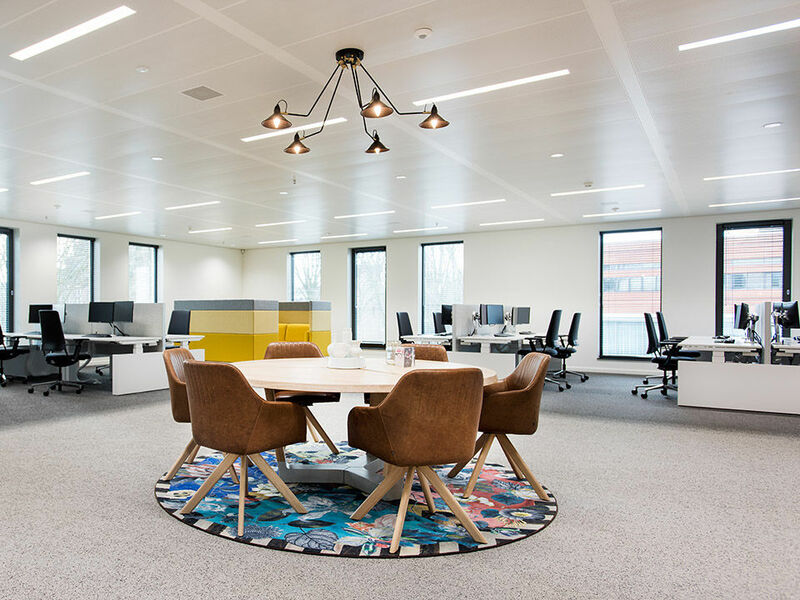 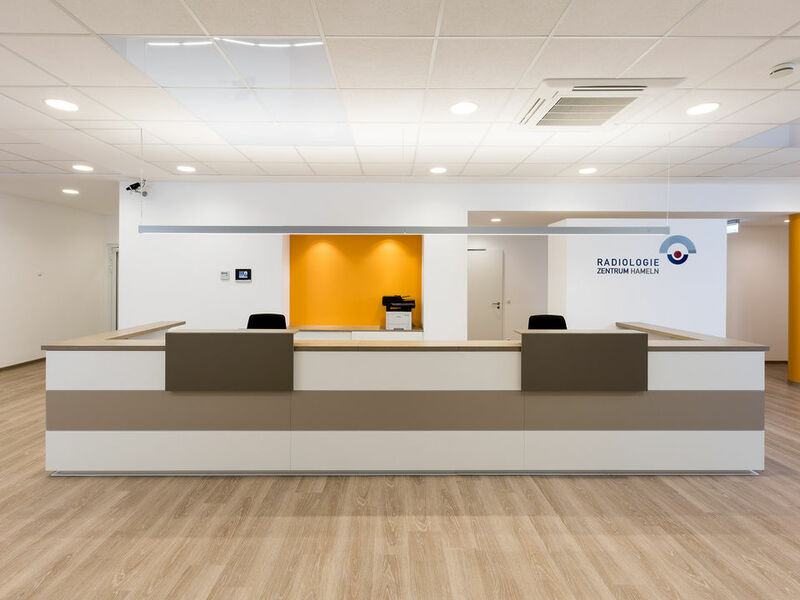 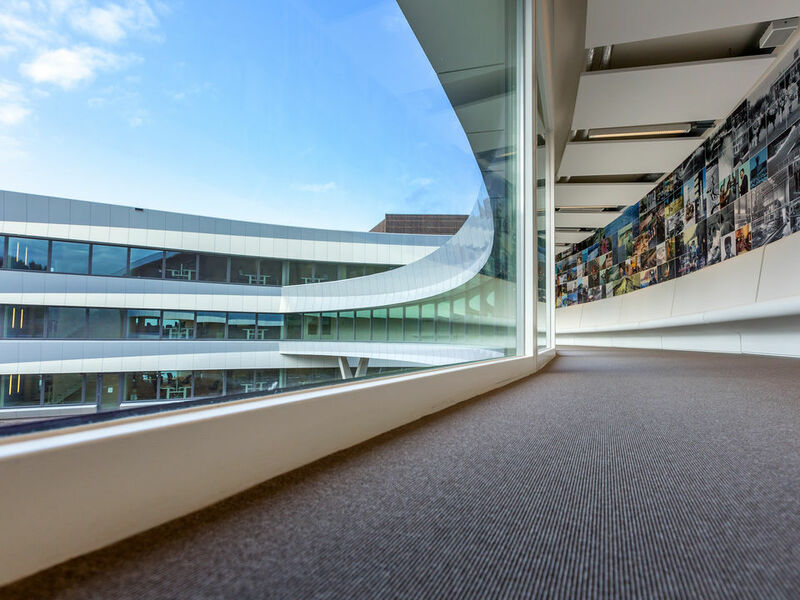 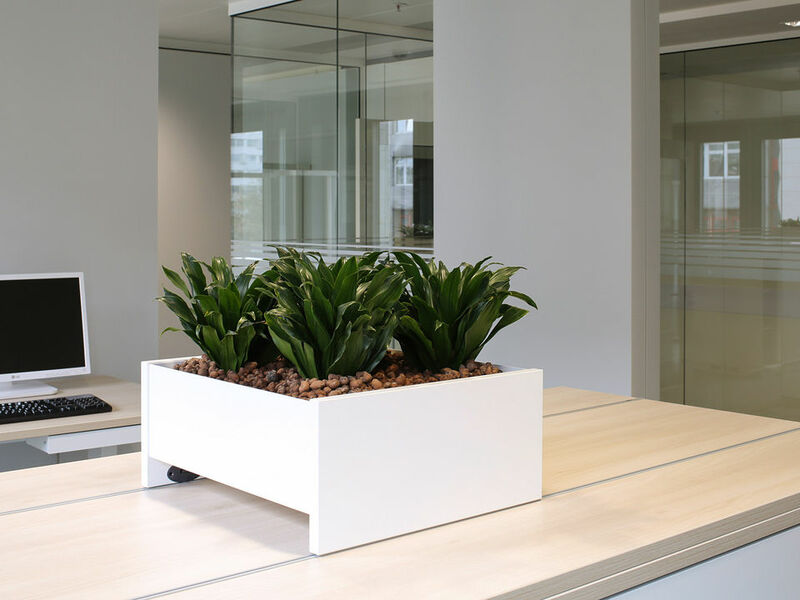 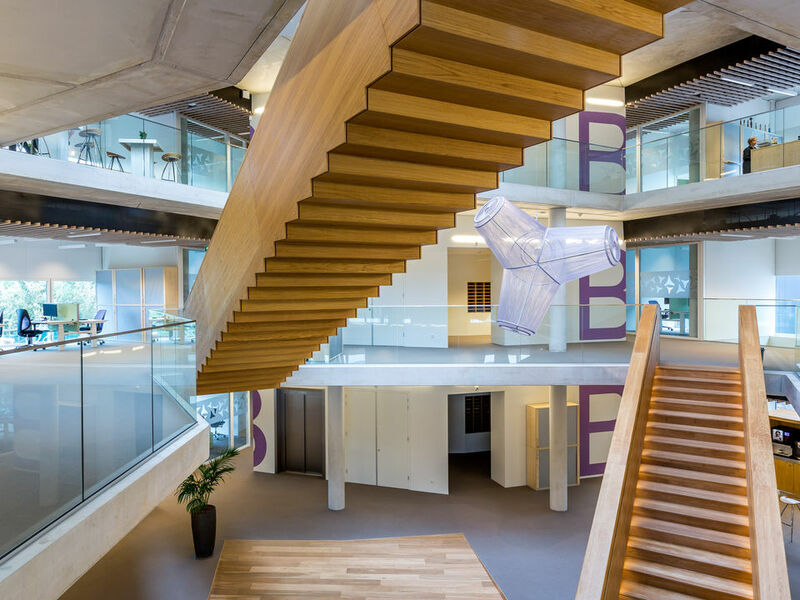 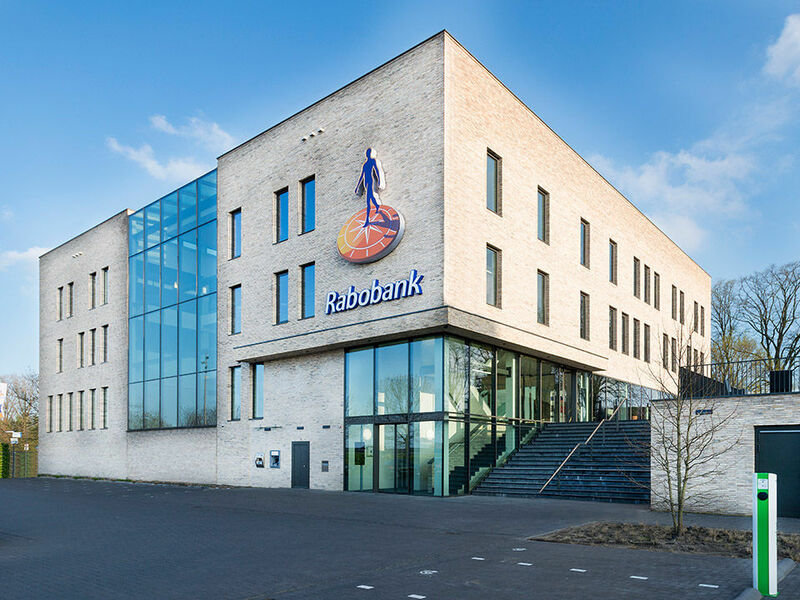 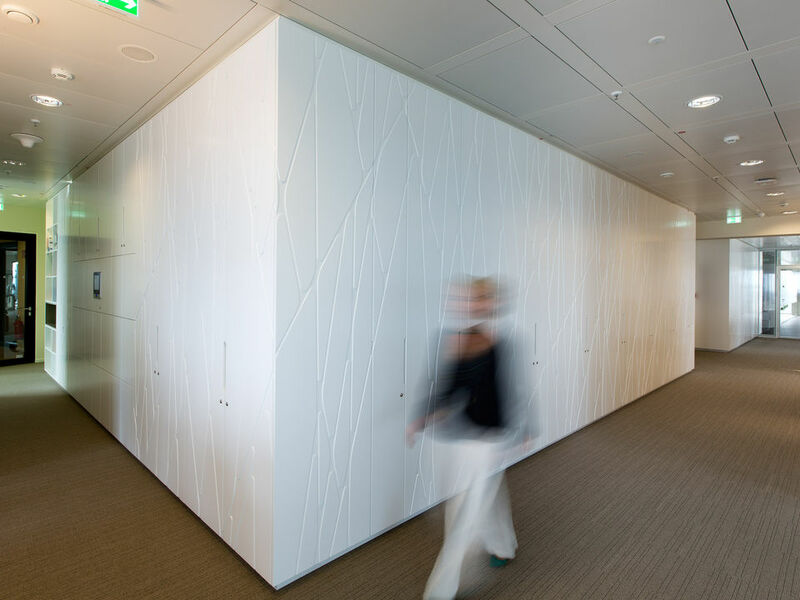 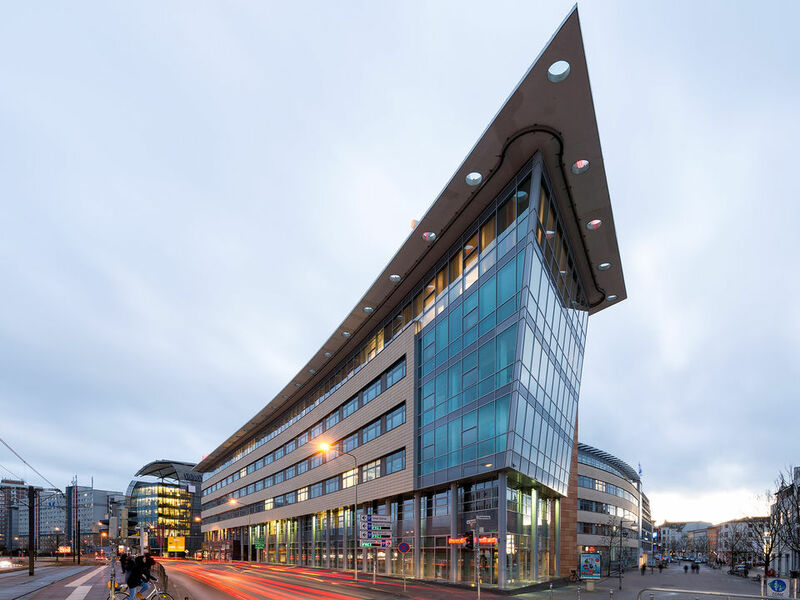 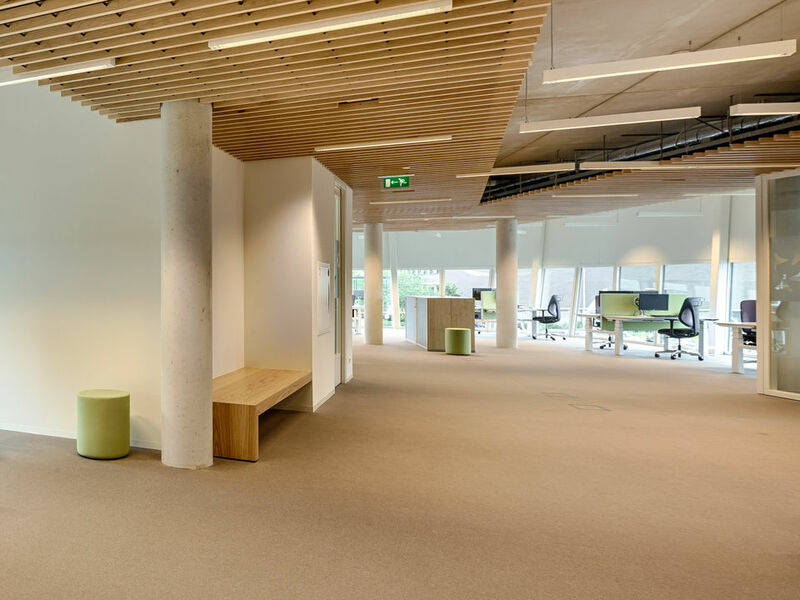 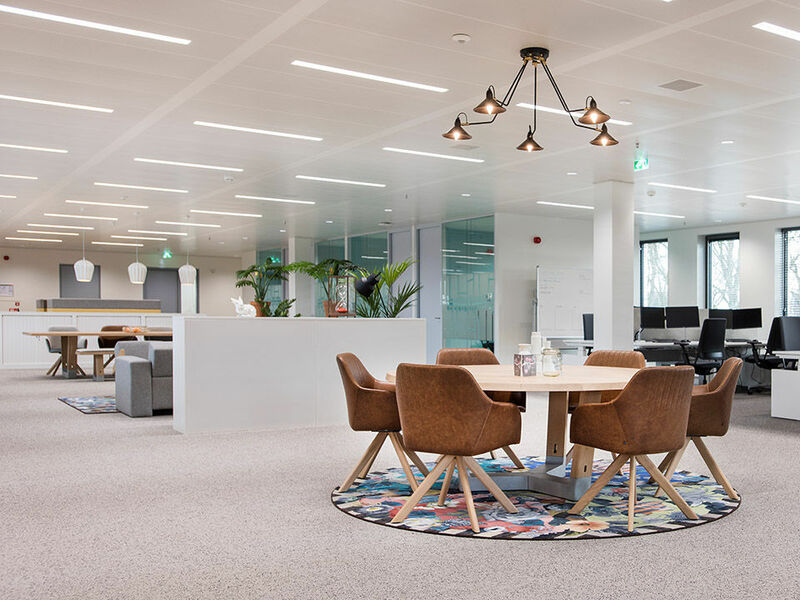 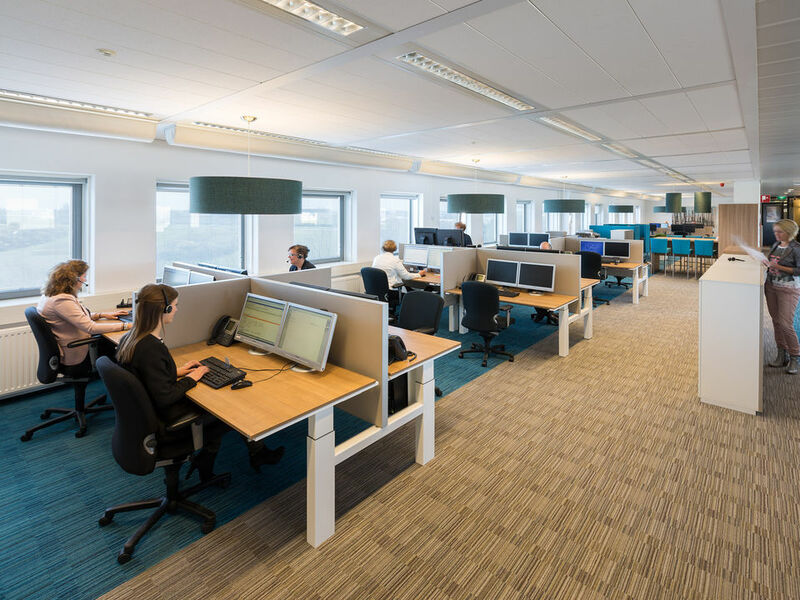 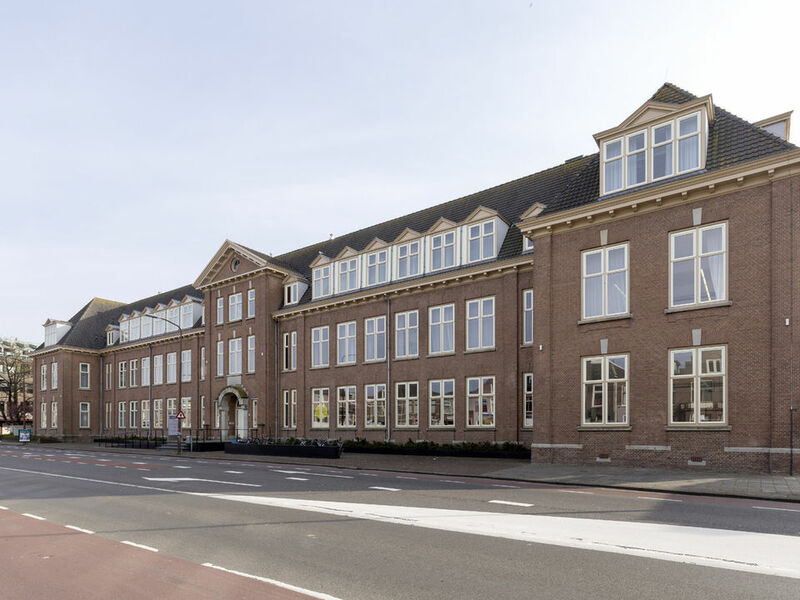 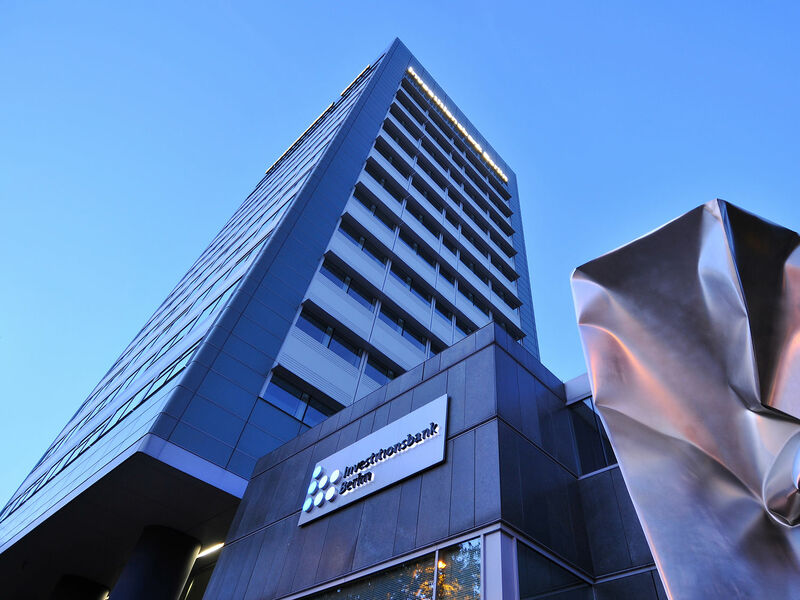 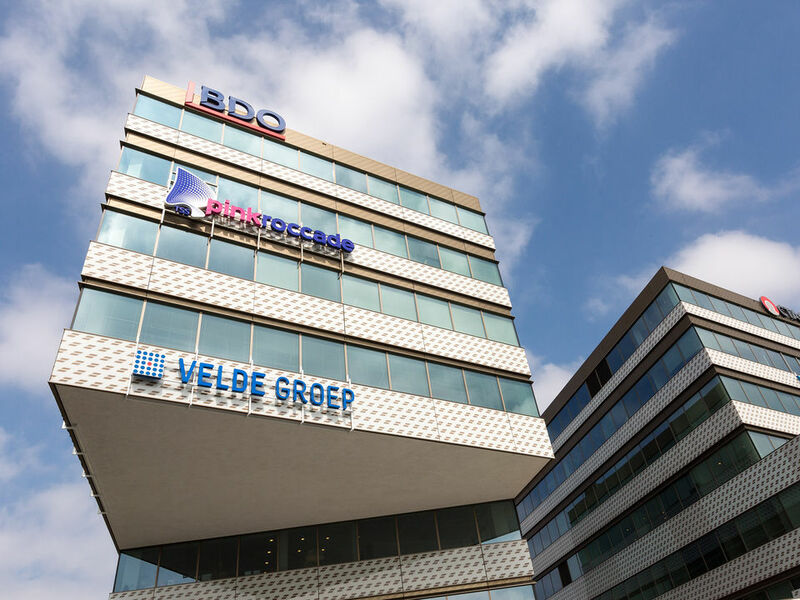 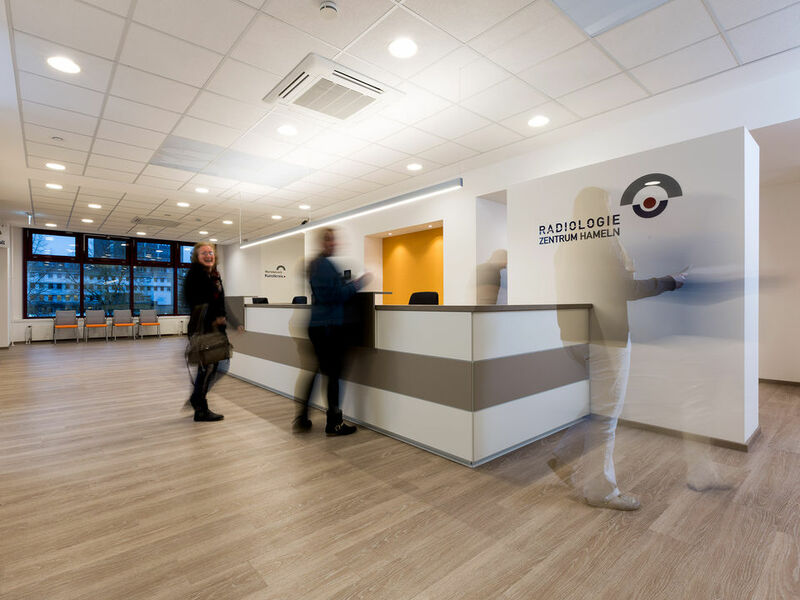 The new building, erected in 2107, offers a modern, colourful, homely and at the same time flexible working environment to the employees of the Rabobank. 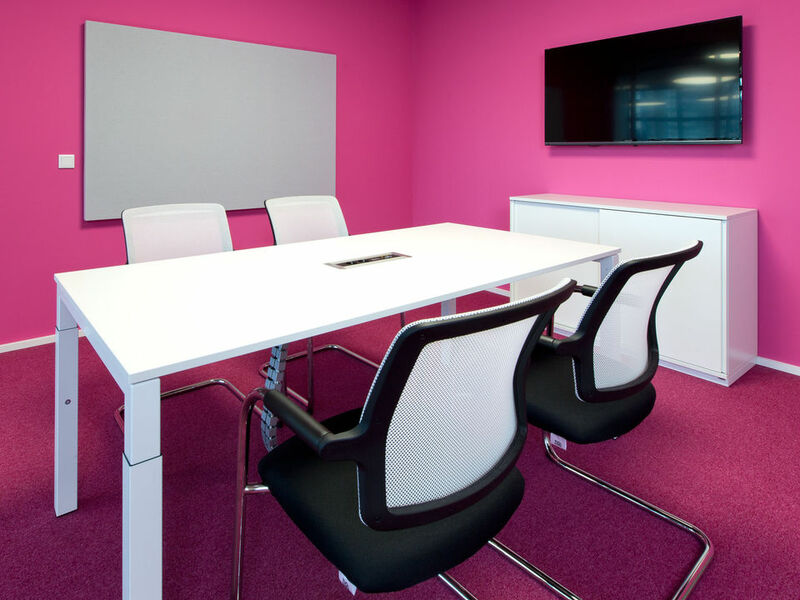 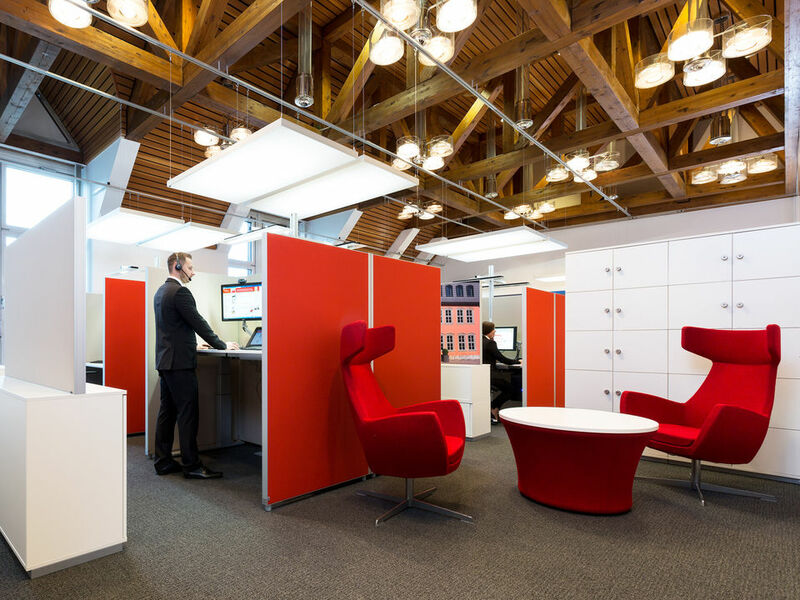 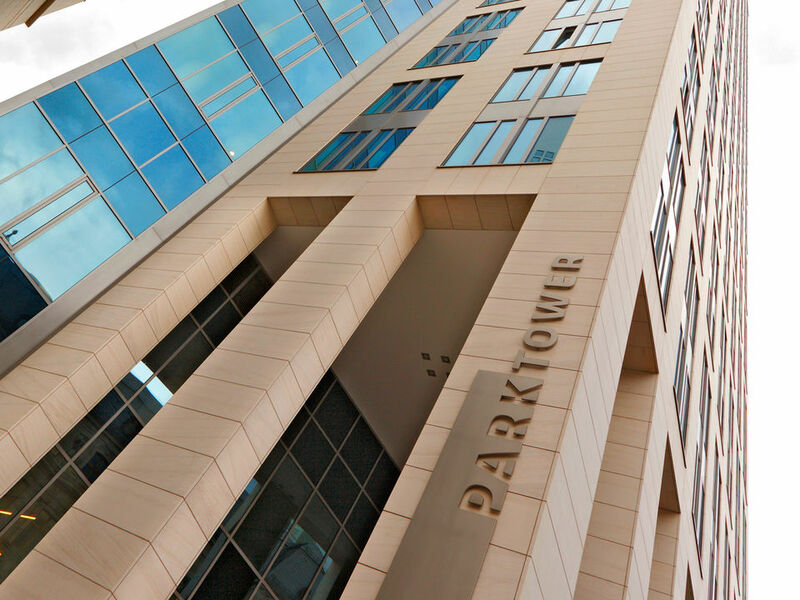 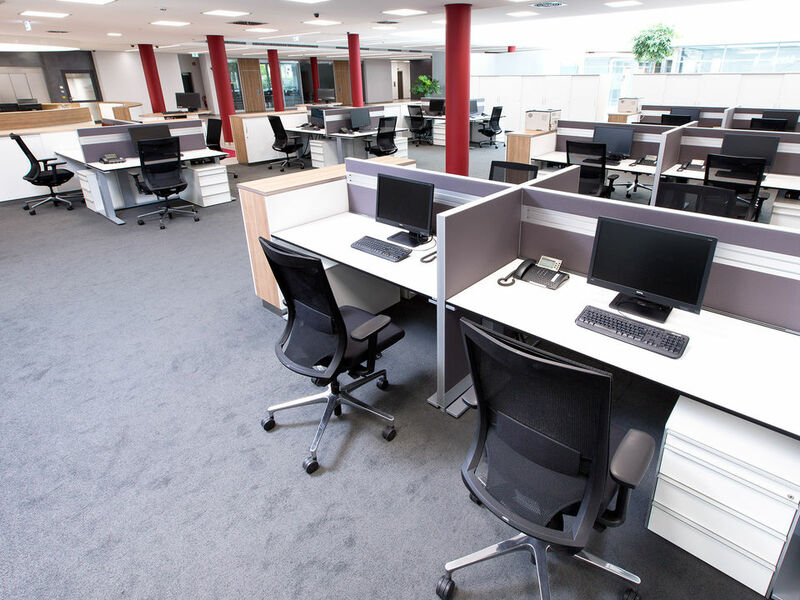 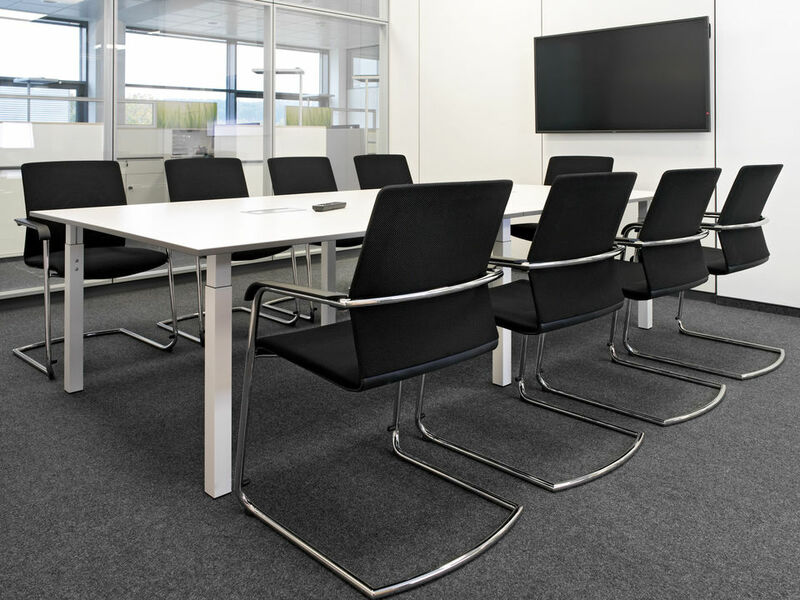 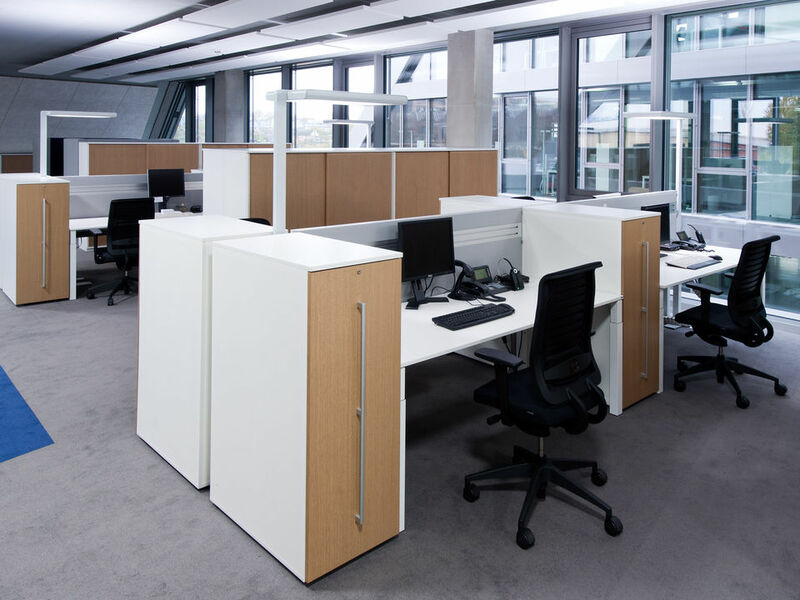 Open Space areas with ergonomic, height adjustable individual work desks and dual workstations., meeting areas, conference rooms, alcoves and recreational areas allow every employee to find a work place which adapts to his needs. 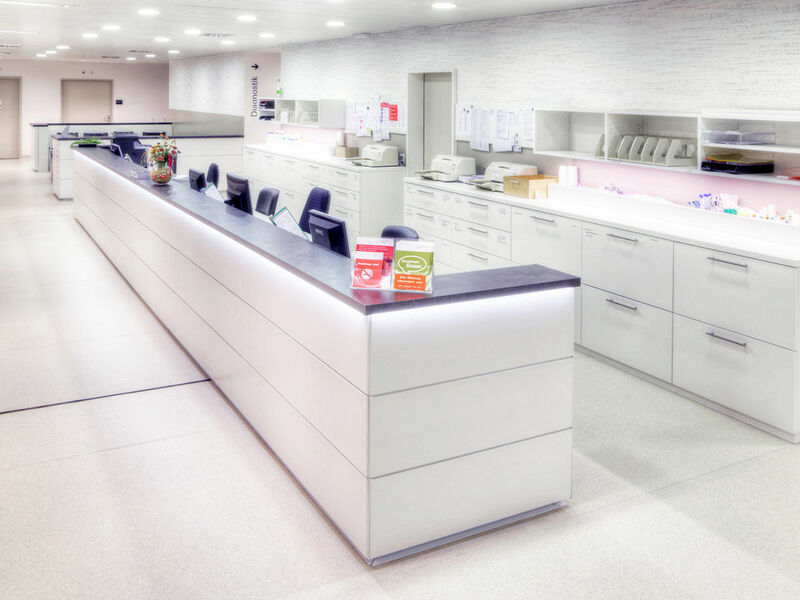 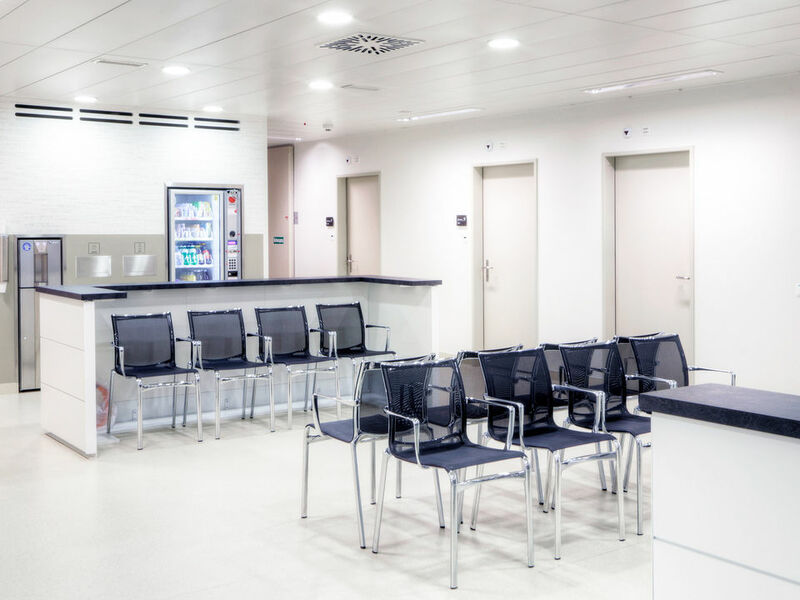 During its modernisation in the spring of 2015 the Diagnostic Radiology Centre in Hamlin was refurbished with a new reception and waiting area. 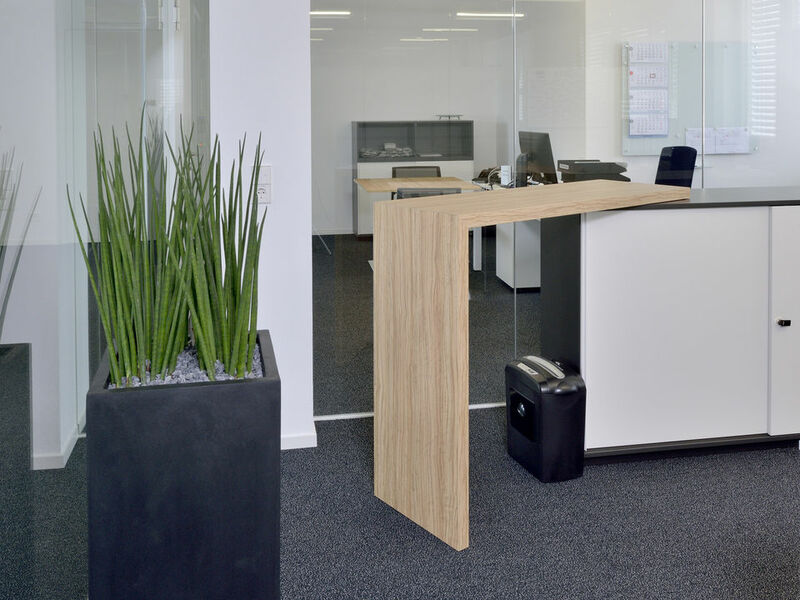 For the new reception furniture the staff members decided on a combination of the counter range WINEA ID, the desk range WINEA PRO and the storage ranges WINEA MAXX and CONTAINER. 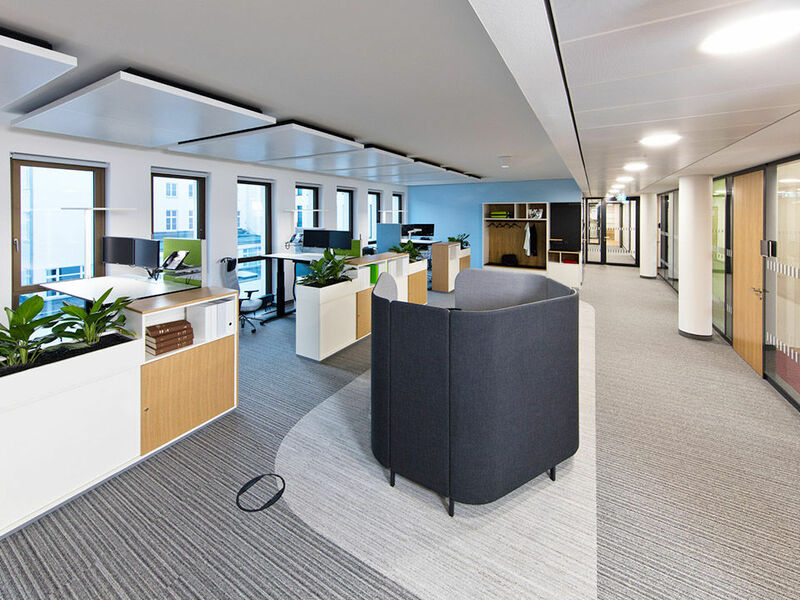 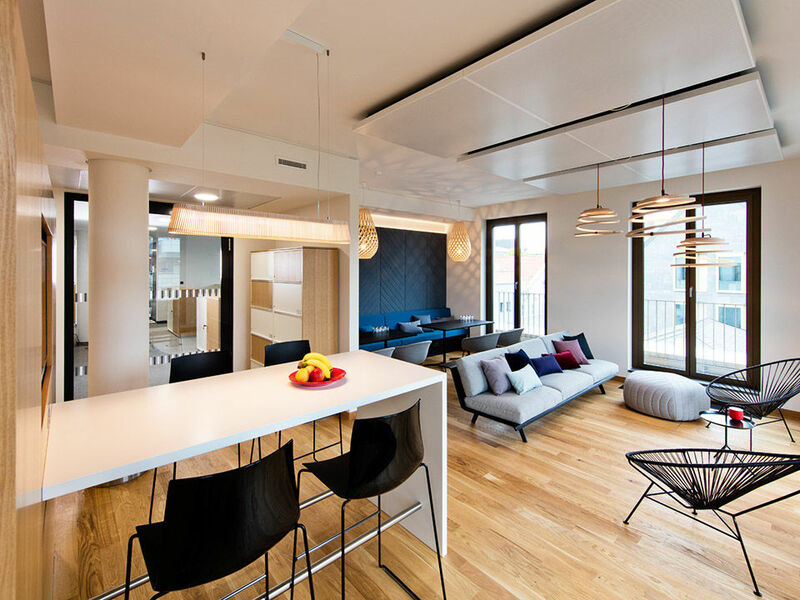 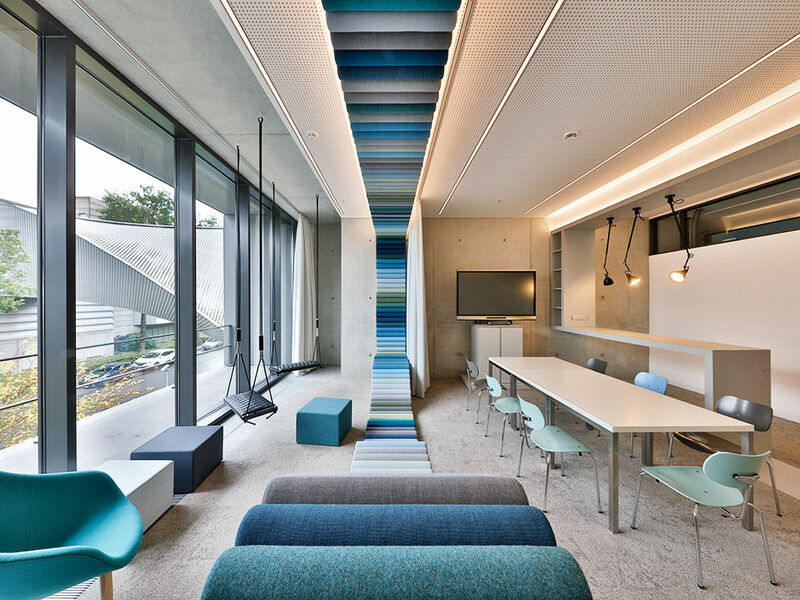 On a surface of 150 square metres the planning office “roomarts” realized a modern and functional concept for an design oriented, open office world with colorful accents - based on the activity analysis of the MY OFFICE PRINCIPLE by WINI. 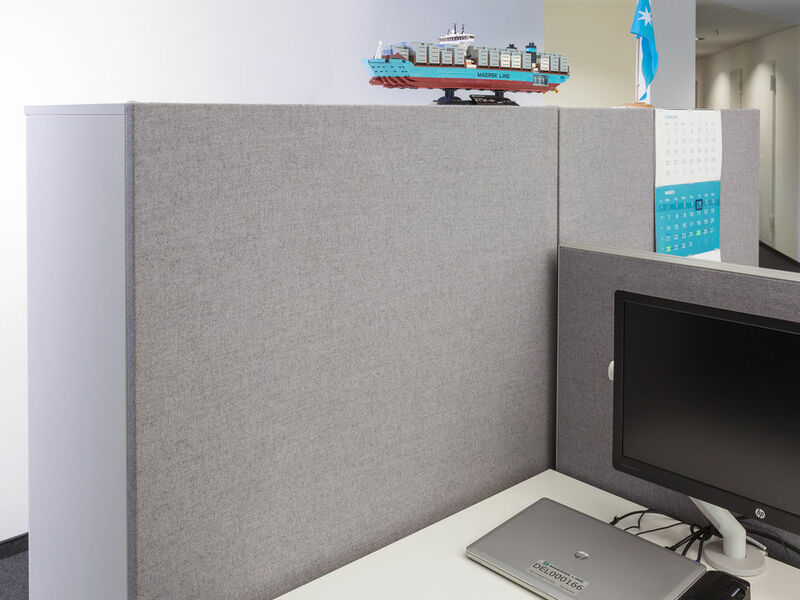 in a harmoniously arranged office environment. 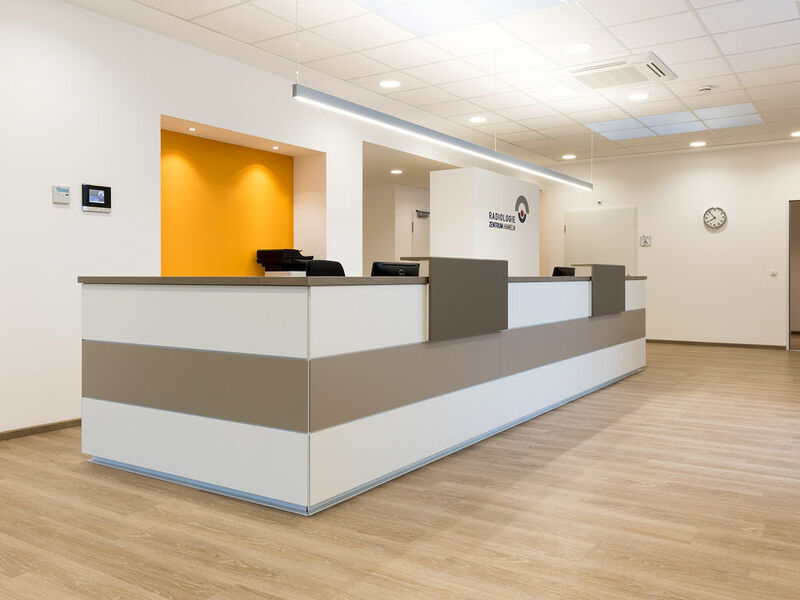 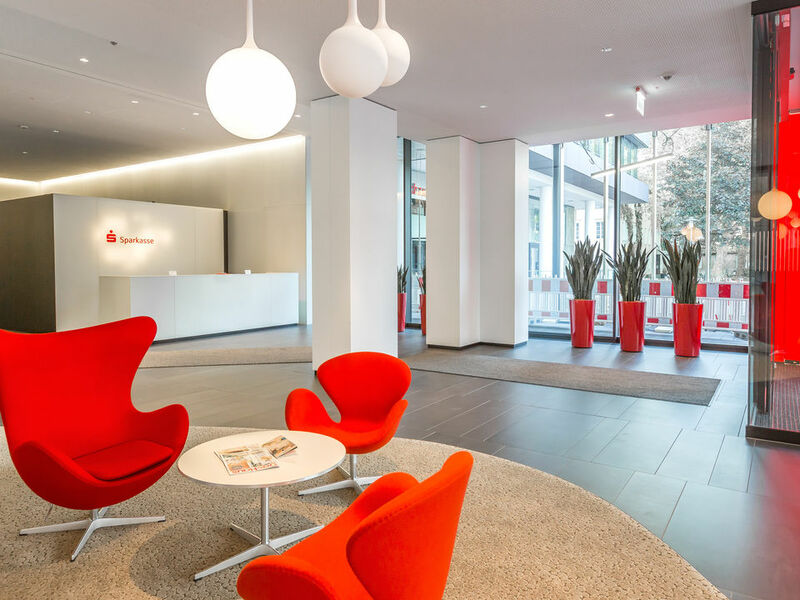 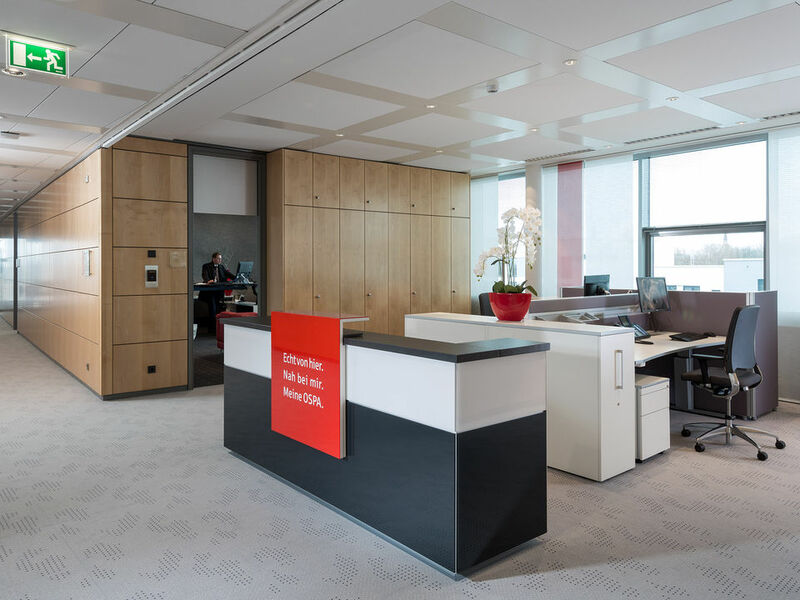 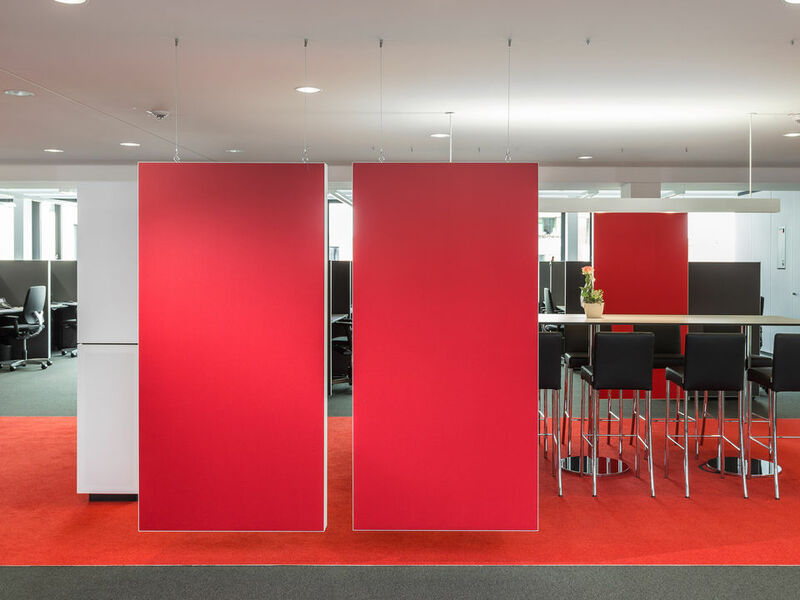 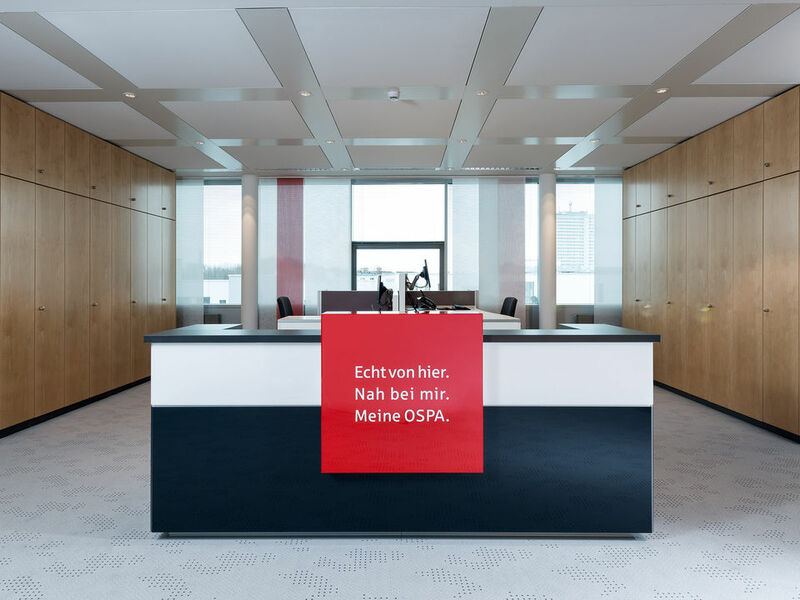 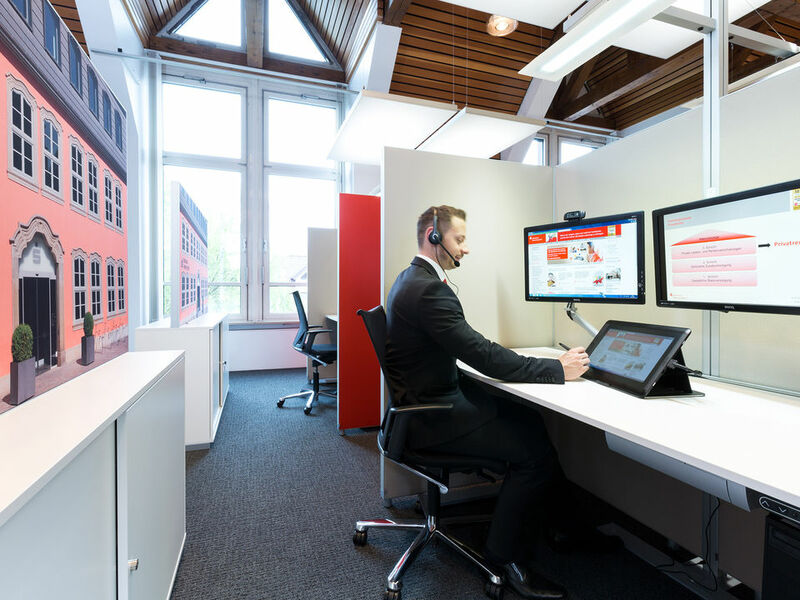 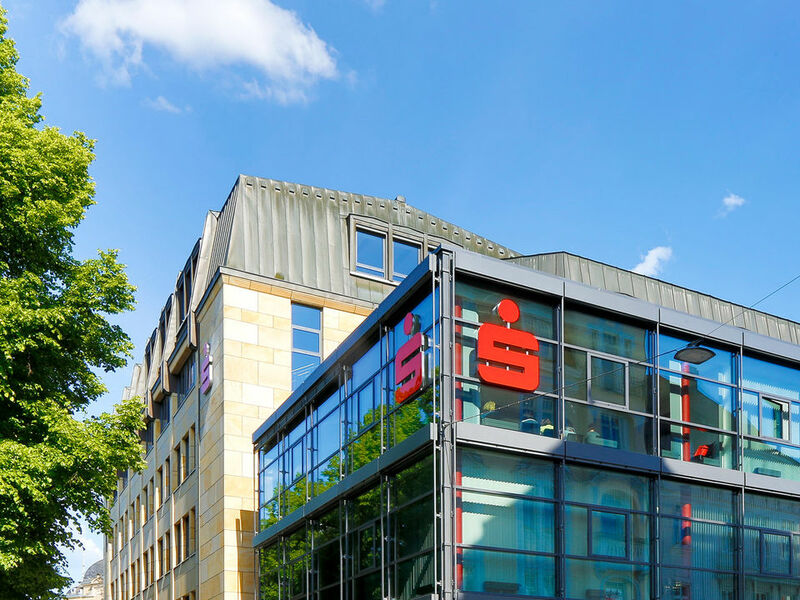 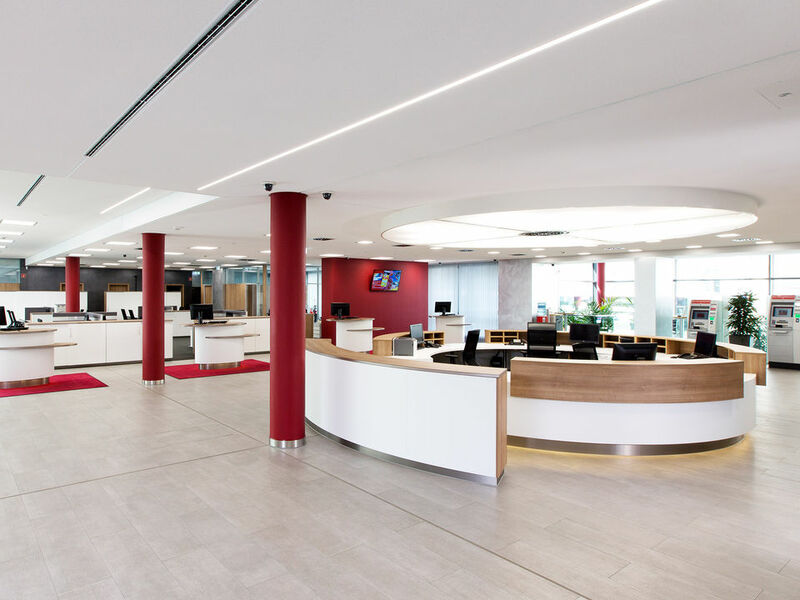 For the new office of the "Heimatsparkasse" that serves its customers primarily via online media, WINI has developed an individual design concept, specifically "multimedia" on the Functioning of the service staff was matched - based on the MY OFFICE PRINCIPLE. 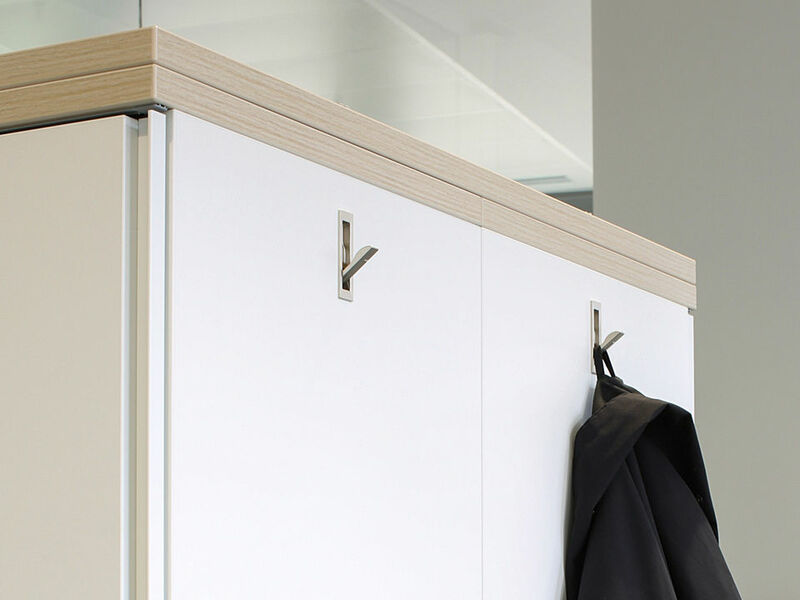 Object sheet with detailed informations (PDF/DE). 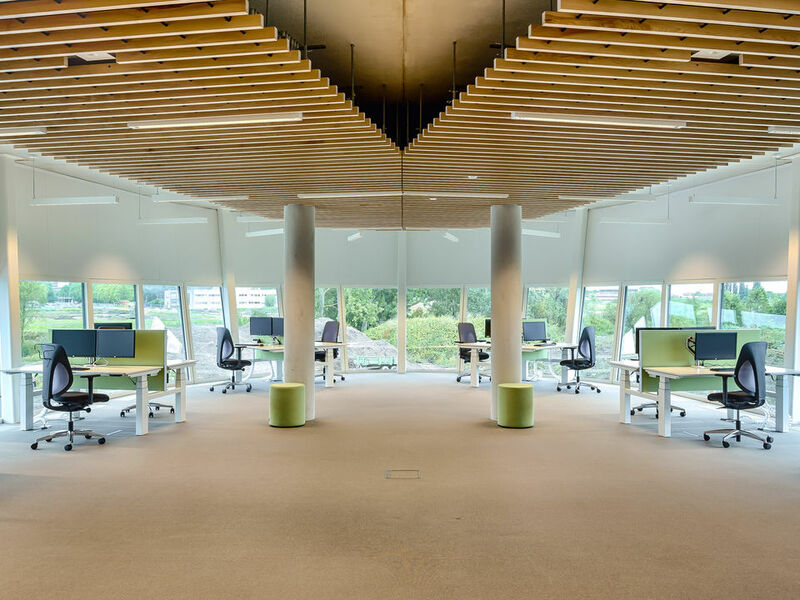 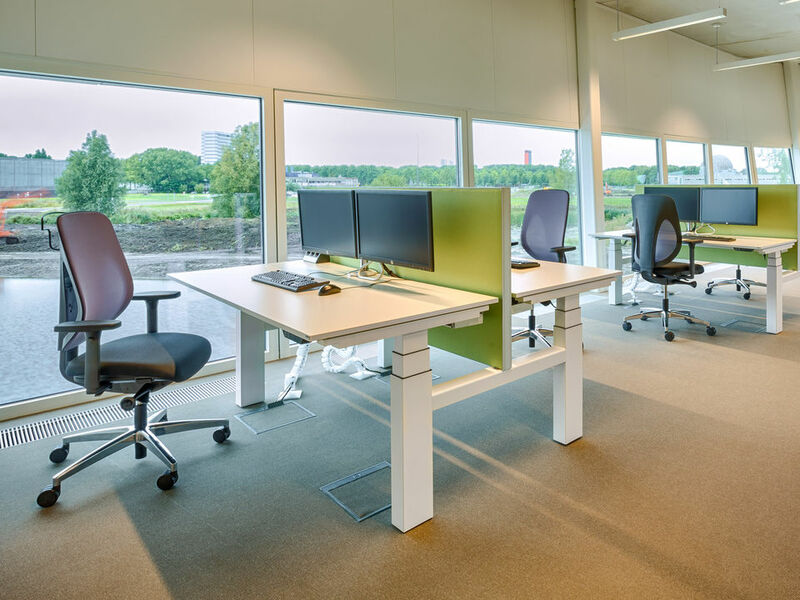 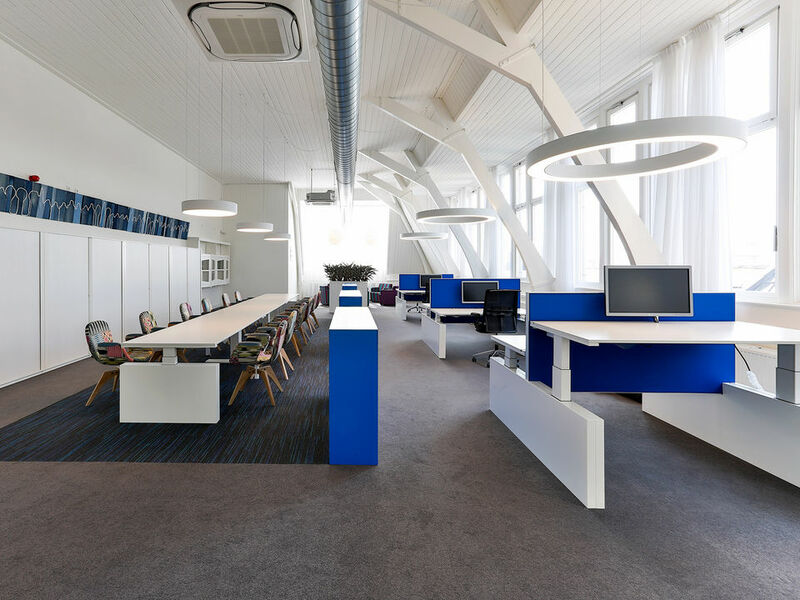 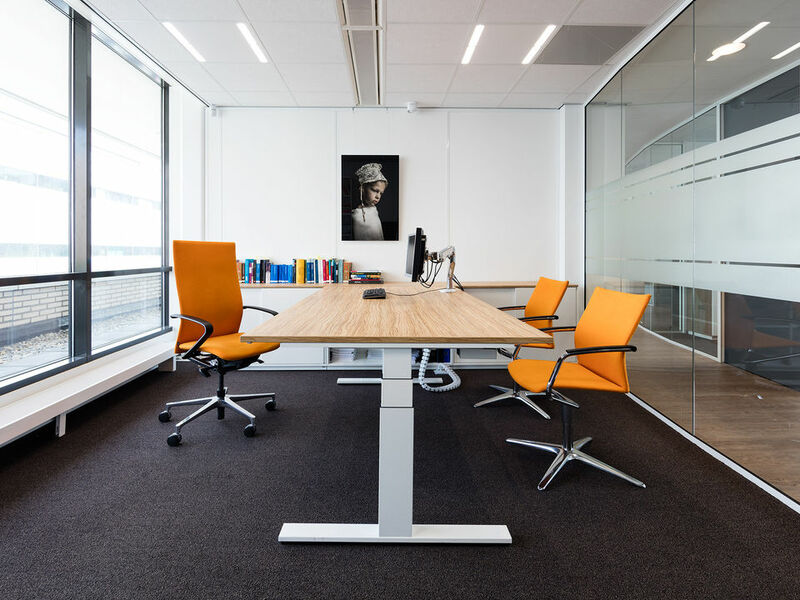 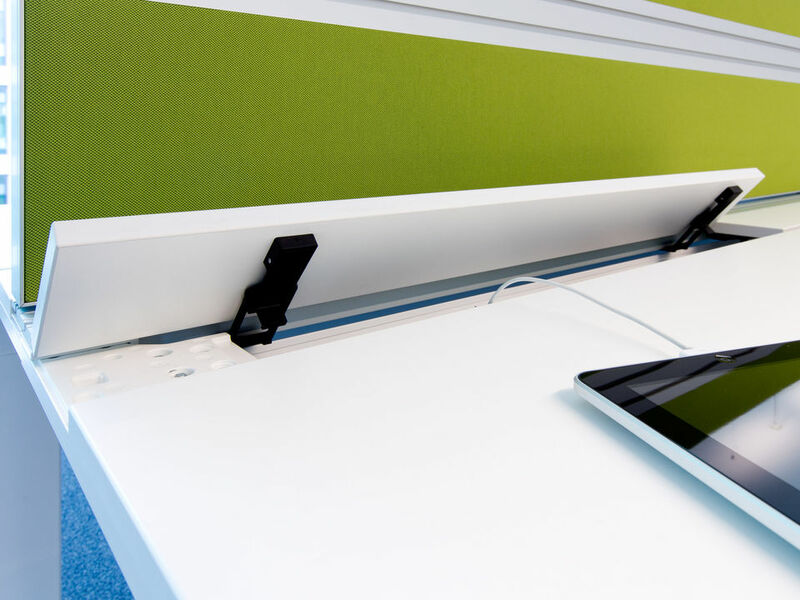 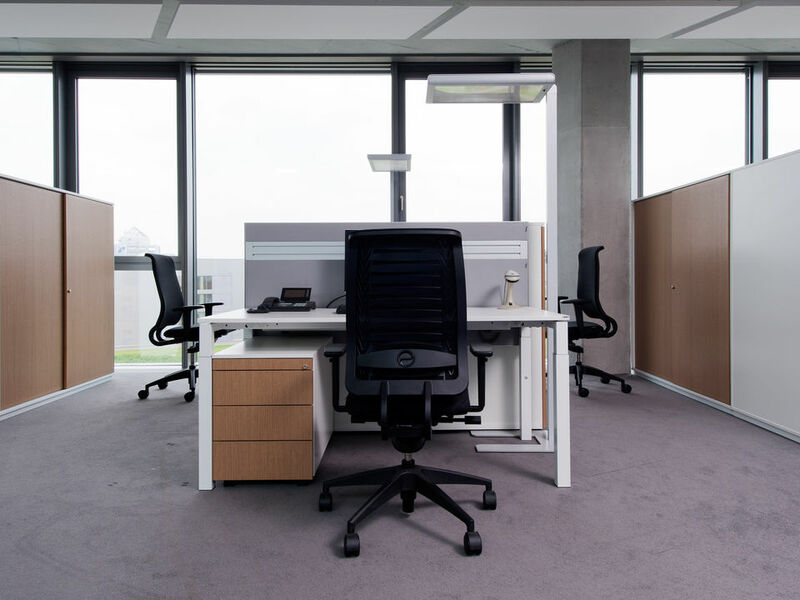 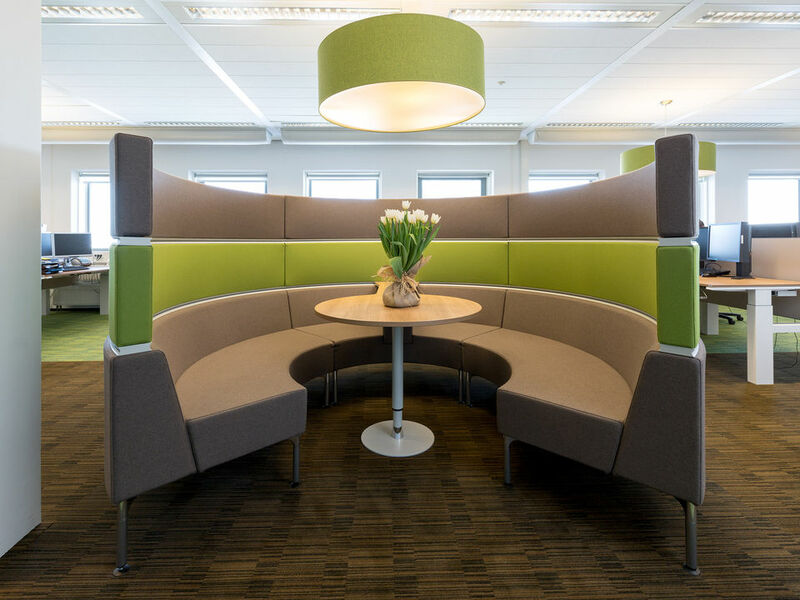 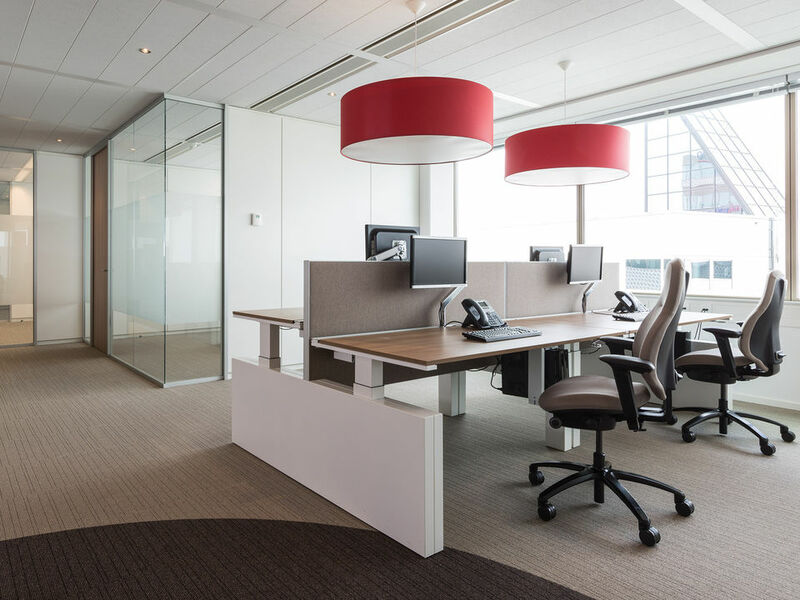 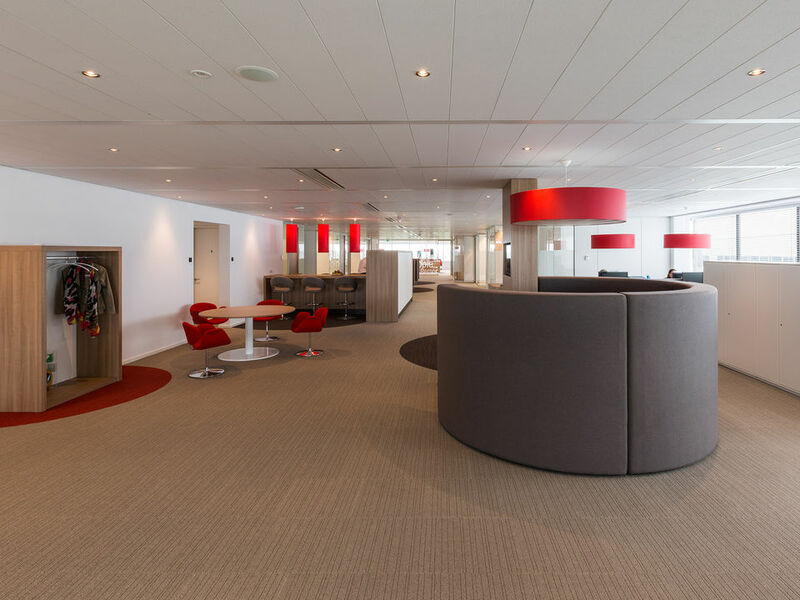 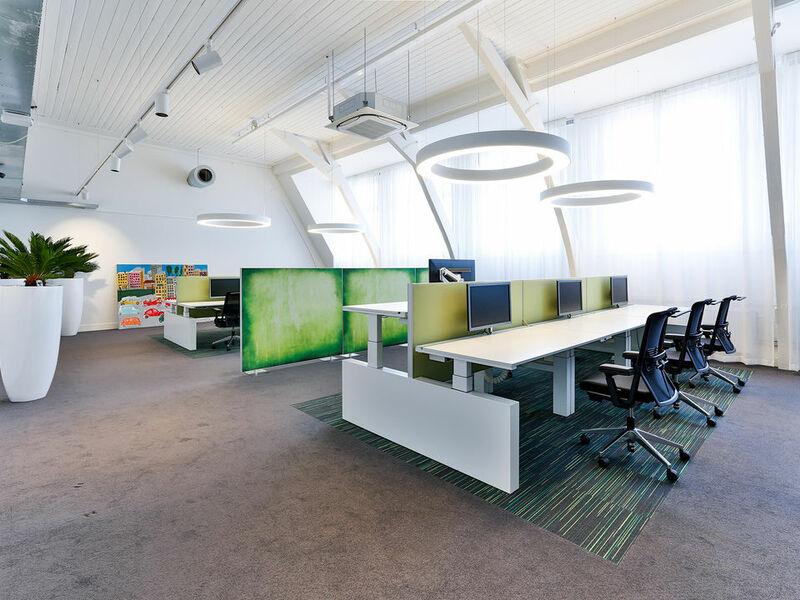 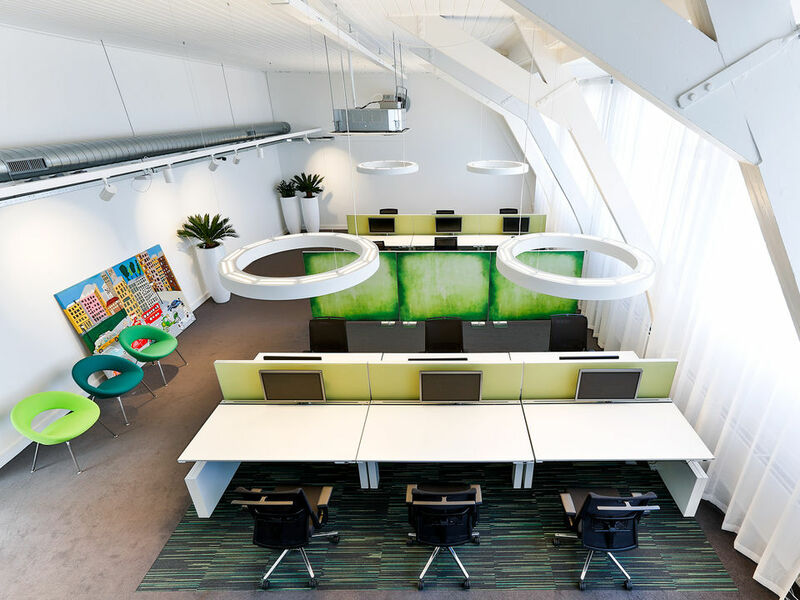 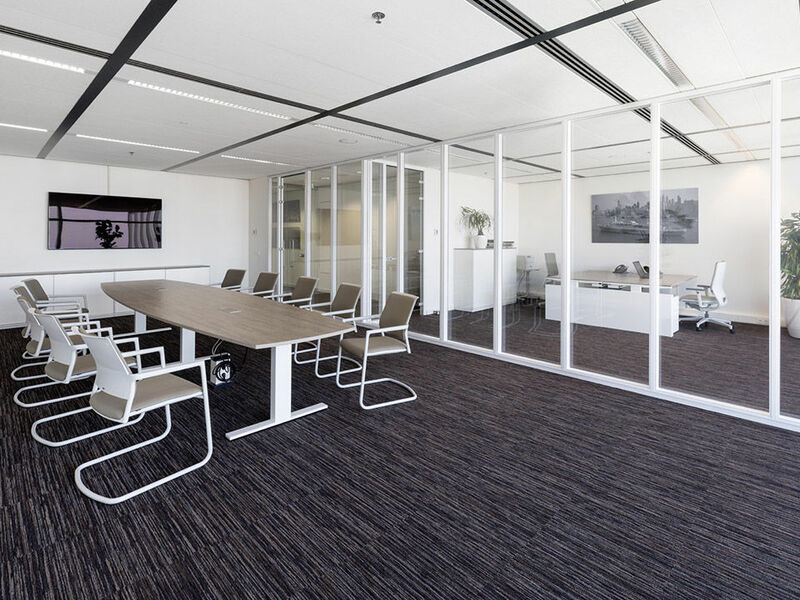 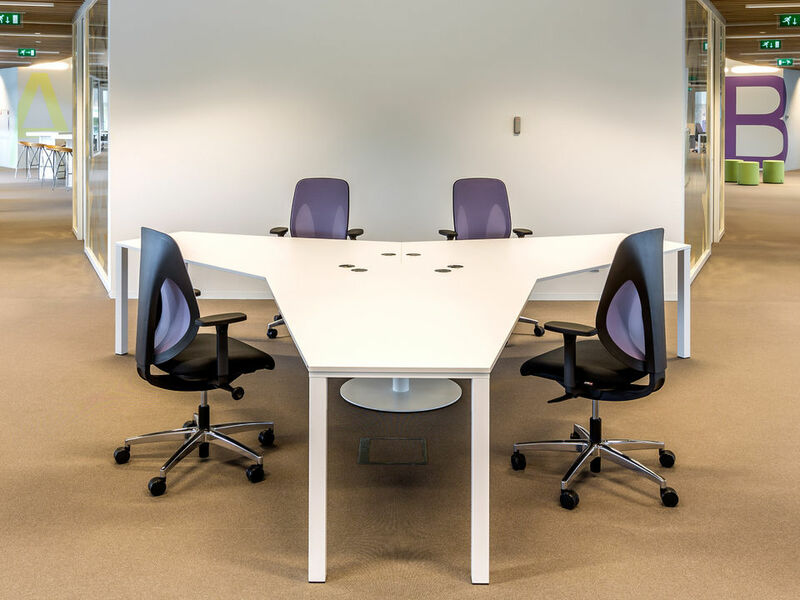 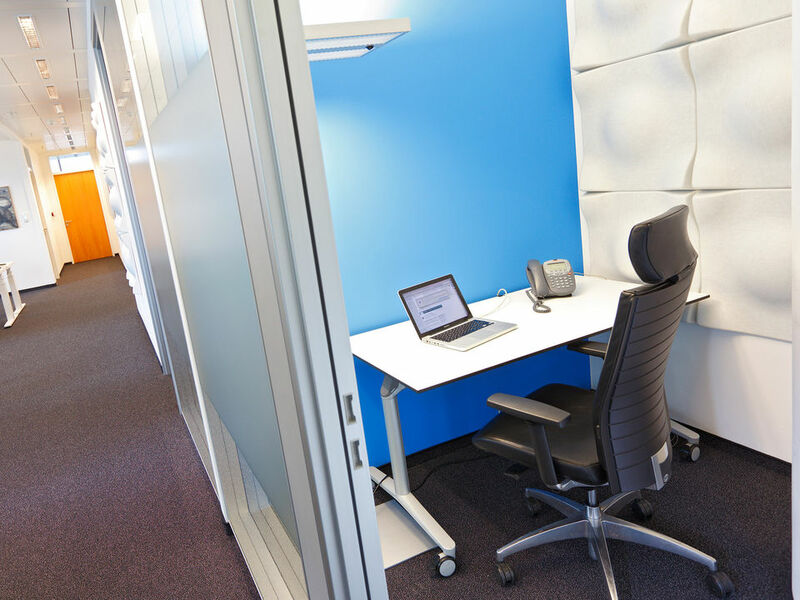 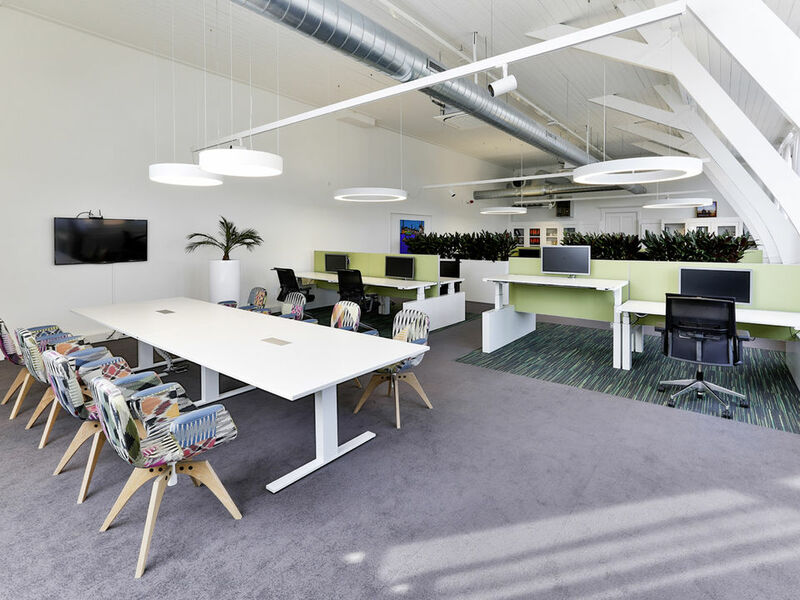 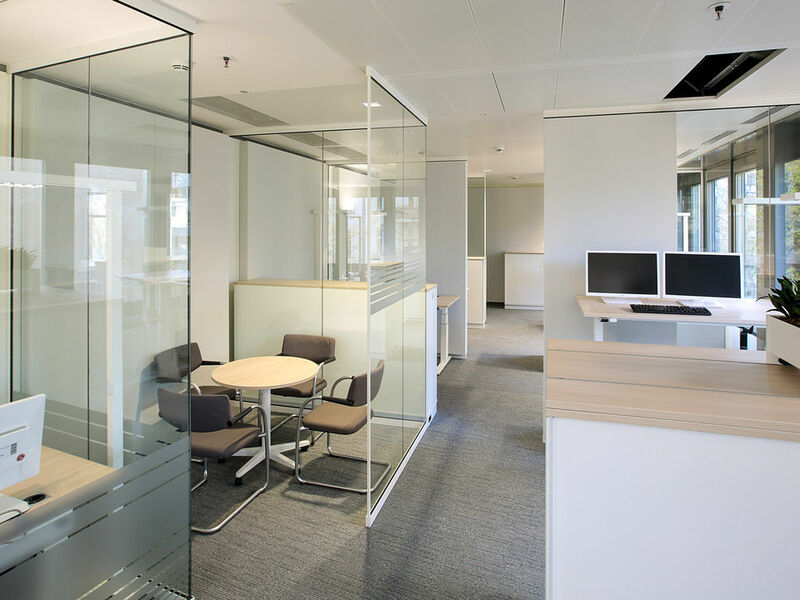 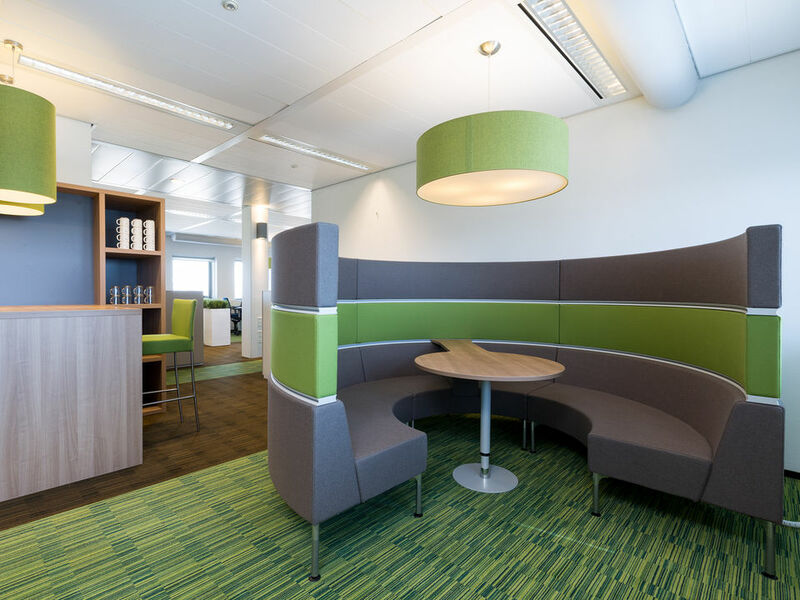 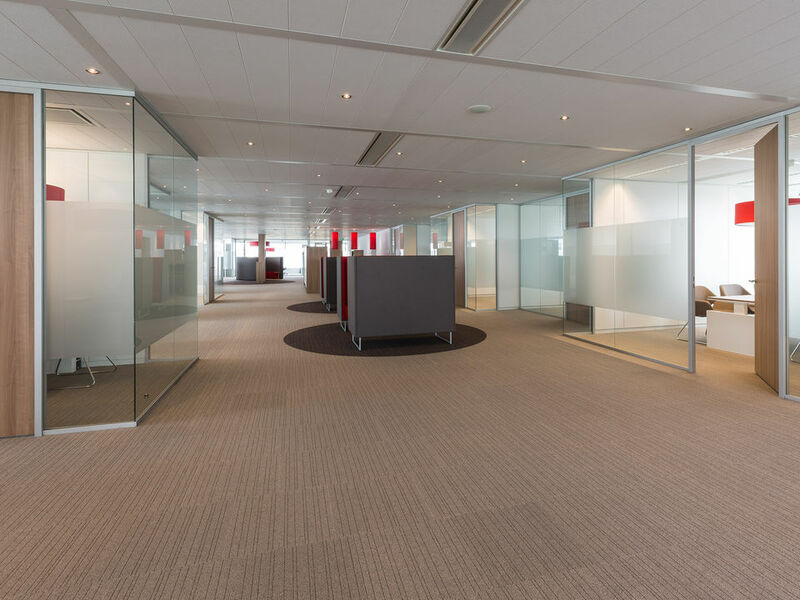 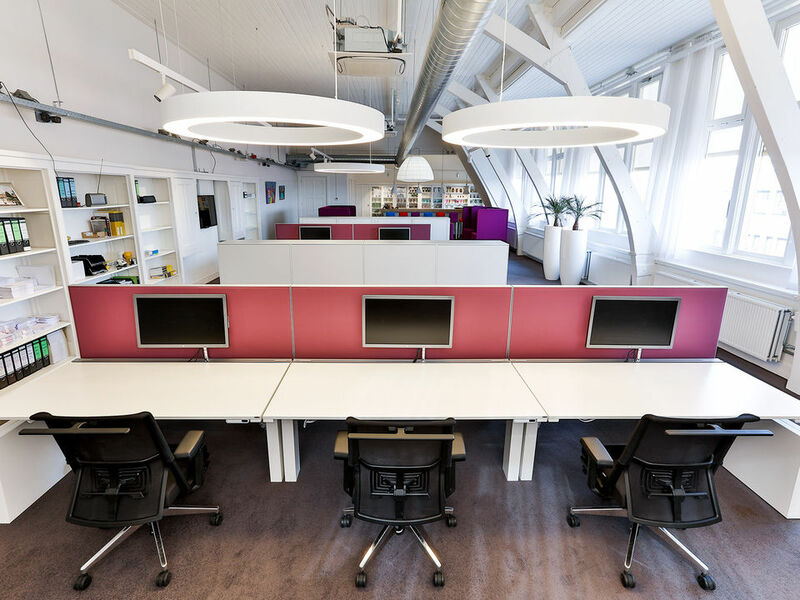 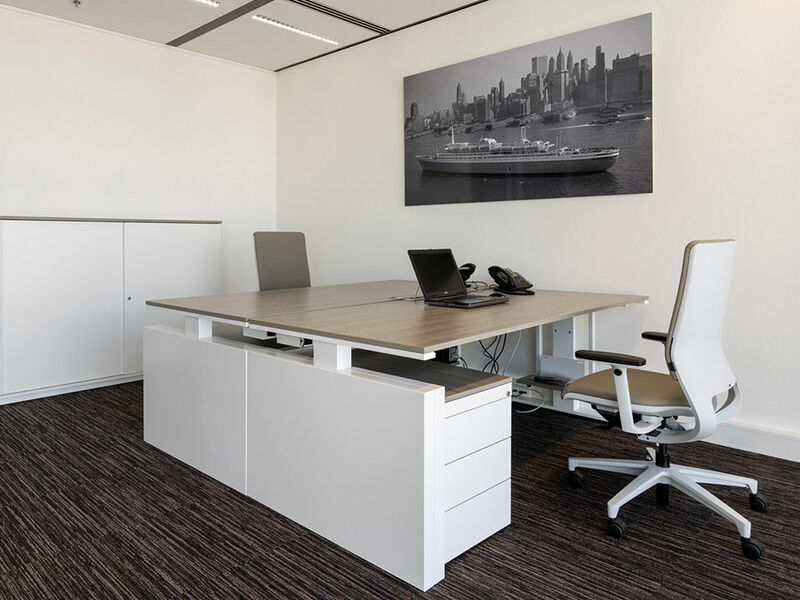 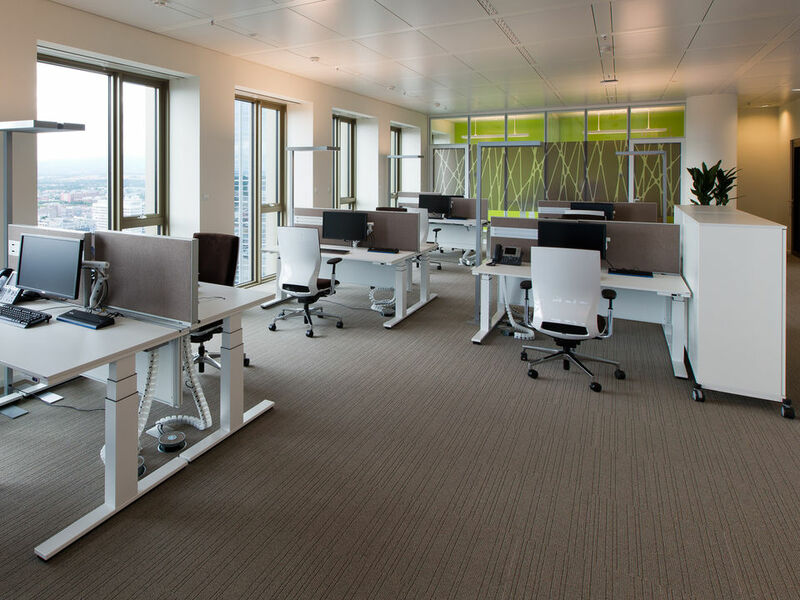 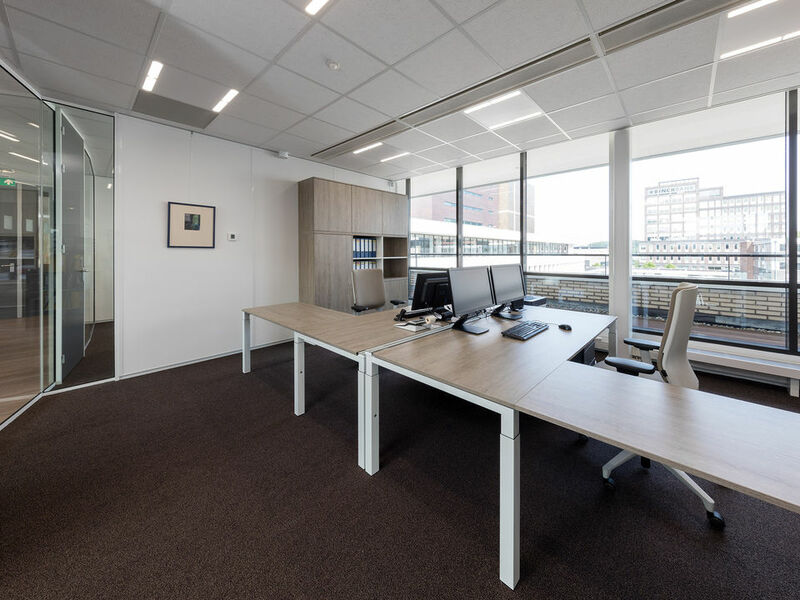 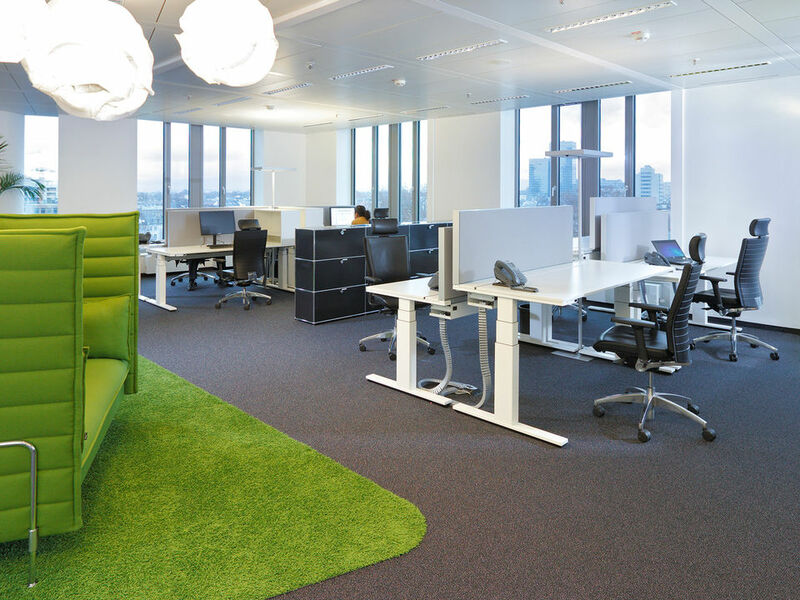 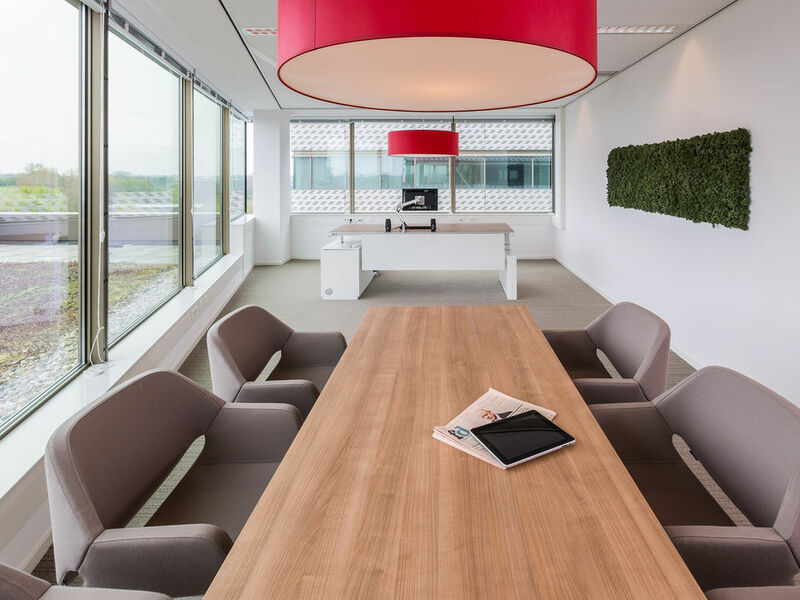 For the Dutch subsidiary of the software service provider, WINI KantoorDesign completed the facility planning in summer 2014 and implemented a transparent, open office concept with high-quality, modular furnishings, including ergonomic height-adjustable desks for team and individual workstations as well as representative conference furniture. 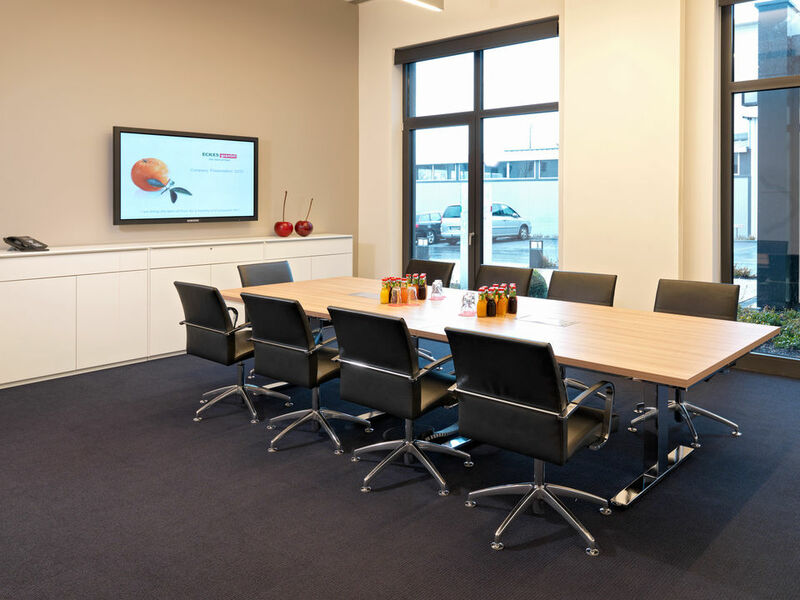 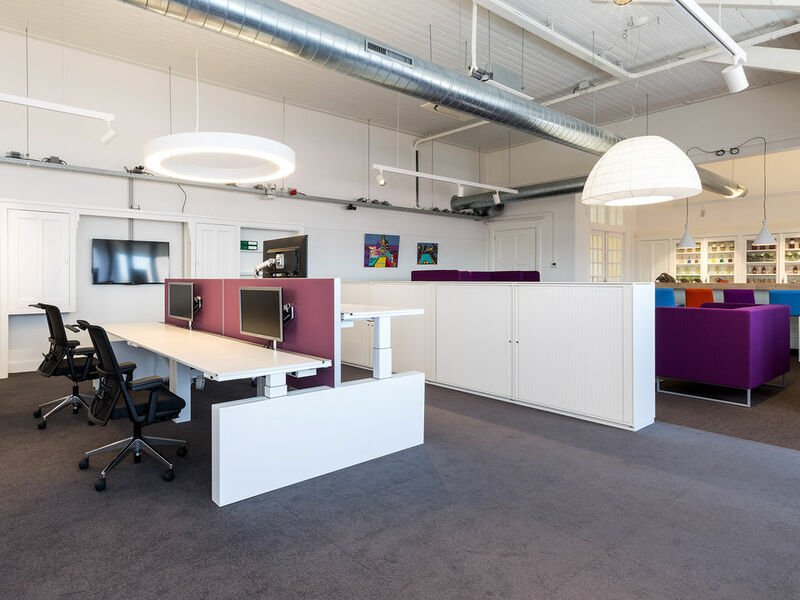 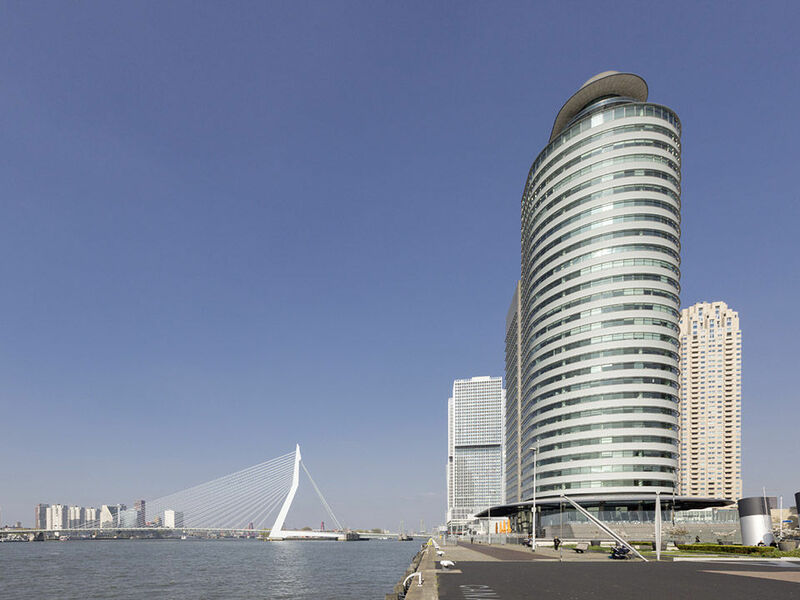 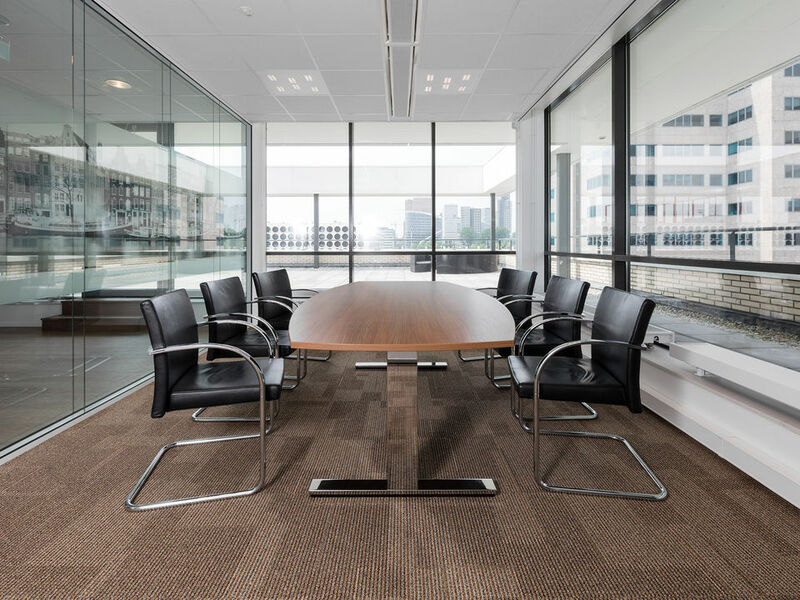 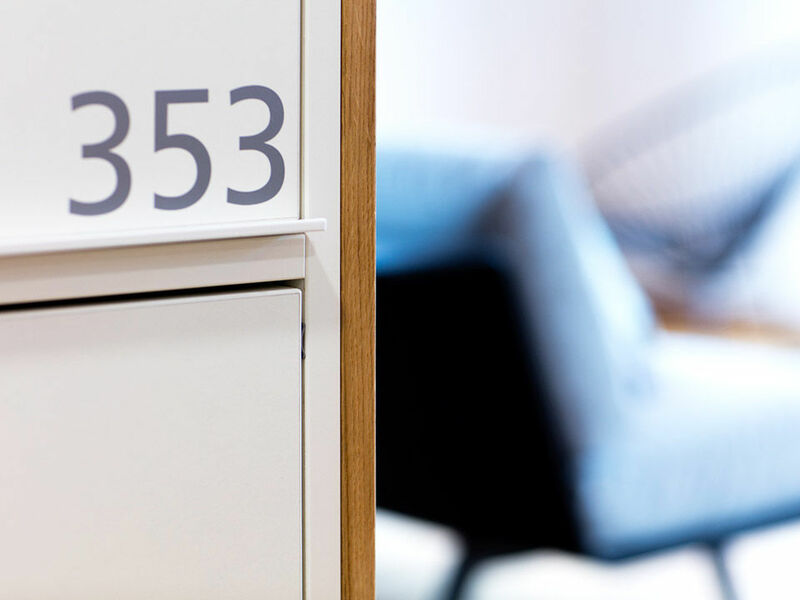 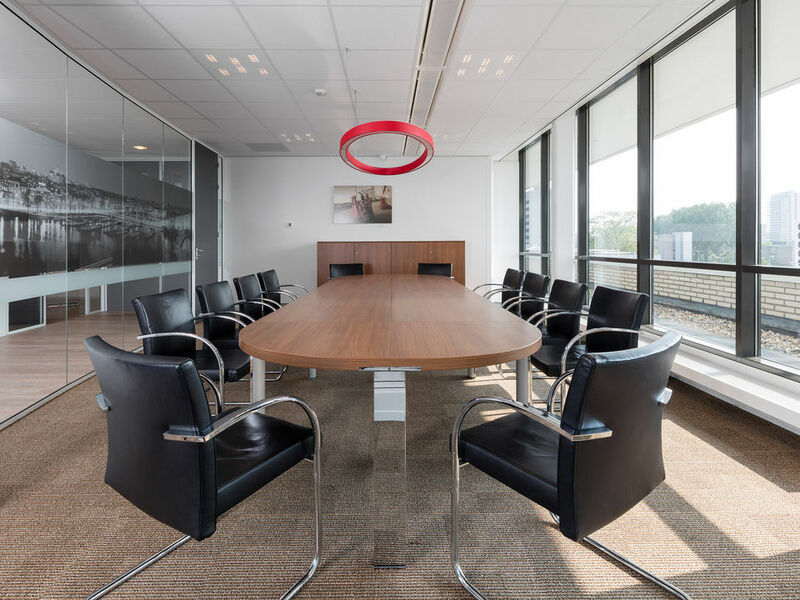 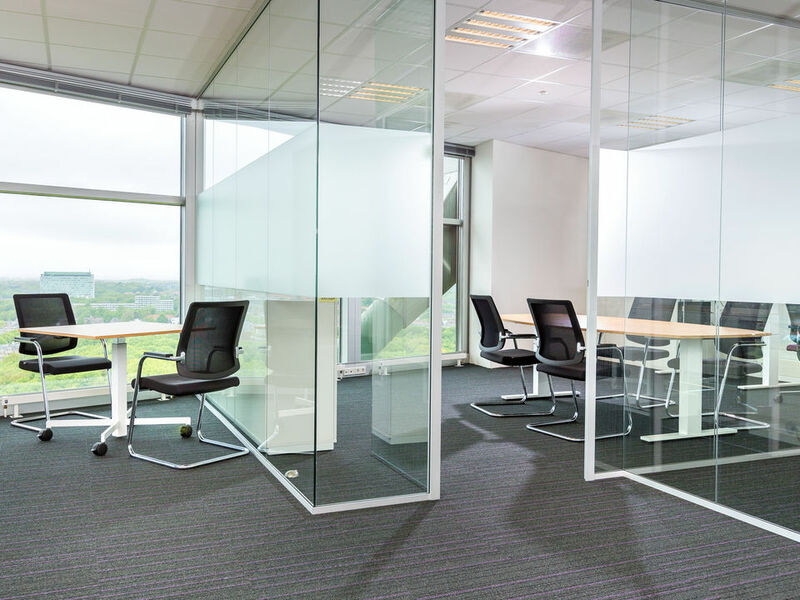 Since the end of 2015 the 32 chamber employees of Wintertaling in Amsterdam work in a representative, transparent office environment with several meeting rooms, individual offices and small team offices with ergonomically height-adjustable workplaces. 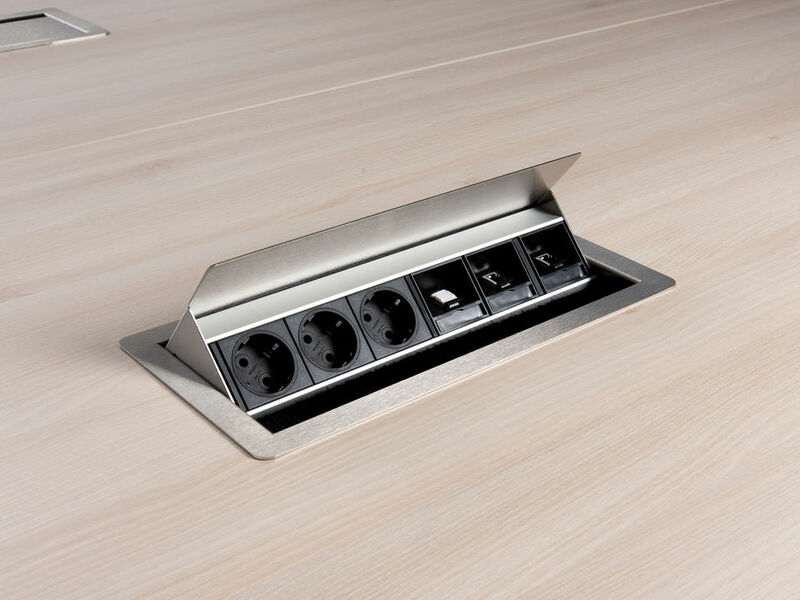 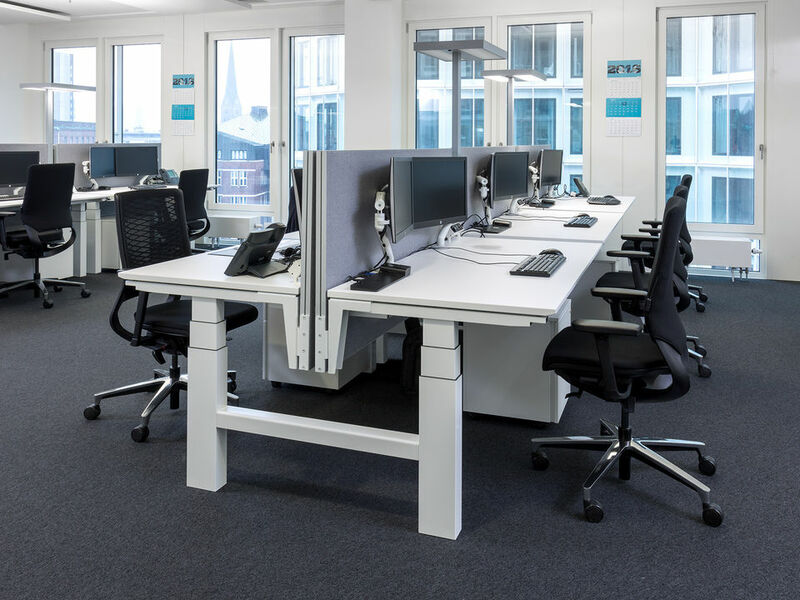 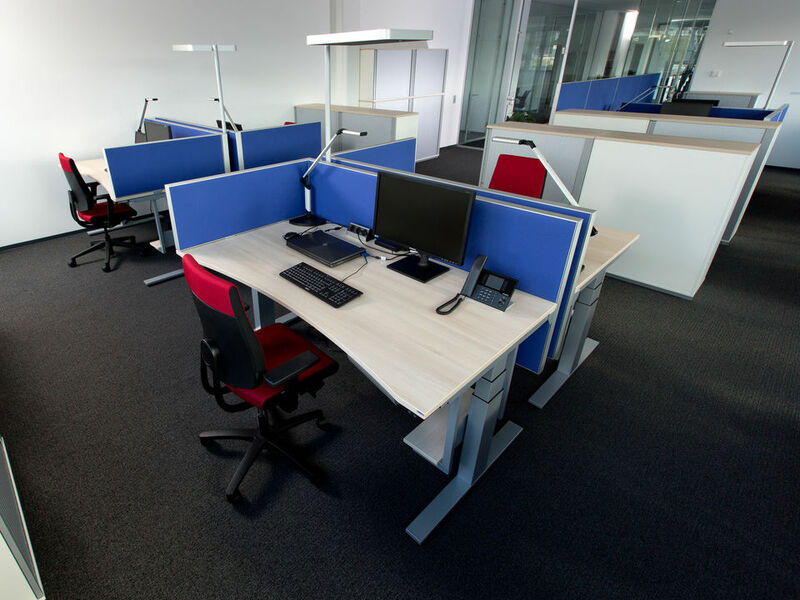 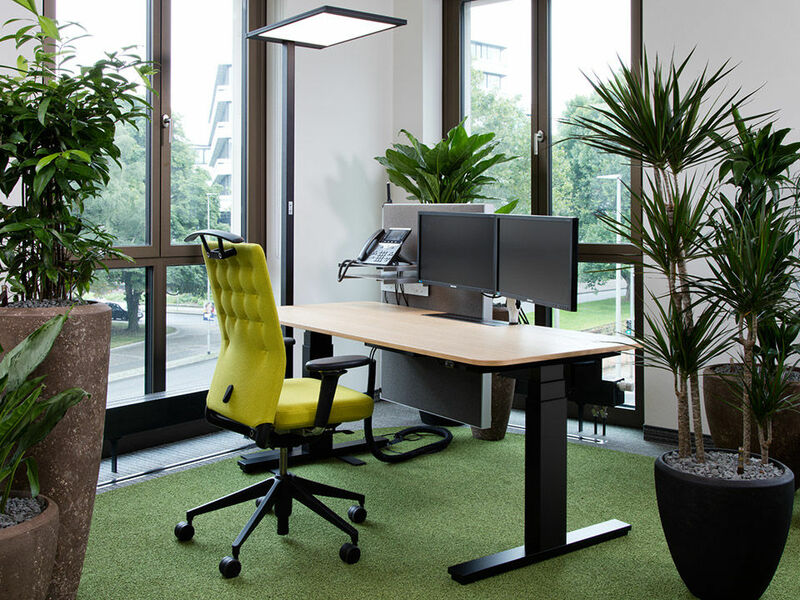 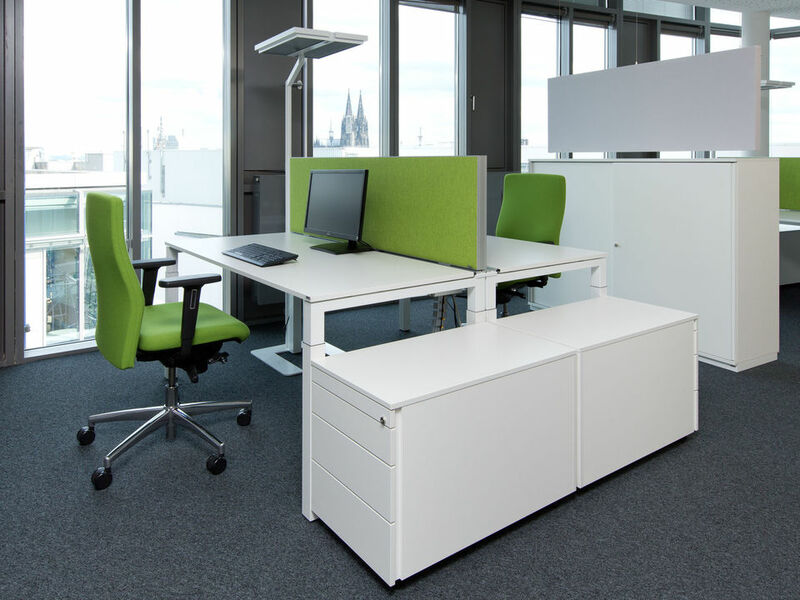 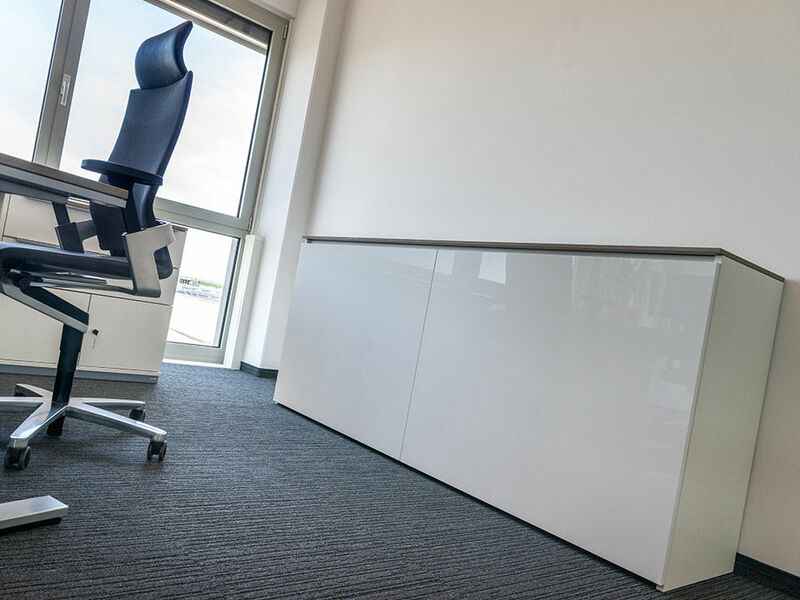 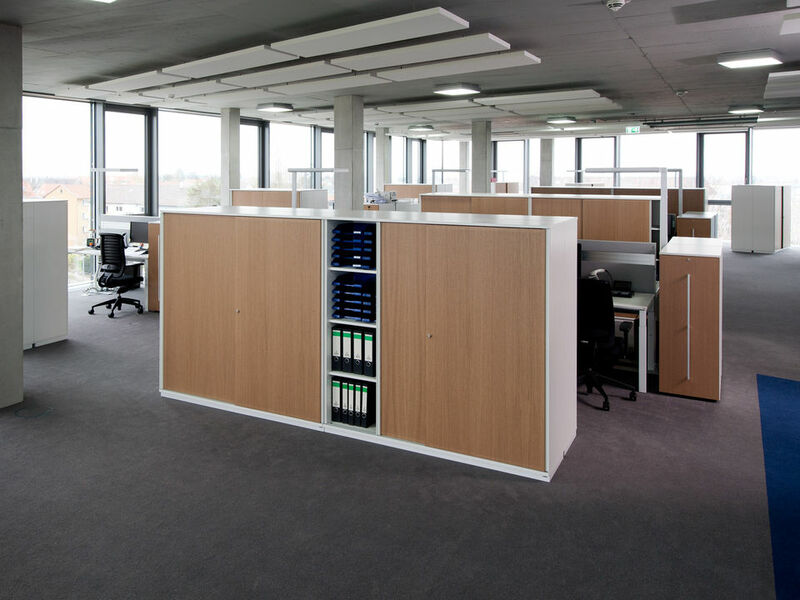 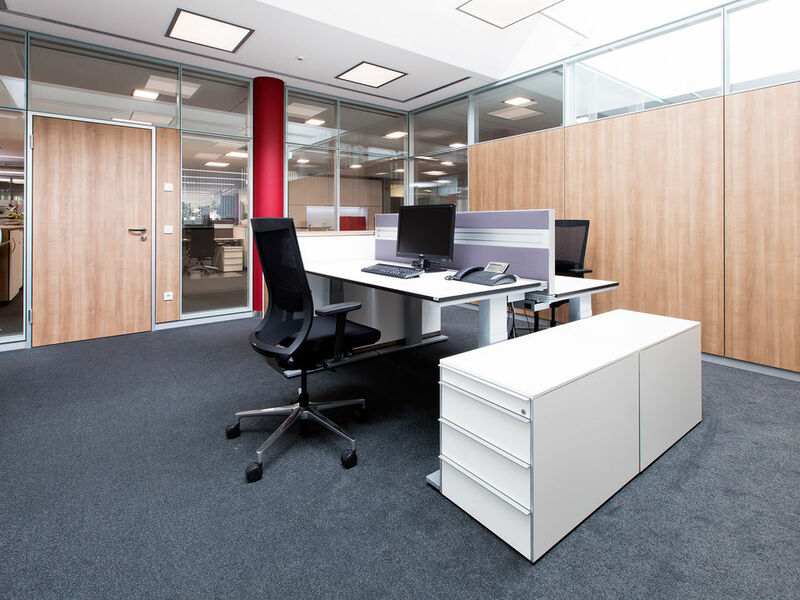 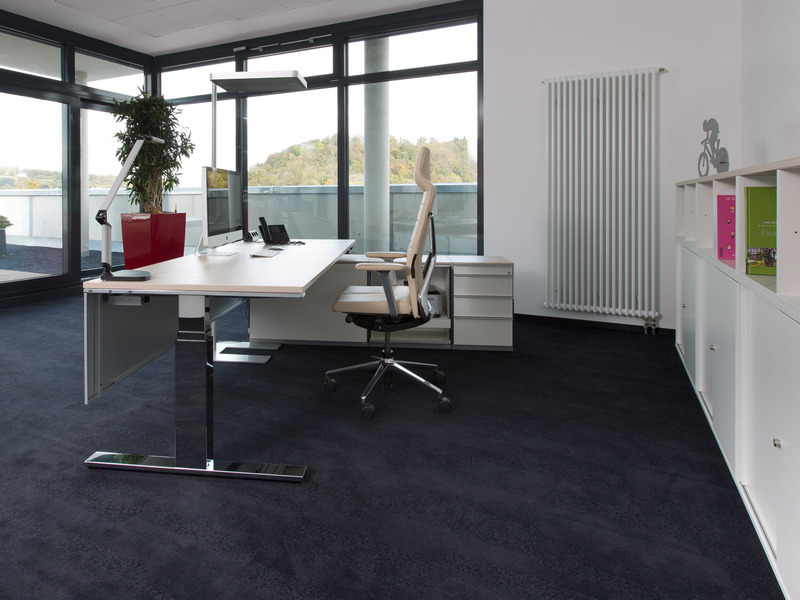 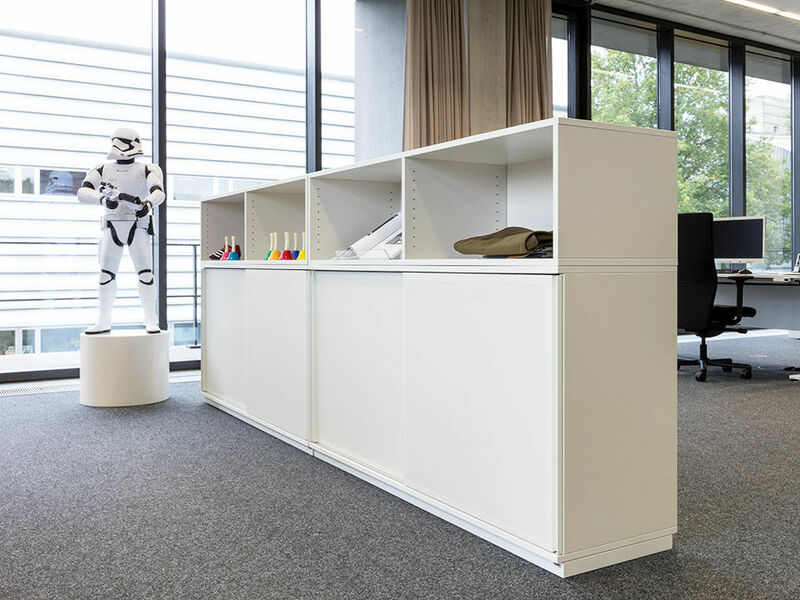 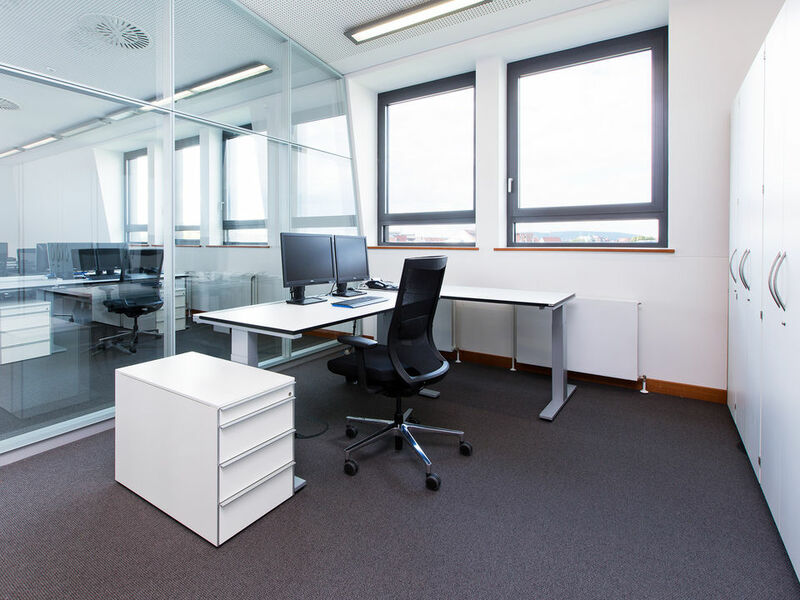 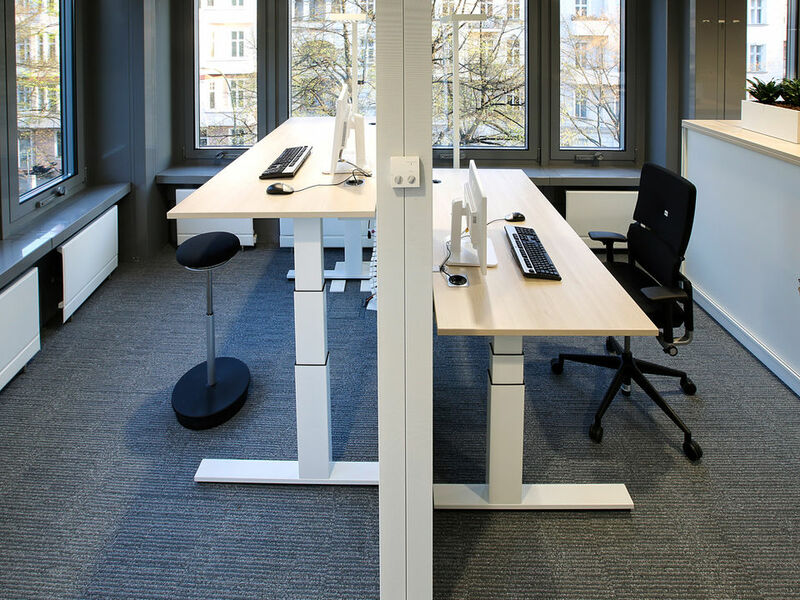 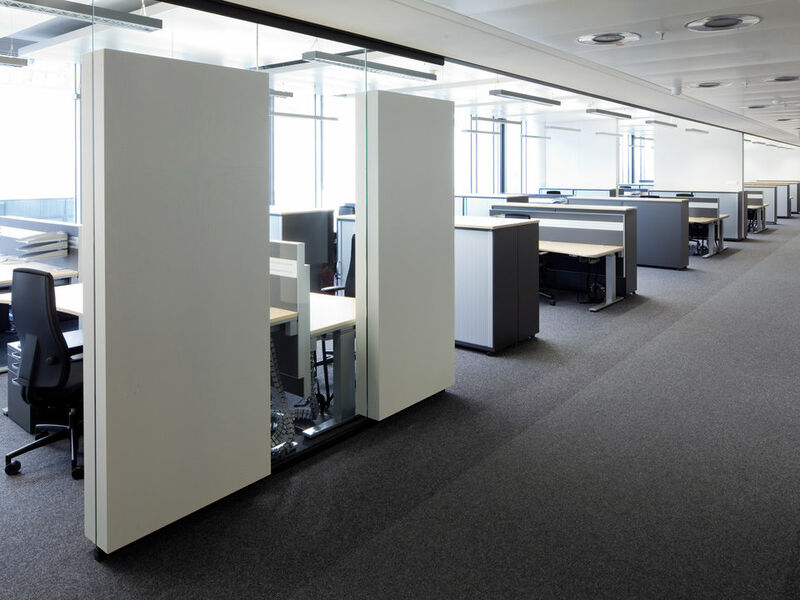 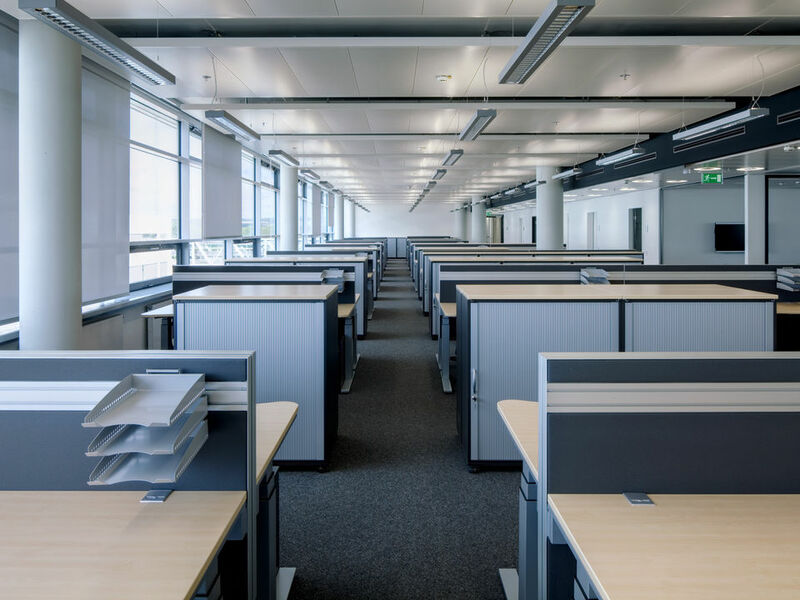 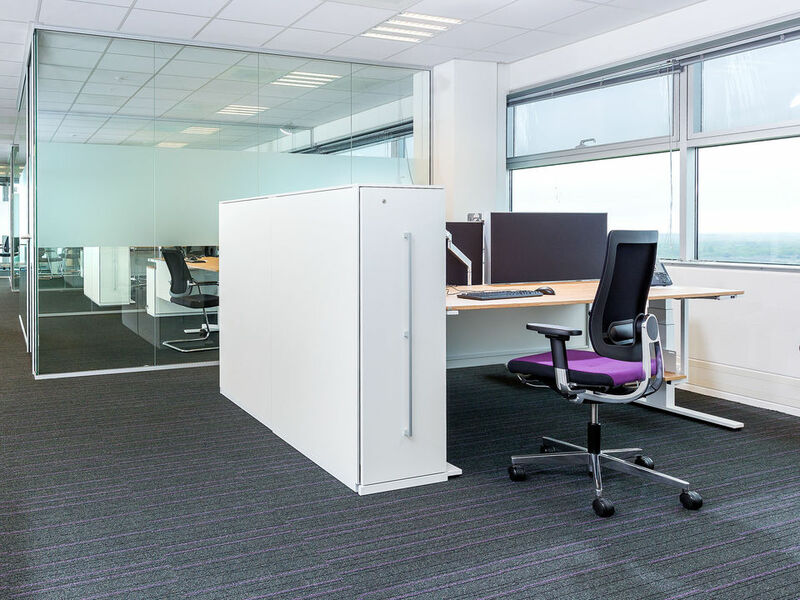 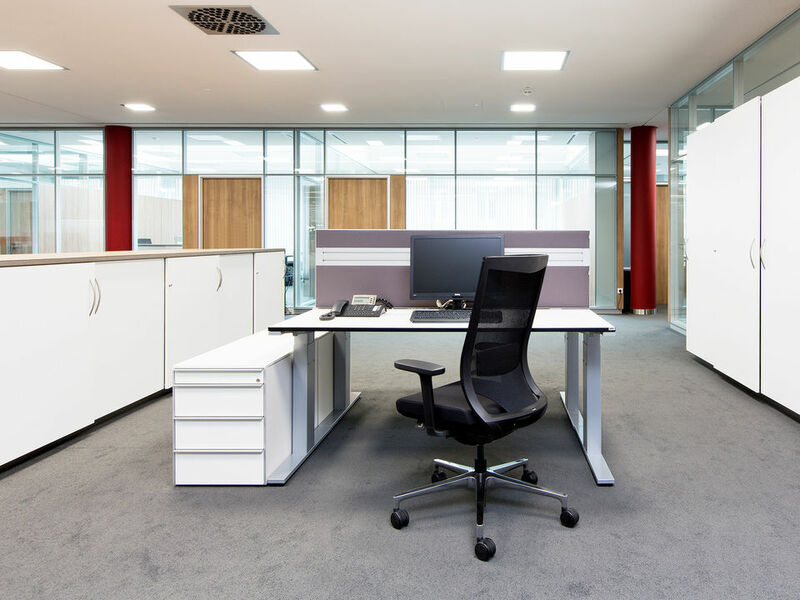 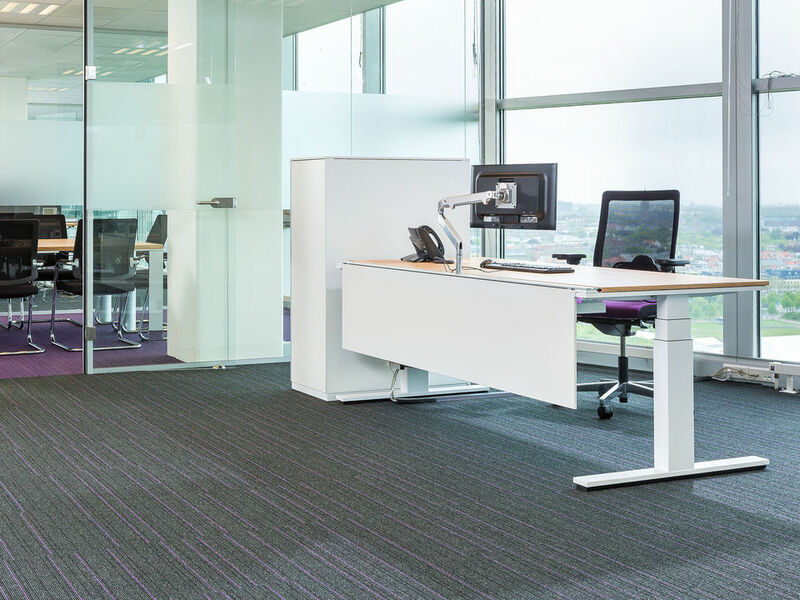 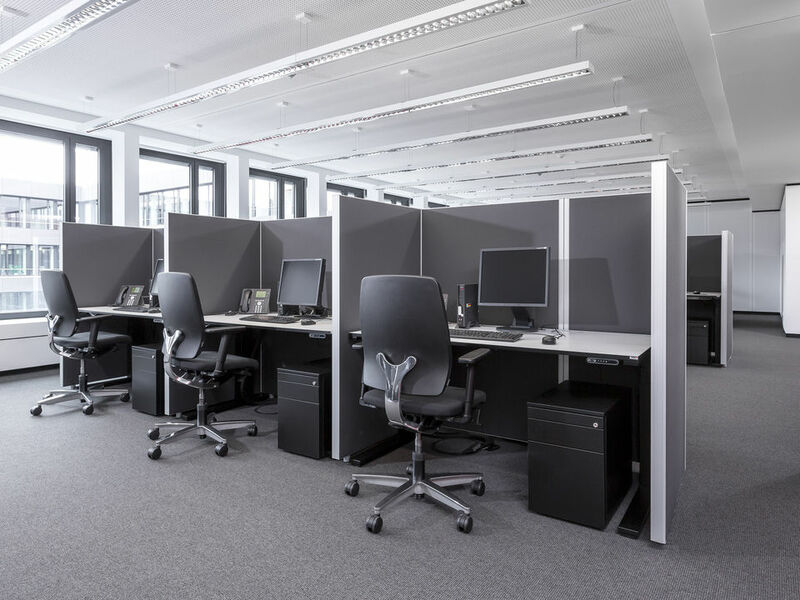 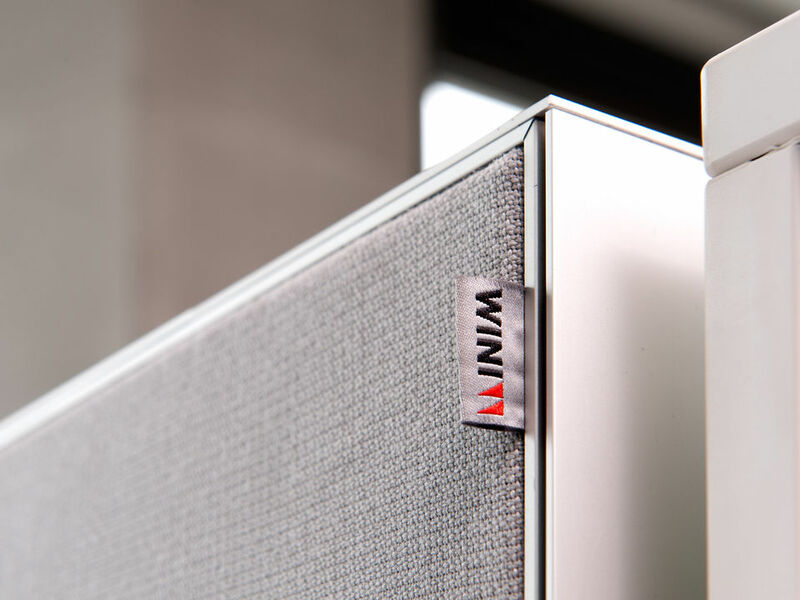 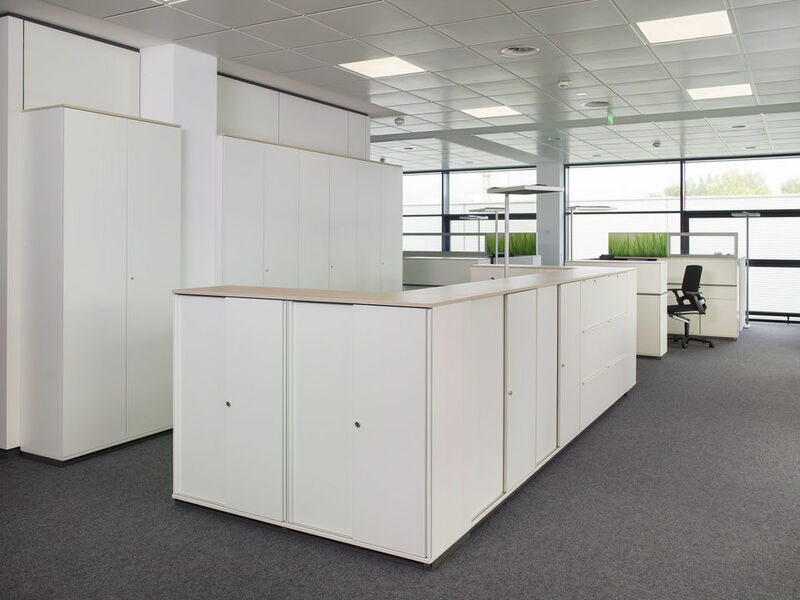 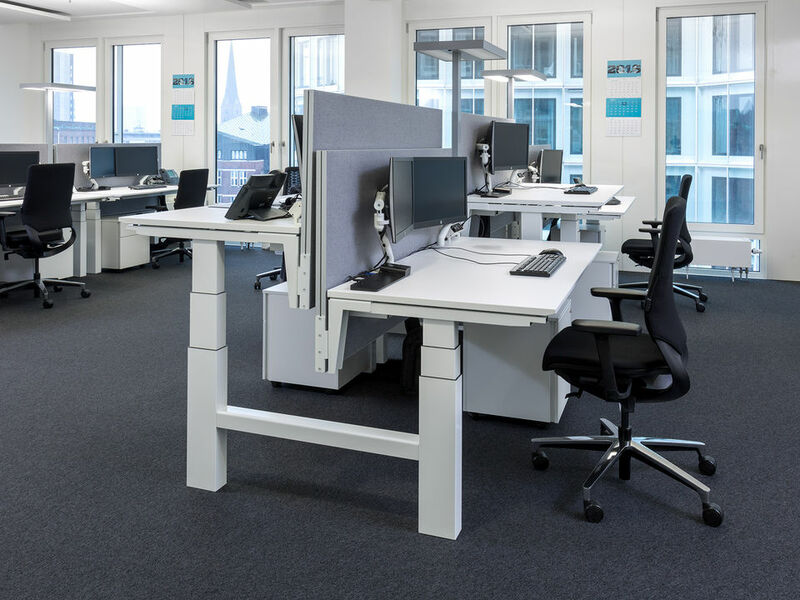 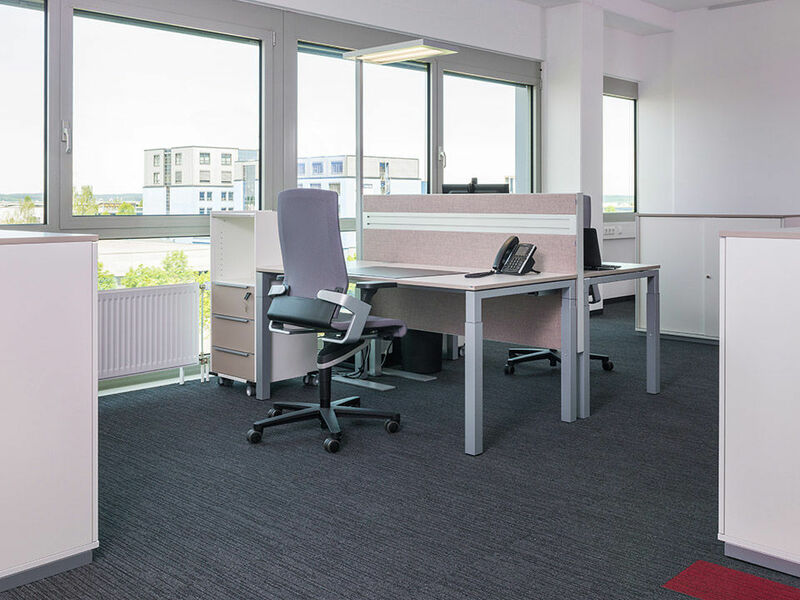 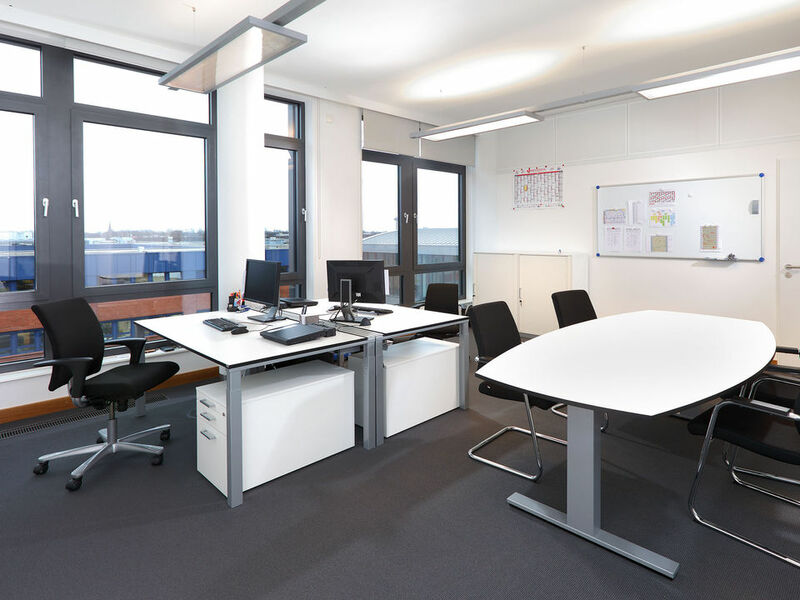 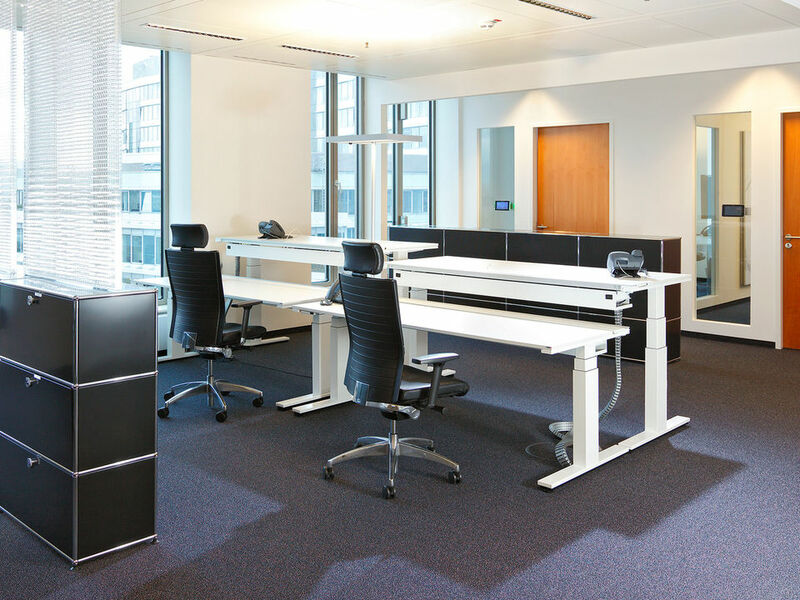 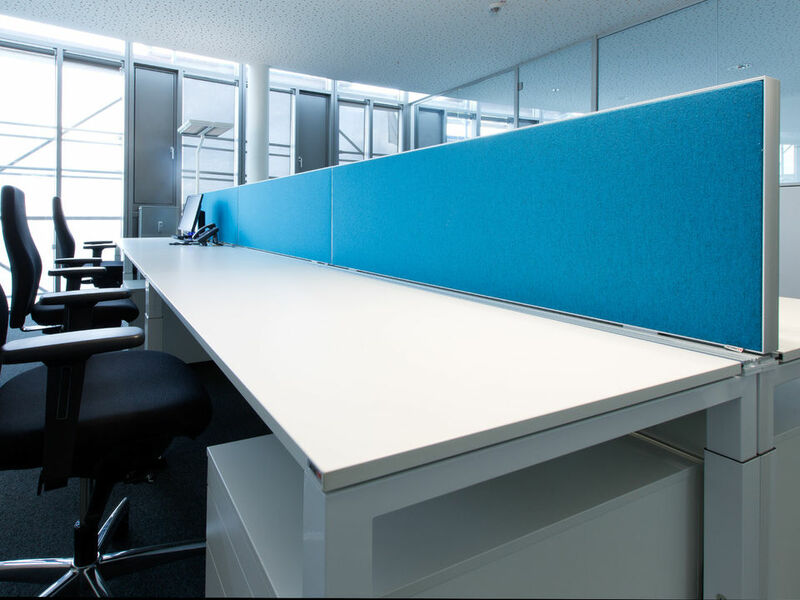 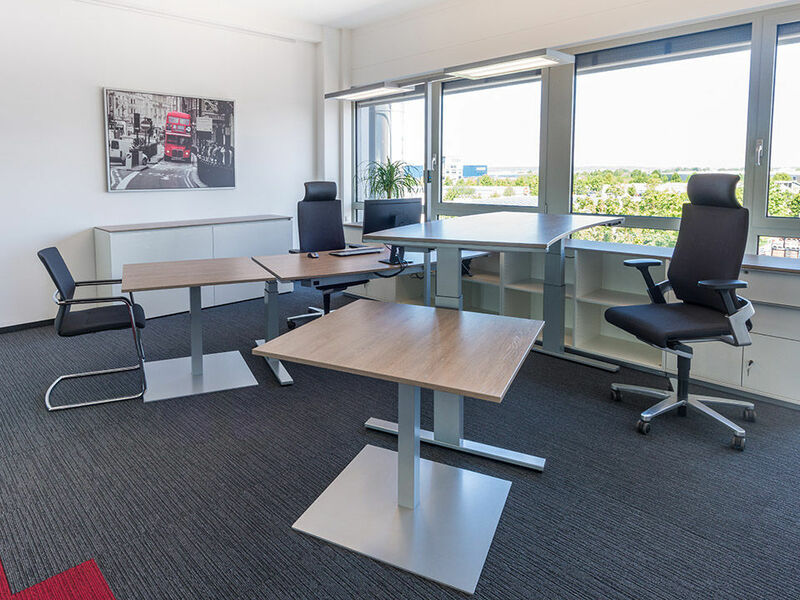 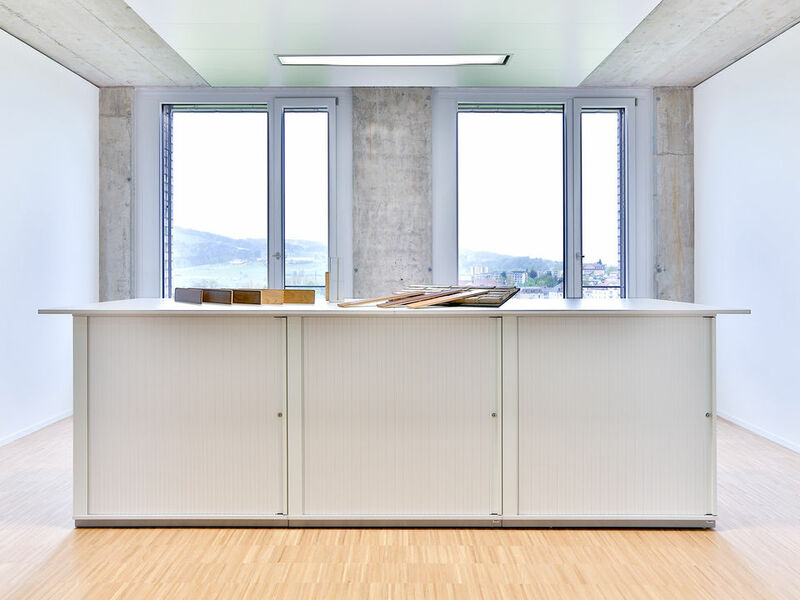 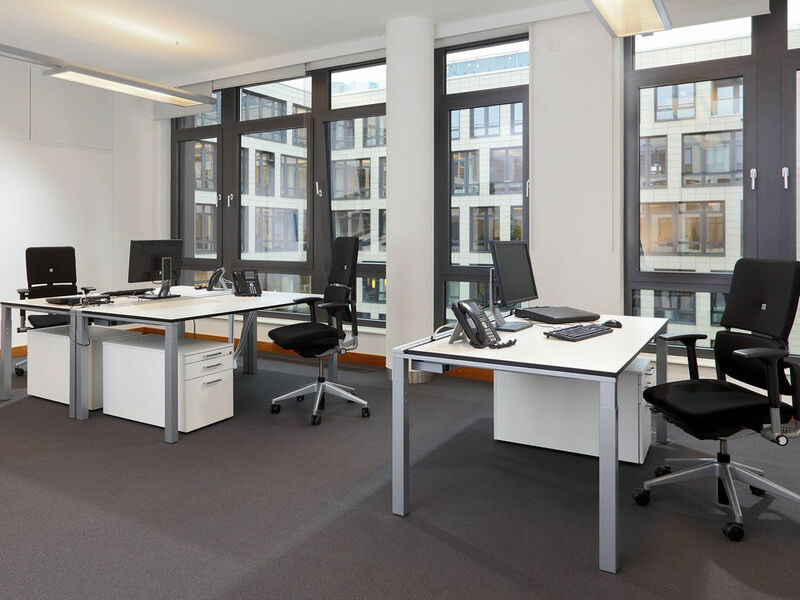 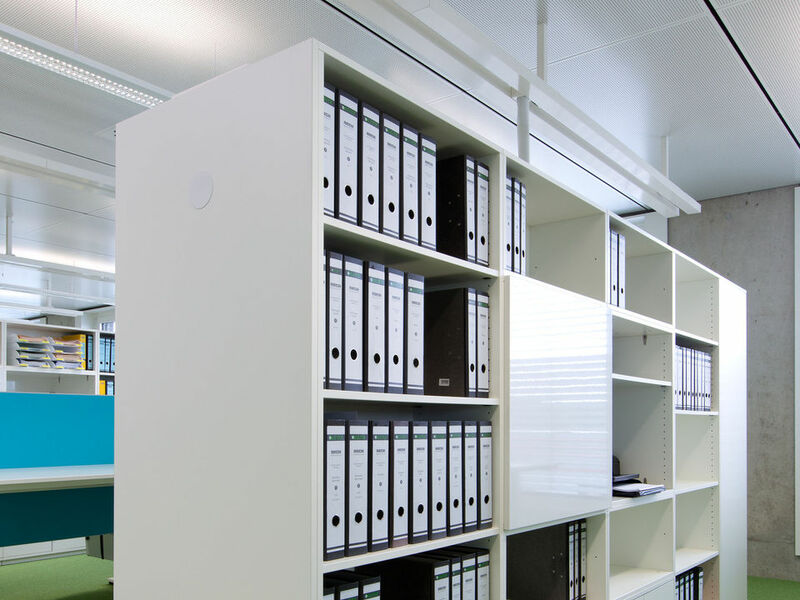 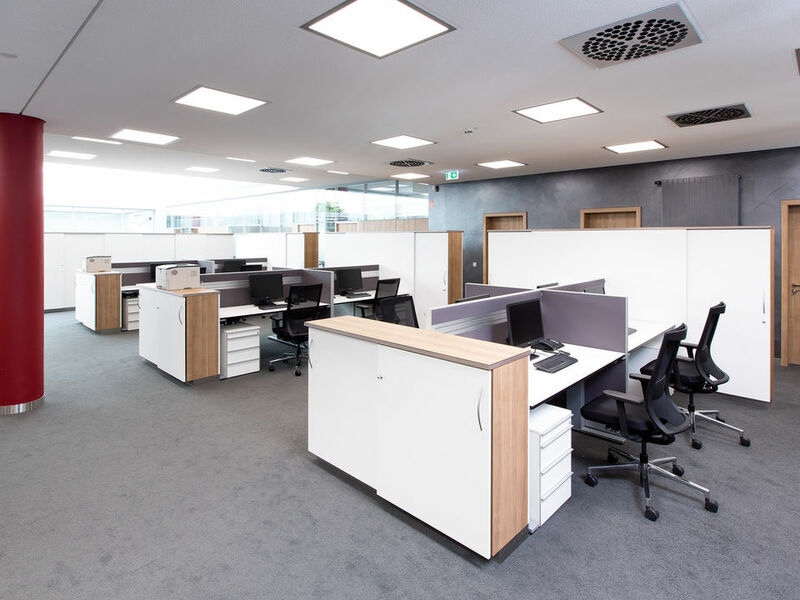 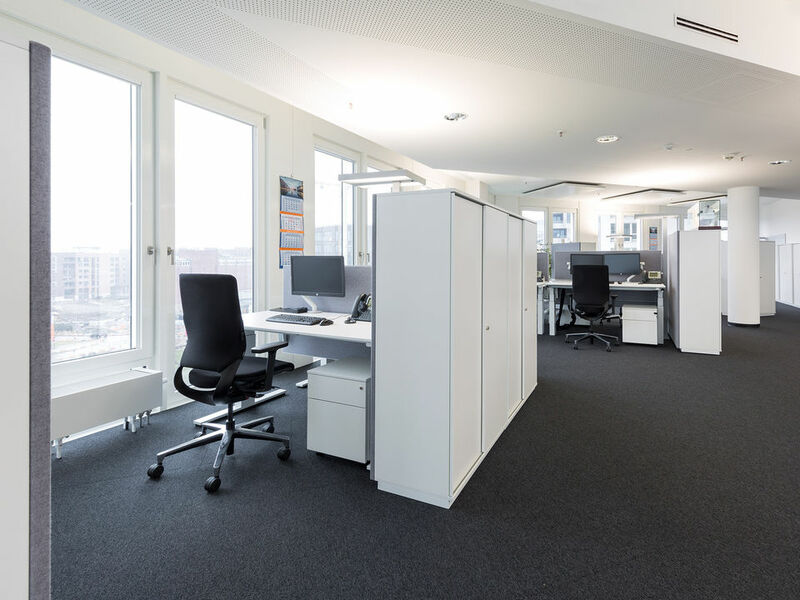 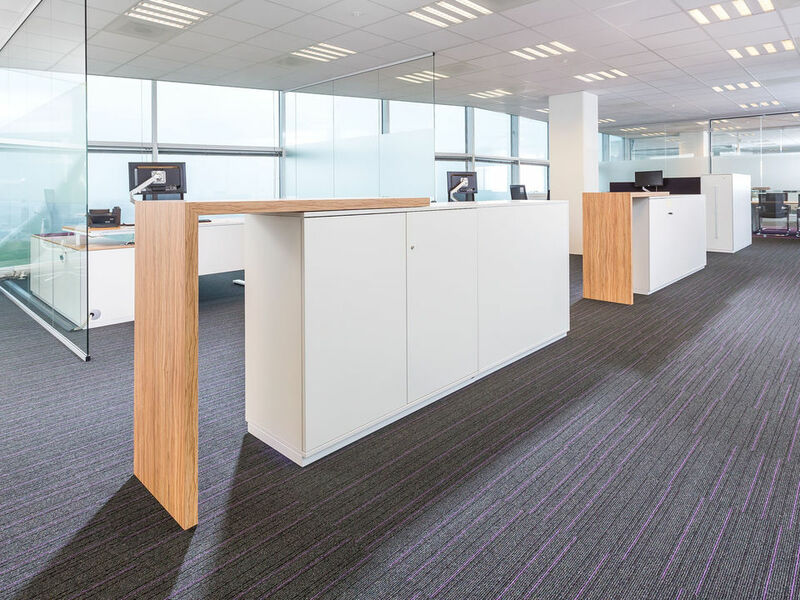 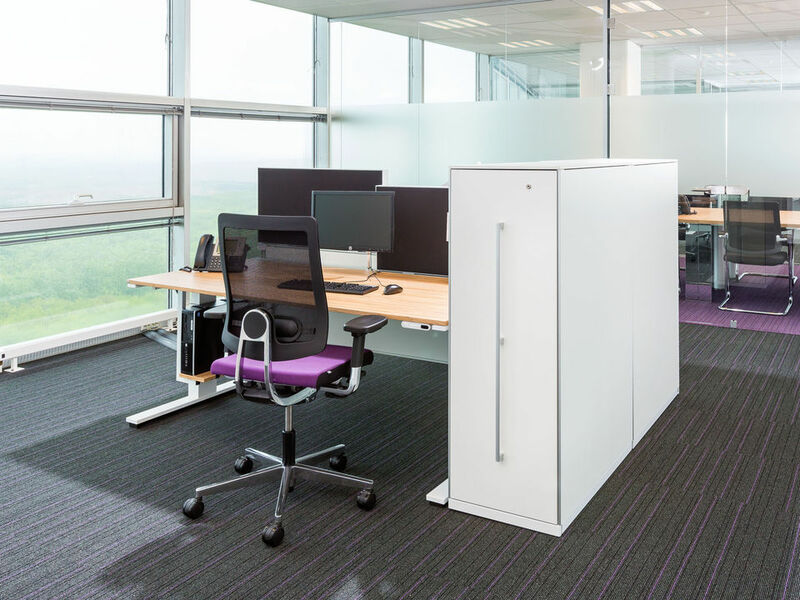 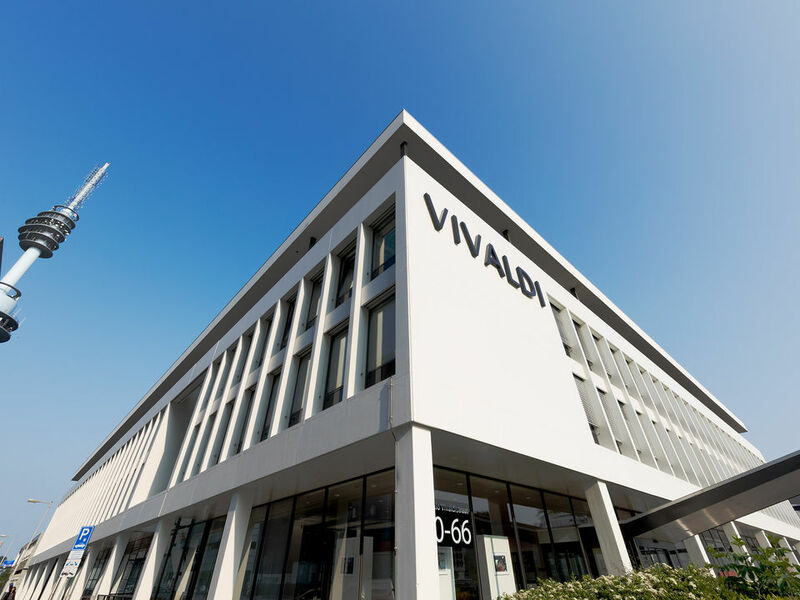 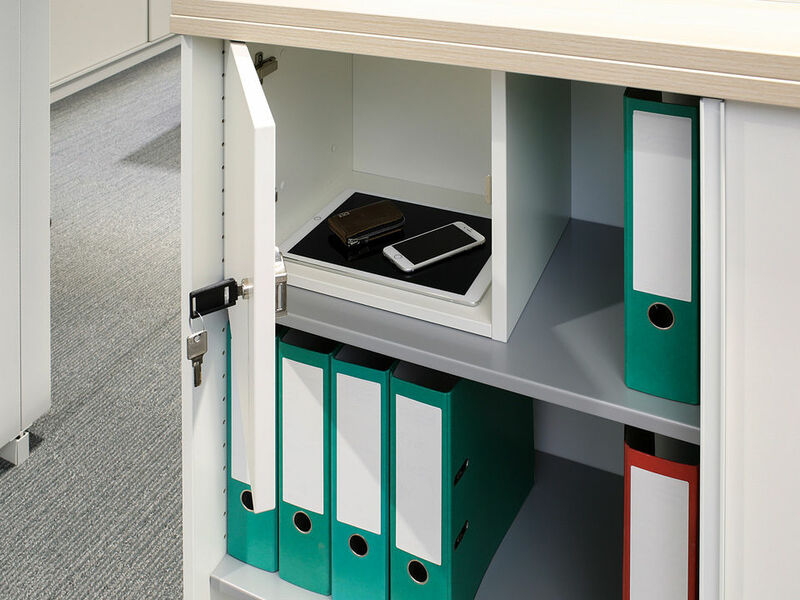 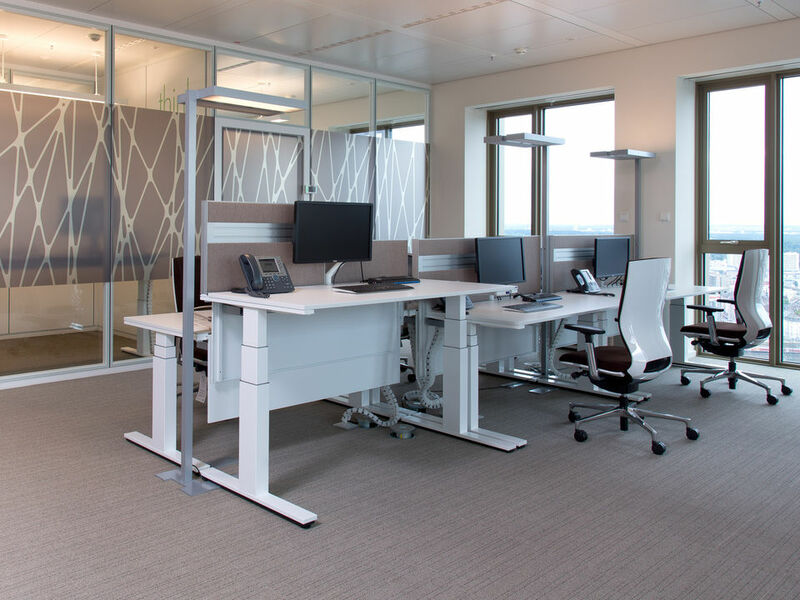 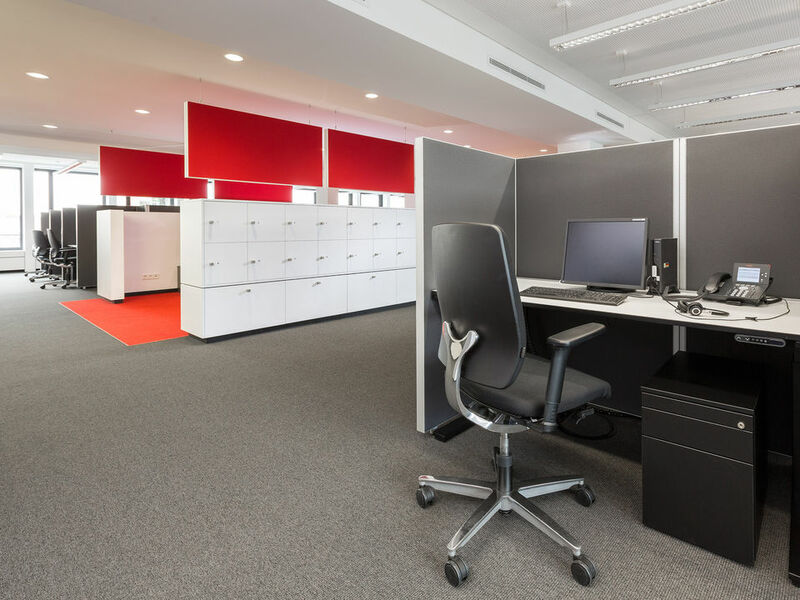 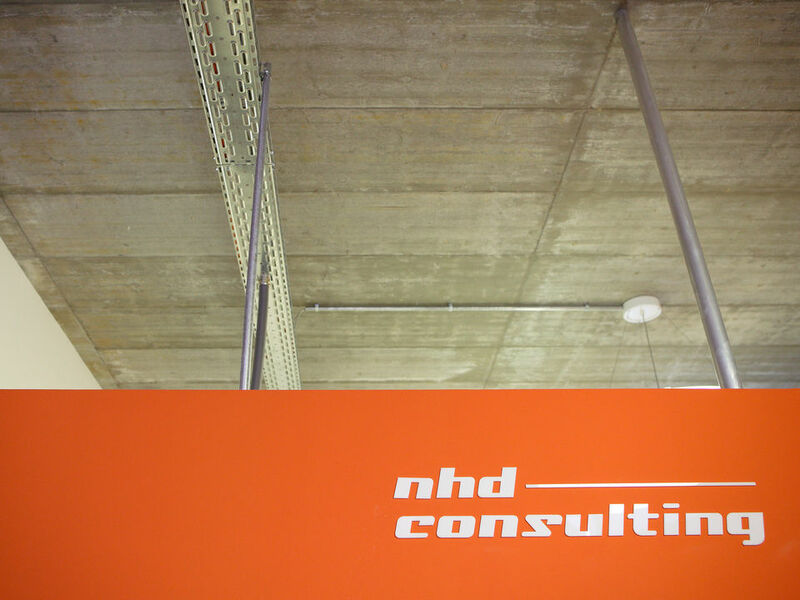 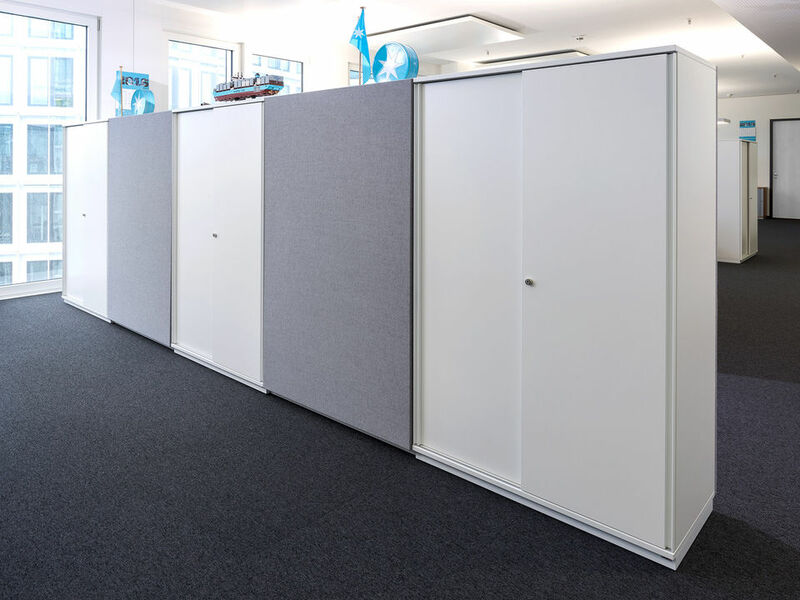 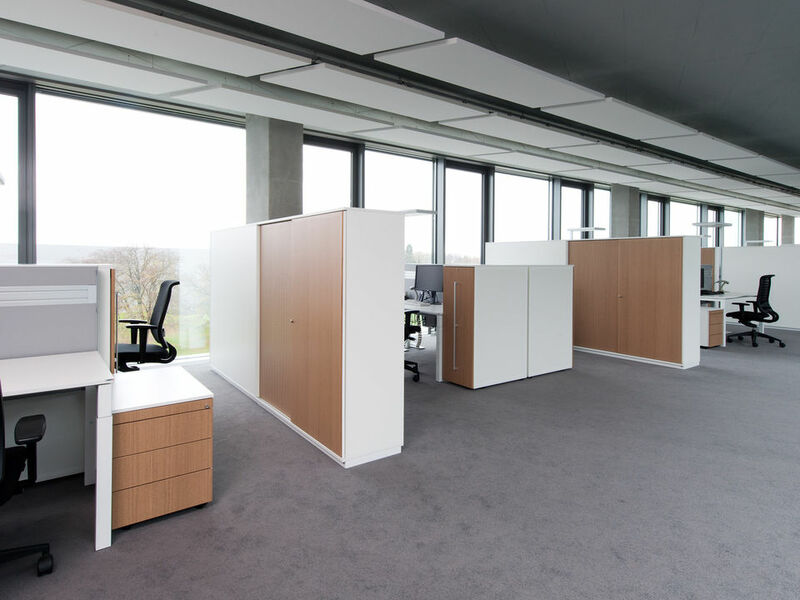 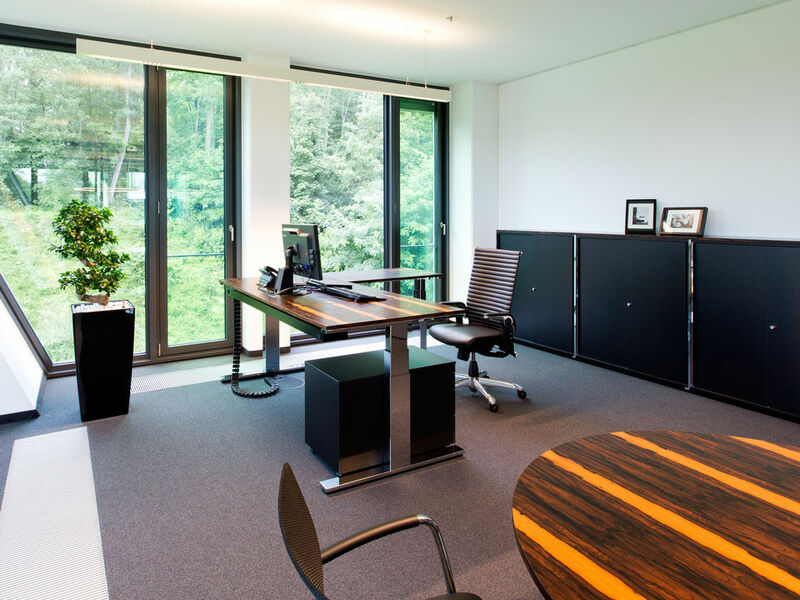 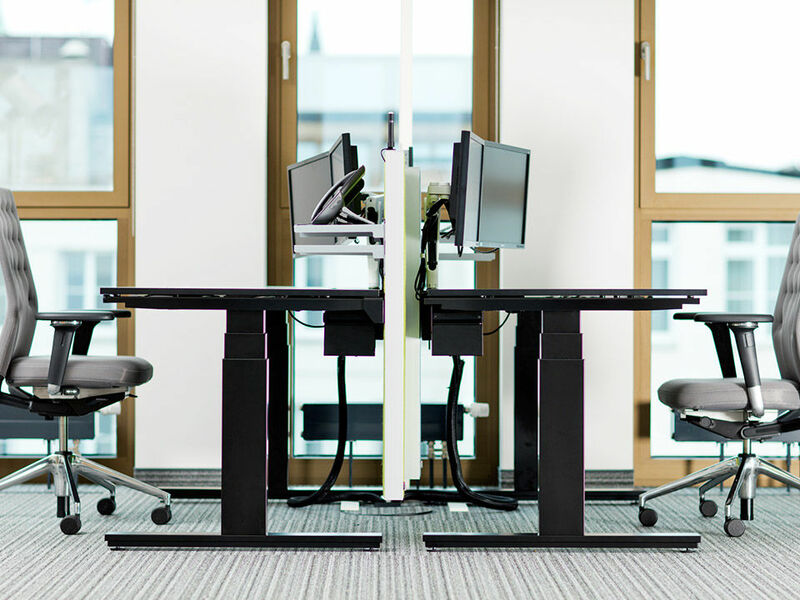 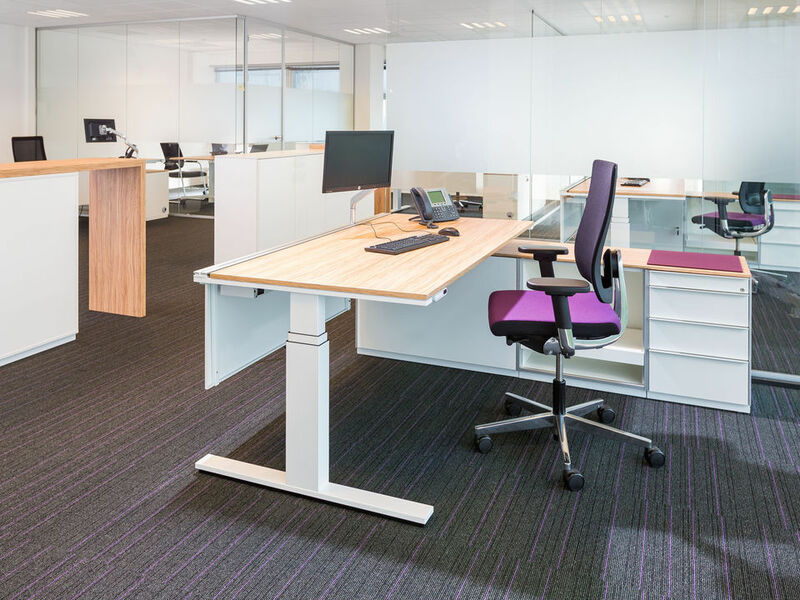 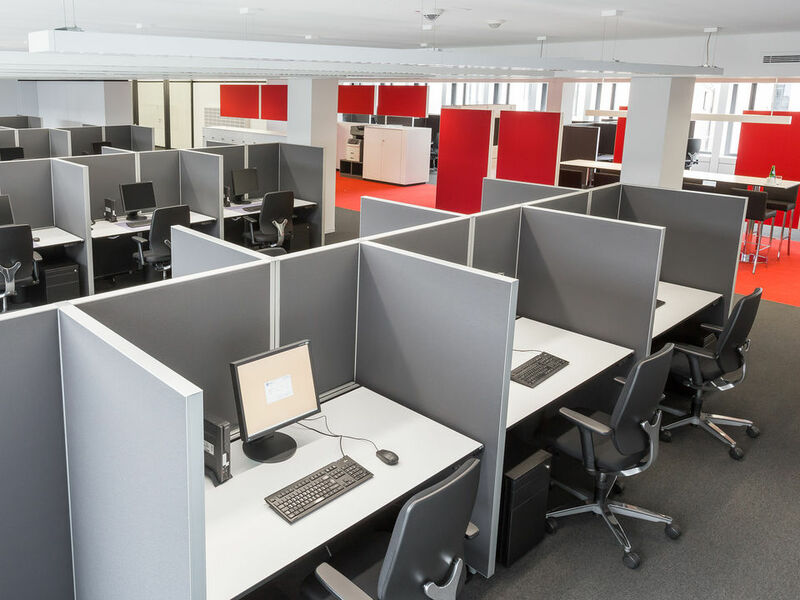 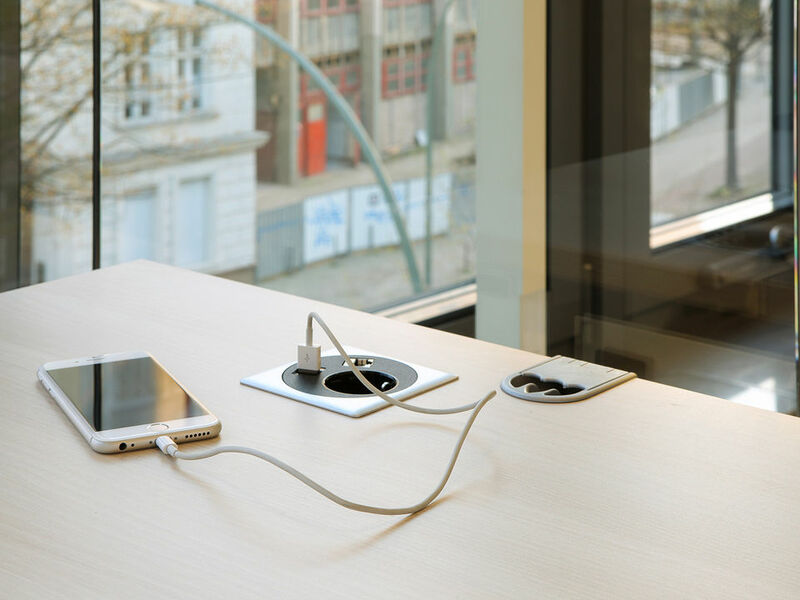 In the summer of 2017 WINI delivered just under 160 ergonomic sit/stand desks and meeting tables, acoustic on-desk panels and various storage components for the new building of an international auditing company based in Hannover, all made to measure to the specific requests of the company.